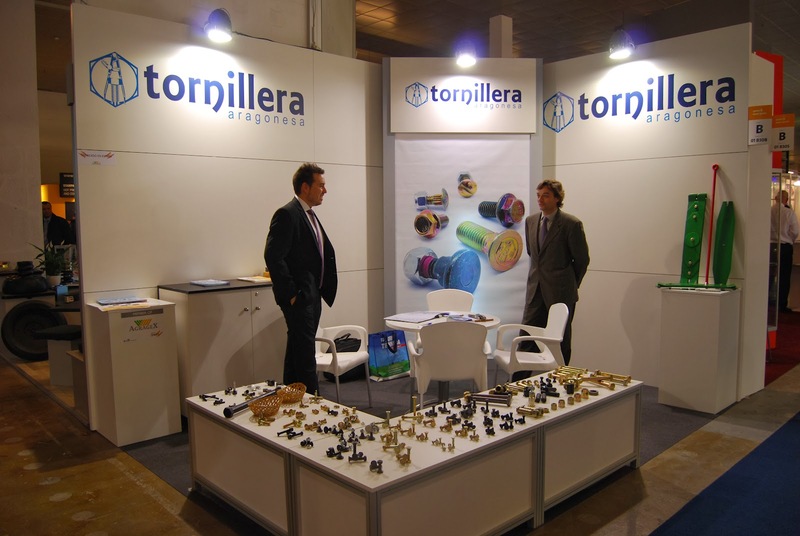 T​his week again, ​our friend Alberto has sent us some pictures. 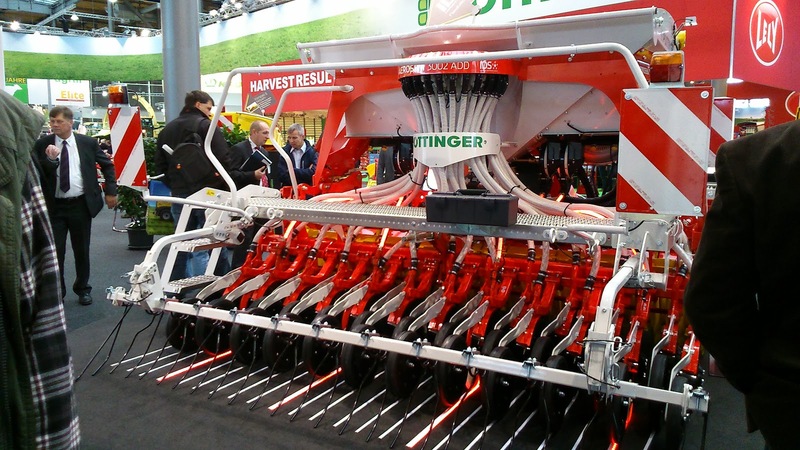 At​ this time, ​the main aim is ​about his sowing tasks. 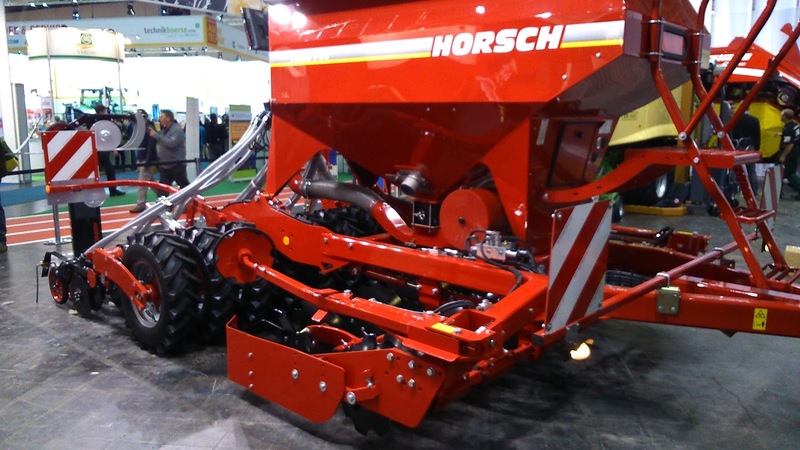 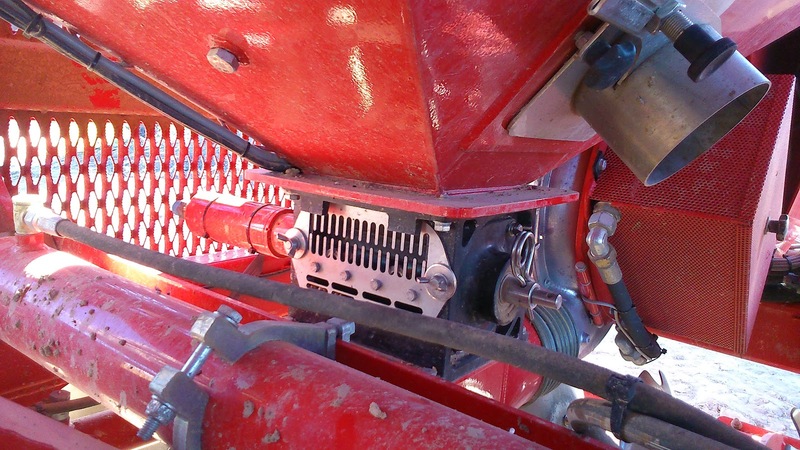 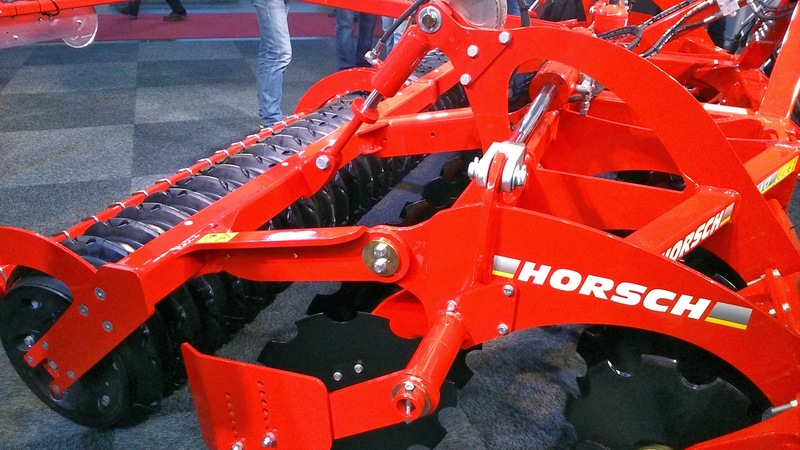 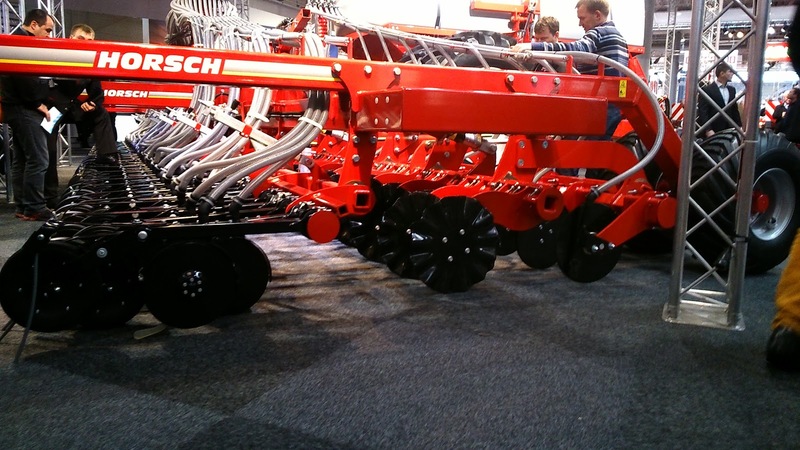 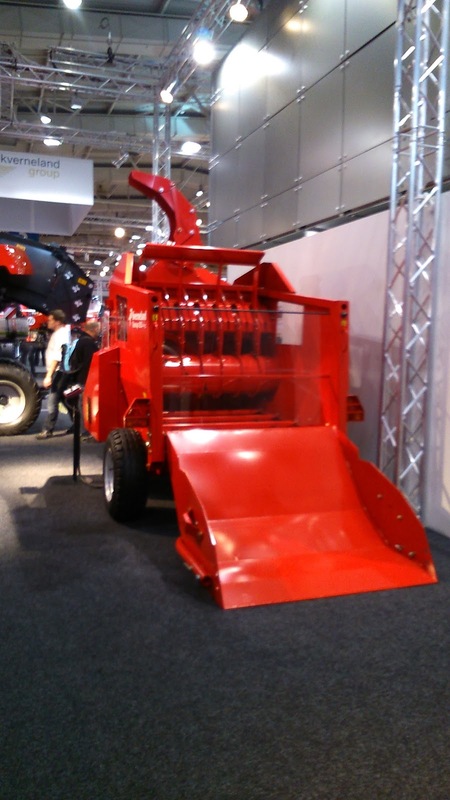 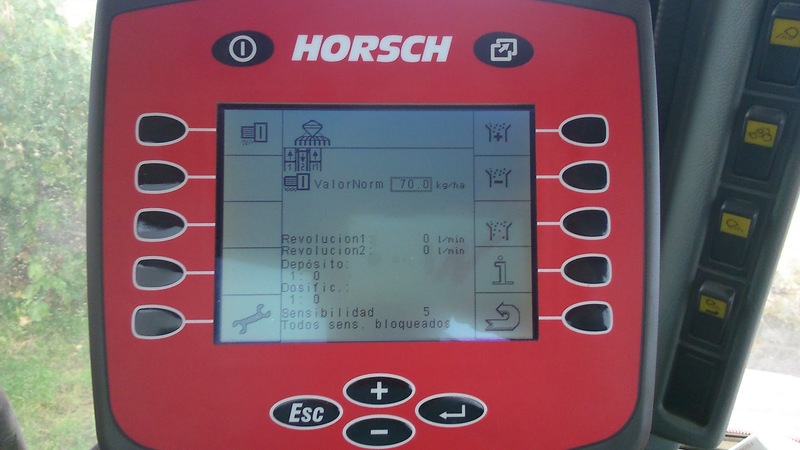 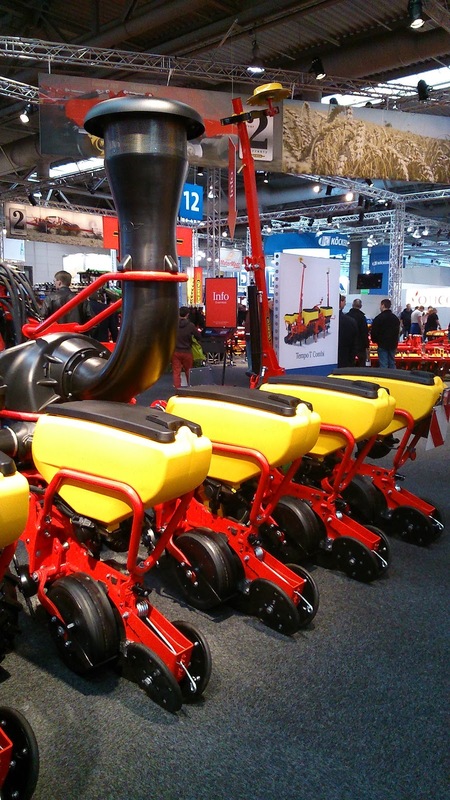 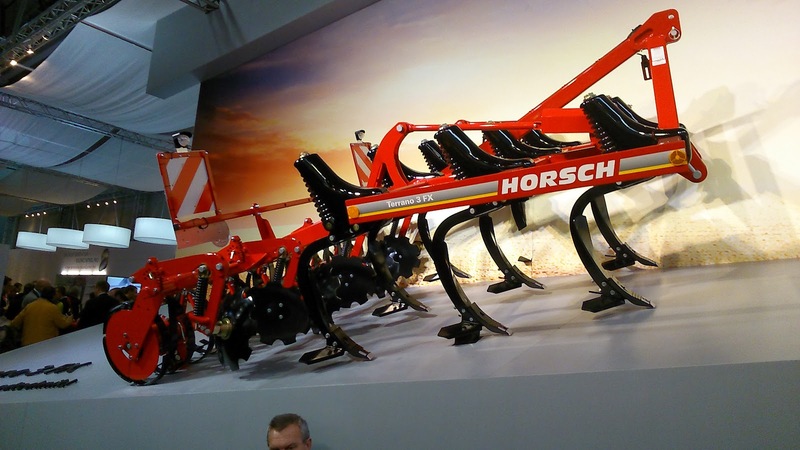 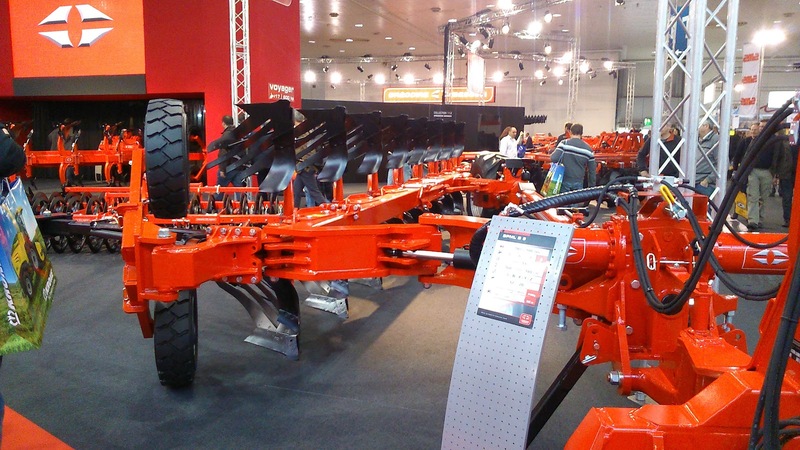 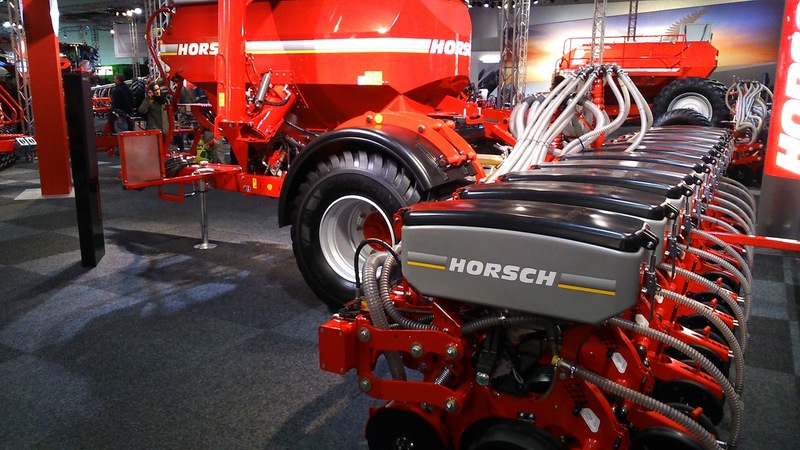 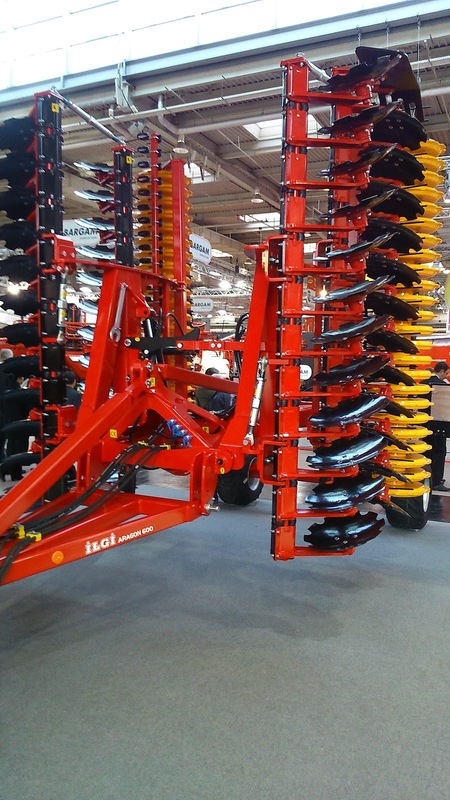 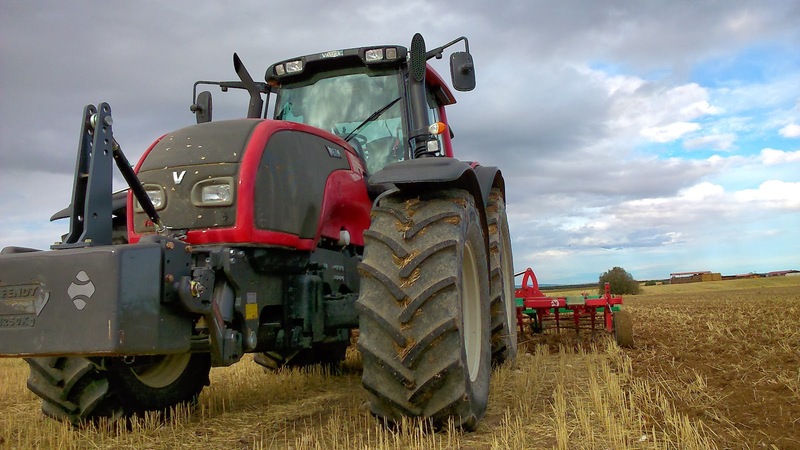 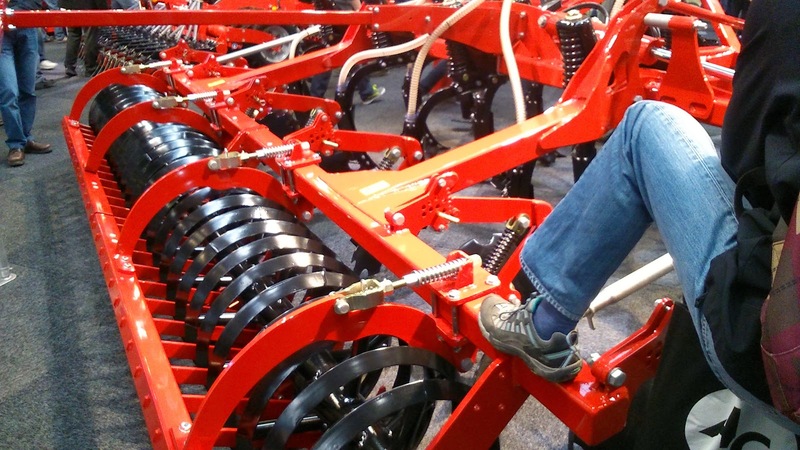 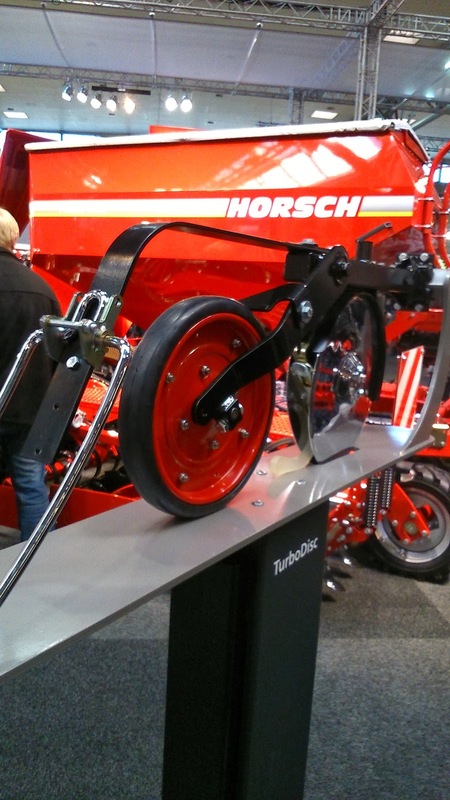 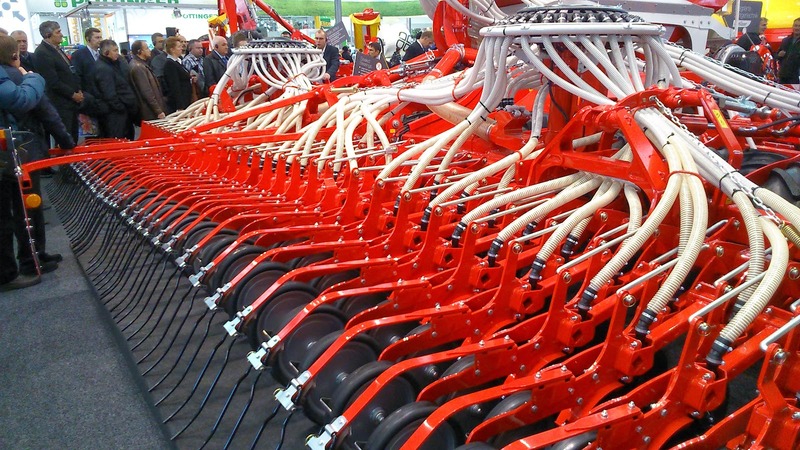 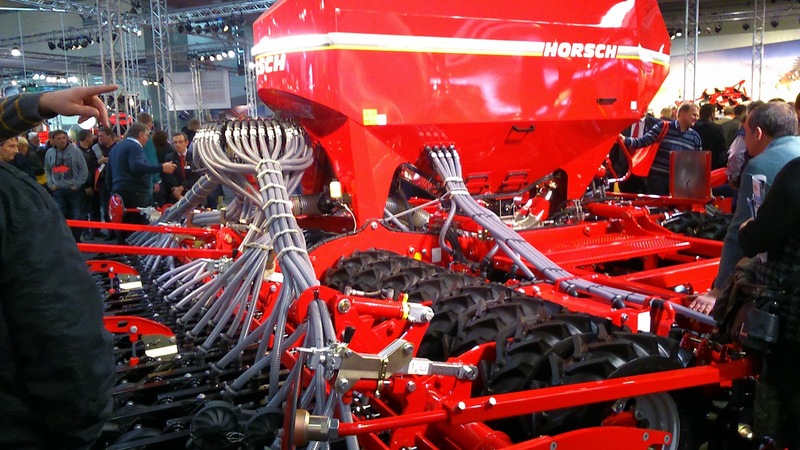 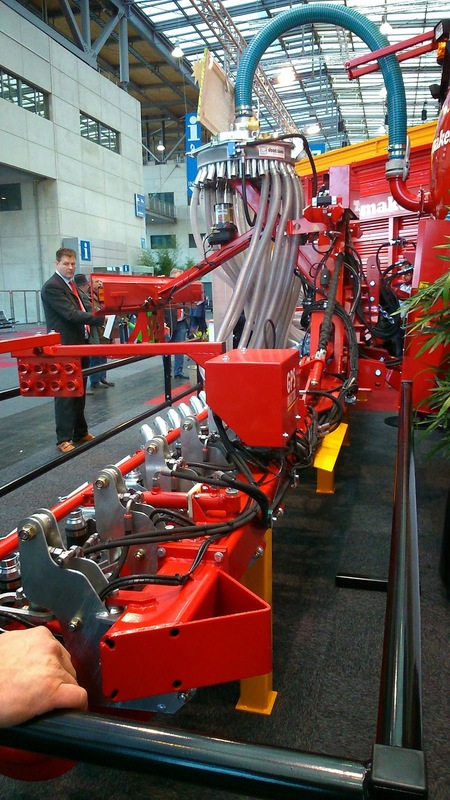 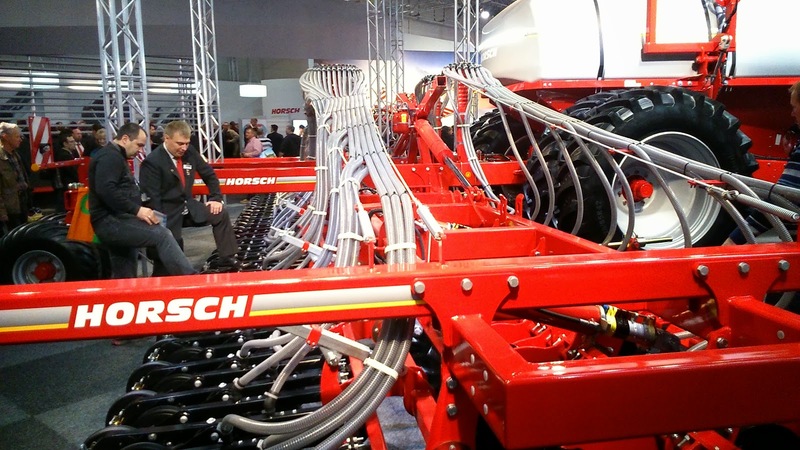 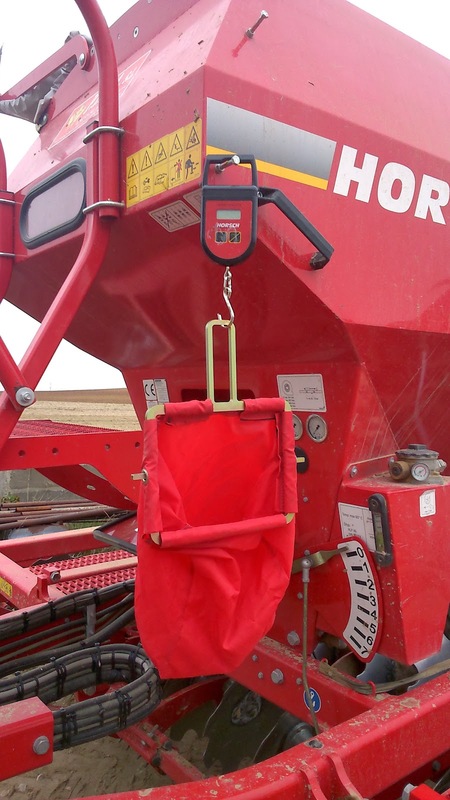 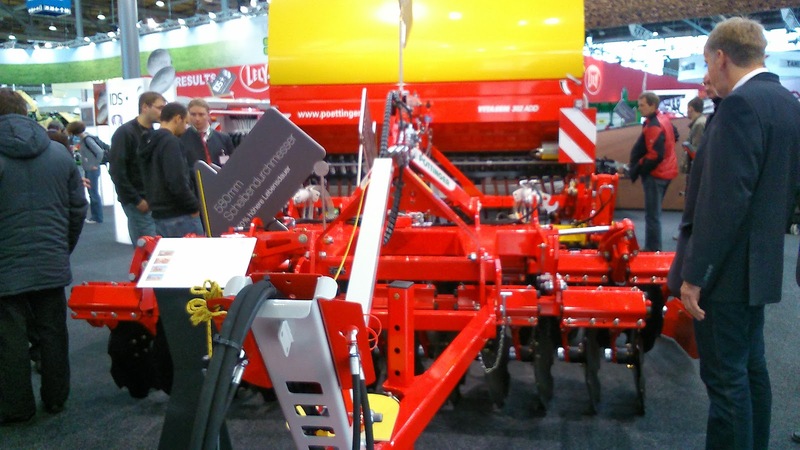 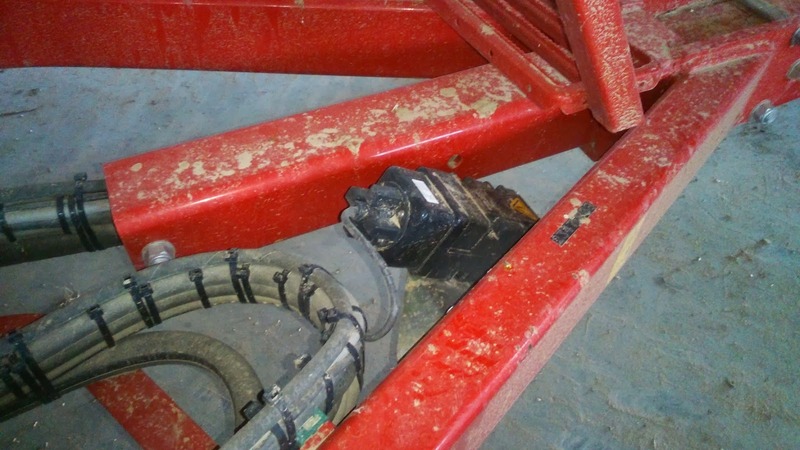 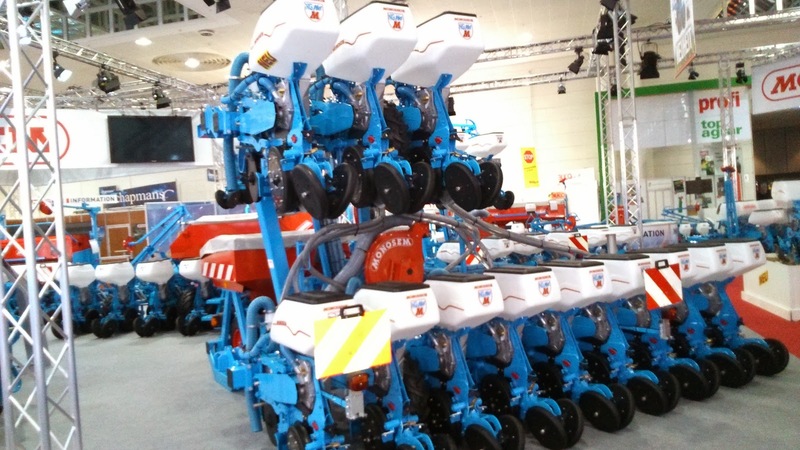 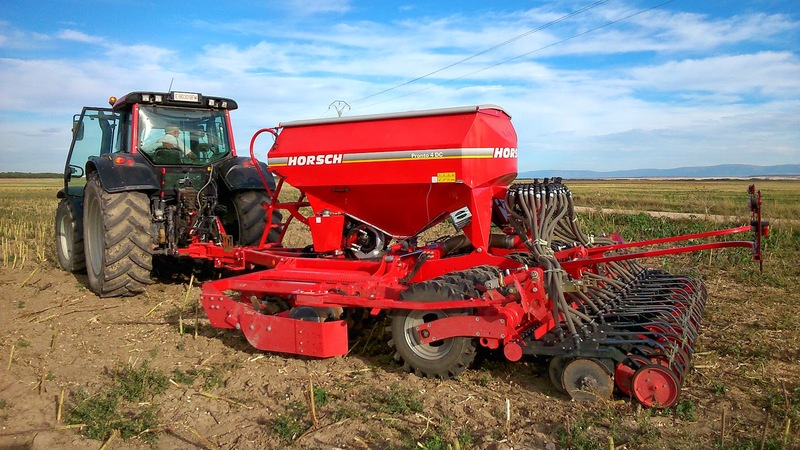 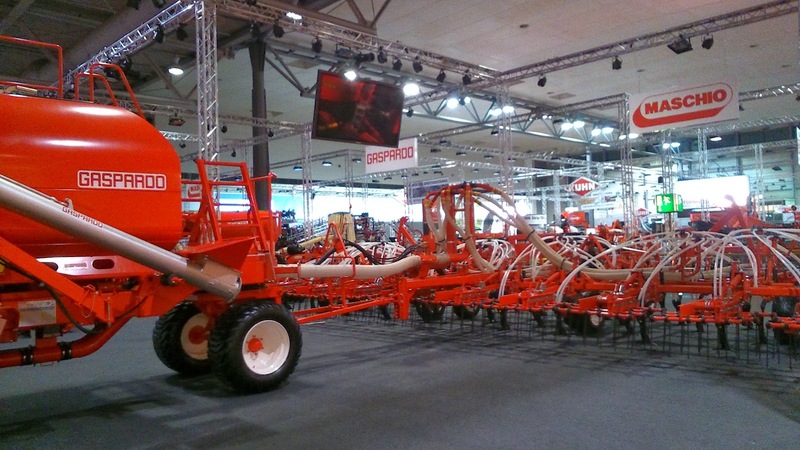 ​Because, it is the first time h​e uses​ his new seed drill which is a Horsch Pronto DC 4. 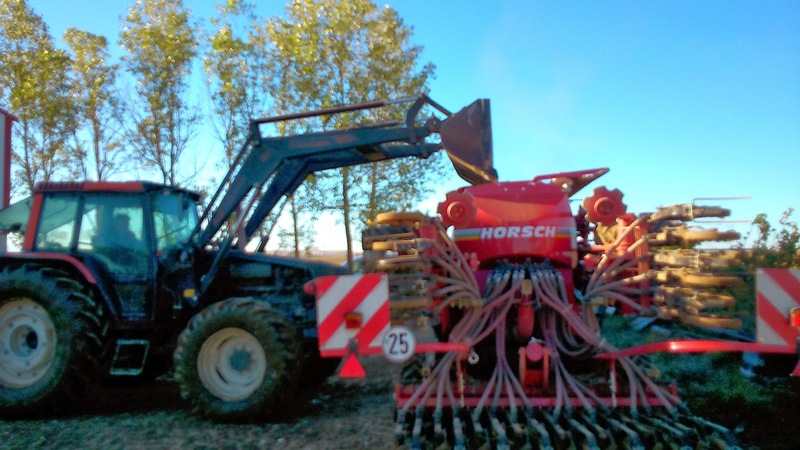 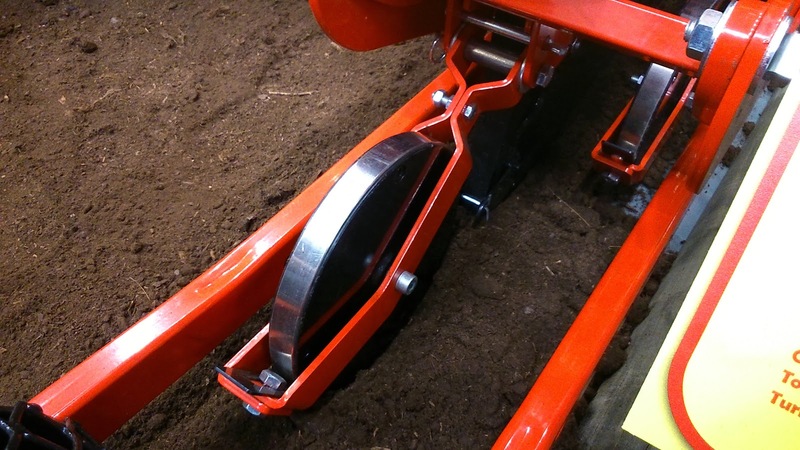 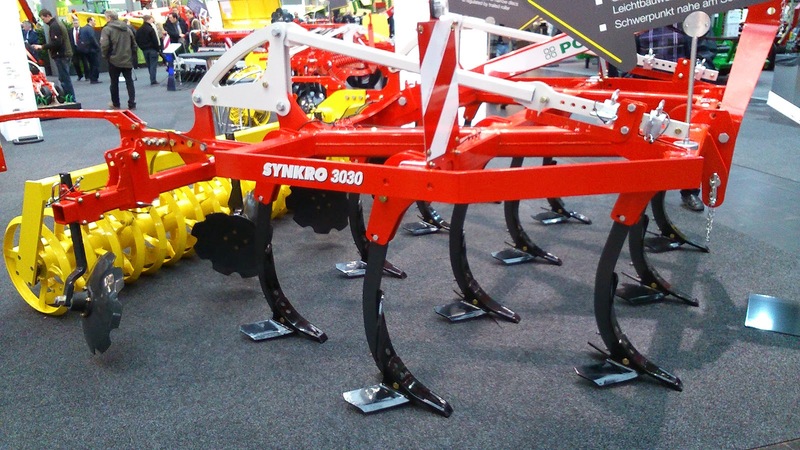 This machine is ideal for mulch sowing (minimum tillage), so that he told us, he could sow cereal over sunflowers stubble this year without problems (previously, he sowed with a Solá pneumatic seed drill, he sold us, but he couldn't sow cereal without picking up sunflower stems before). 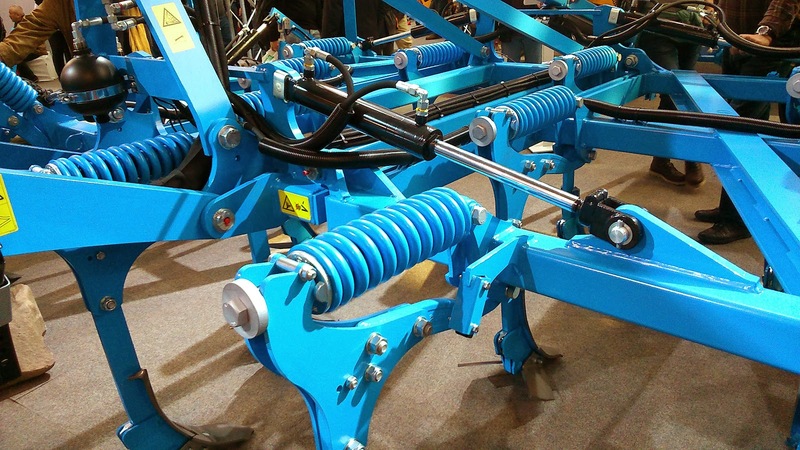 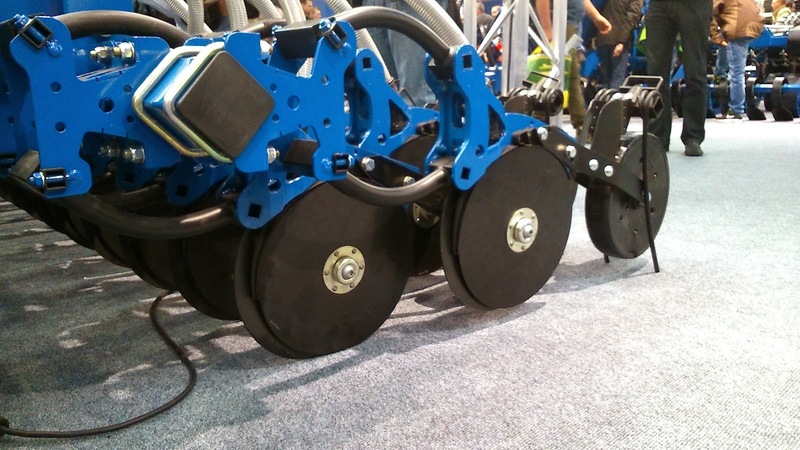 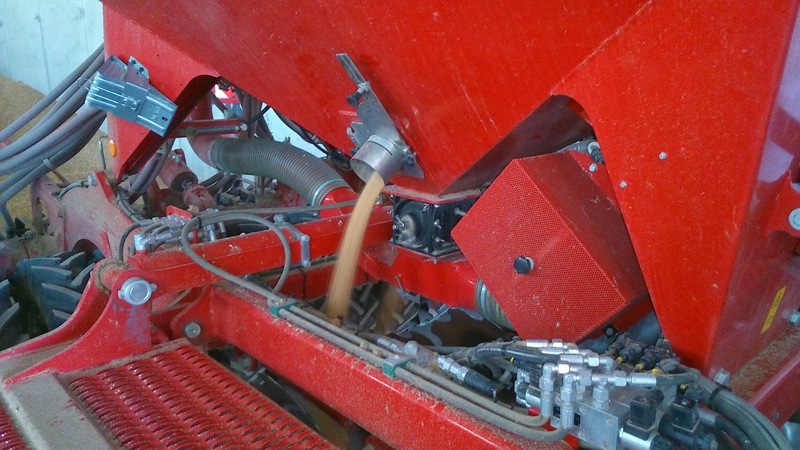 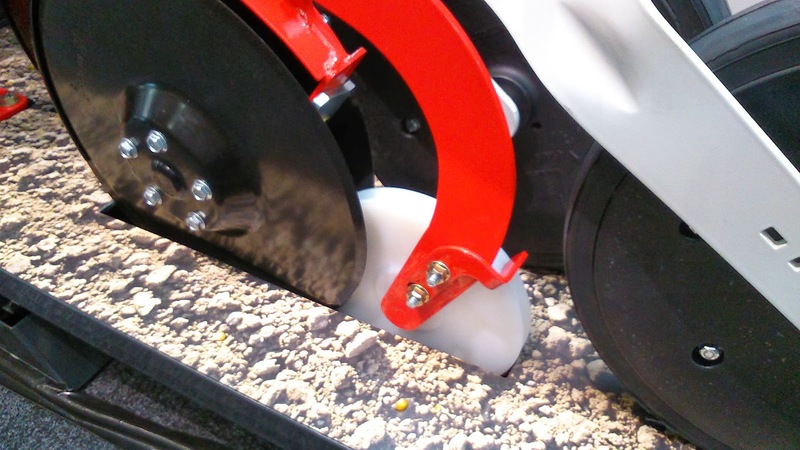 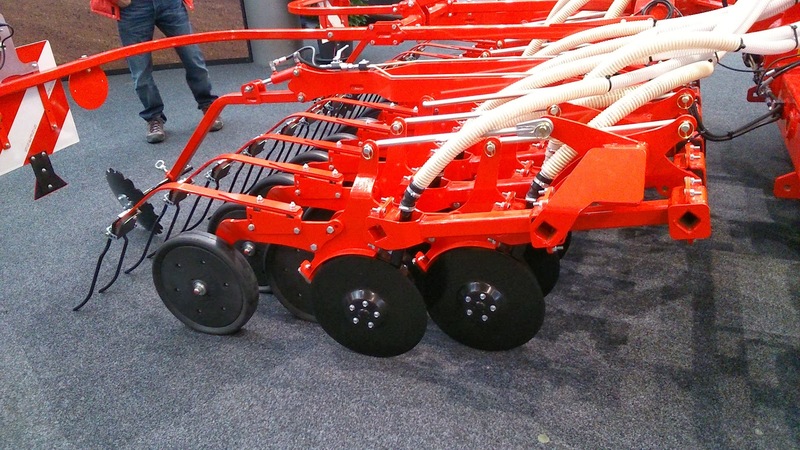 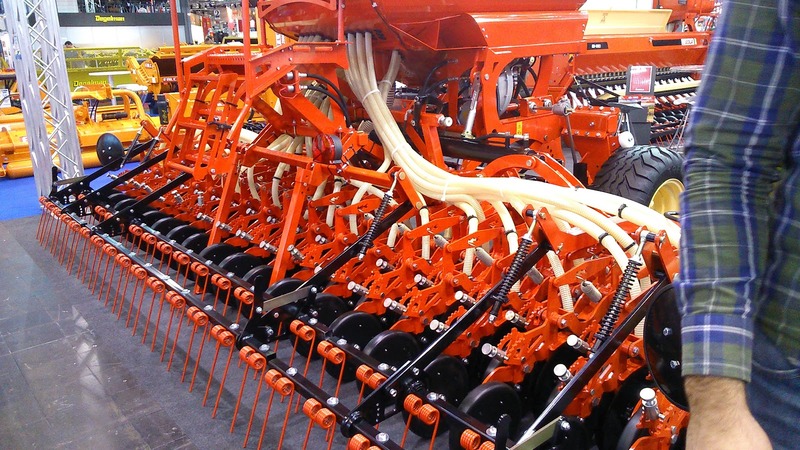 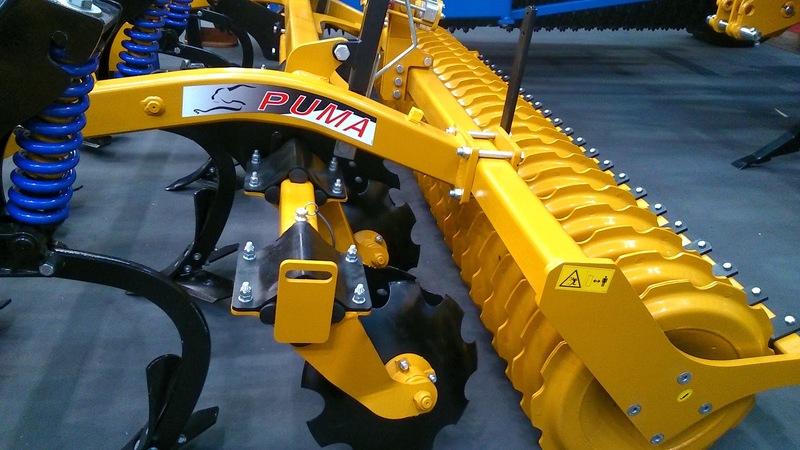 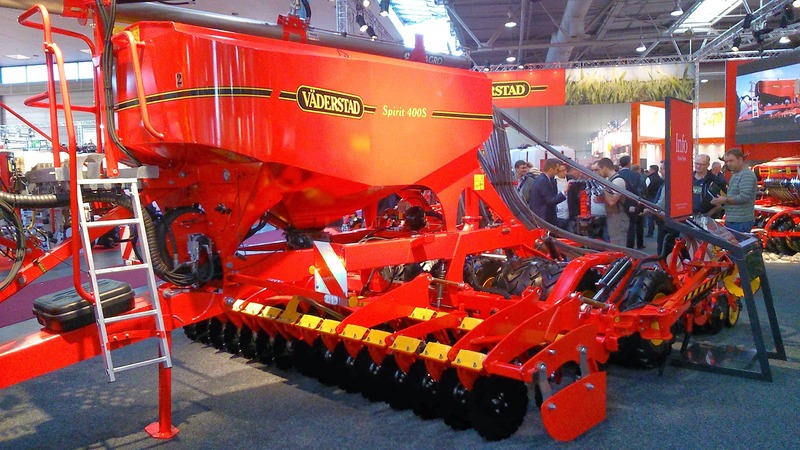 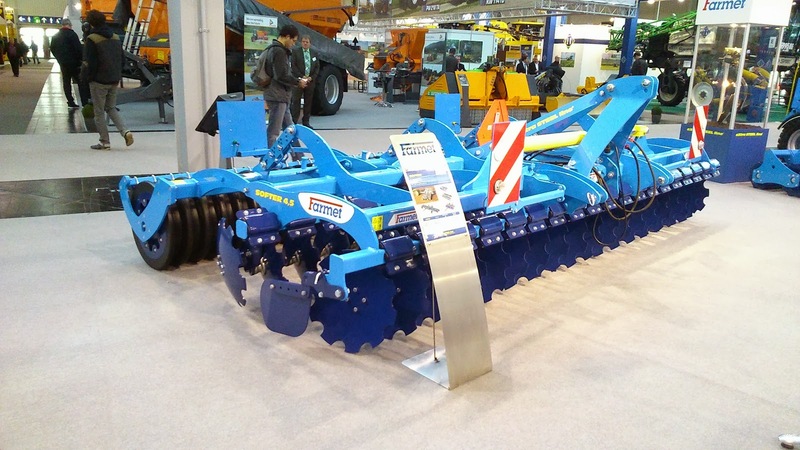 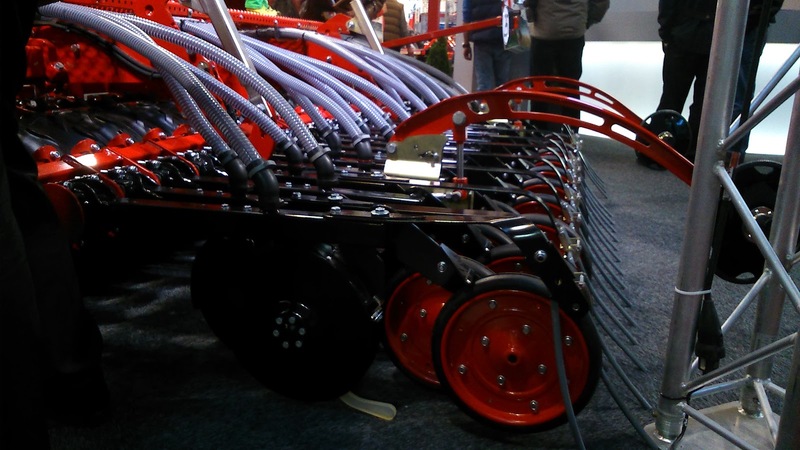 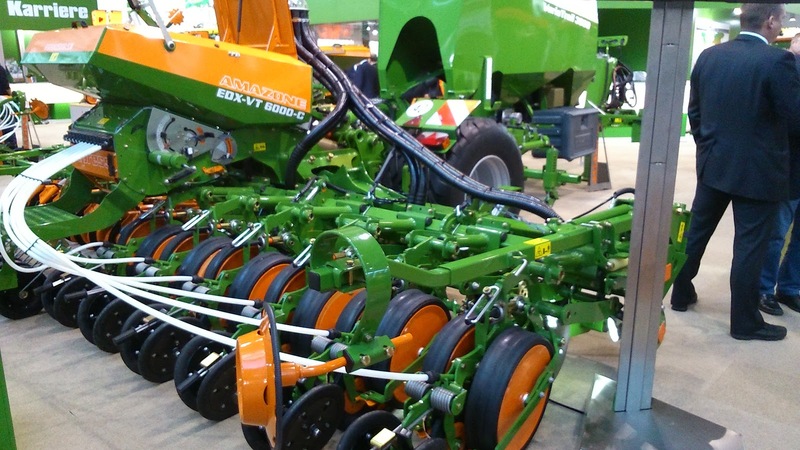 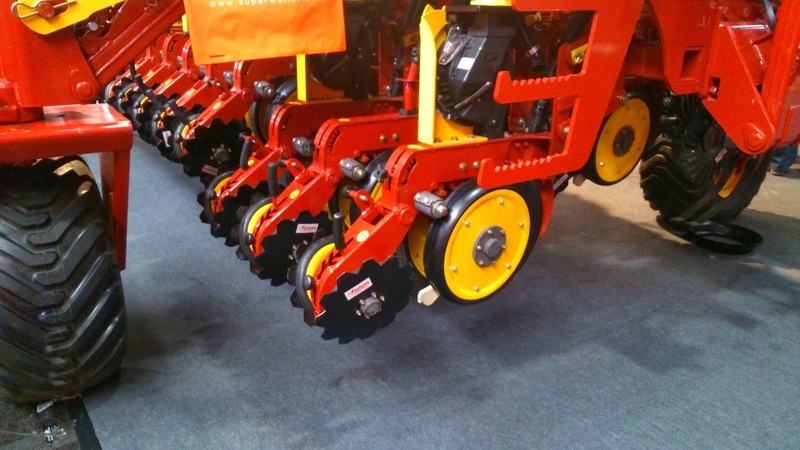 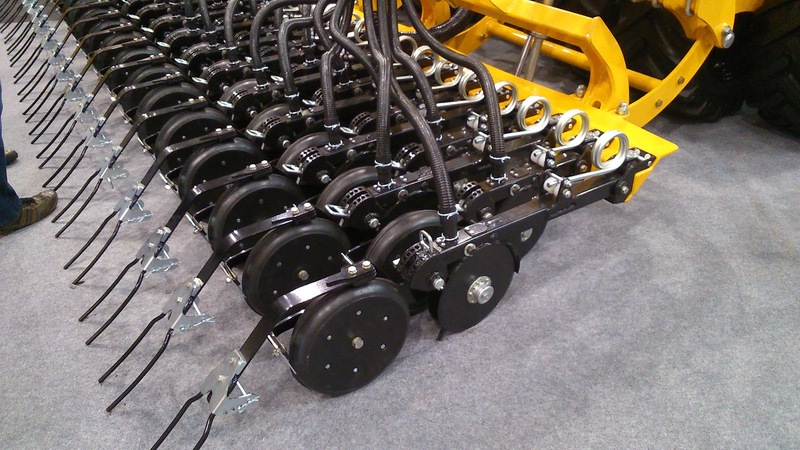 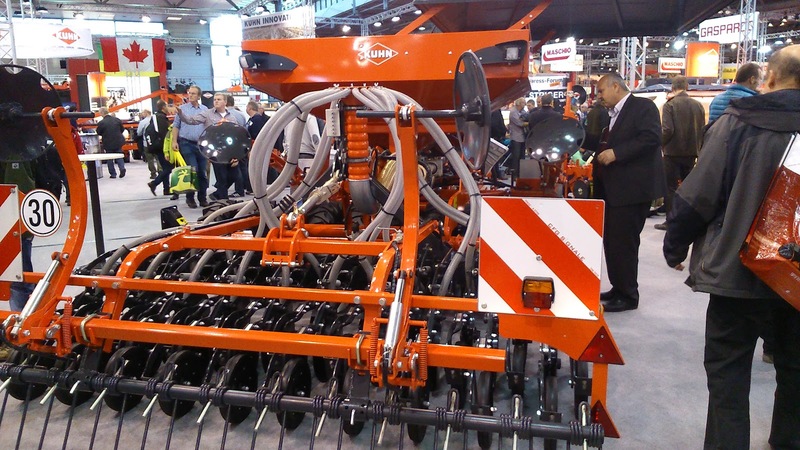 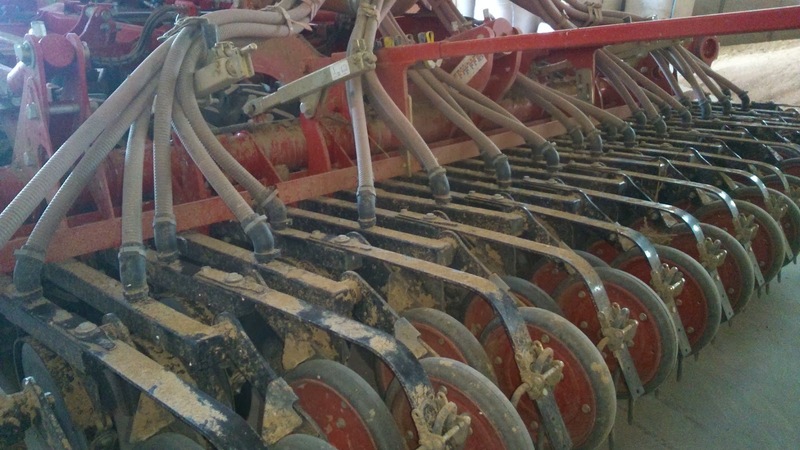 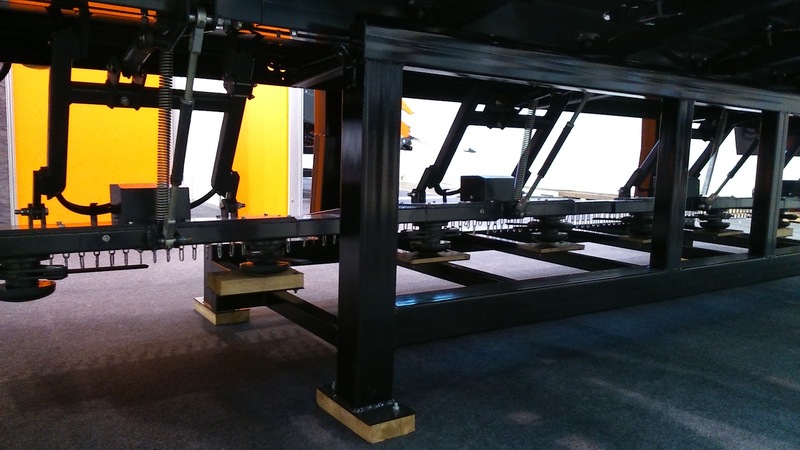 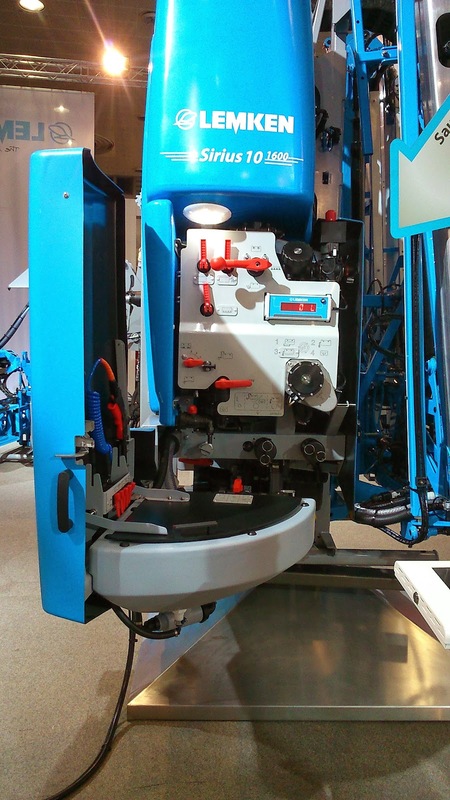 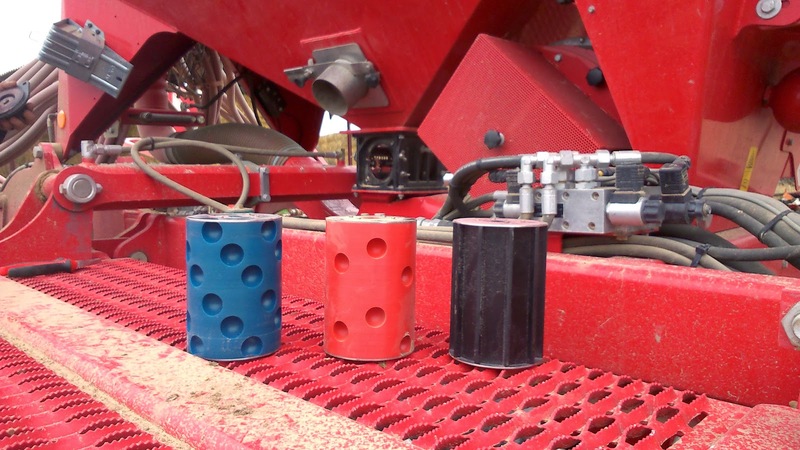 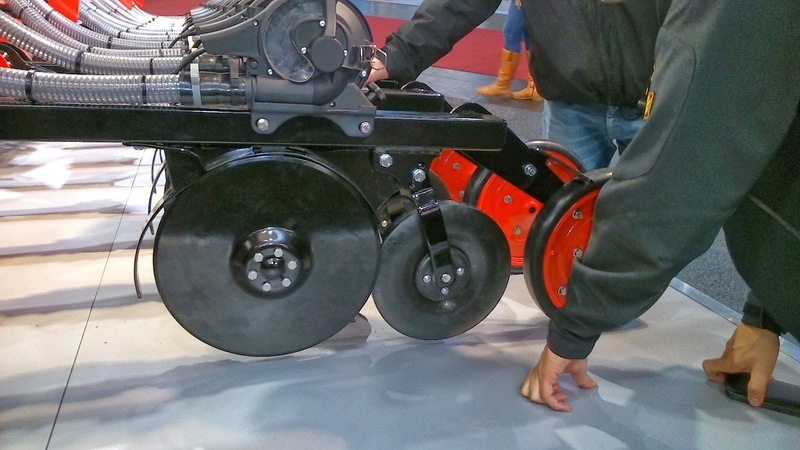 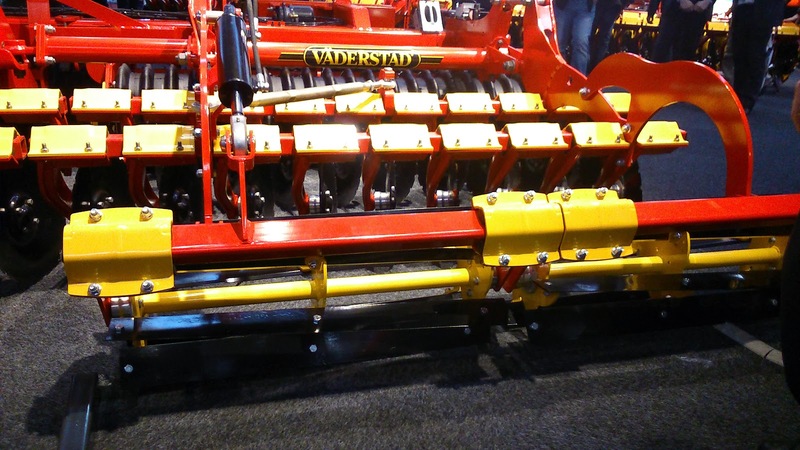 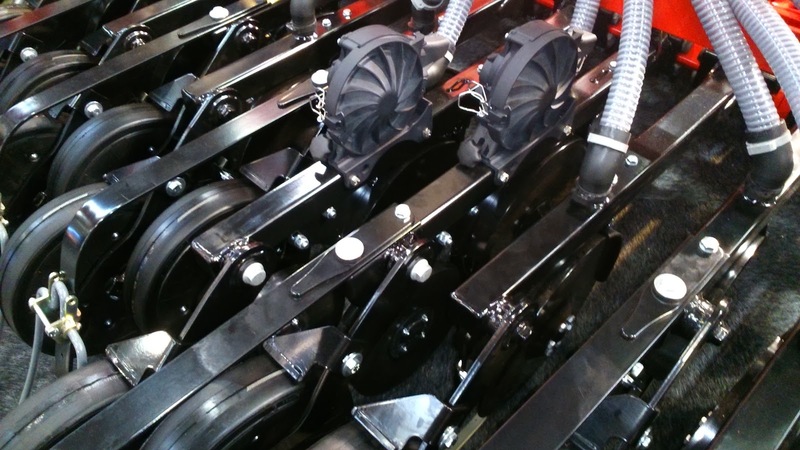 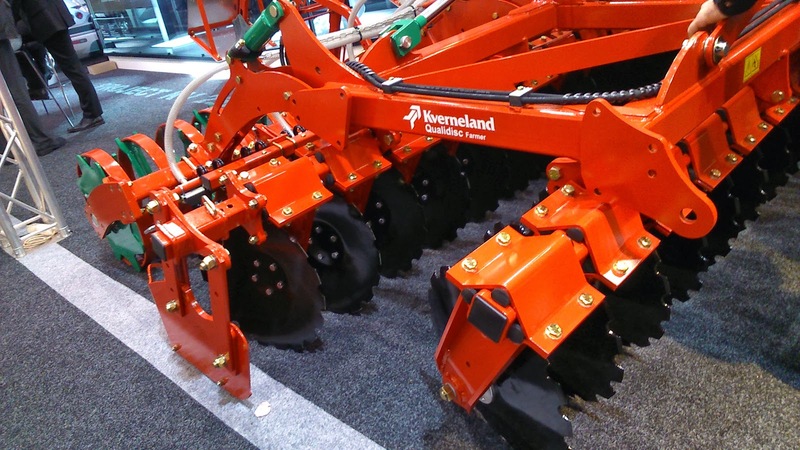 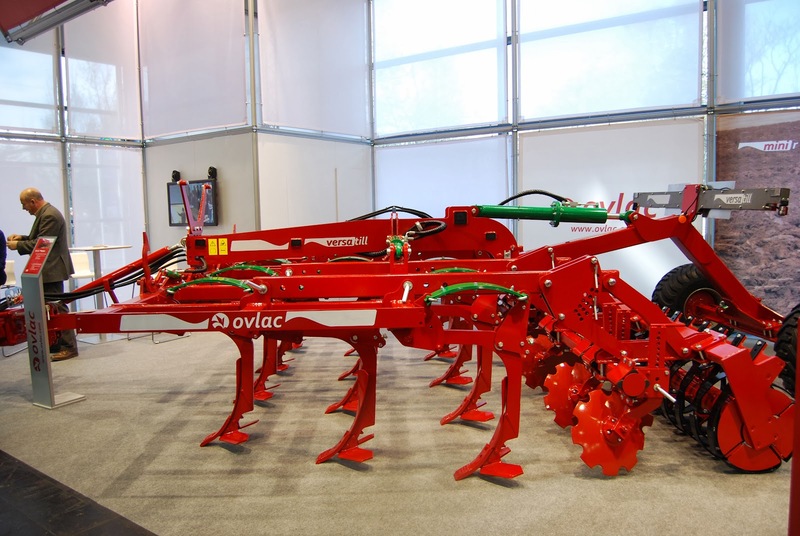 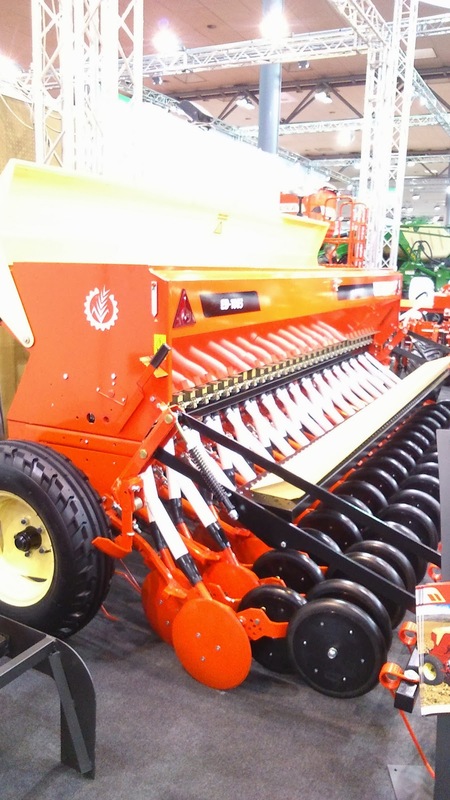 With this machine, that is possible thanks to the seedbed-preparation unit with discs of 46cm. 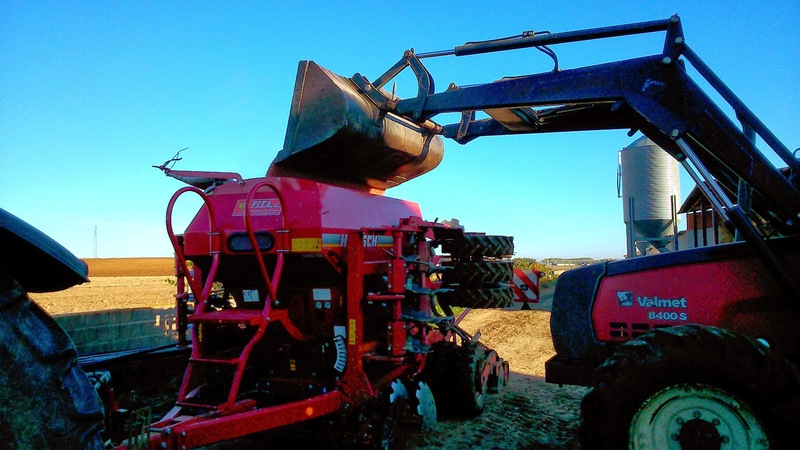 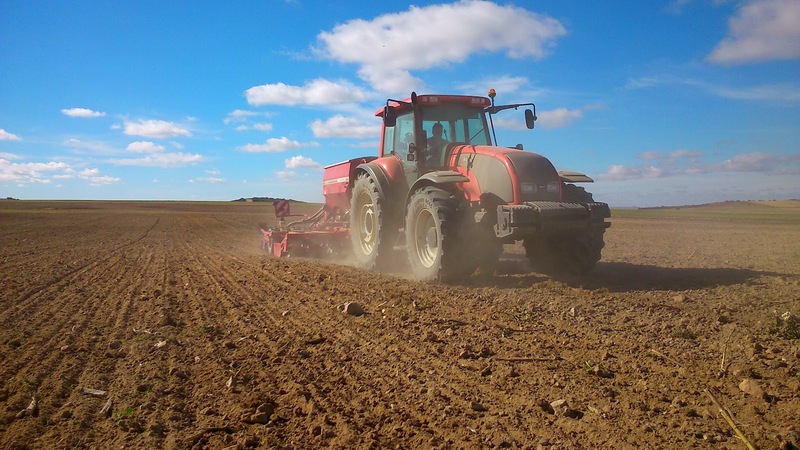 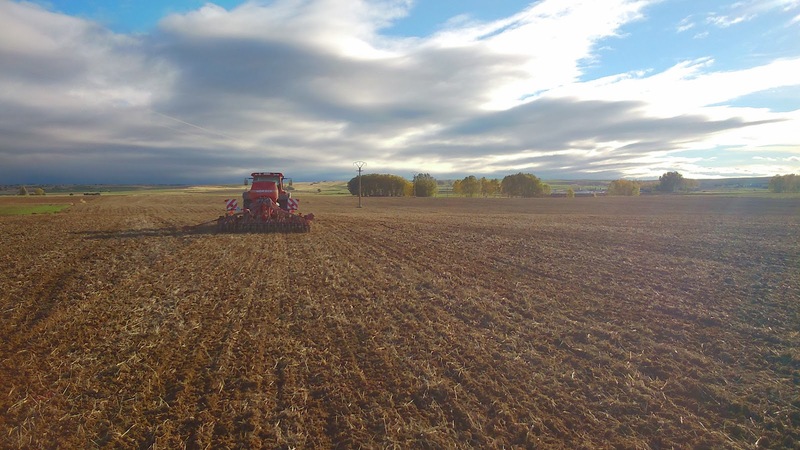 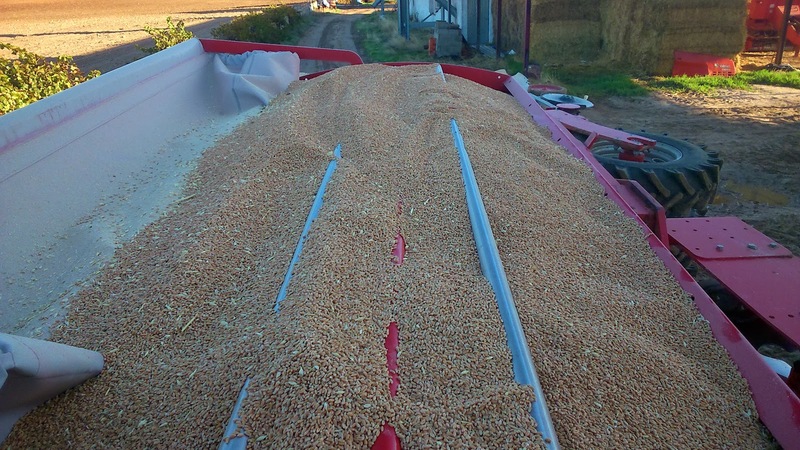 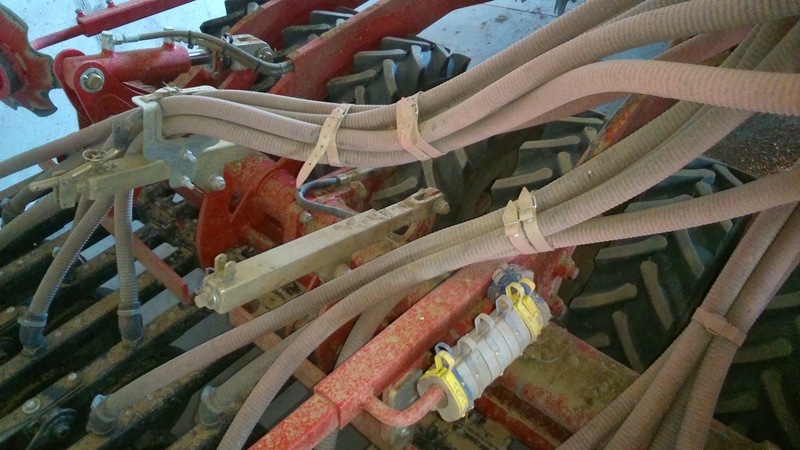 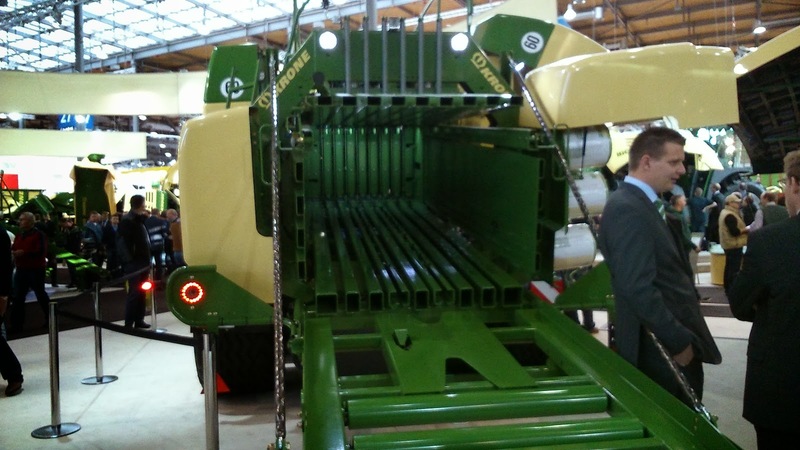 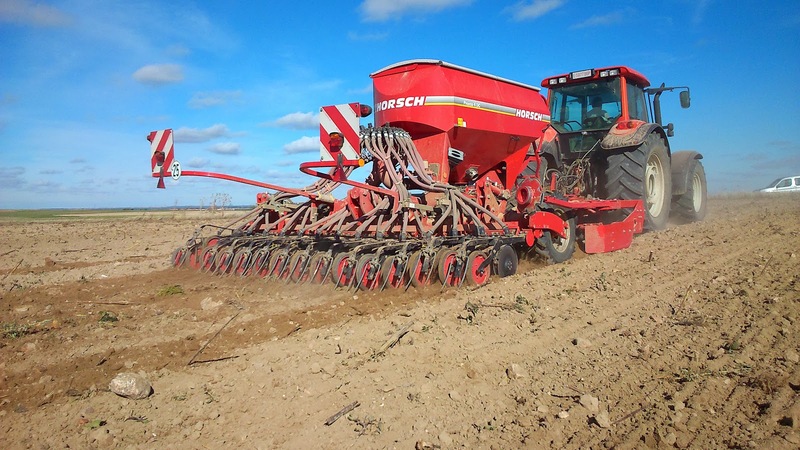 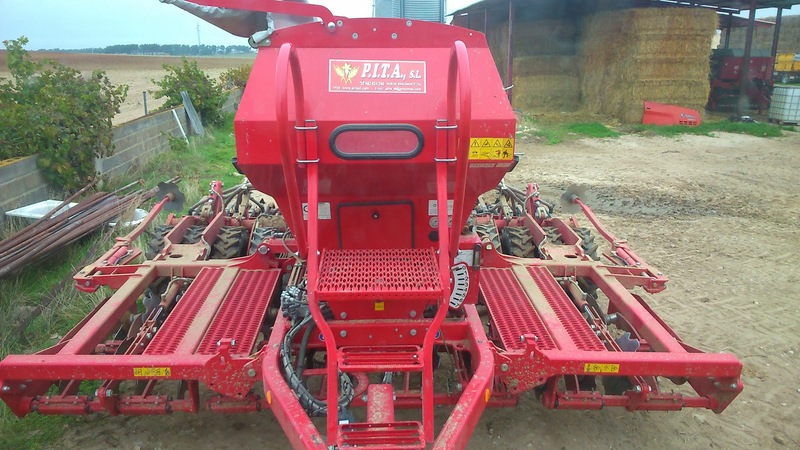 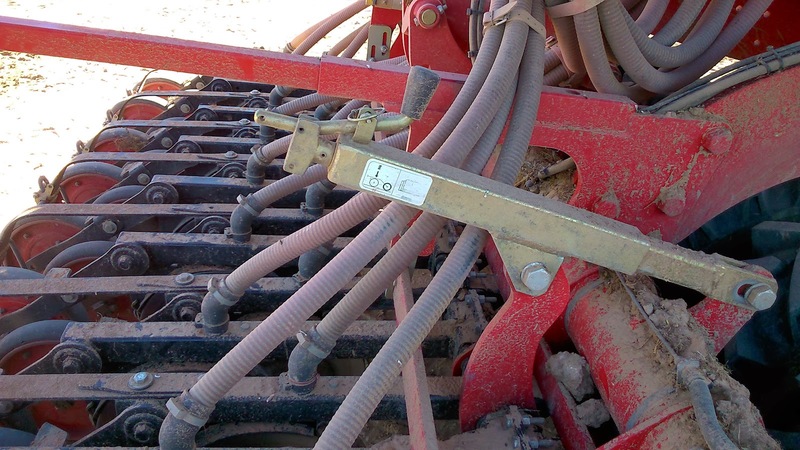 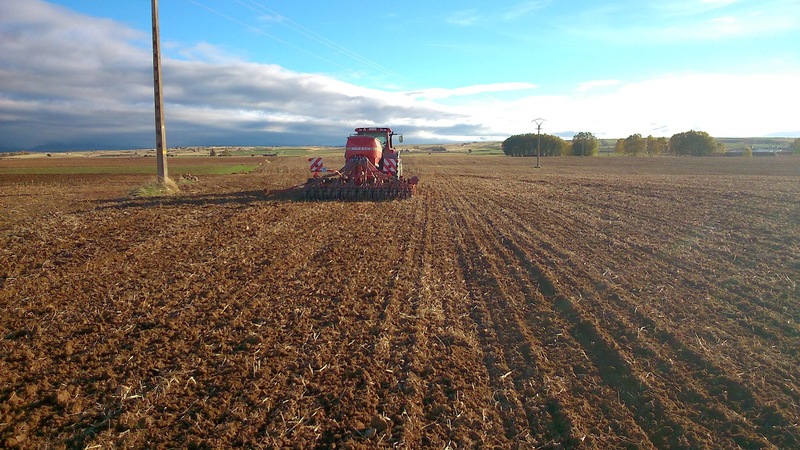 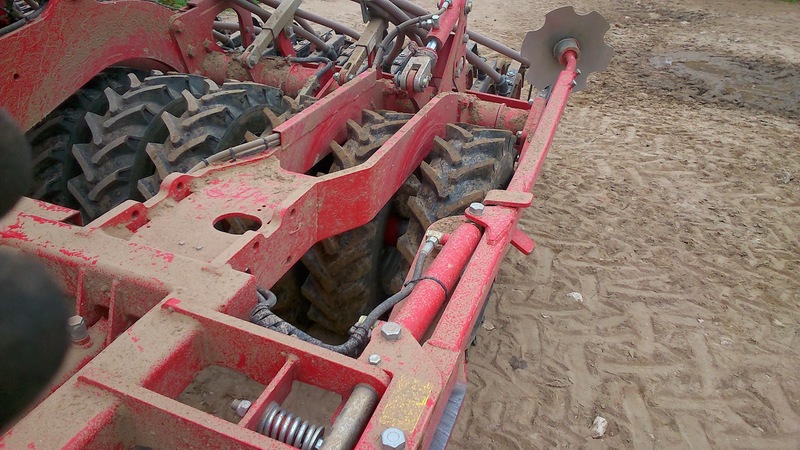 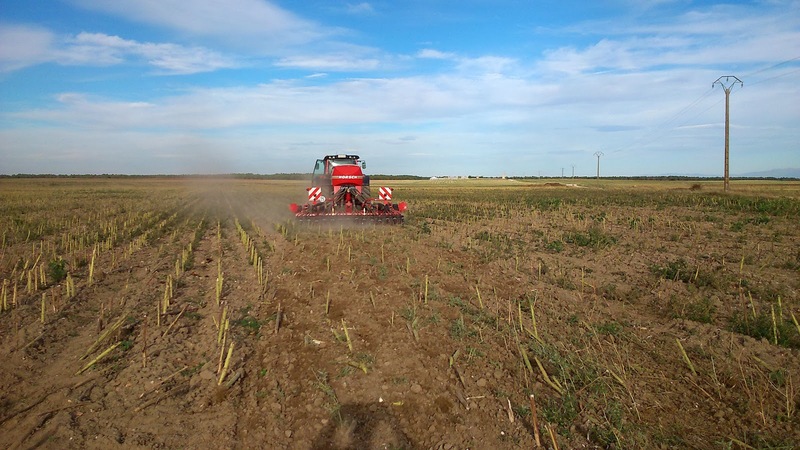 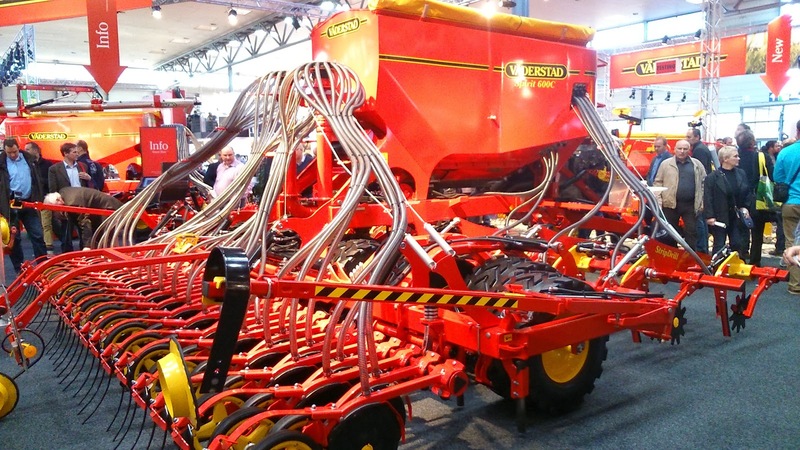 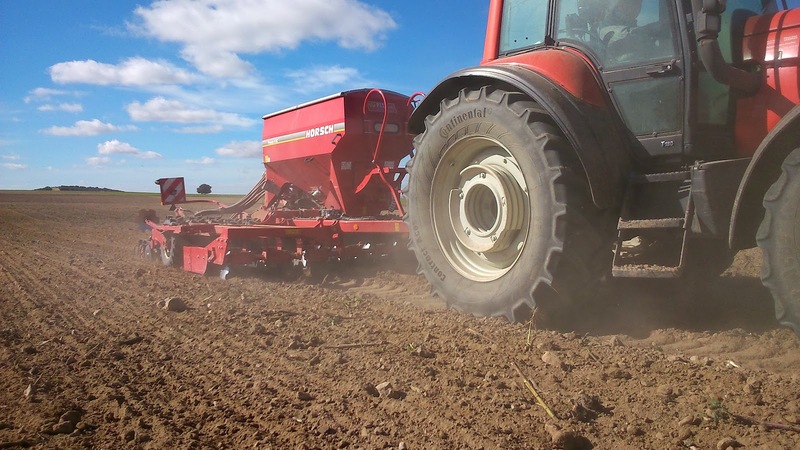 This seed drill is of 4m working width (with 28 seed coulters and a row spacing of 14.3cm) and it has a hopper of 2,800 liters, so that he can sow about 14ha of barley straight off (he are using a dose of 150kg/ha of triticale, 180kg/ha of wheat and 170kg/ha of barley). 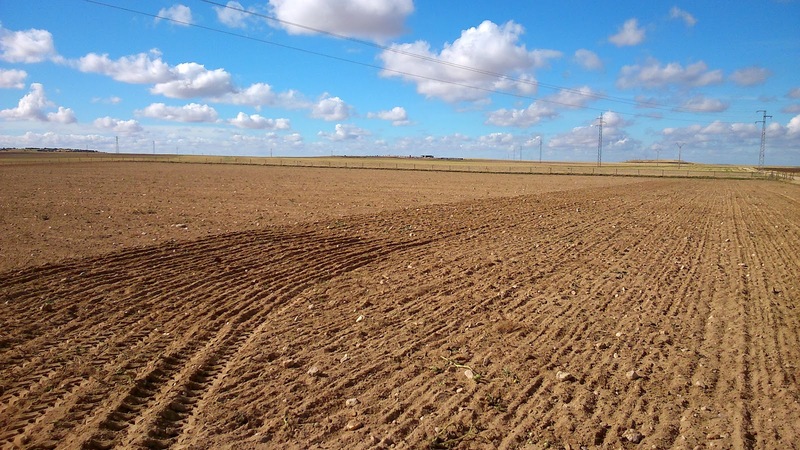 The working speed ​depends on the​ terrain but it is between 7km/h and 13km/h. 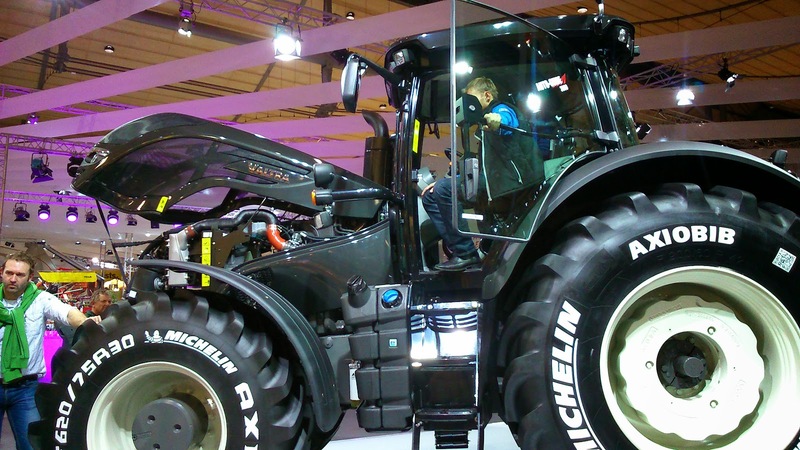 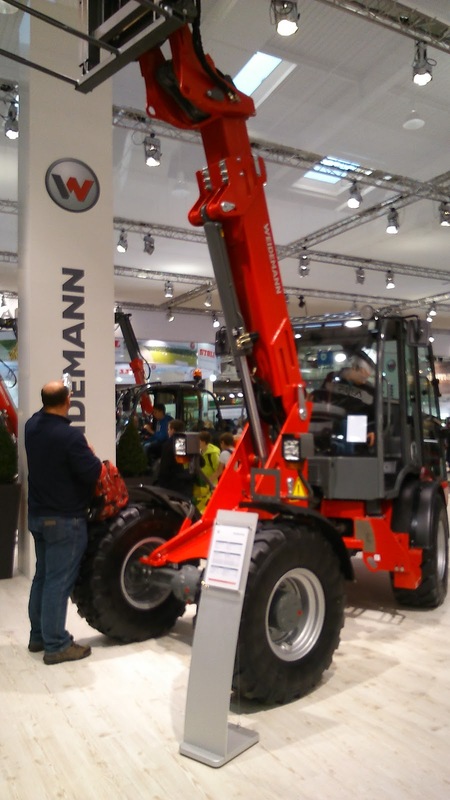 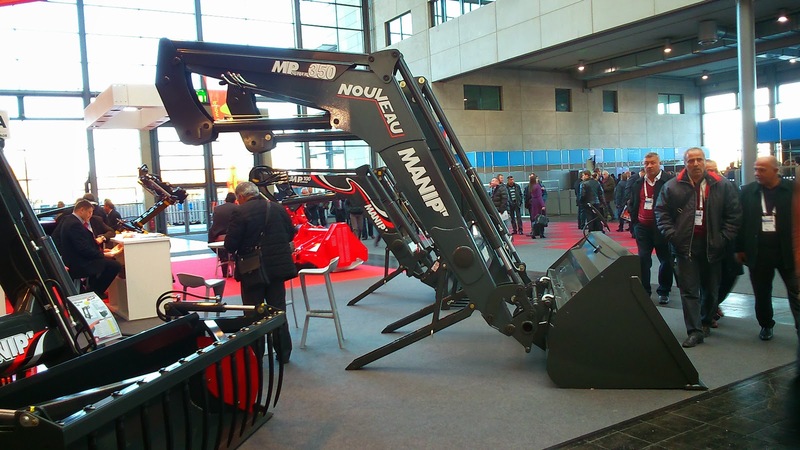 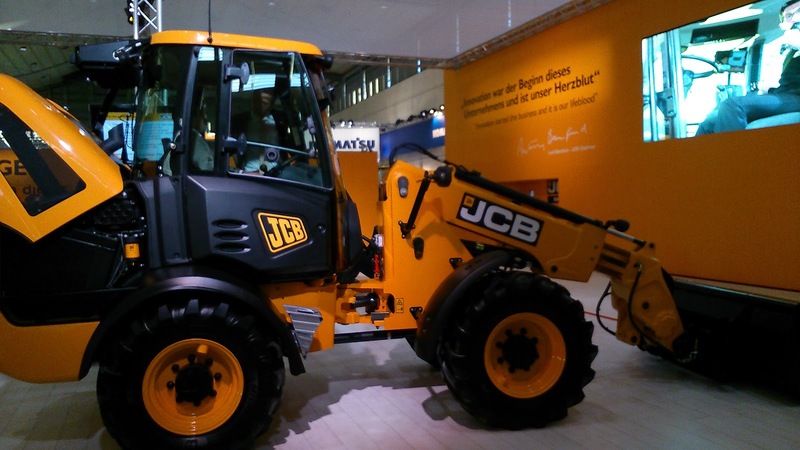 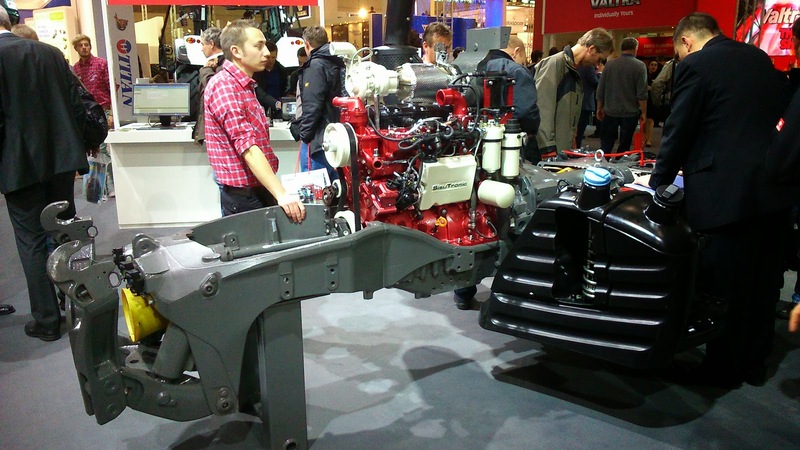 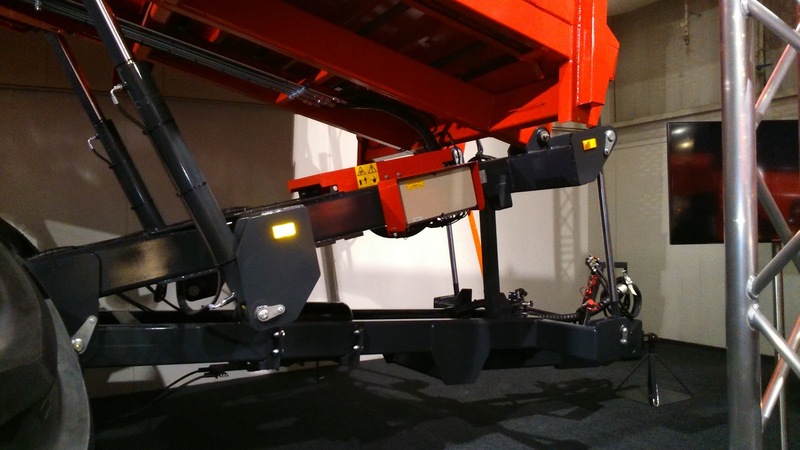 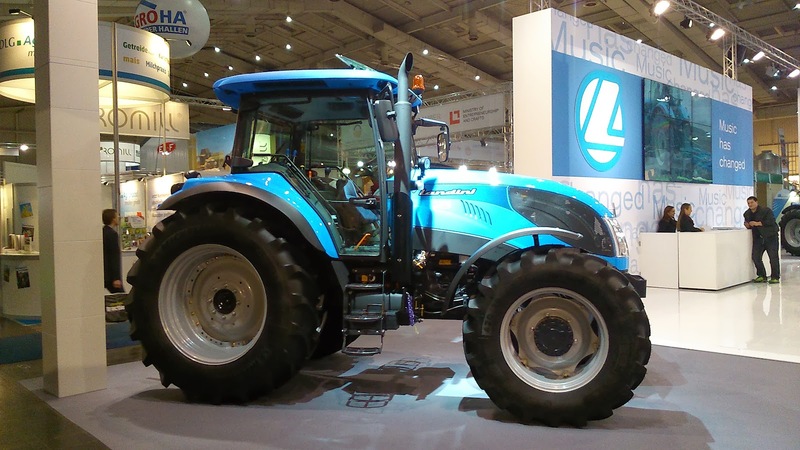 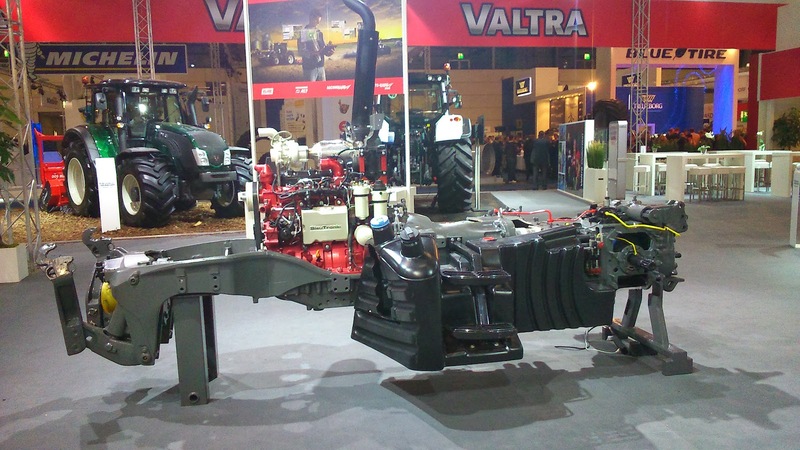 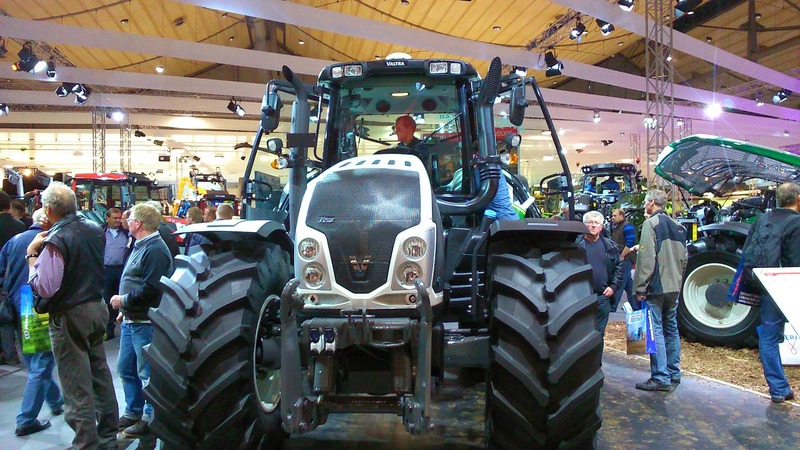 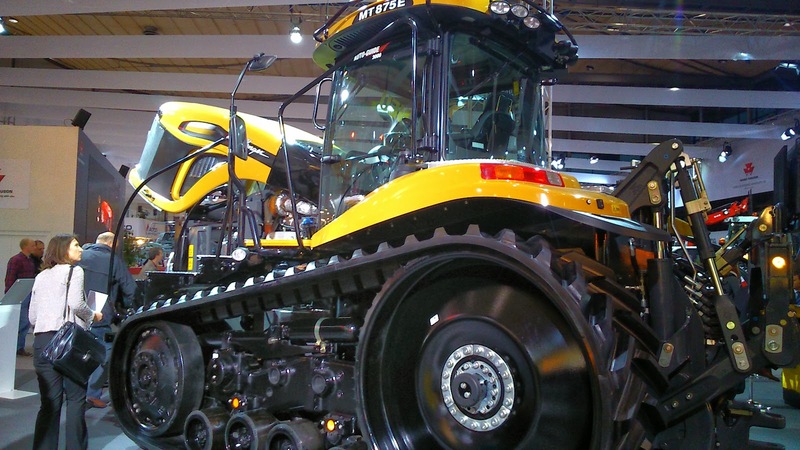 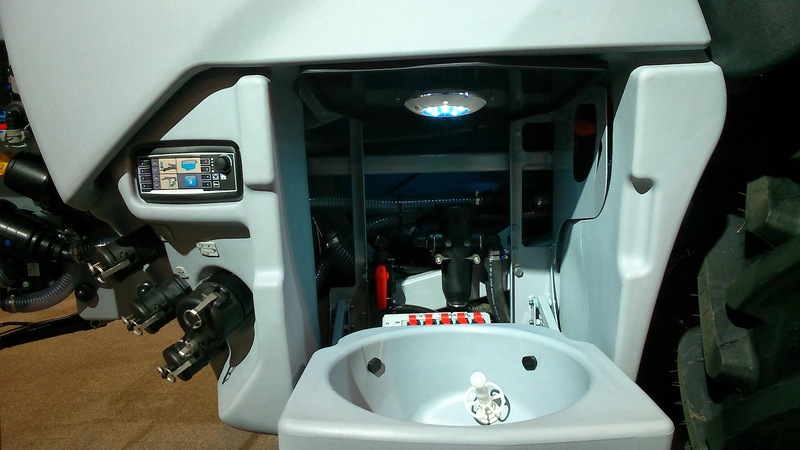 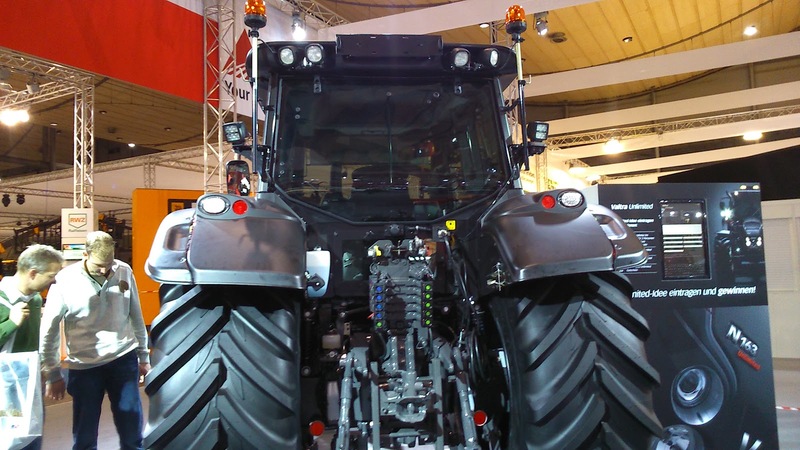 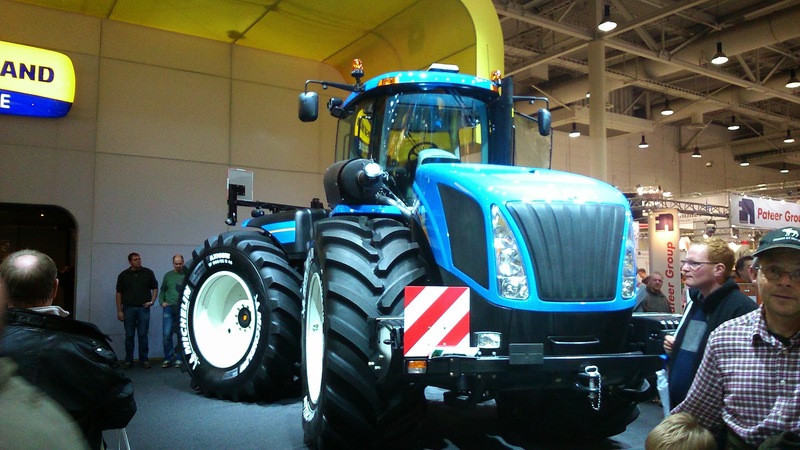 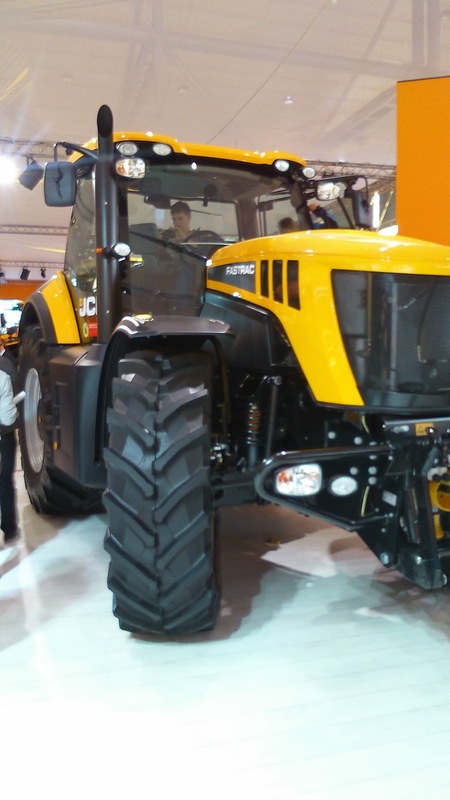 The weight of this machine is of 4,600kg and its length is of 6.9m so the mimimun power required is about 160HP (he has a Valtra T161 and a Valtra T190). 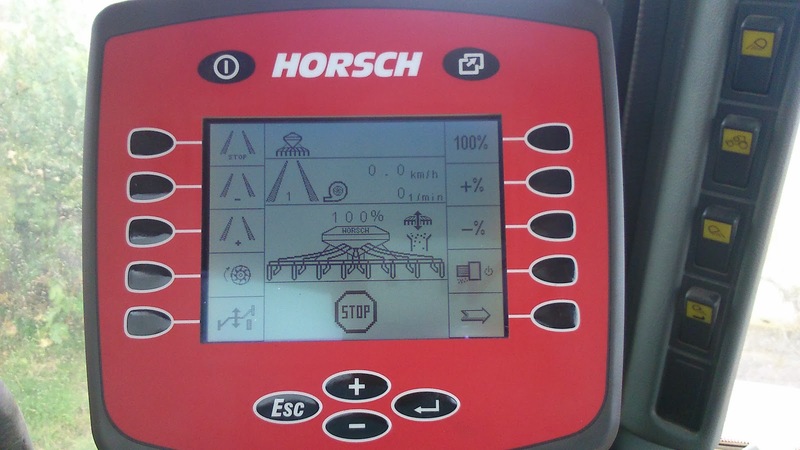 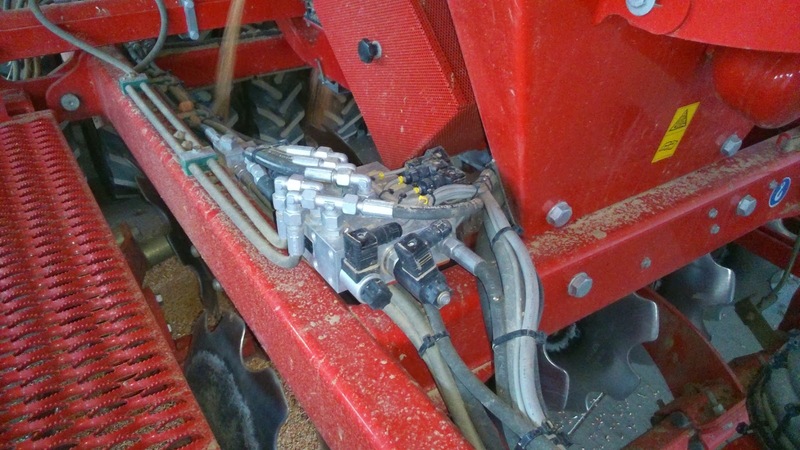 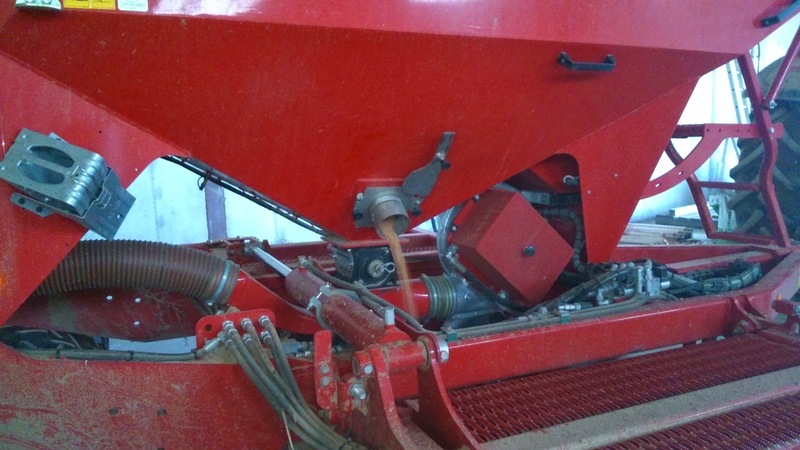 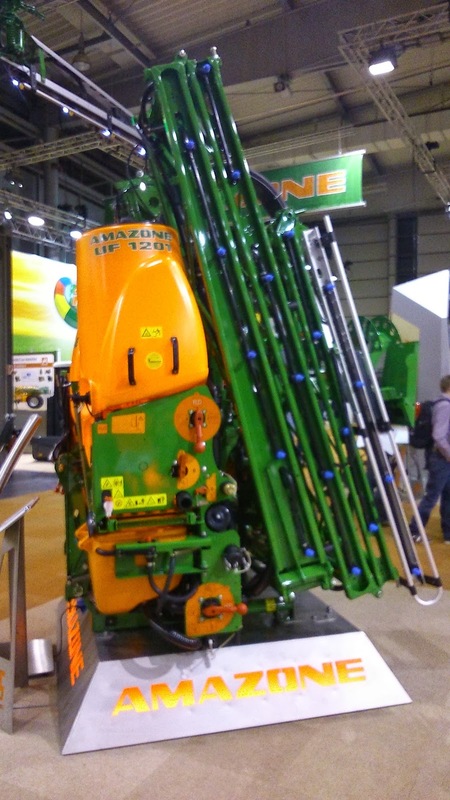 The computer of seed drill allows him to manage the dose used (he told us it is very accurate​)​, besides to​ join distribution roller fixed and a lot of functionalities and alarms more (if a seed coulter is blocked, seed coulter pressure, he can close rows,...). 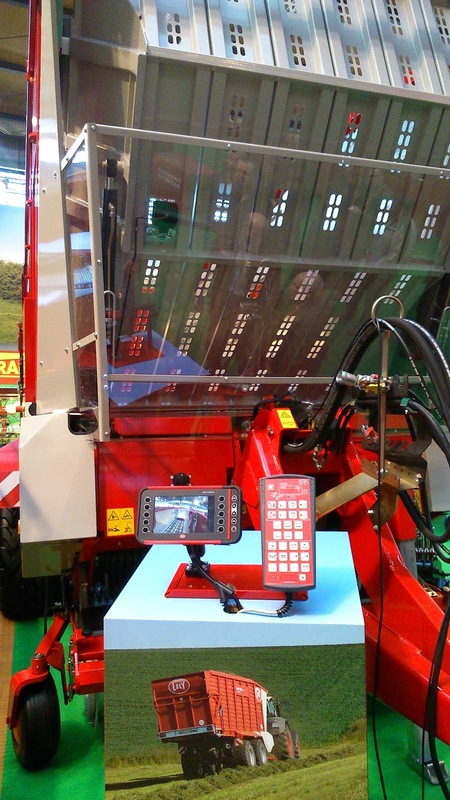 As all machinery, the​re are some weak points. 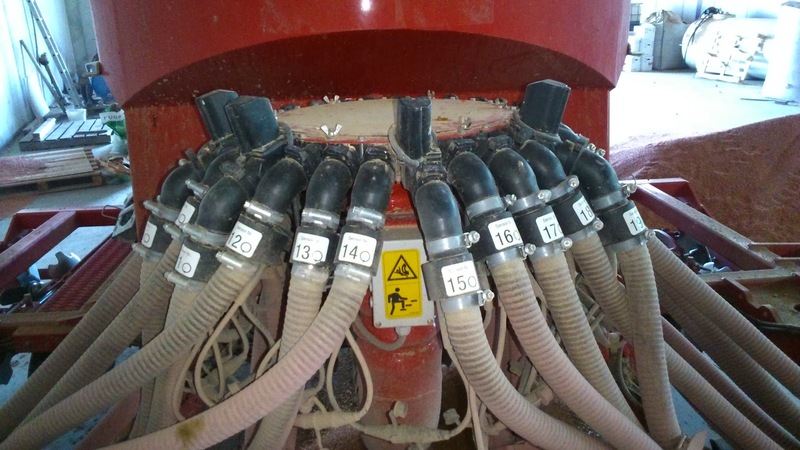 In this occasion, ​the problem appears with the stones. 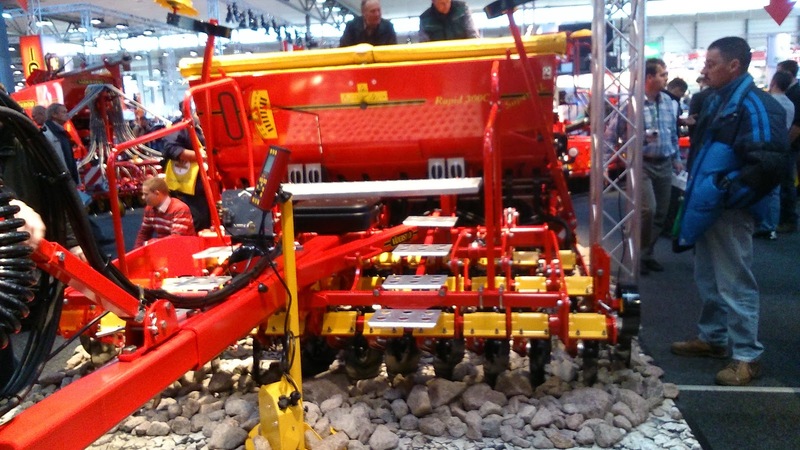 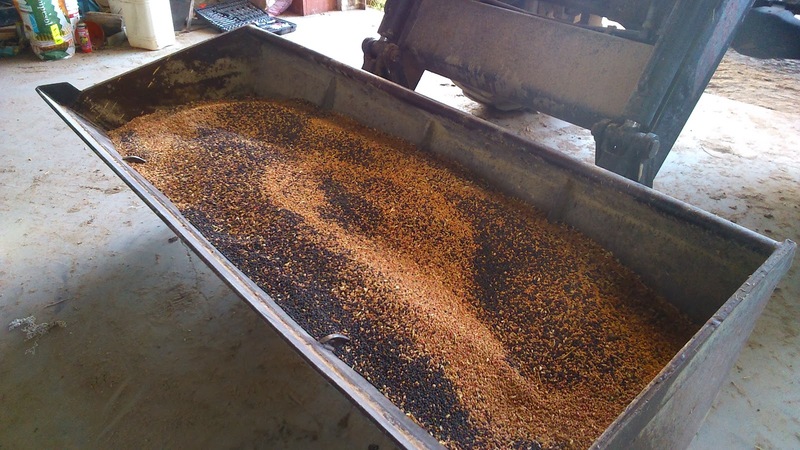 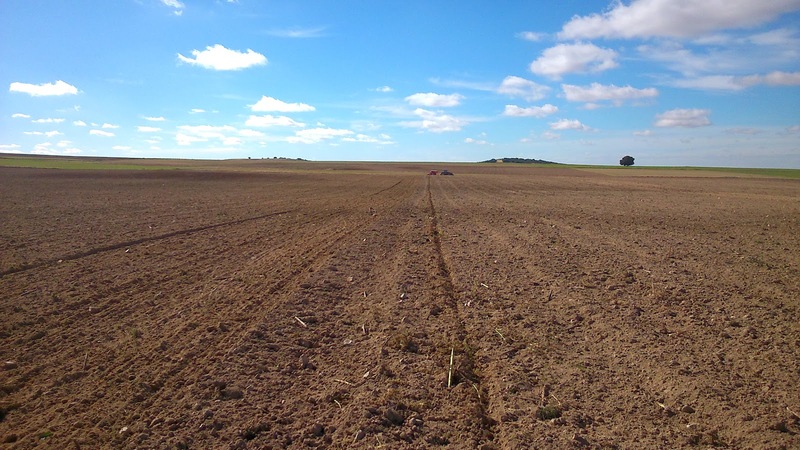 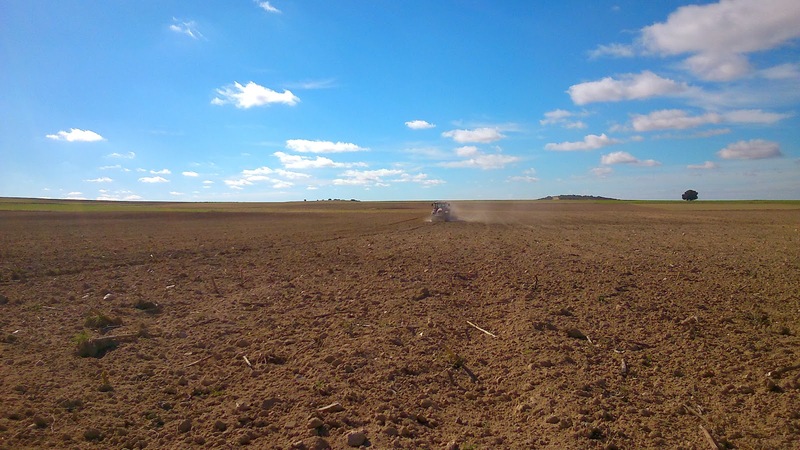 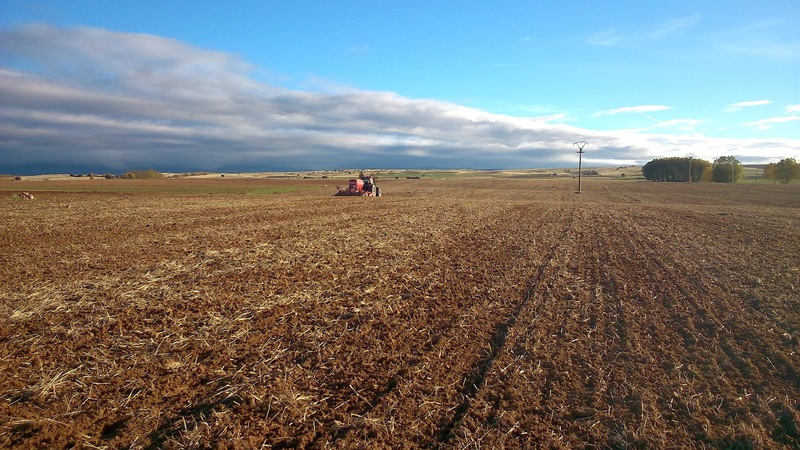 He has commented, the seed drill had a few problems when he sowed some fields with a lot of stones. 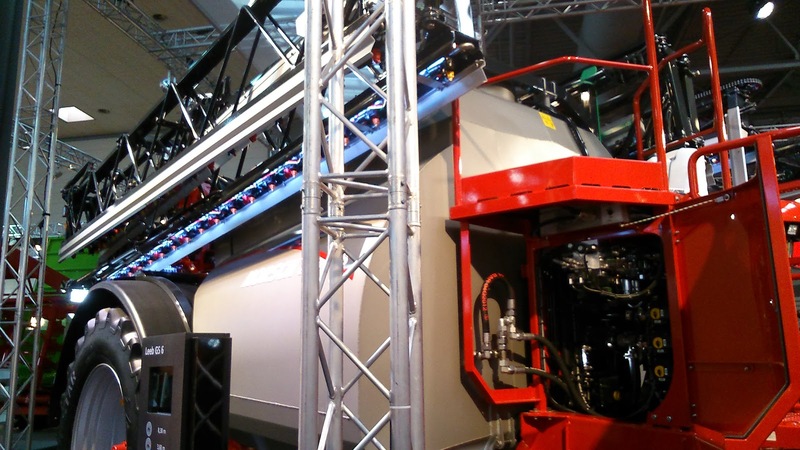 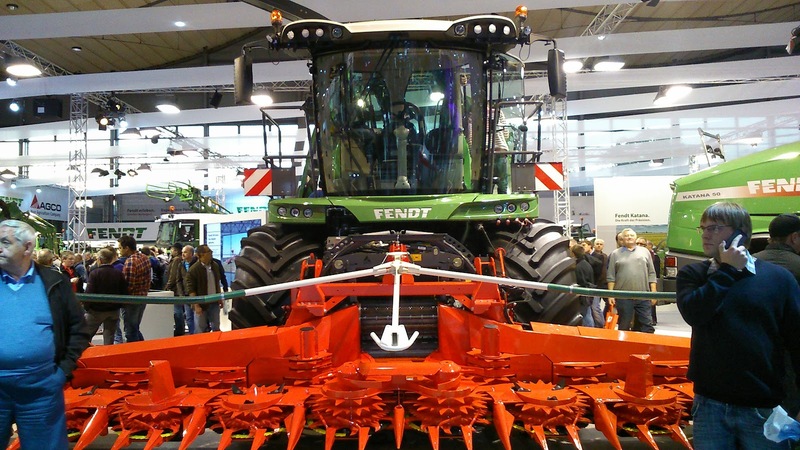 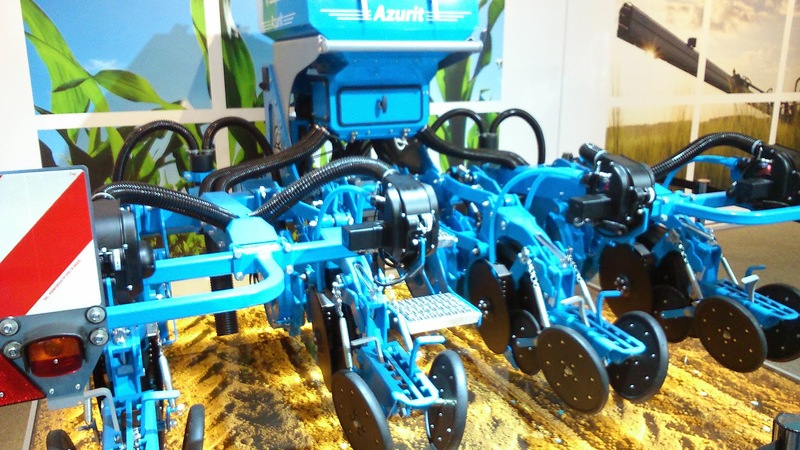 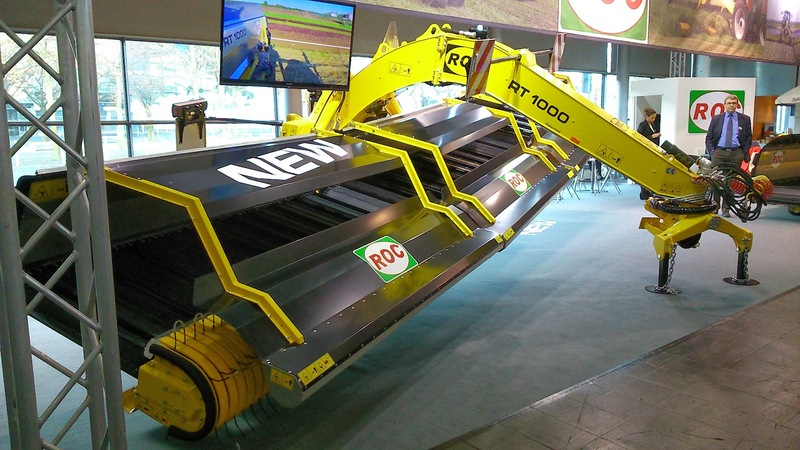 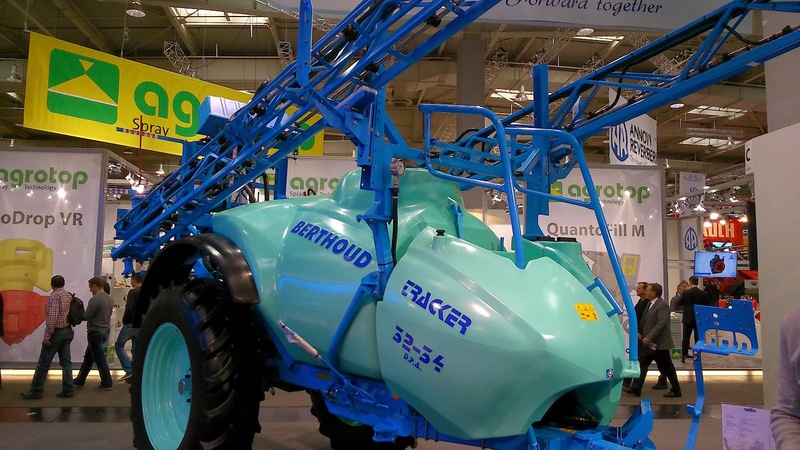 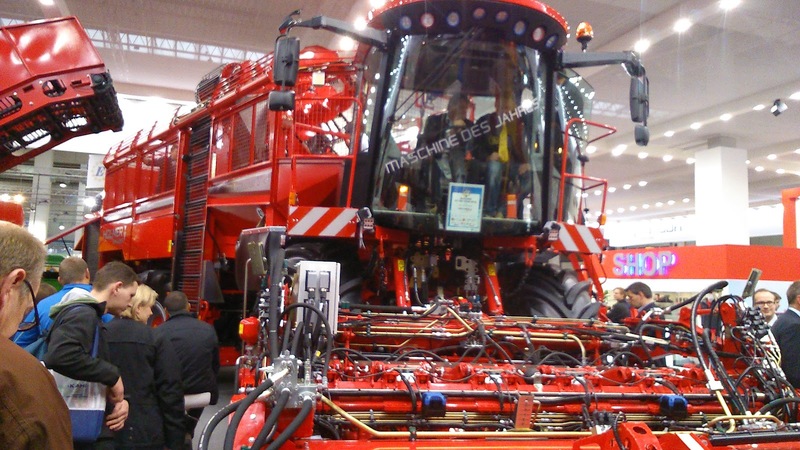 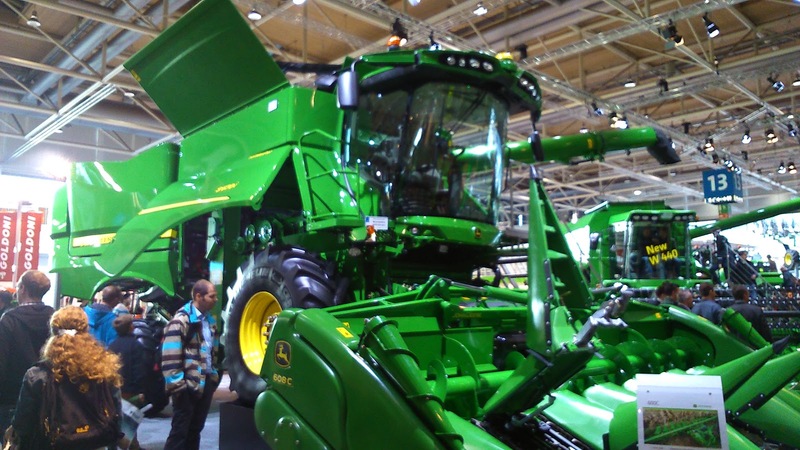 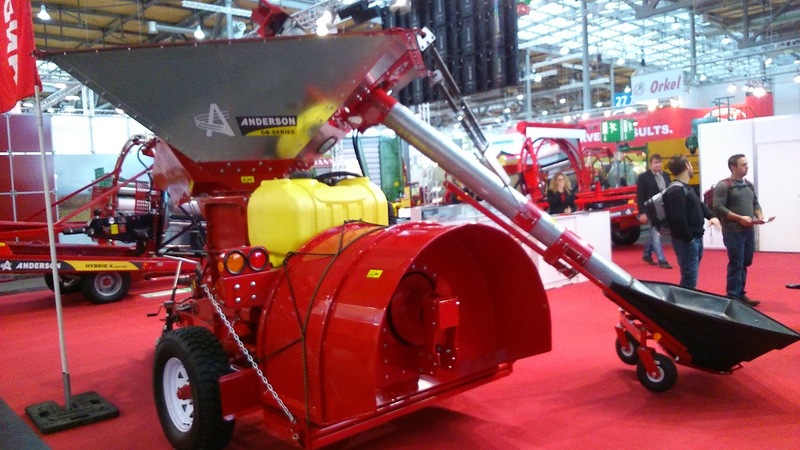 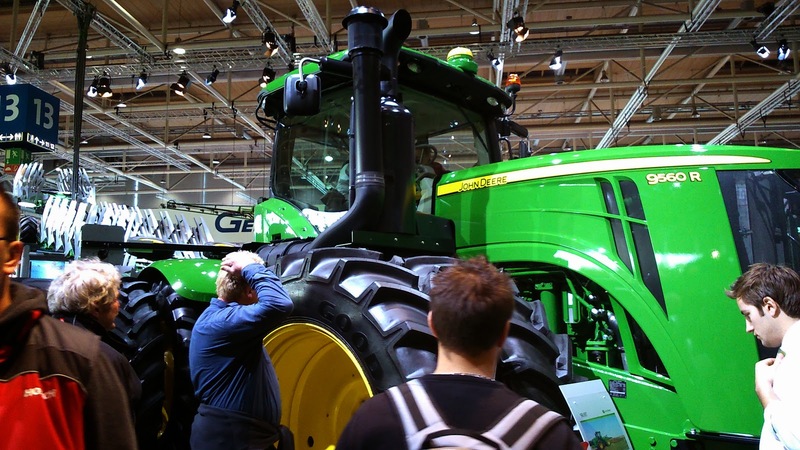 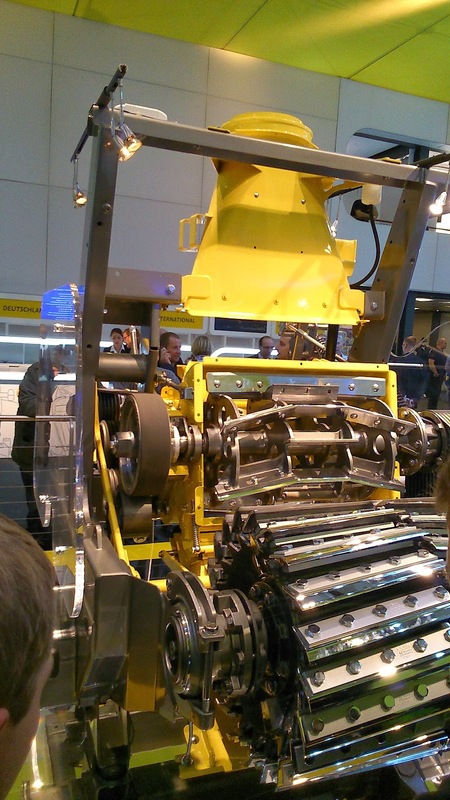 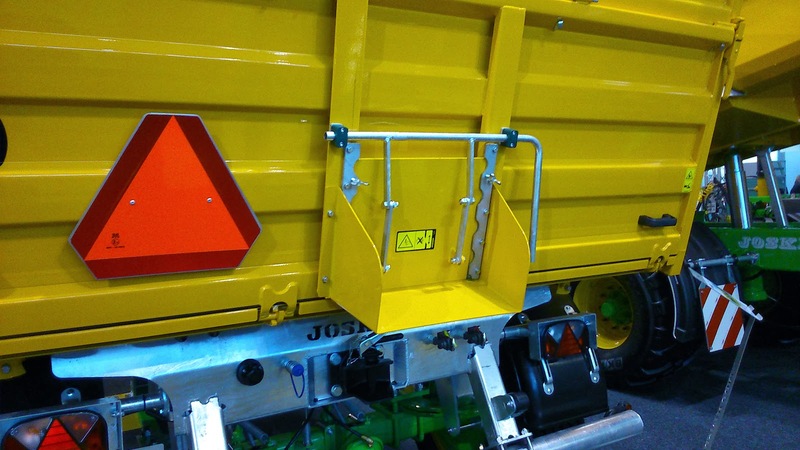 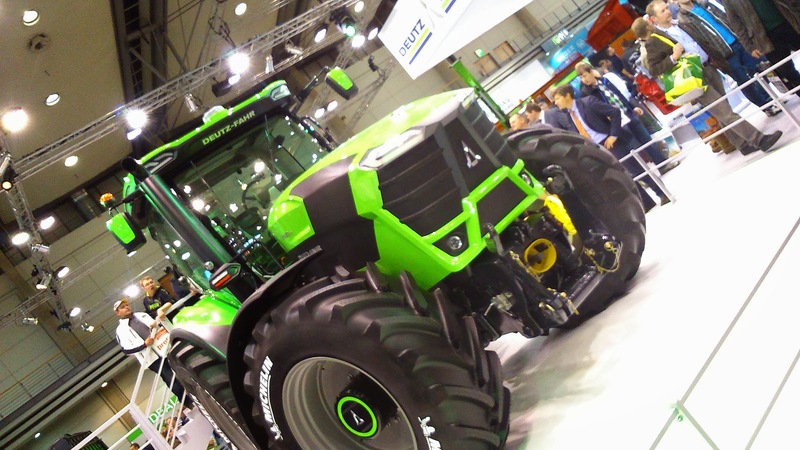 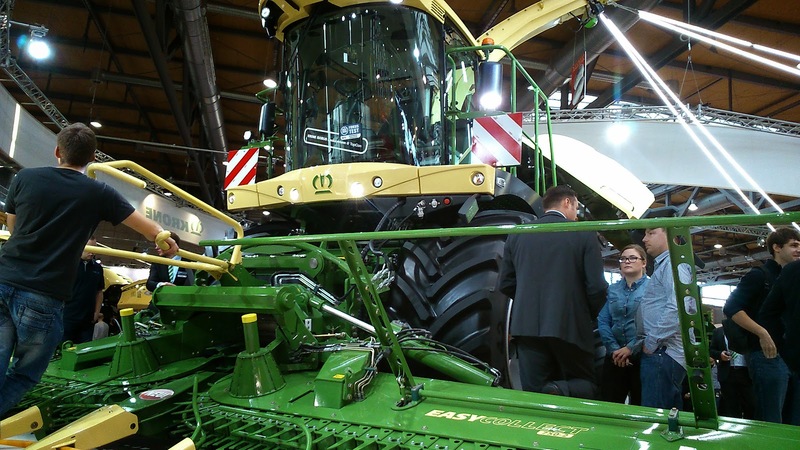 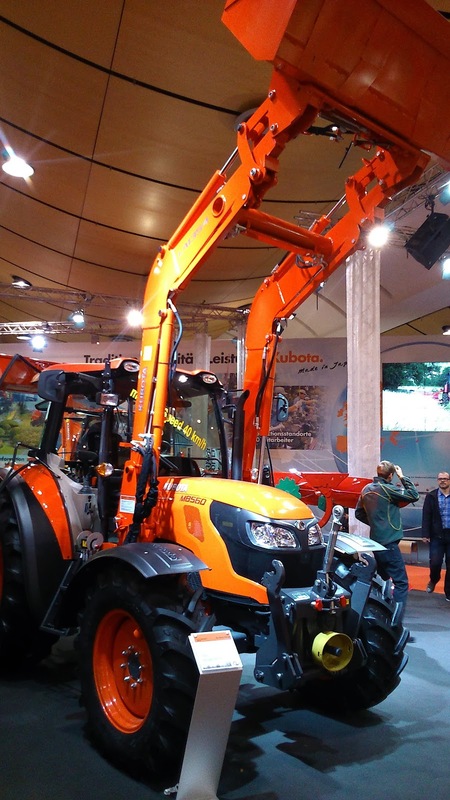 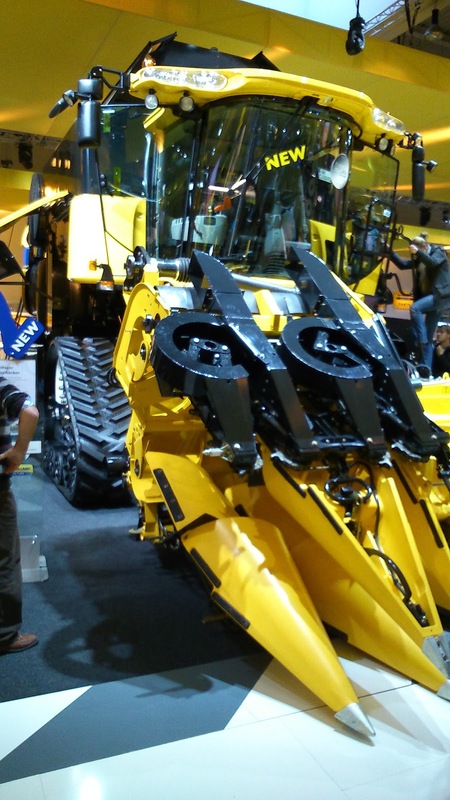 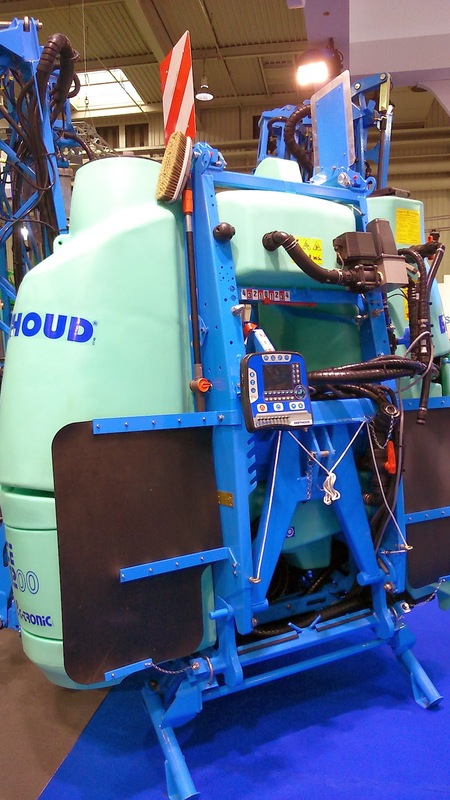 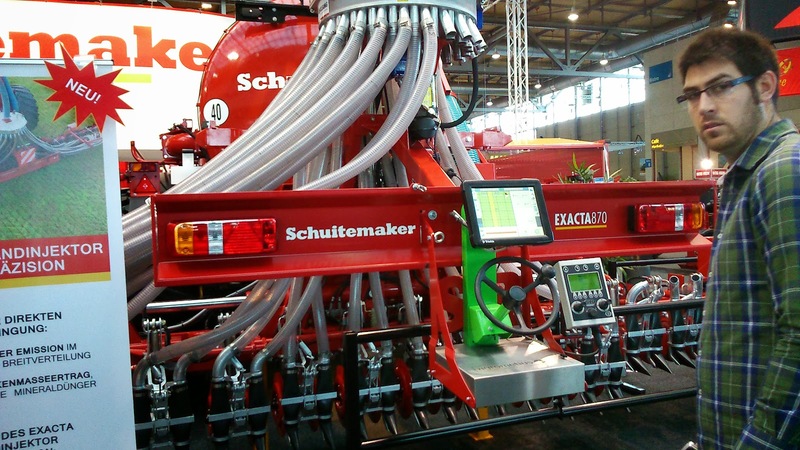 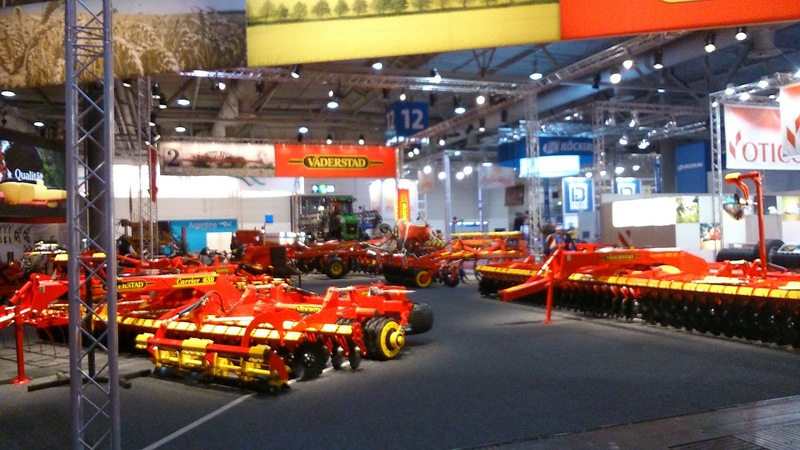 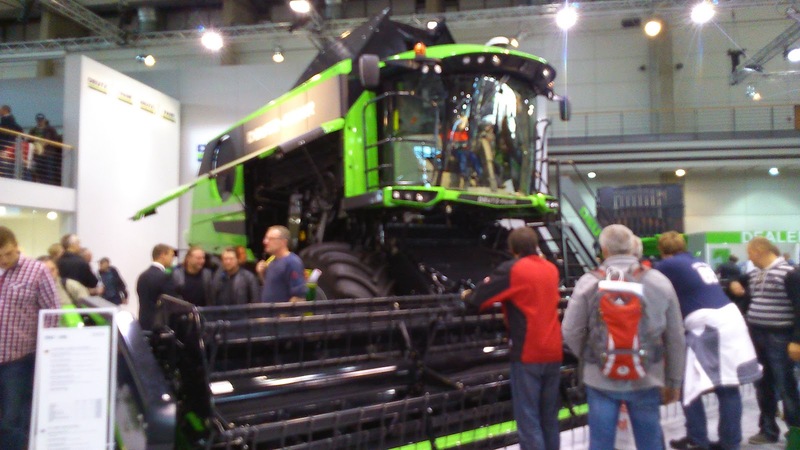 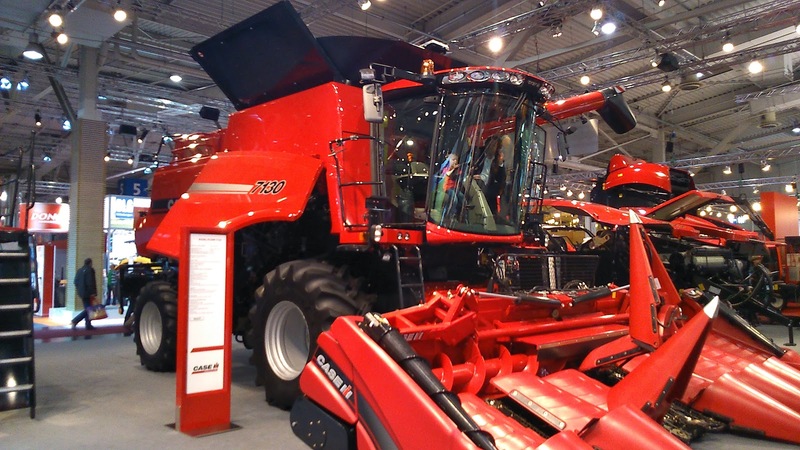 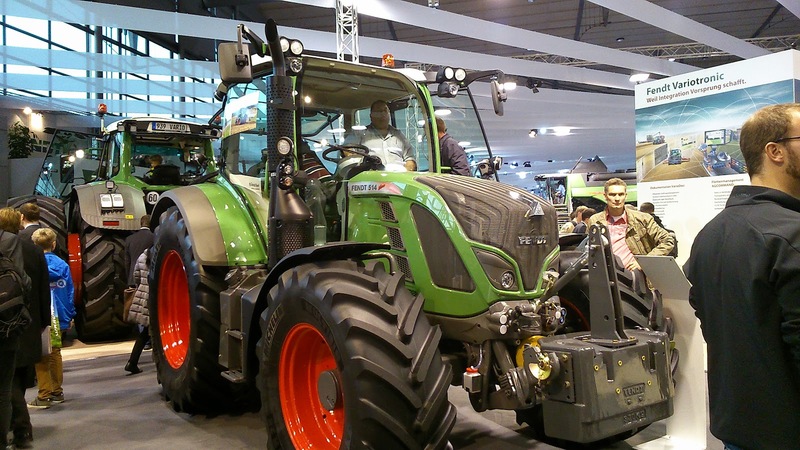 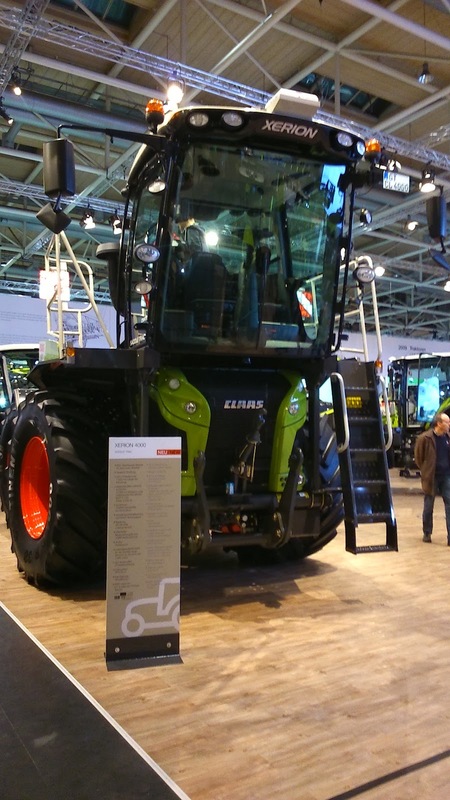 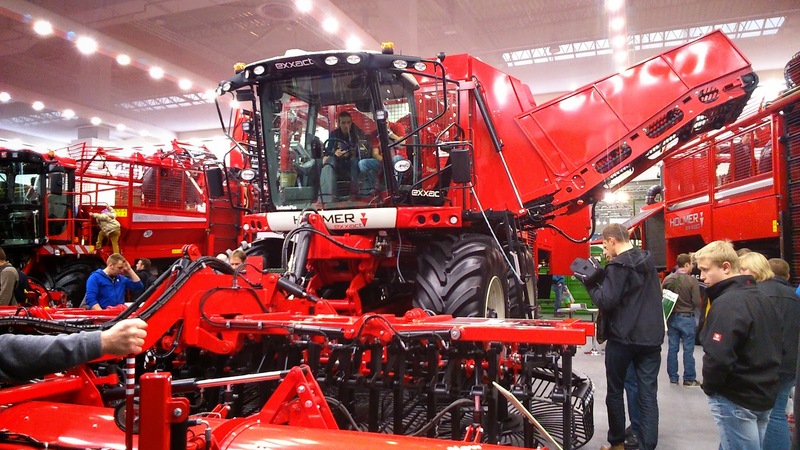 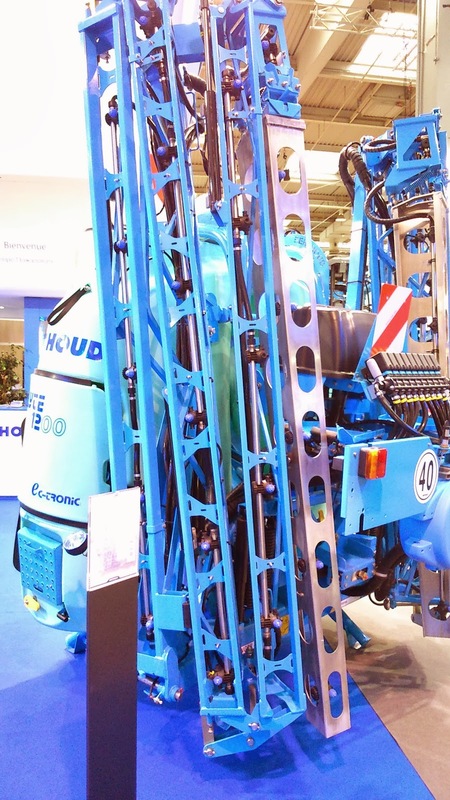 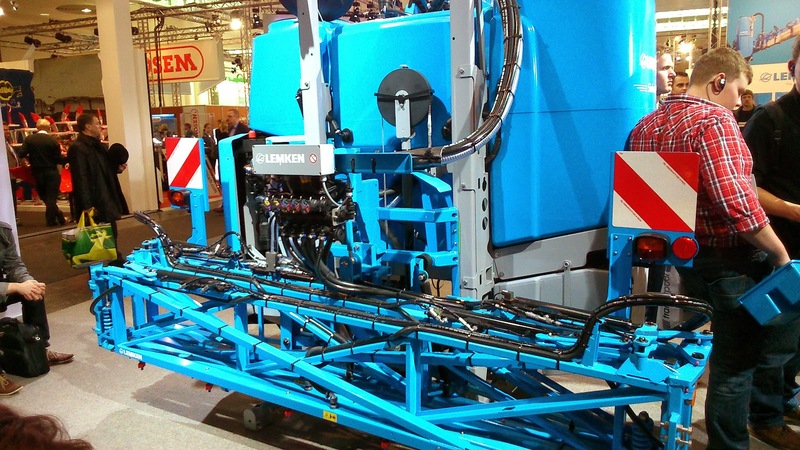 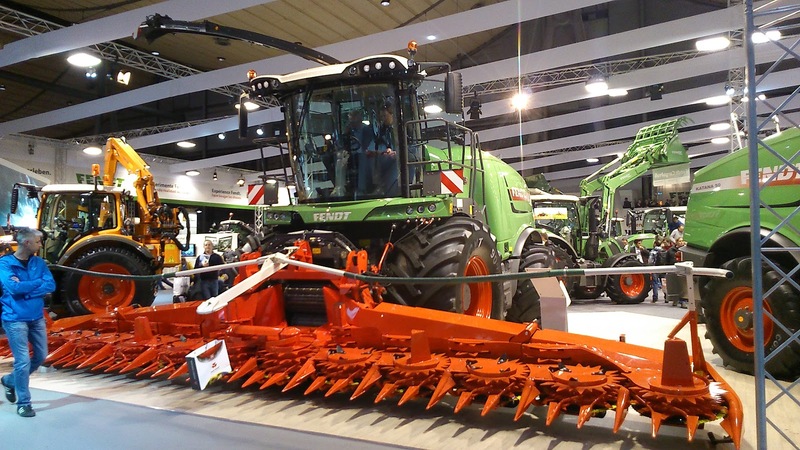 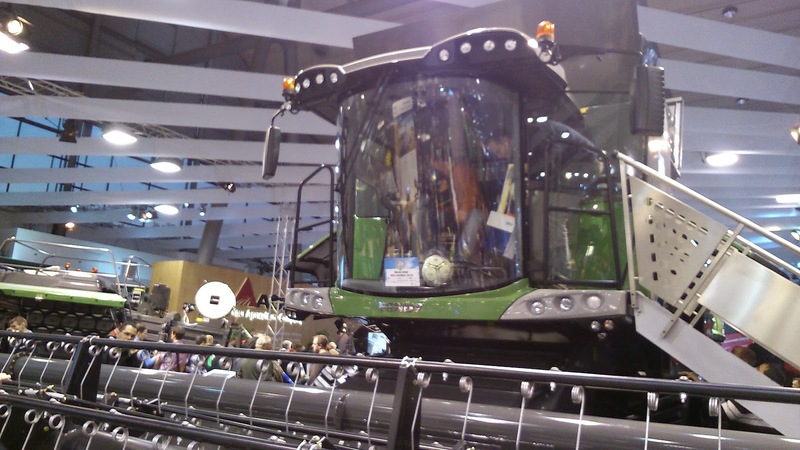 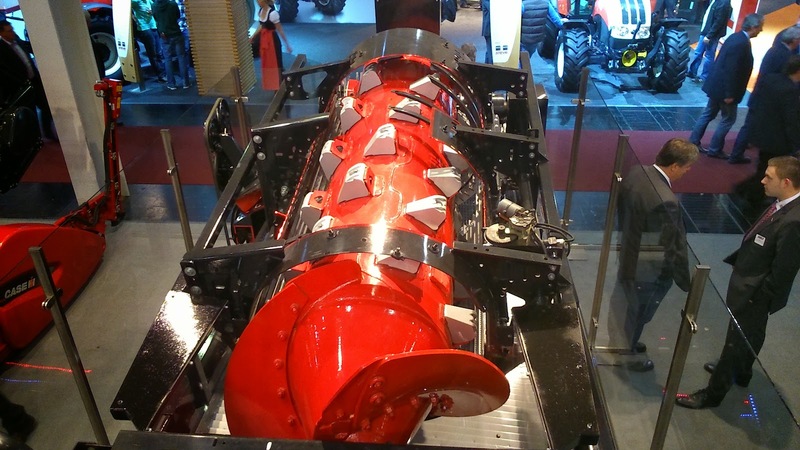 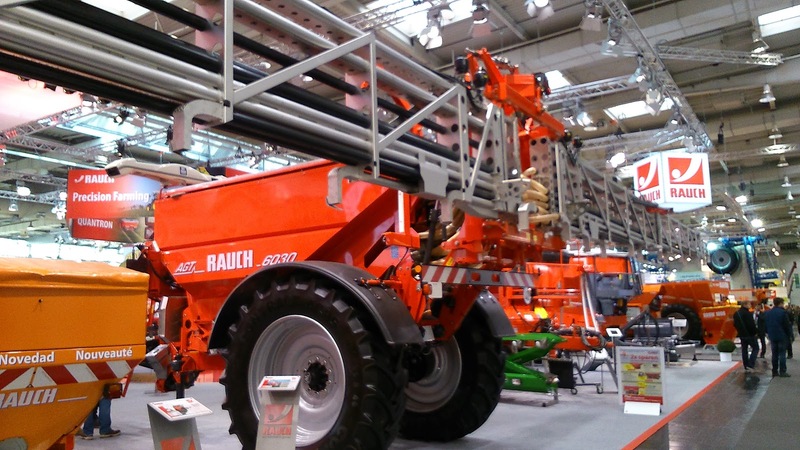 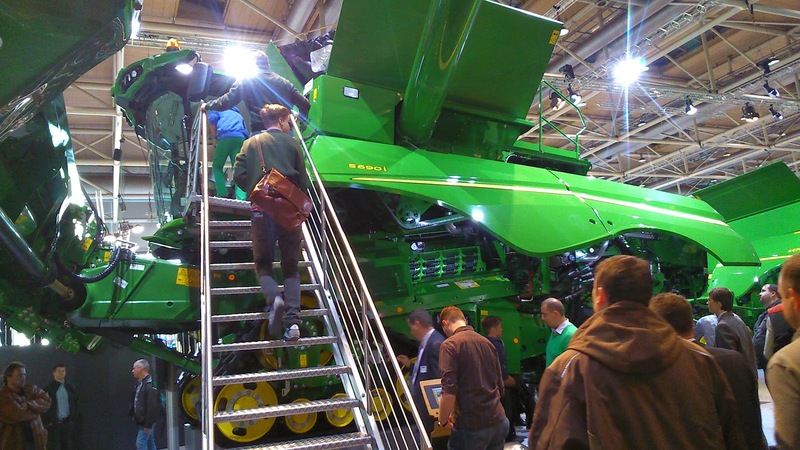 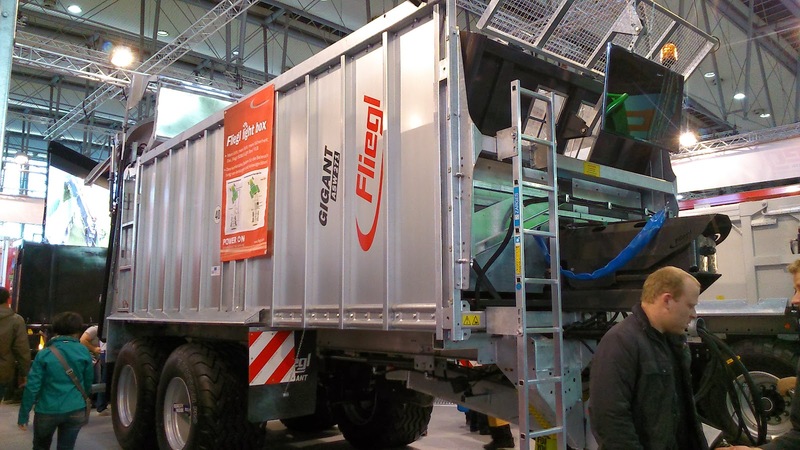 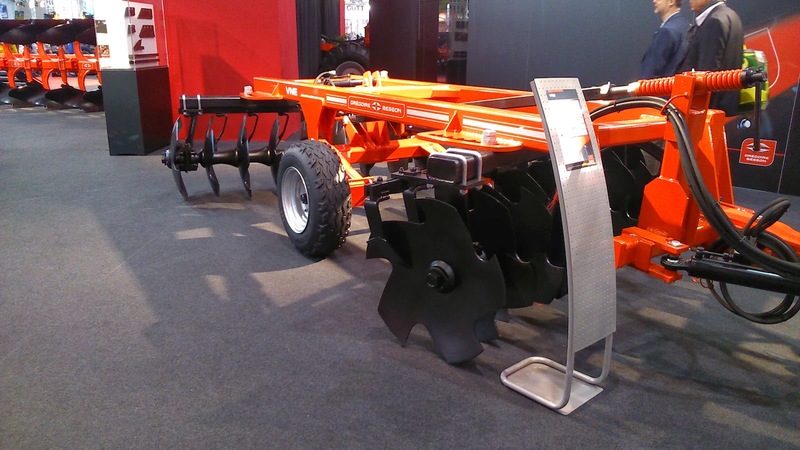 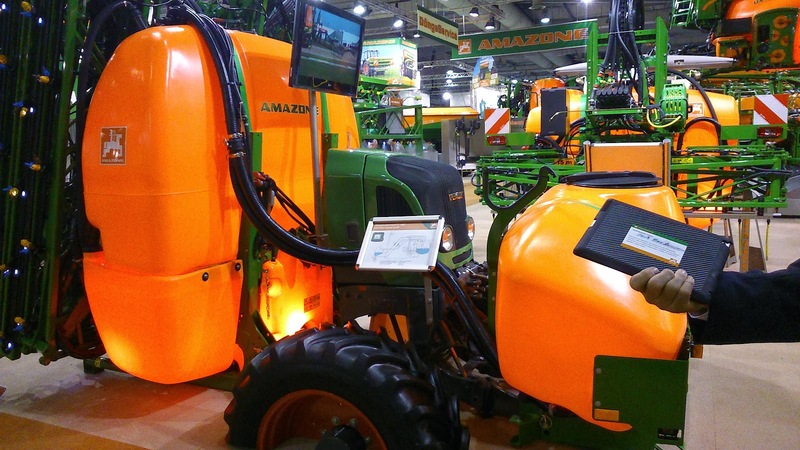 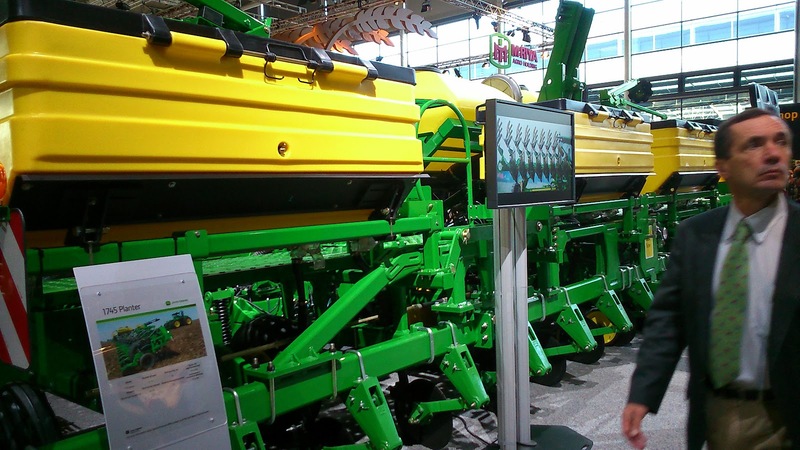 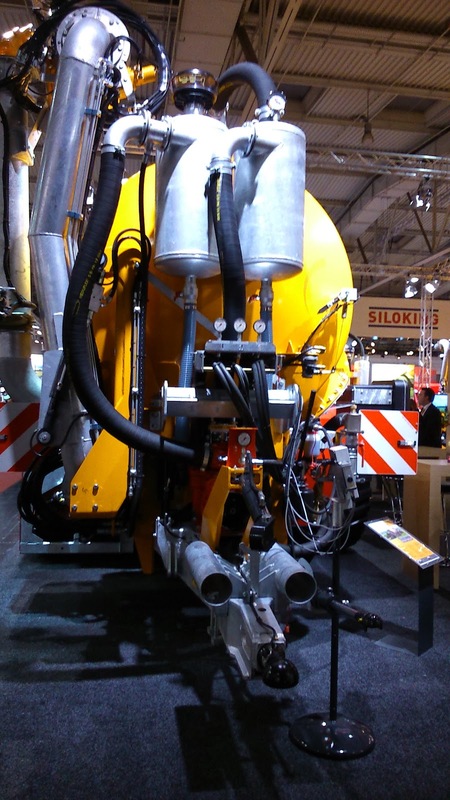 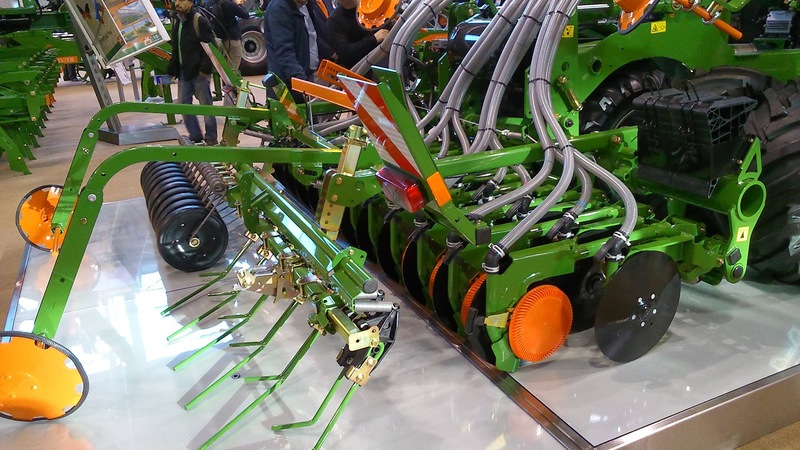 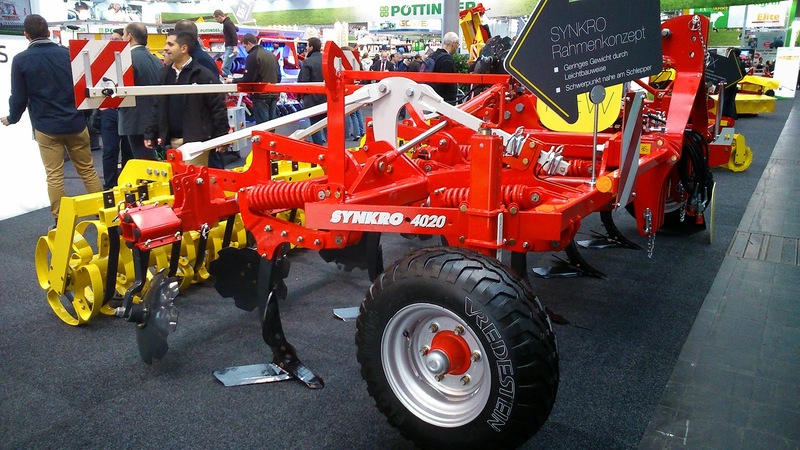 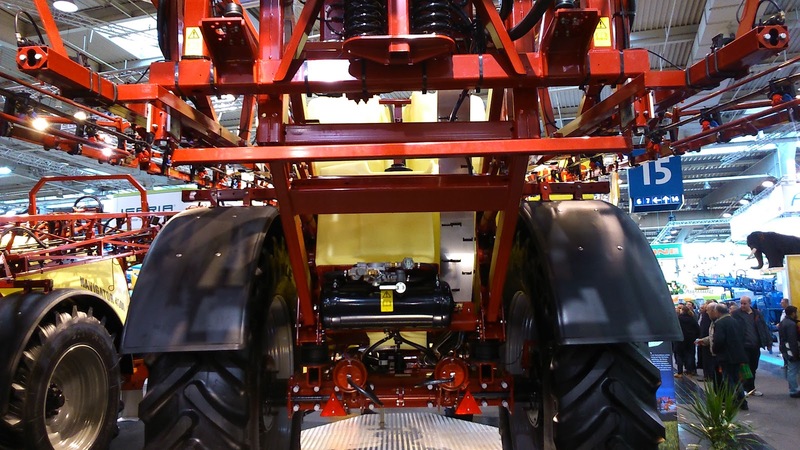 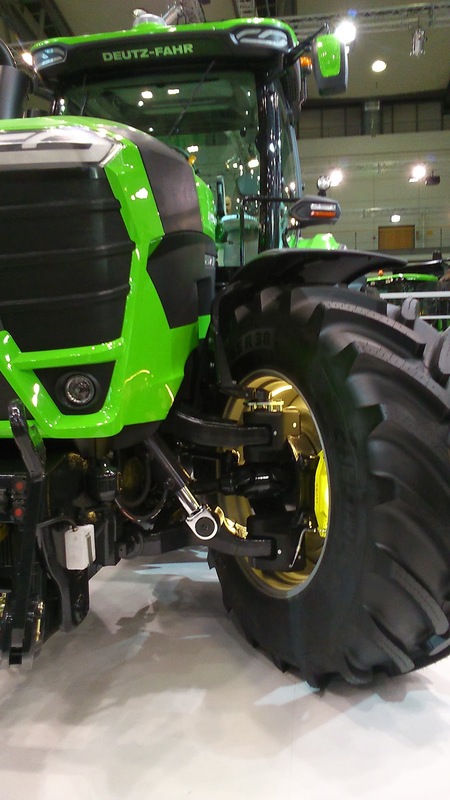 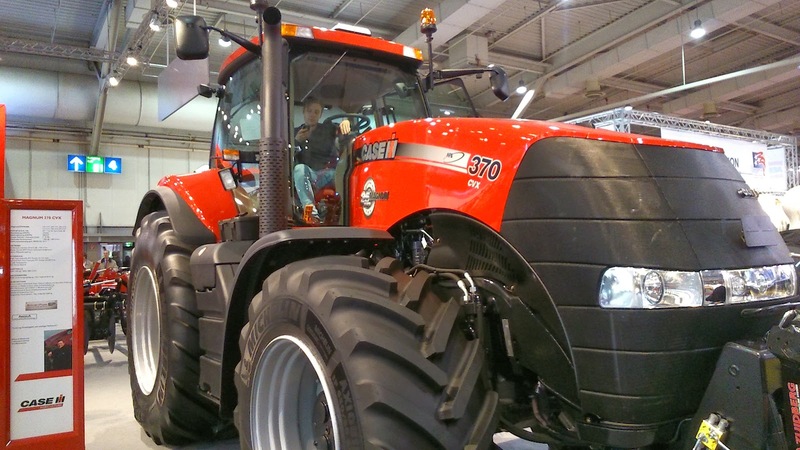 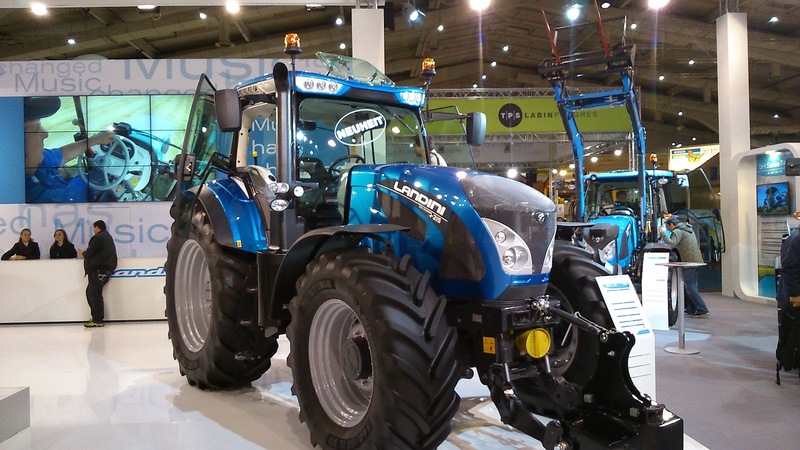 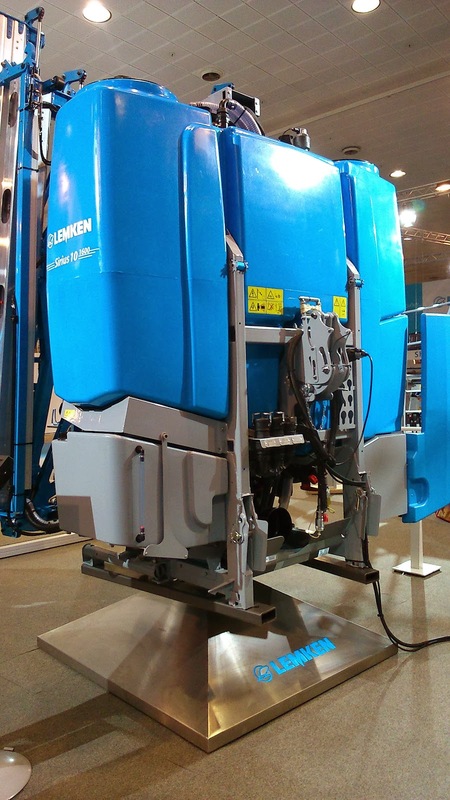 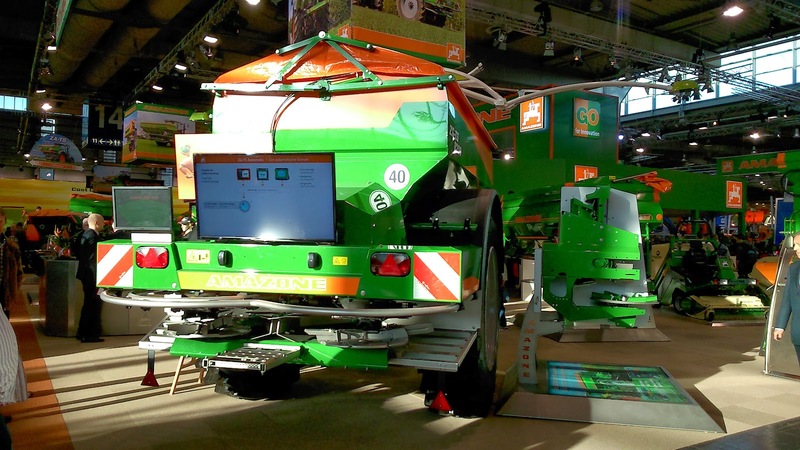 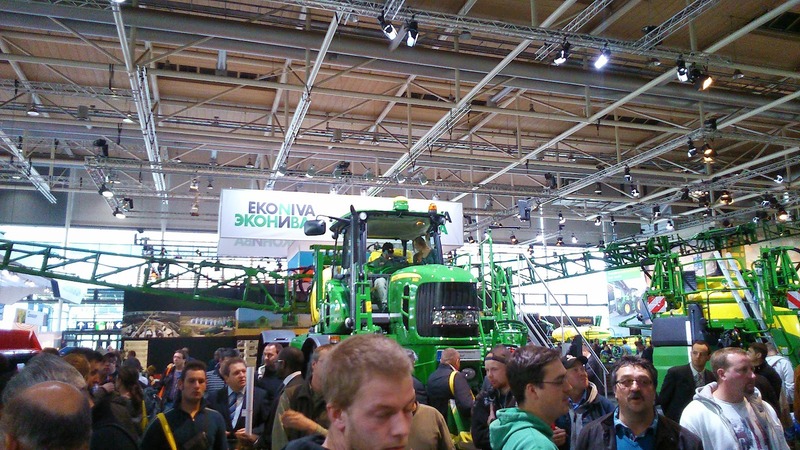 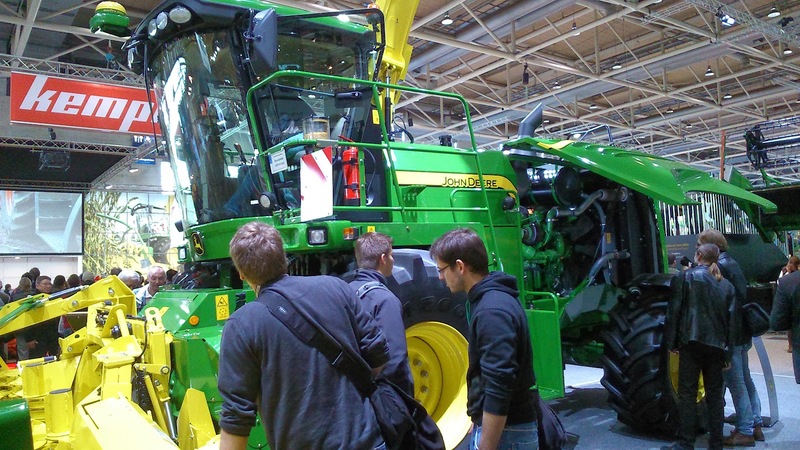 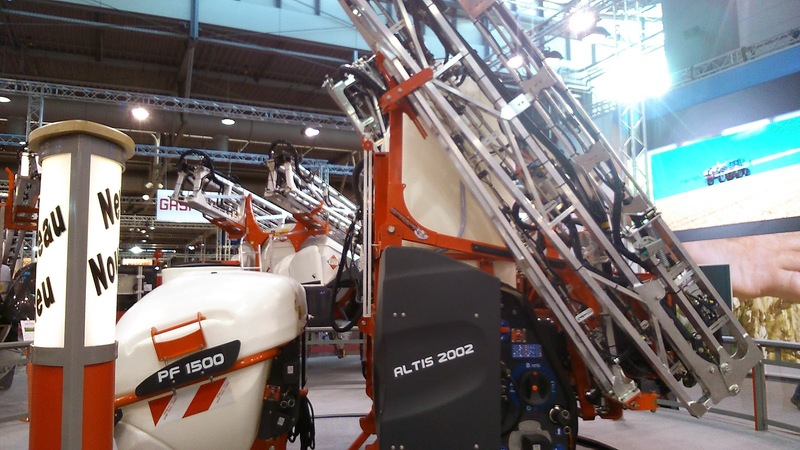 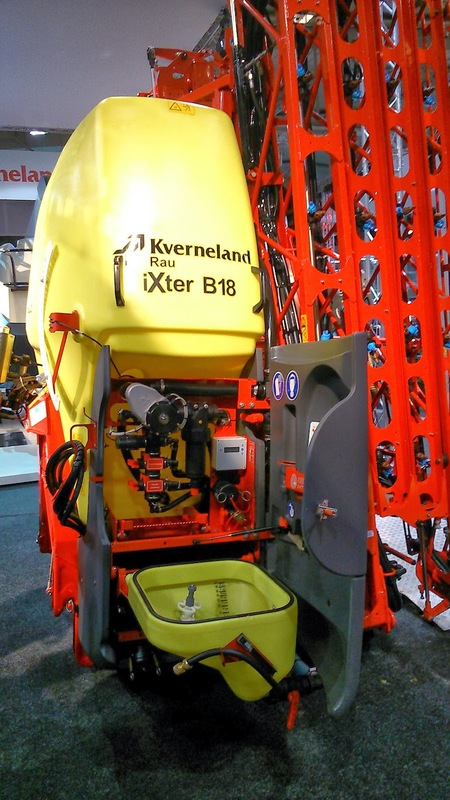 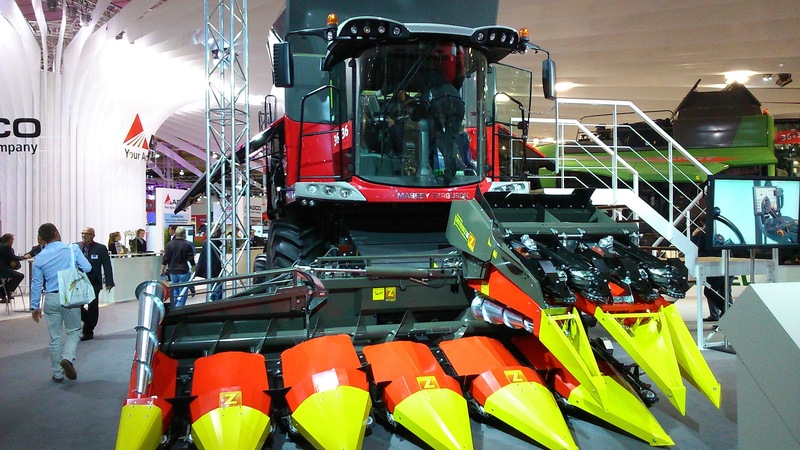 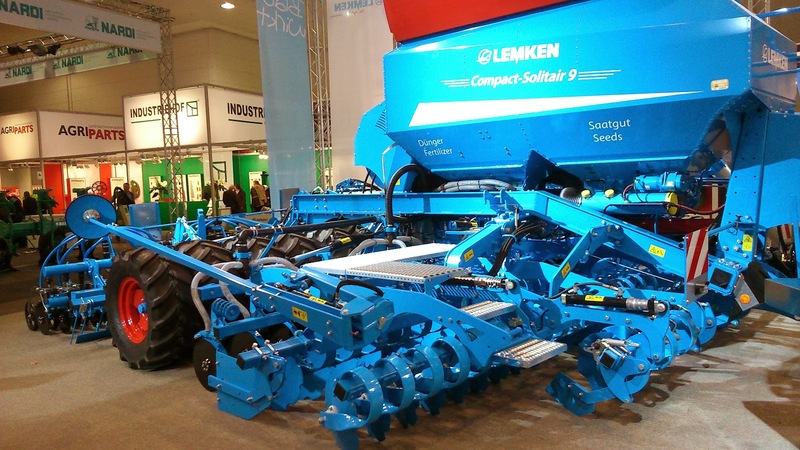 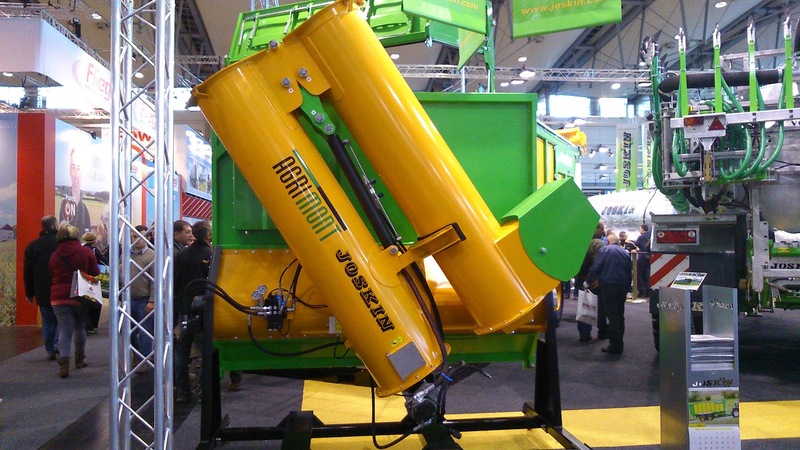 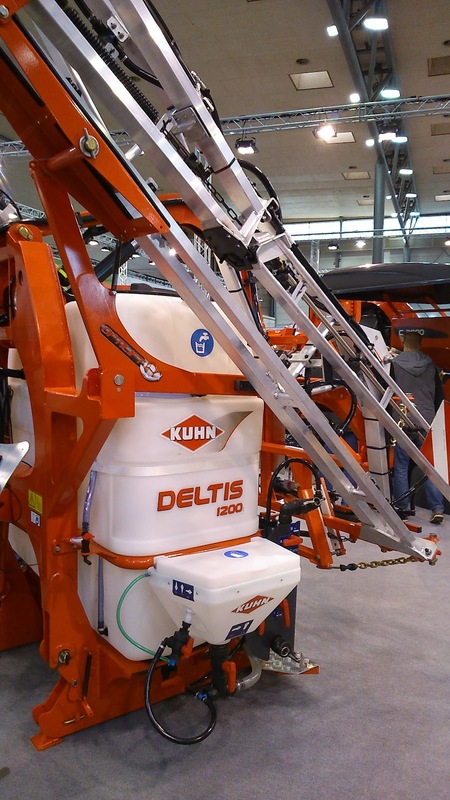 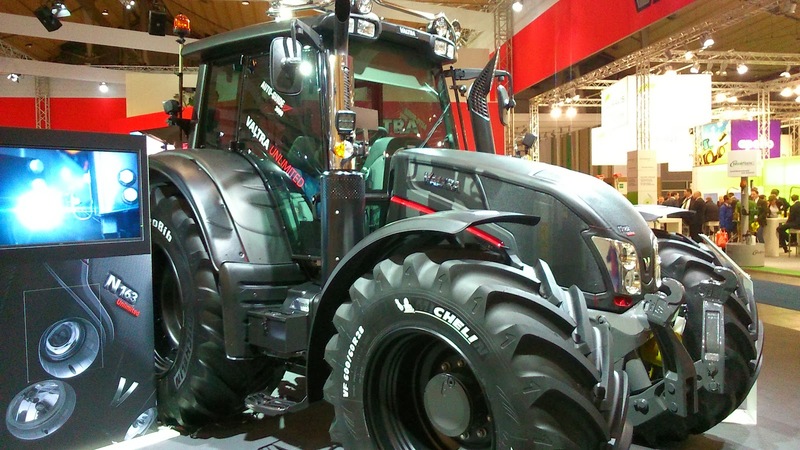 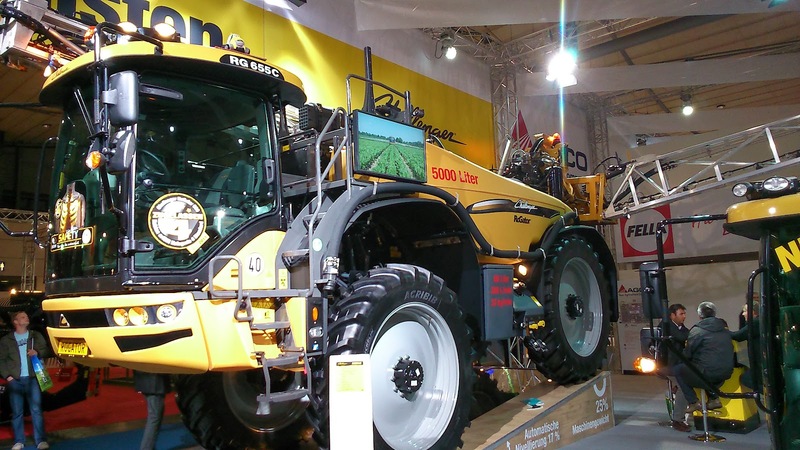 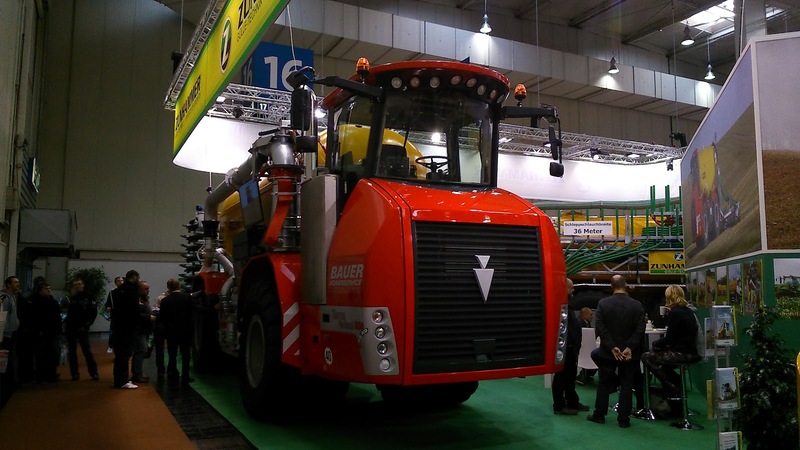 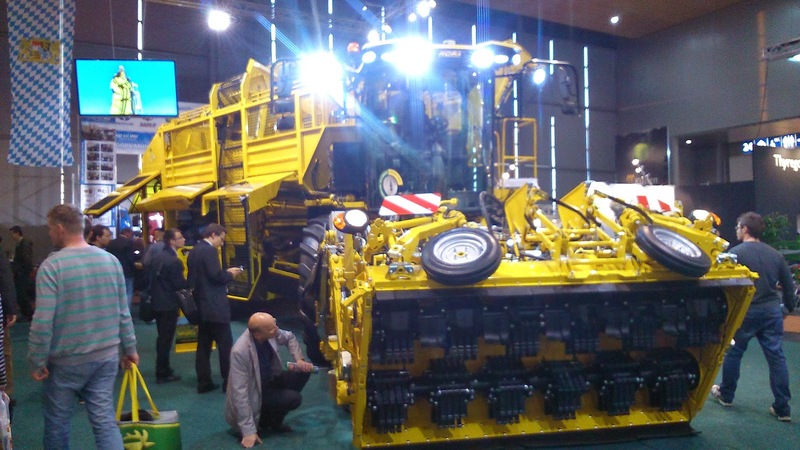 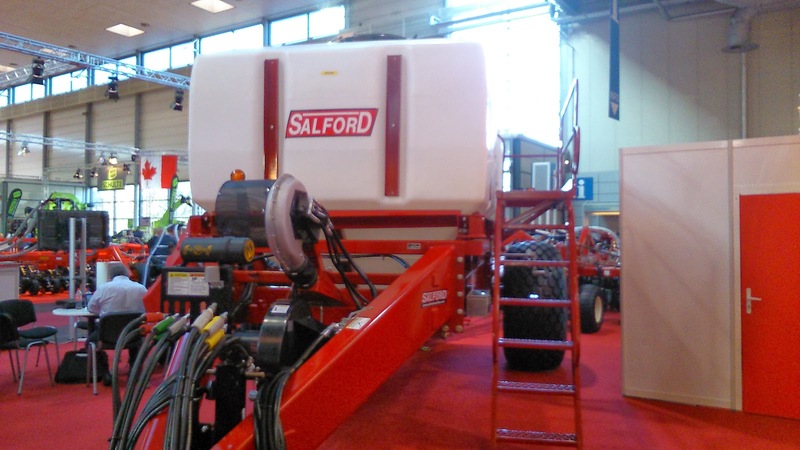 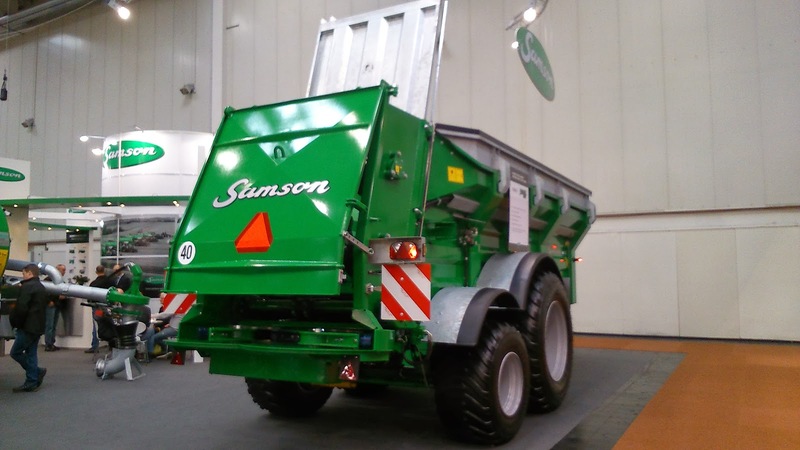 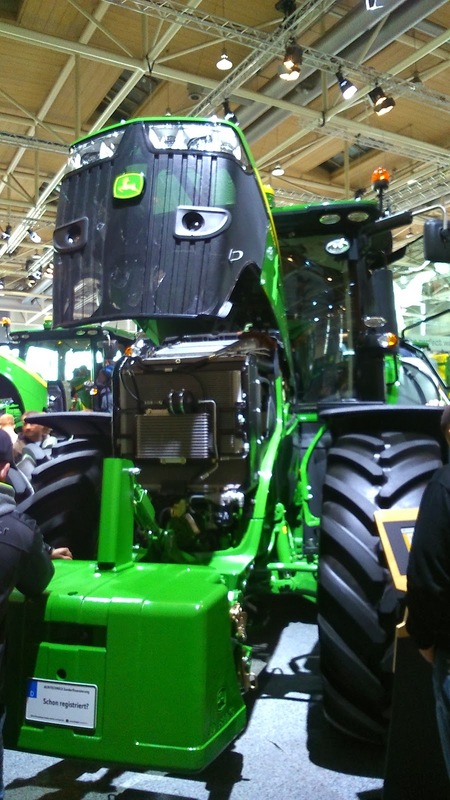 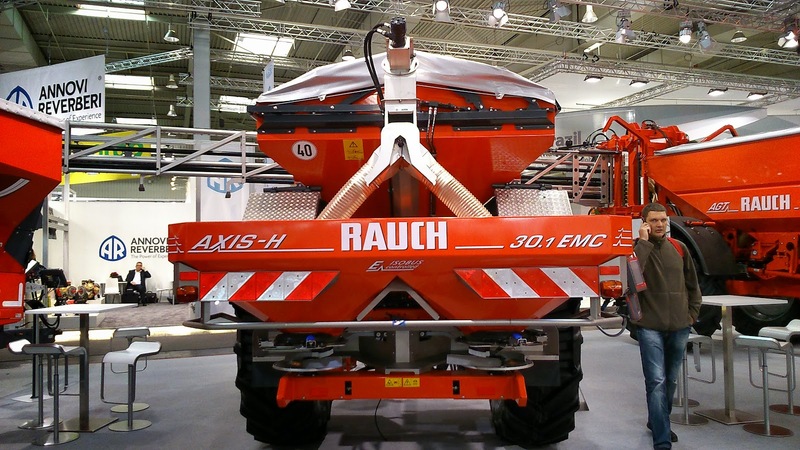 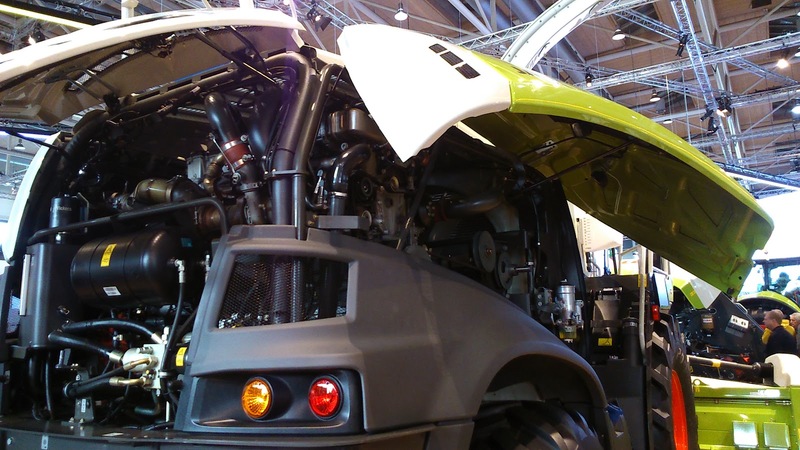 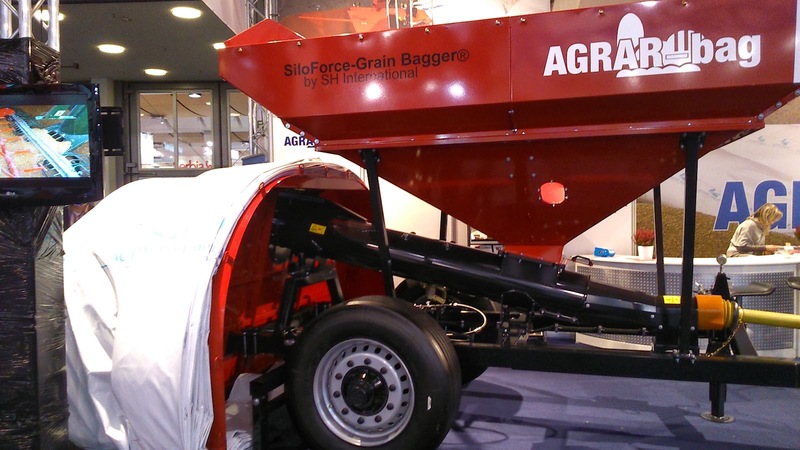 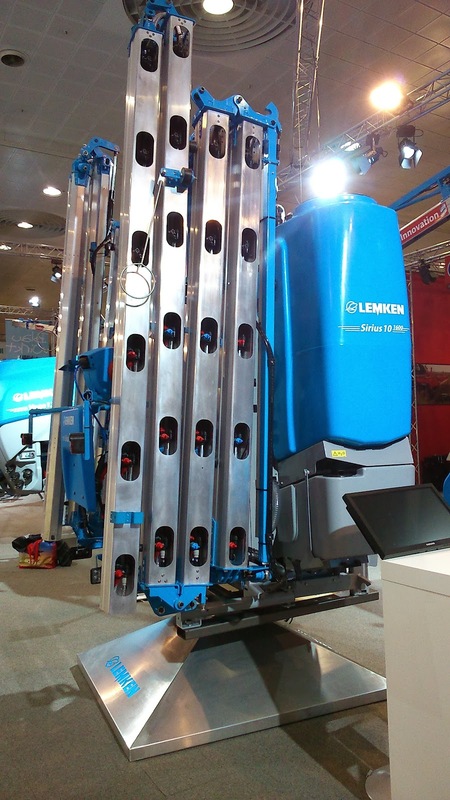 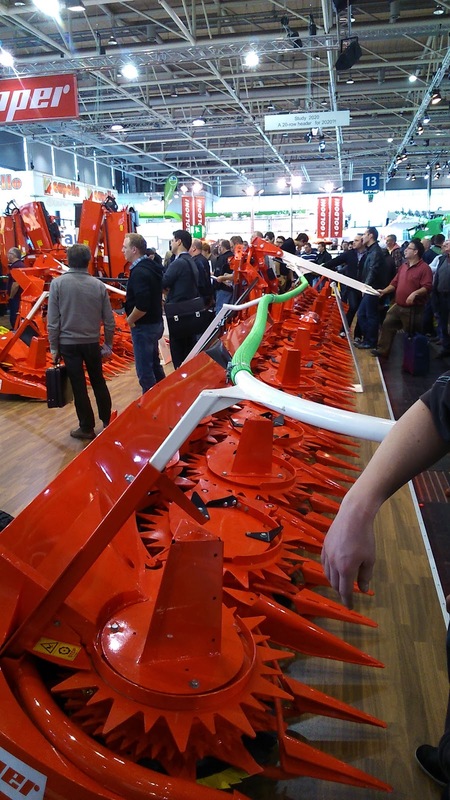 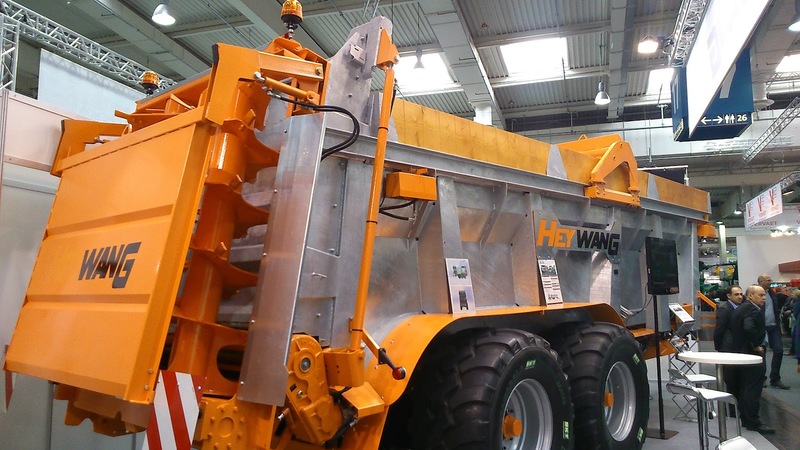 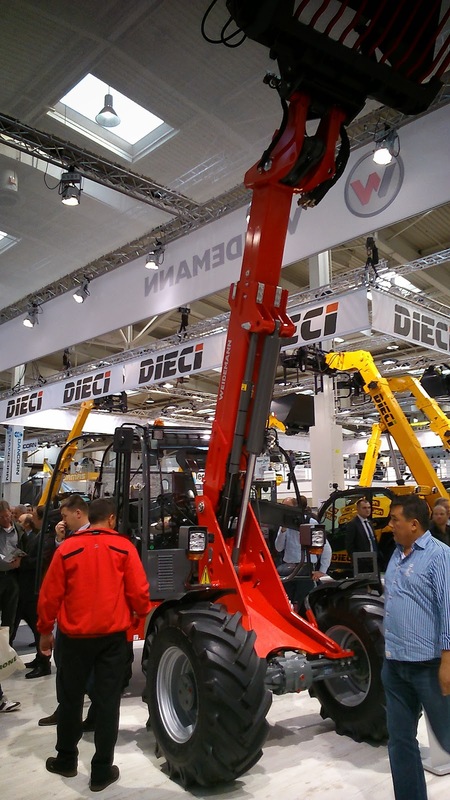 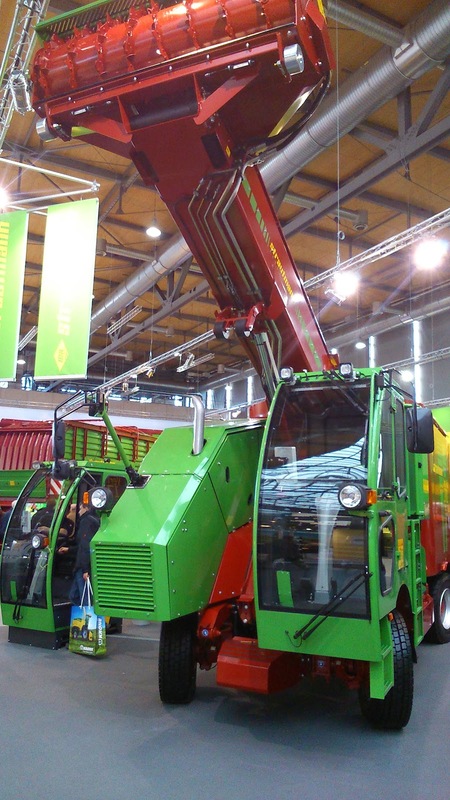 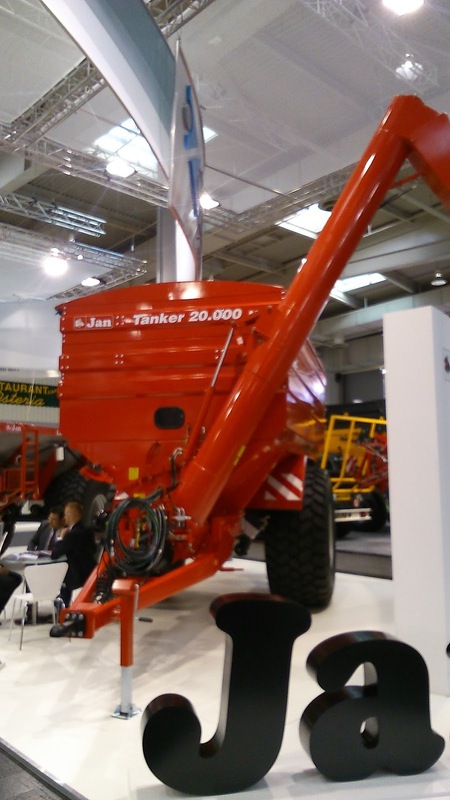 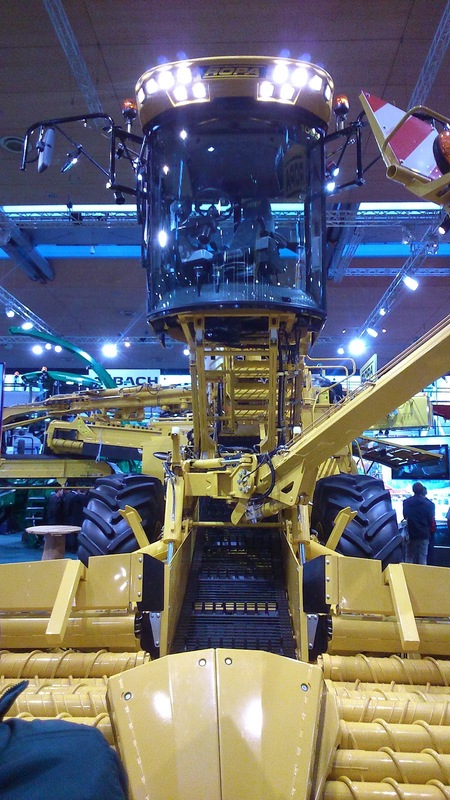 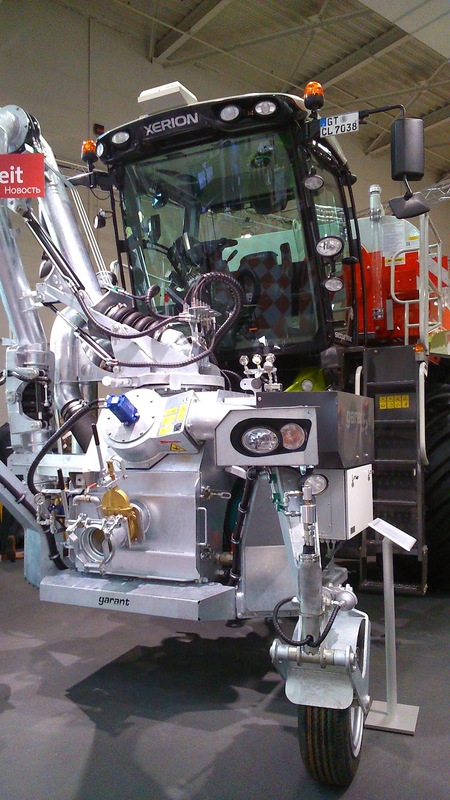 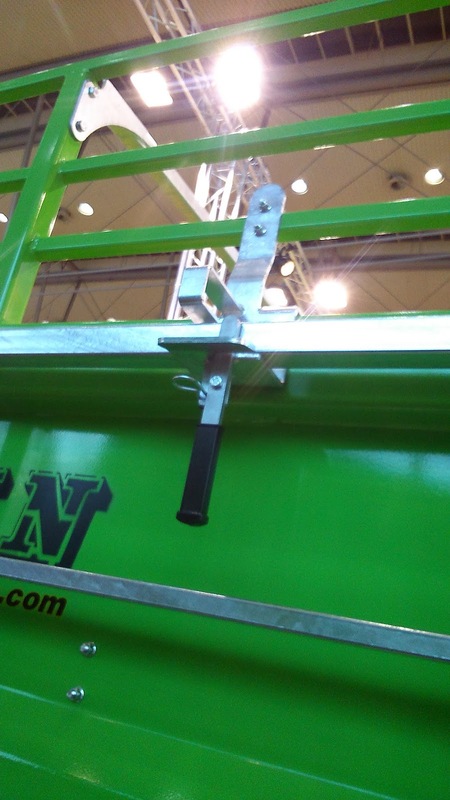 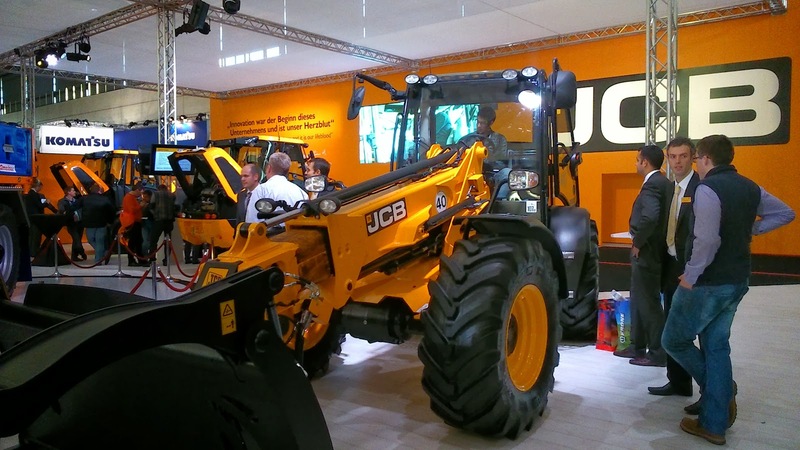 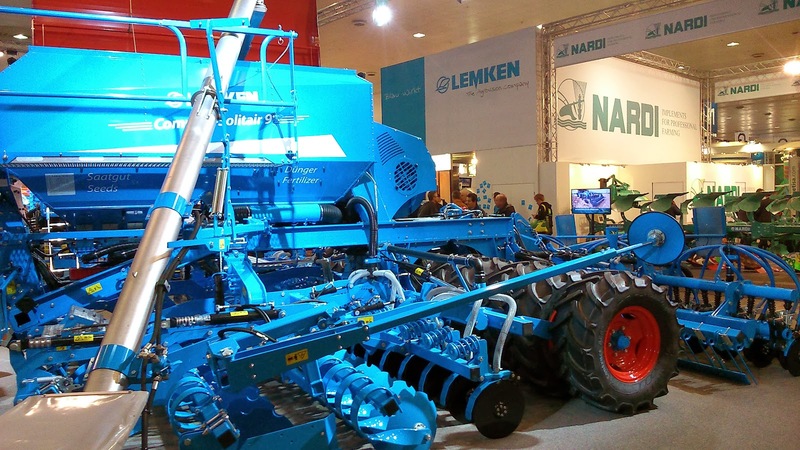 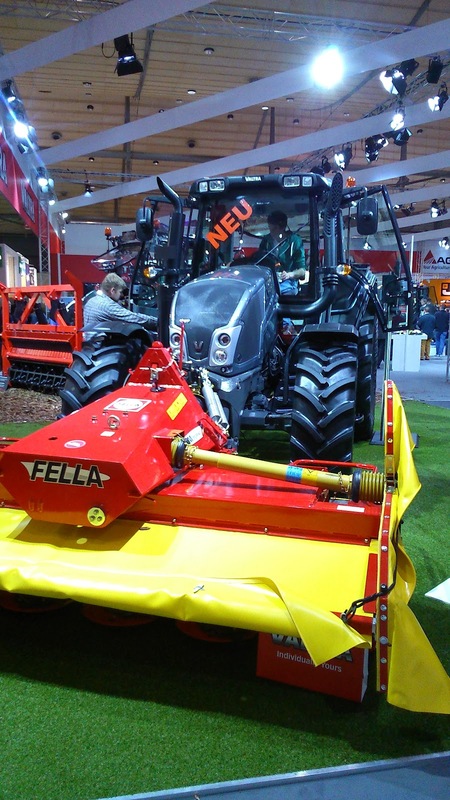 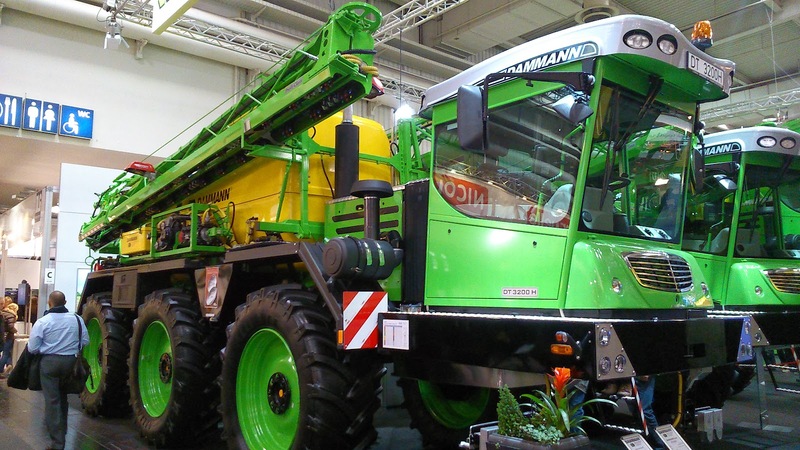 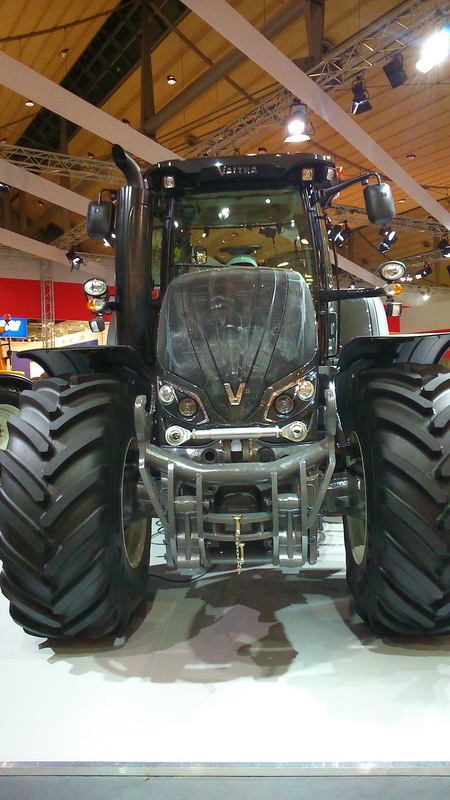 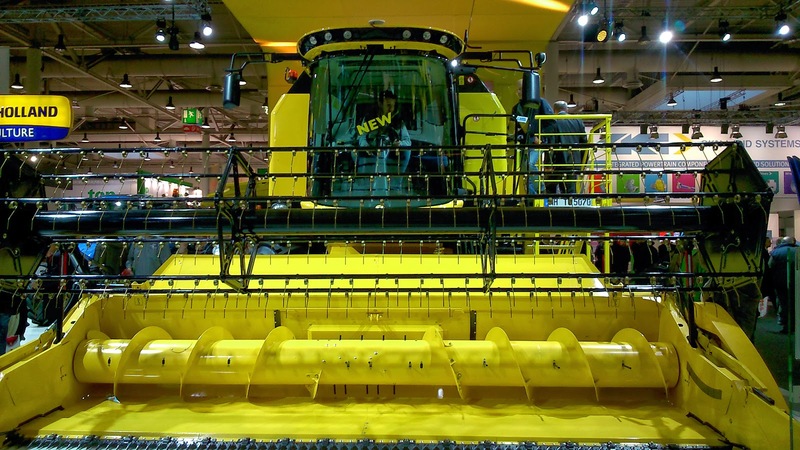 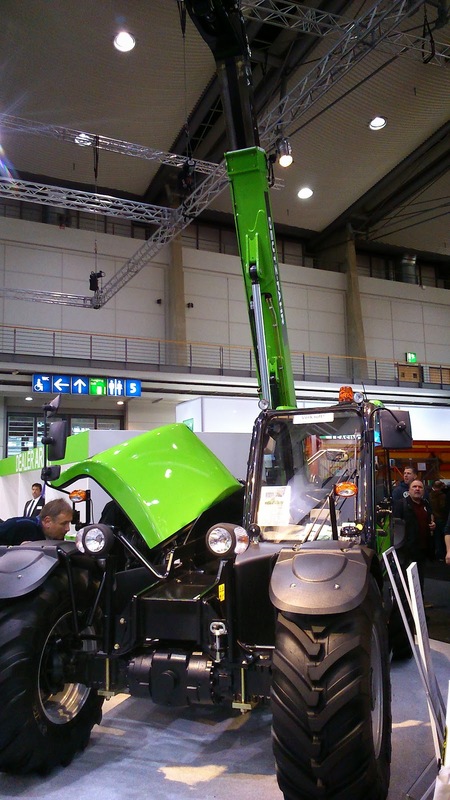 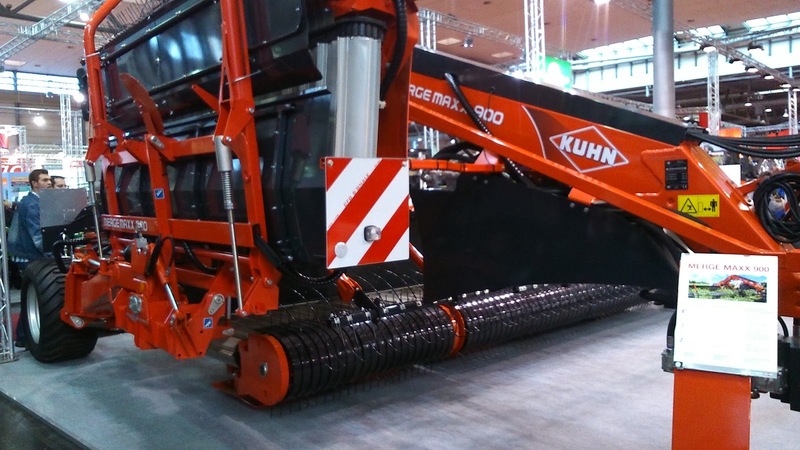 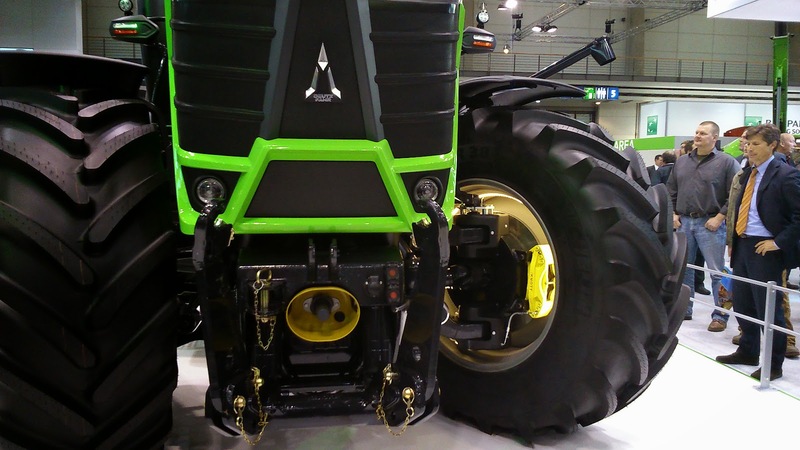 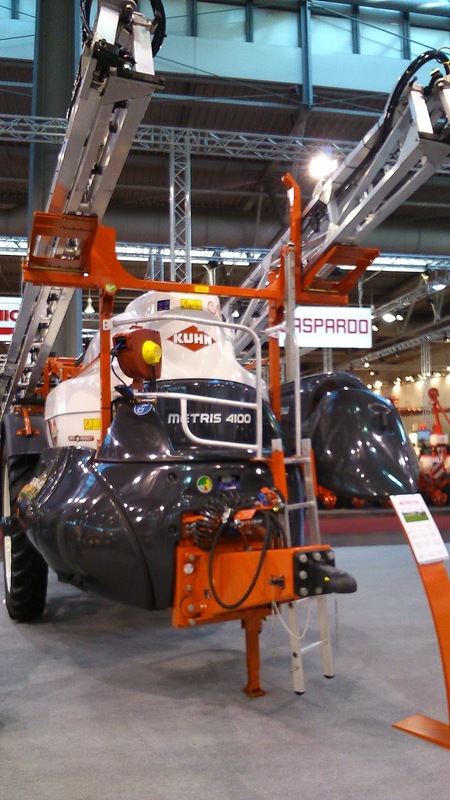 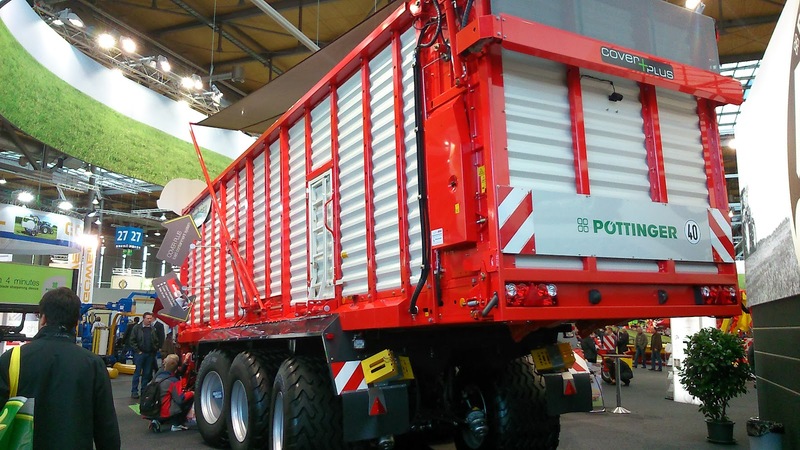 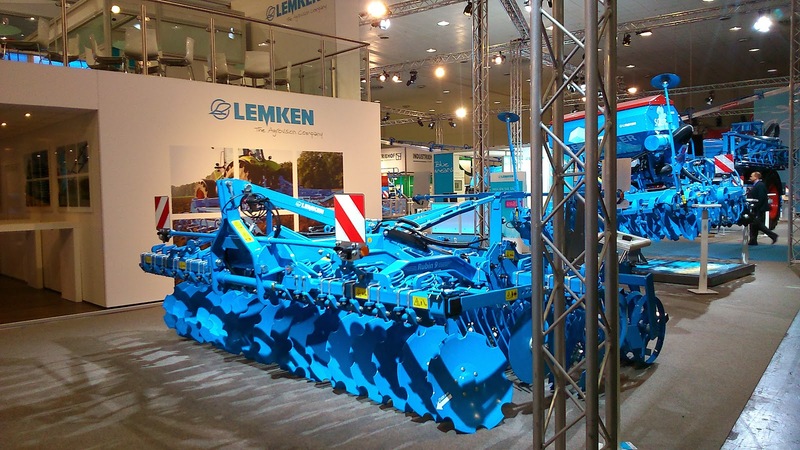 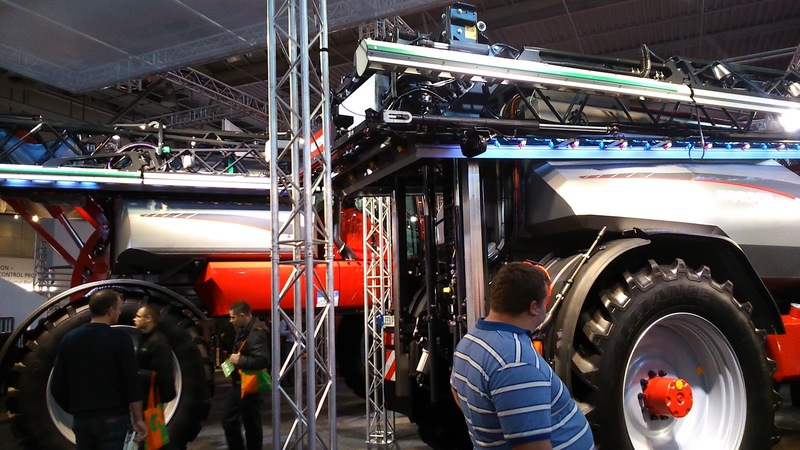 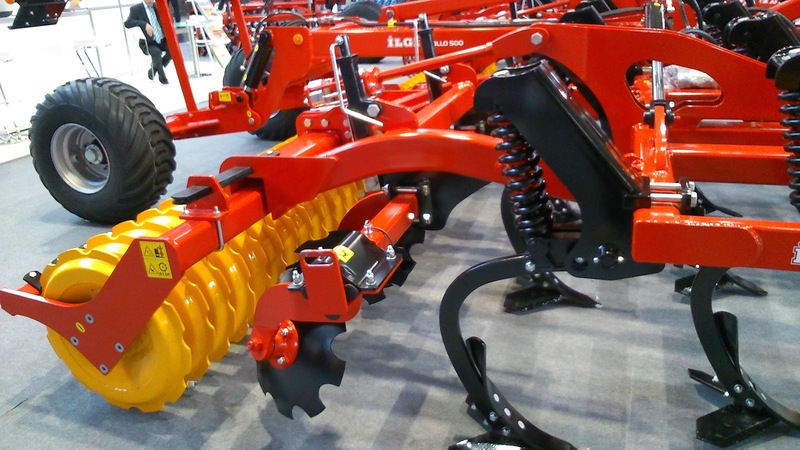 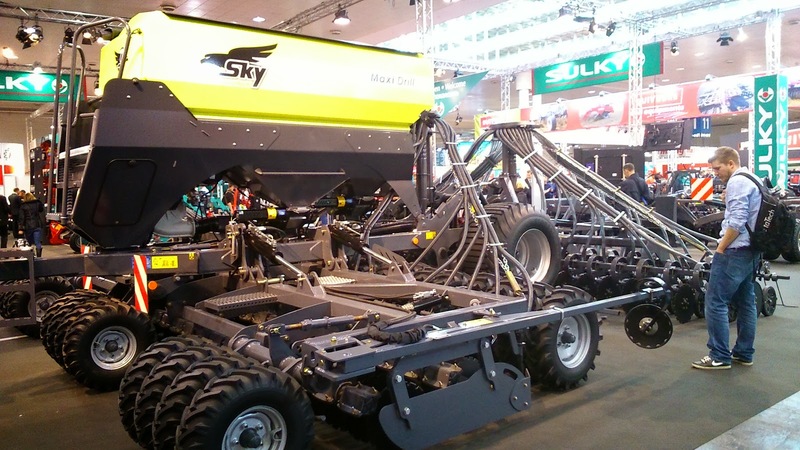 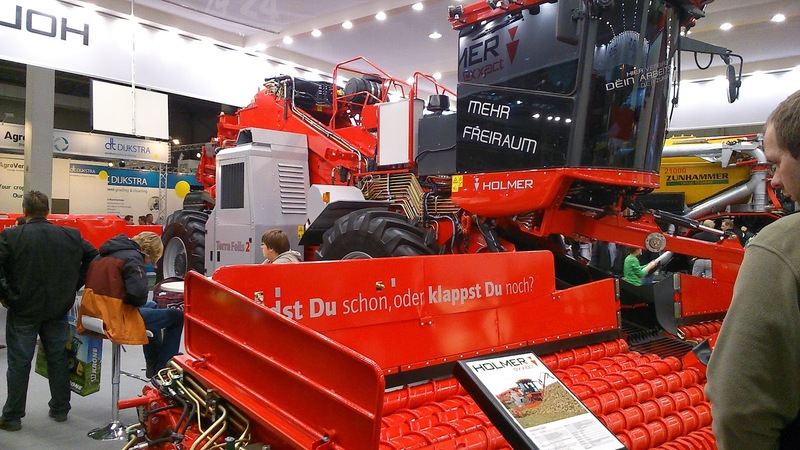 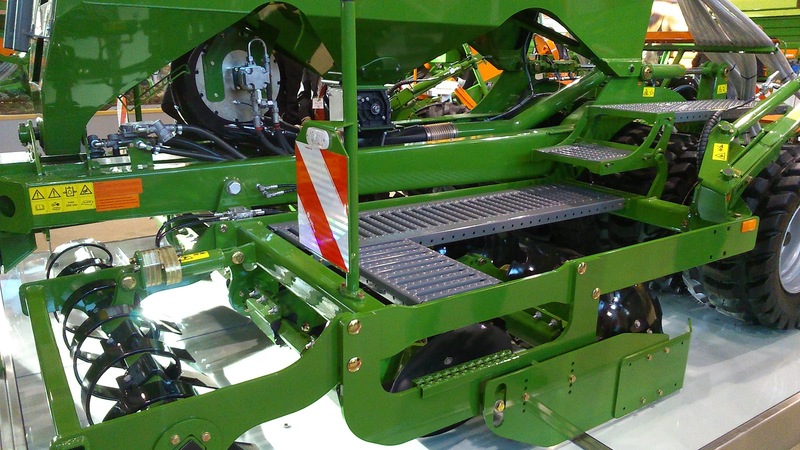 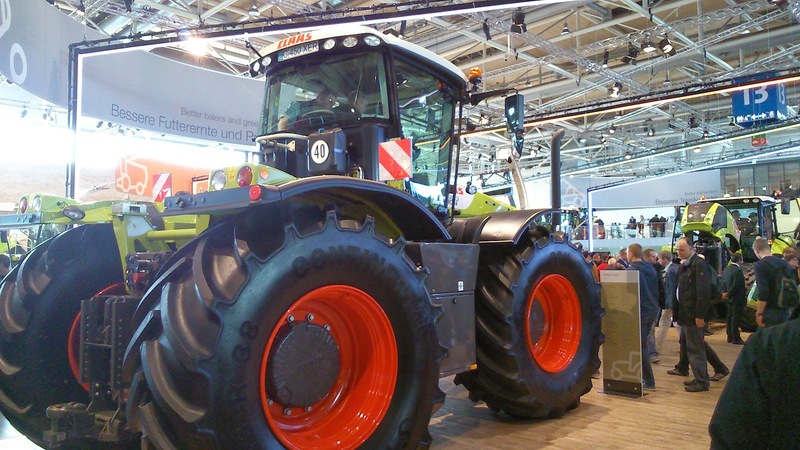 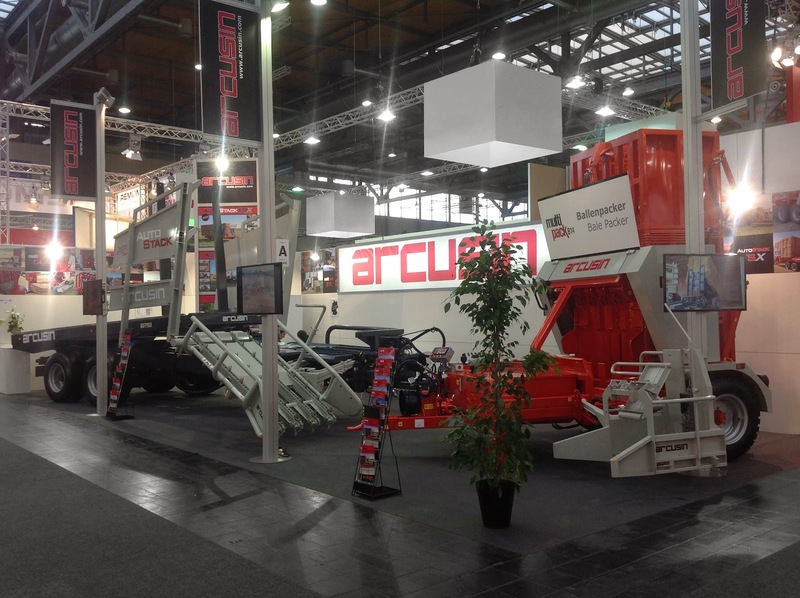 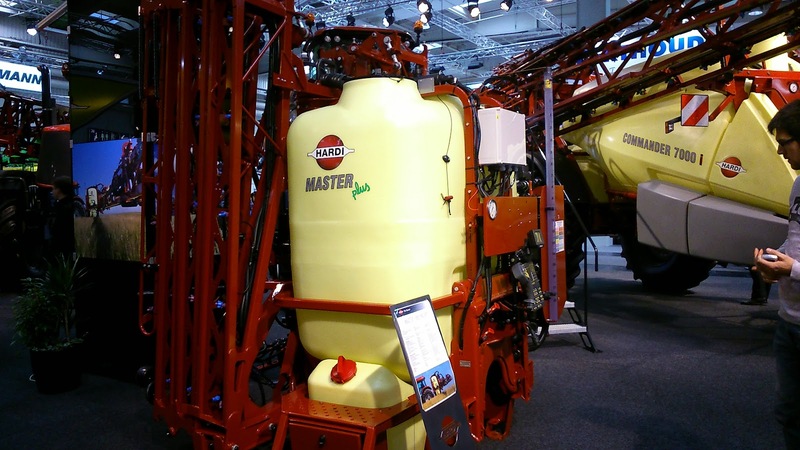 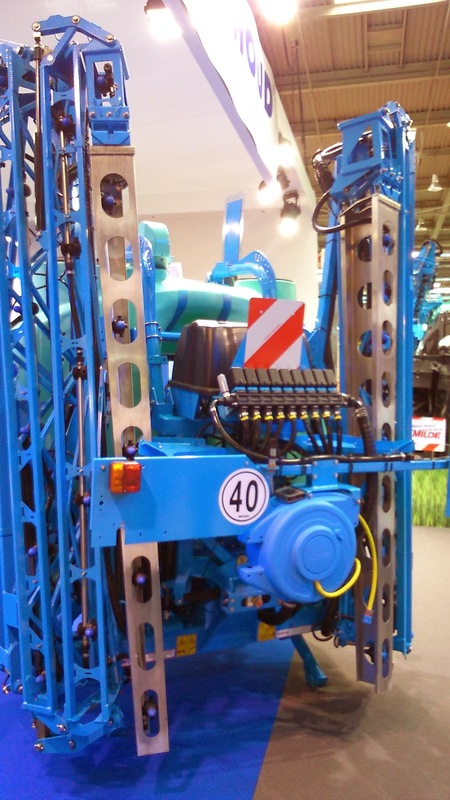 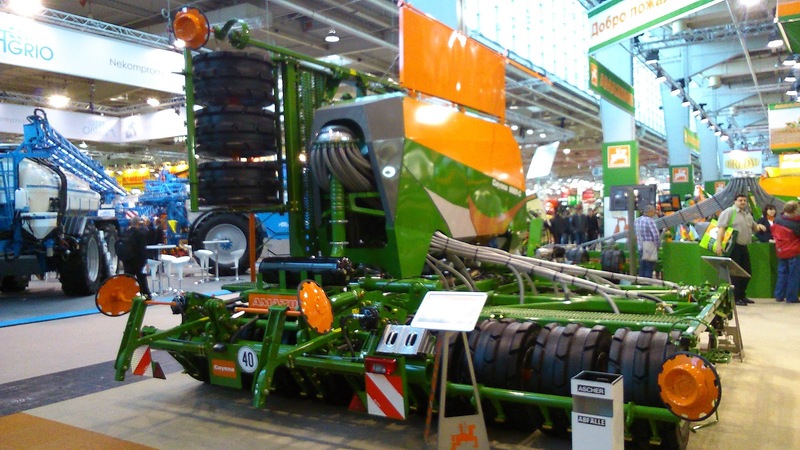 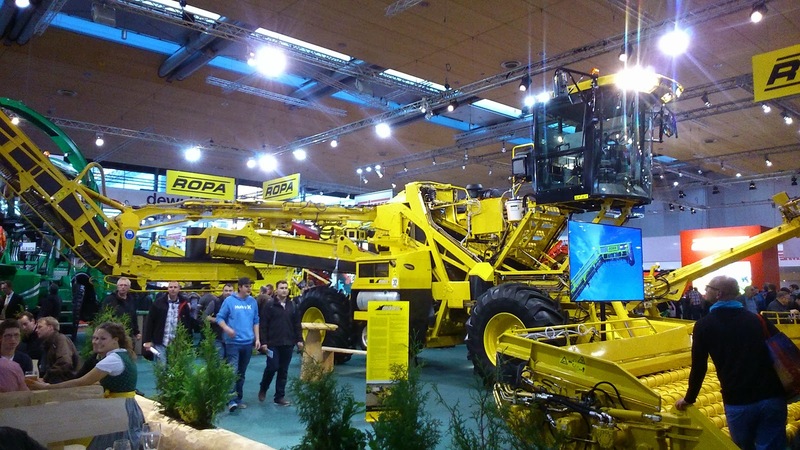 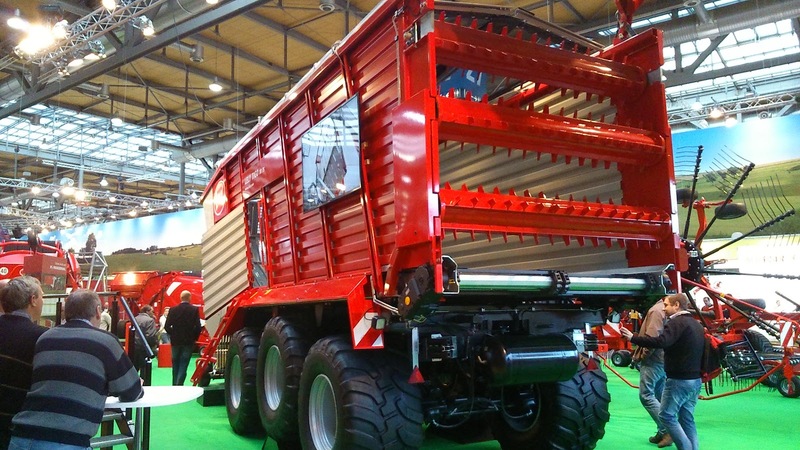 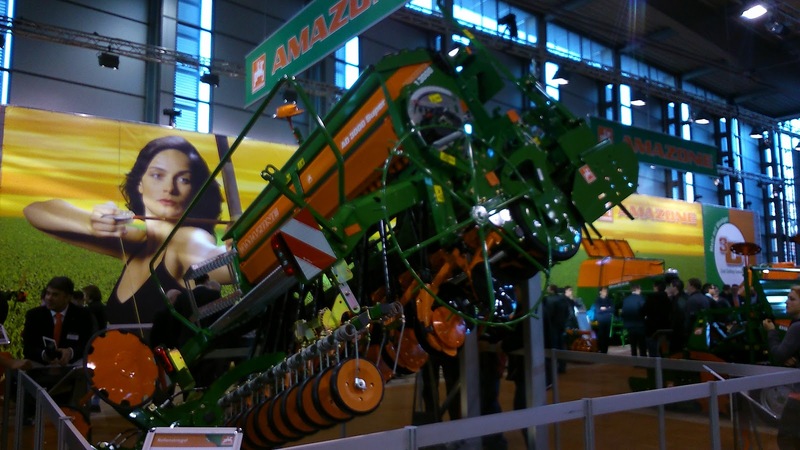 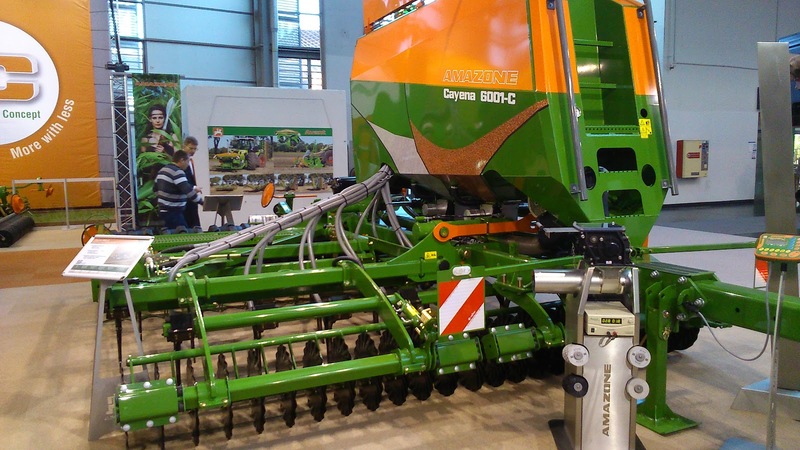 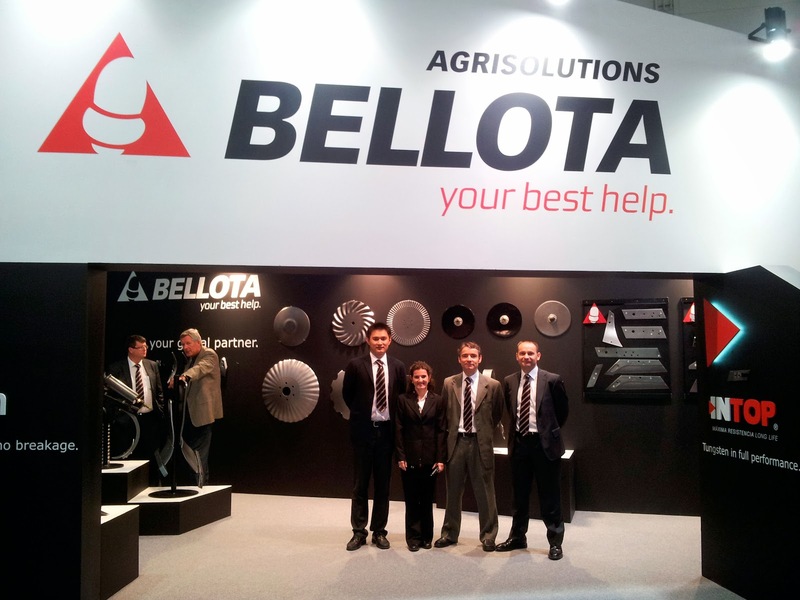 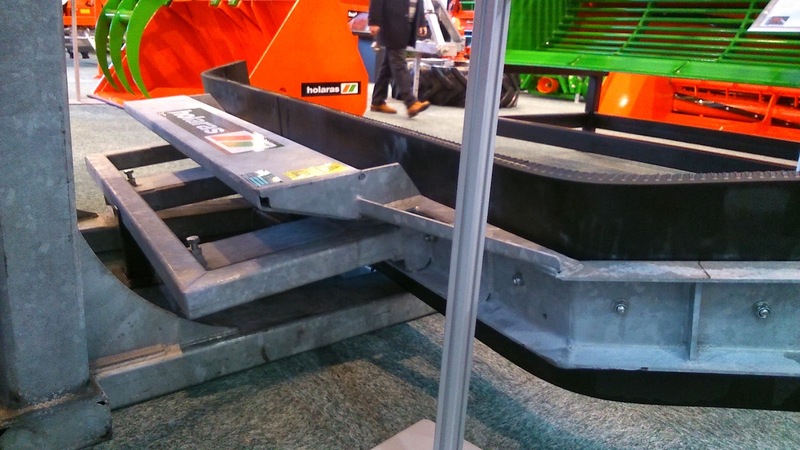 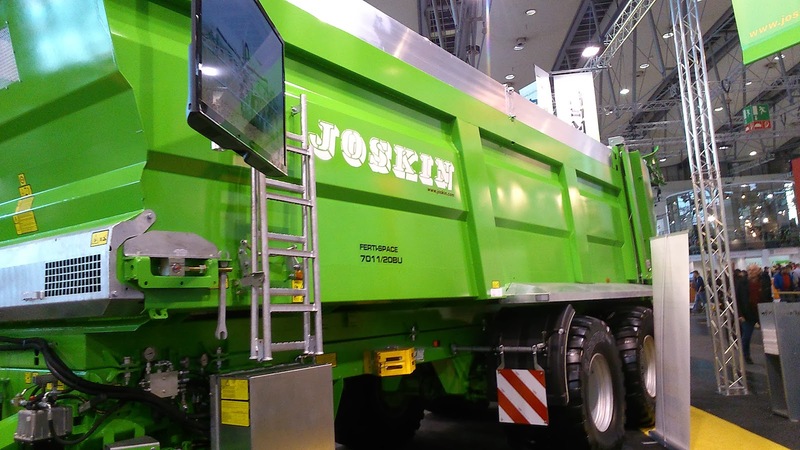 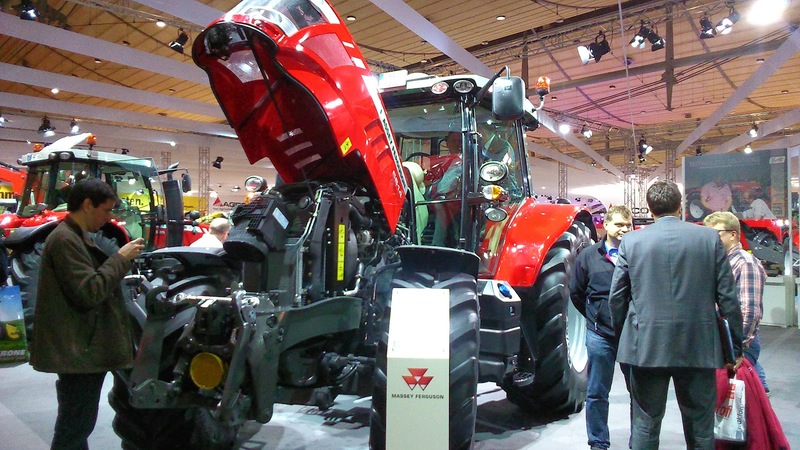 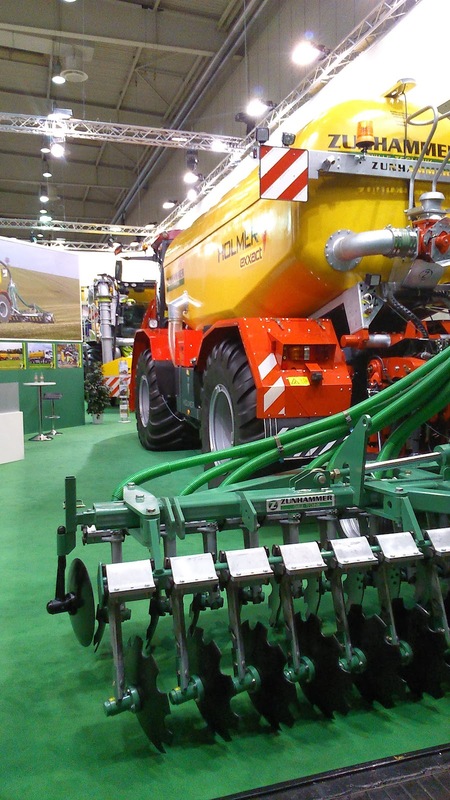 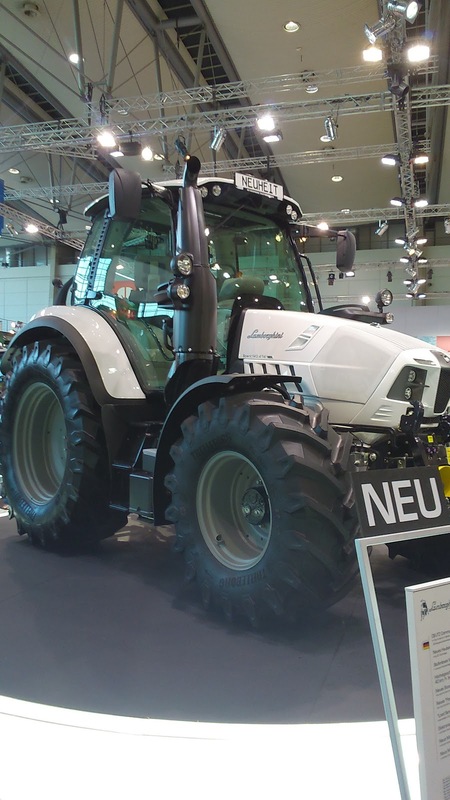 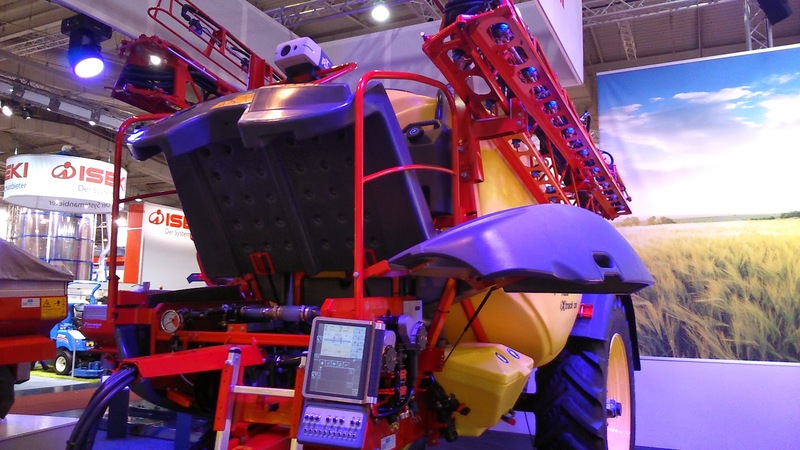 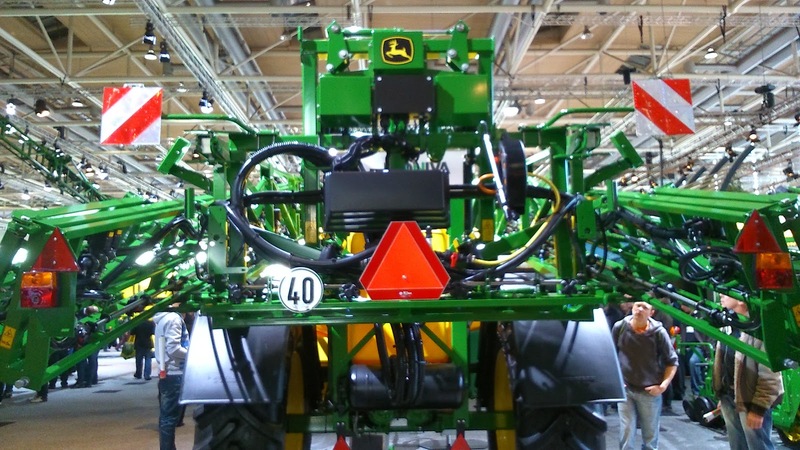 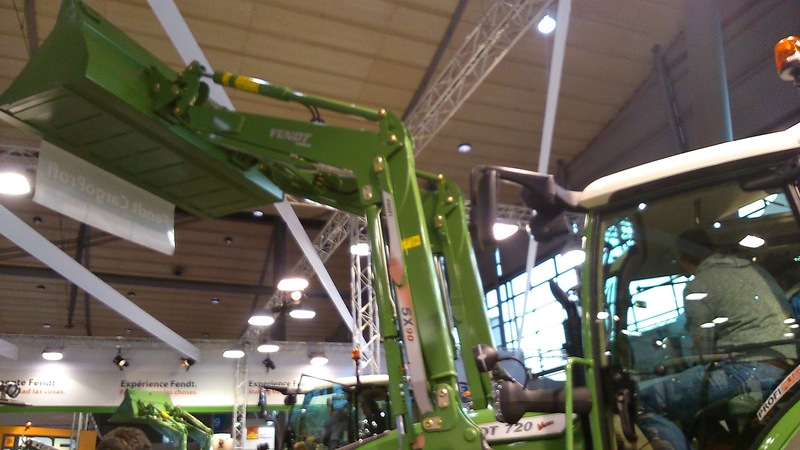 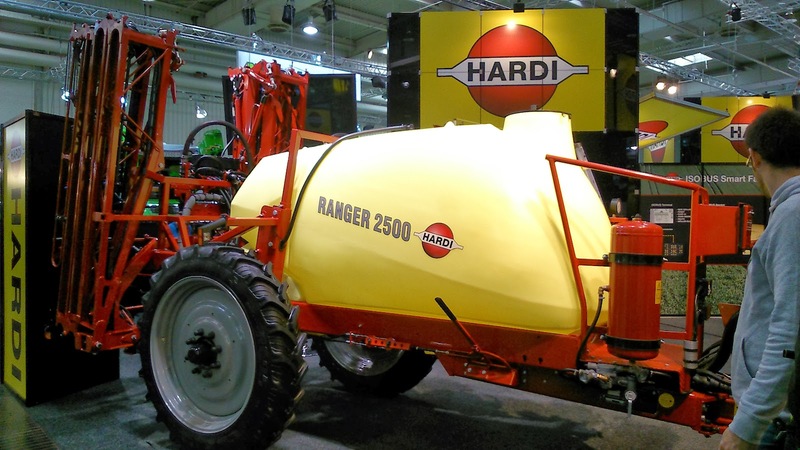 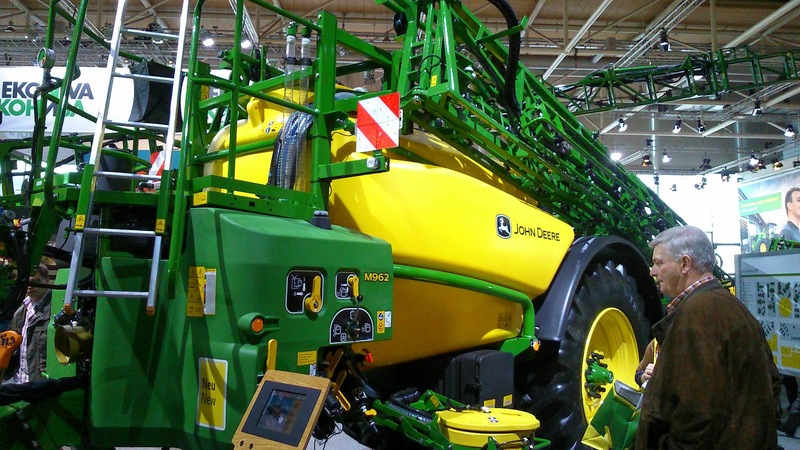 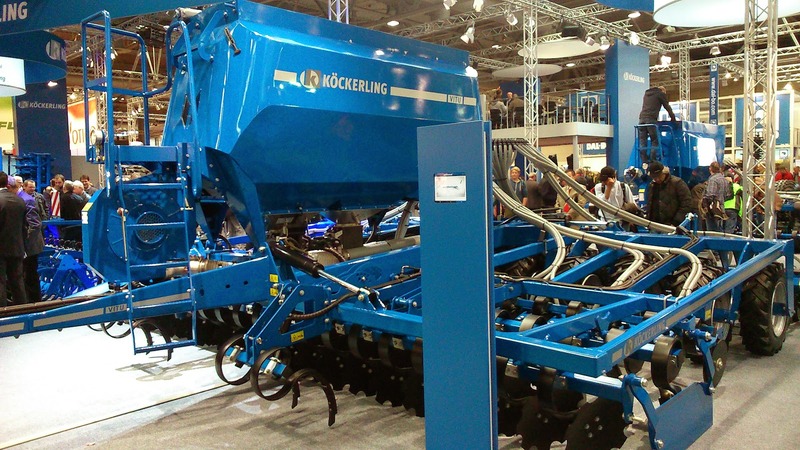 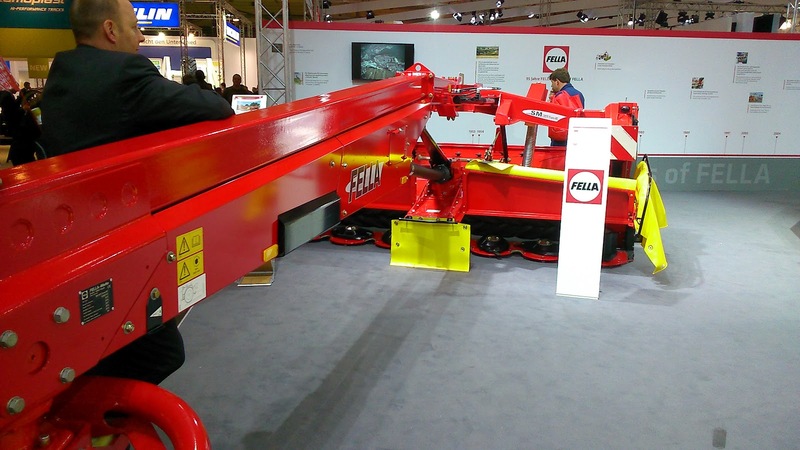 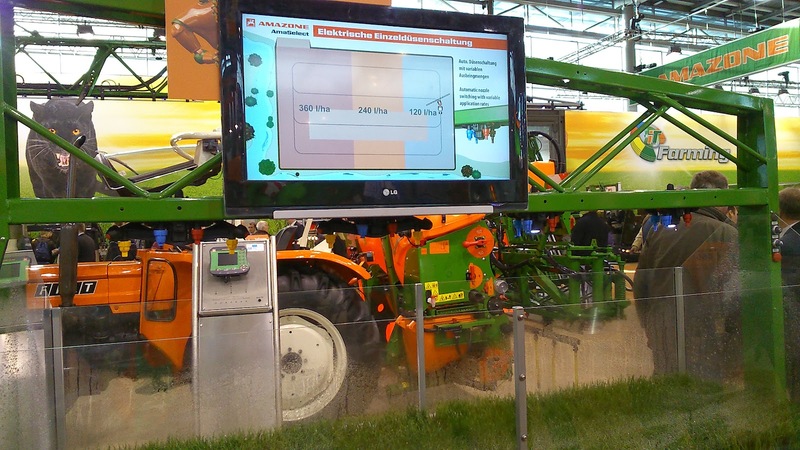 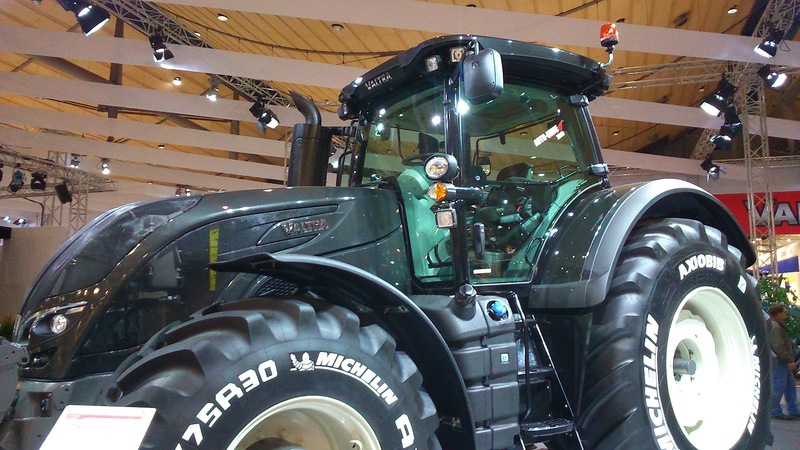 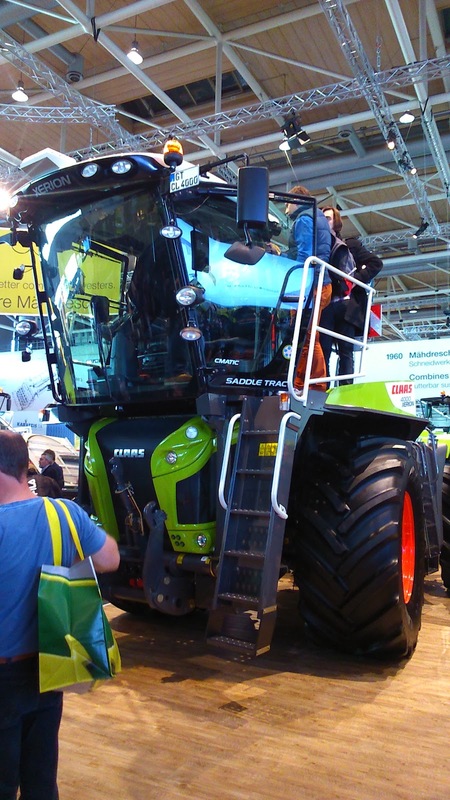 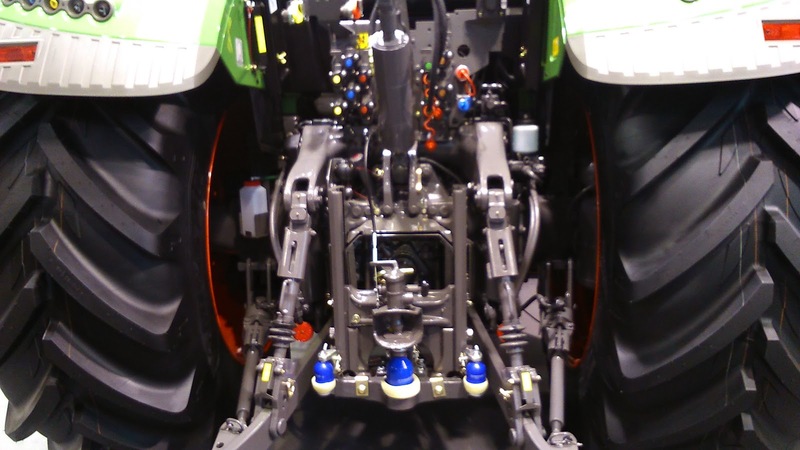 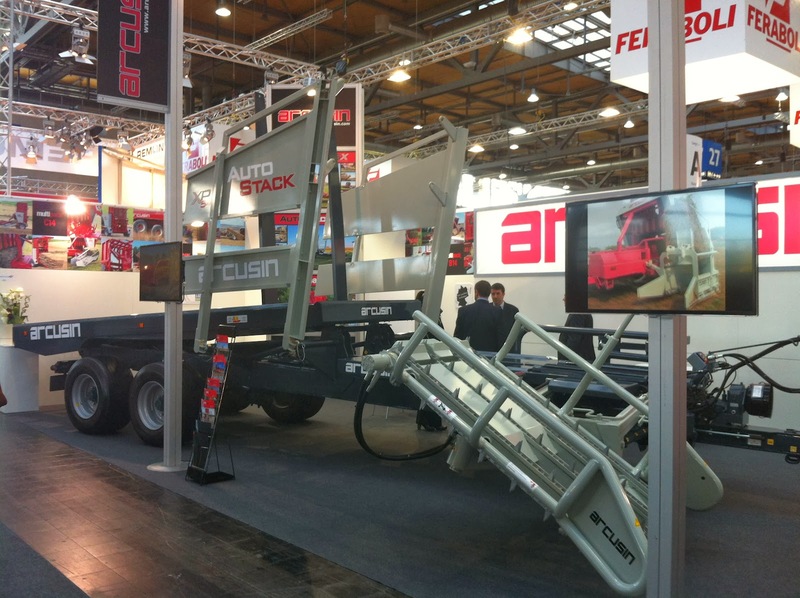 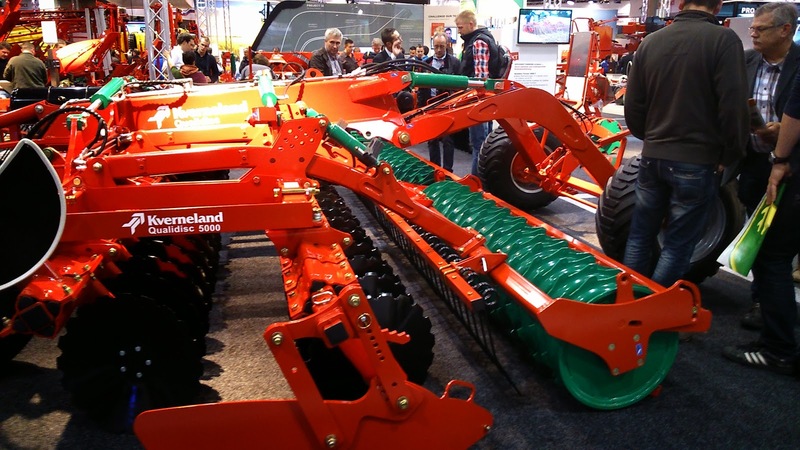 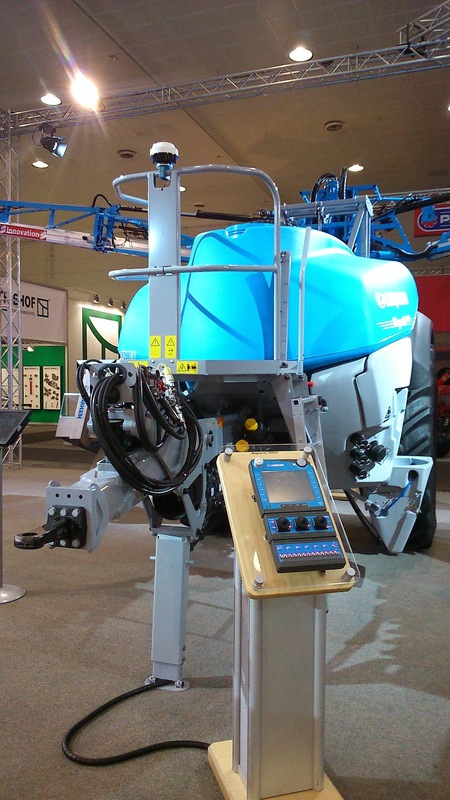 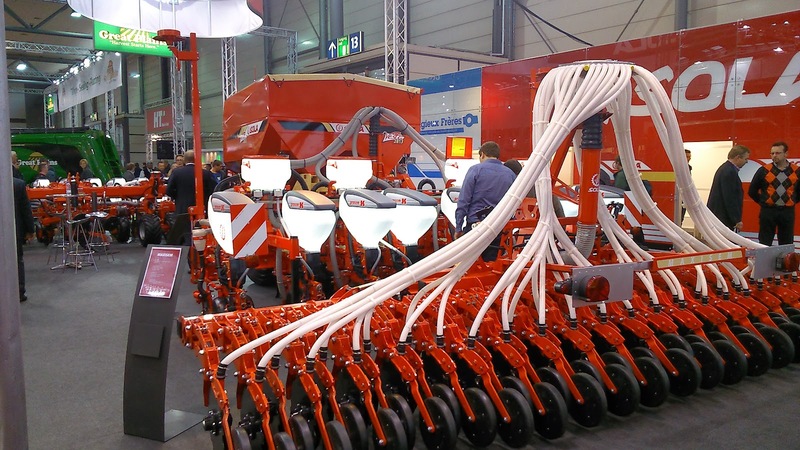 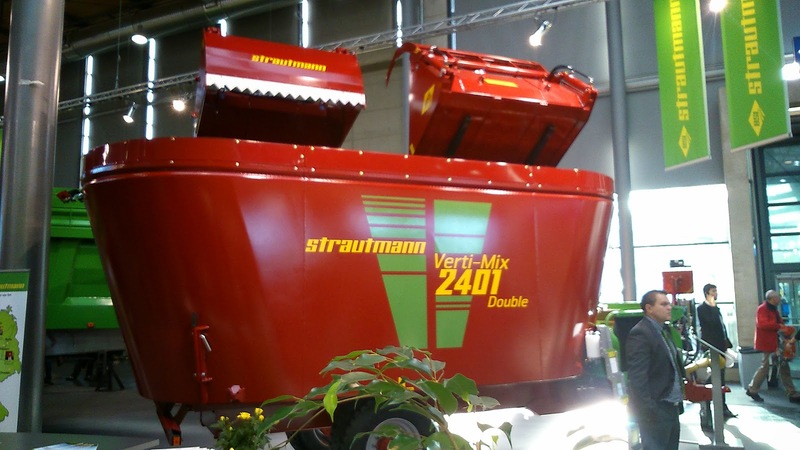 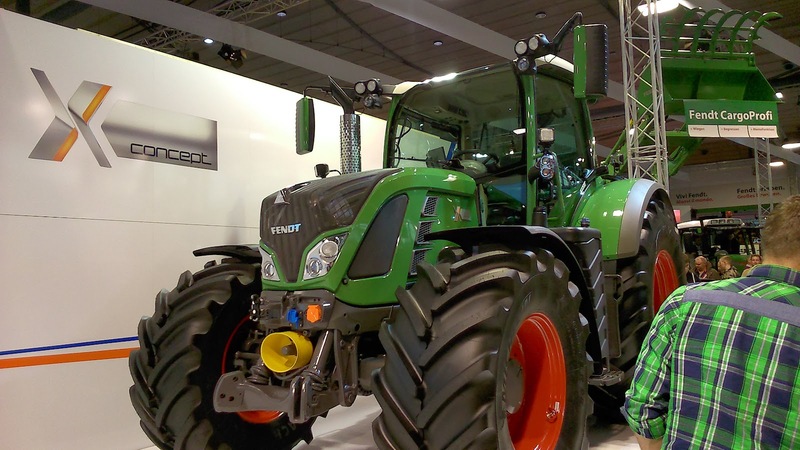 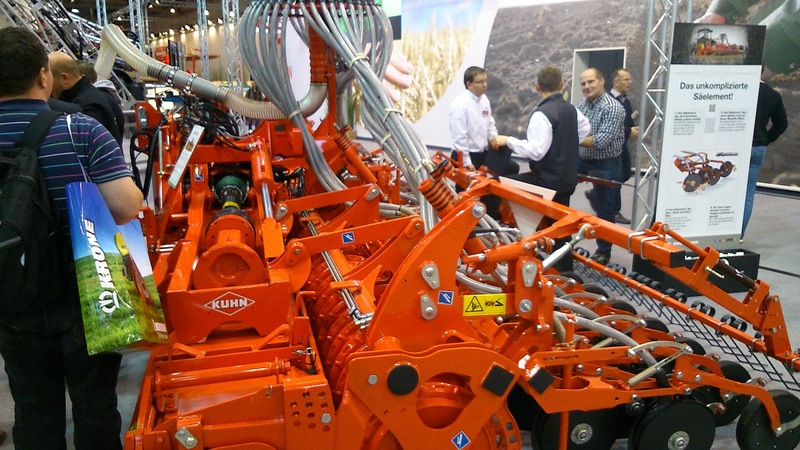 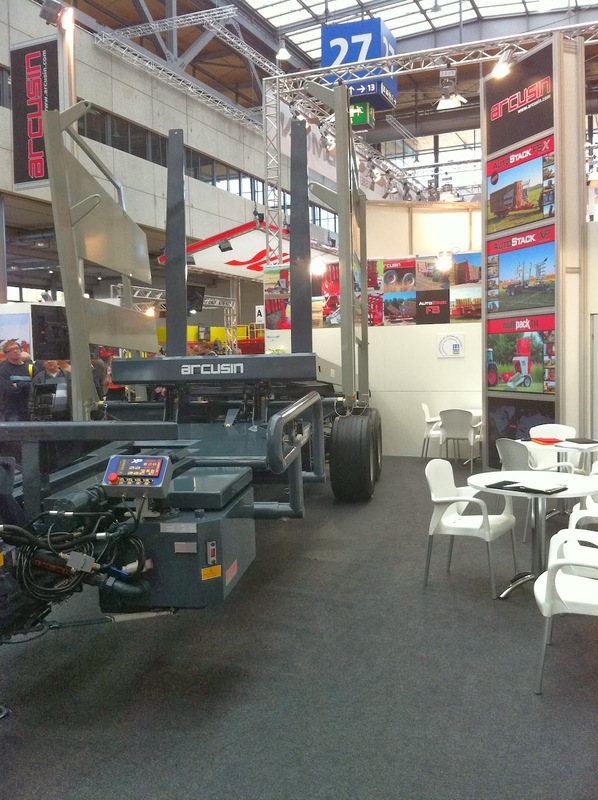 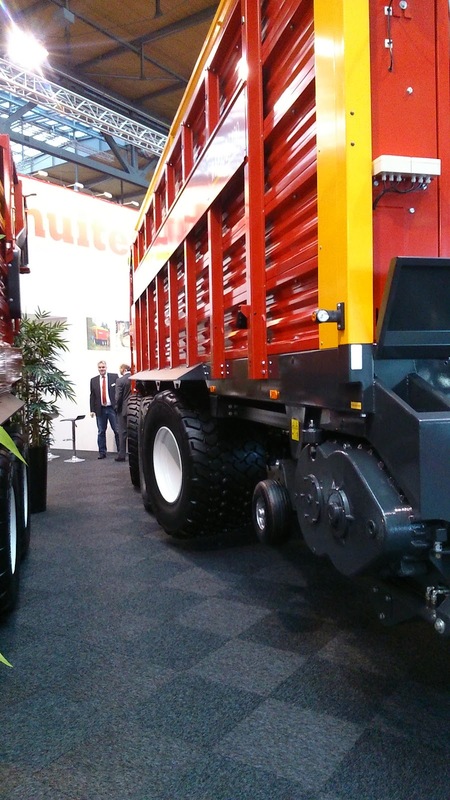 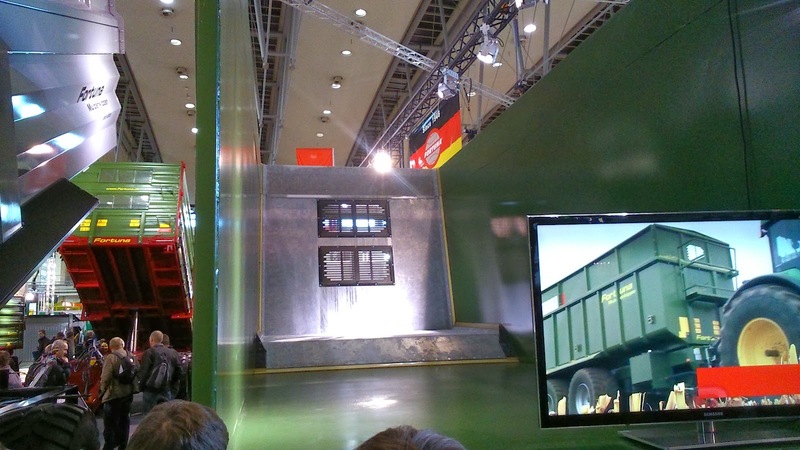 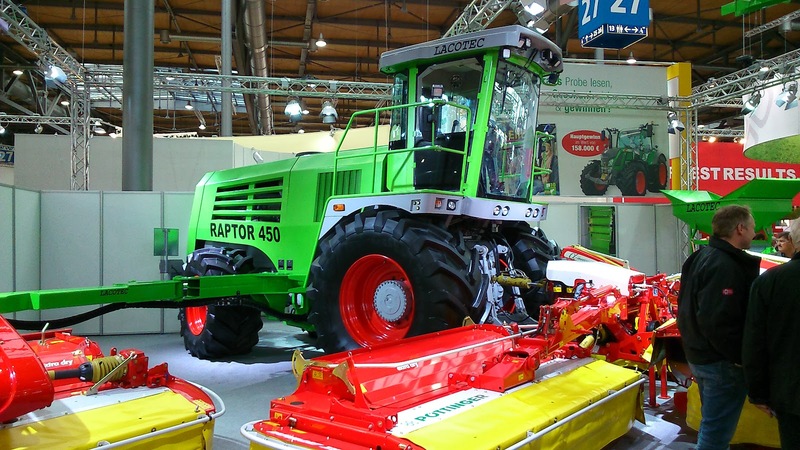 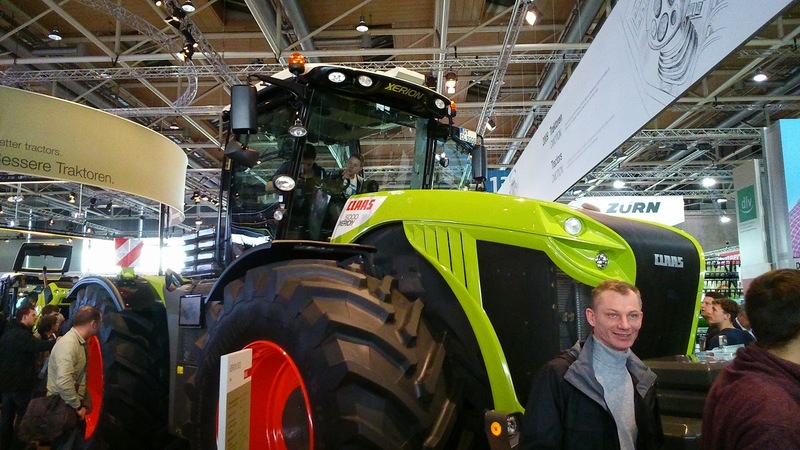 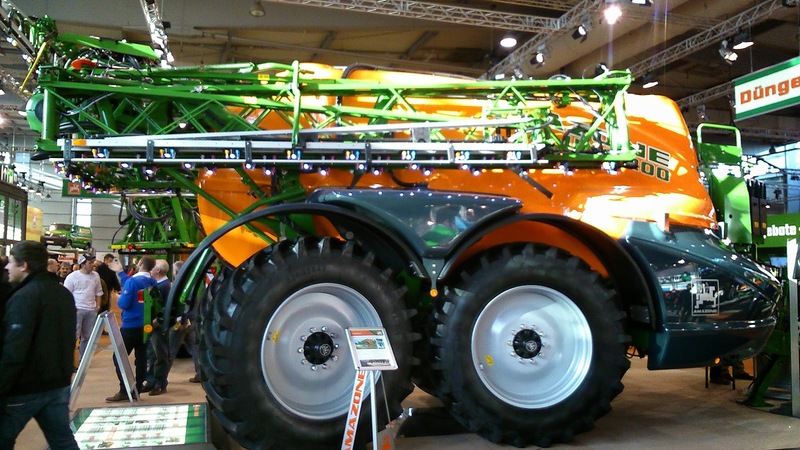 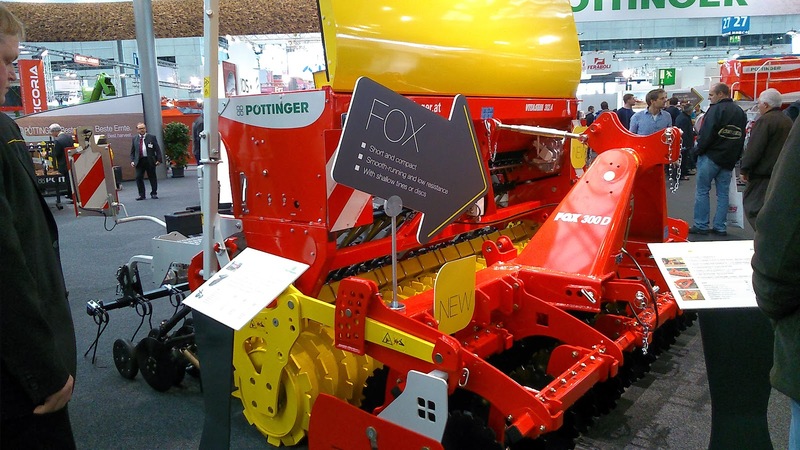 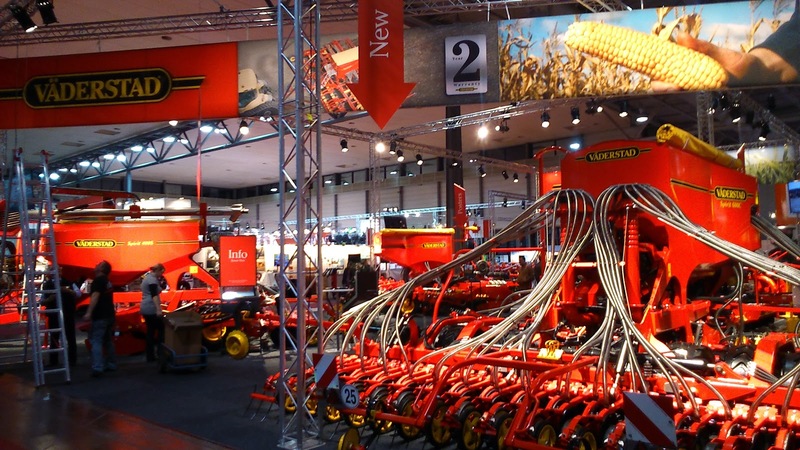 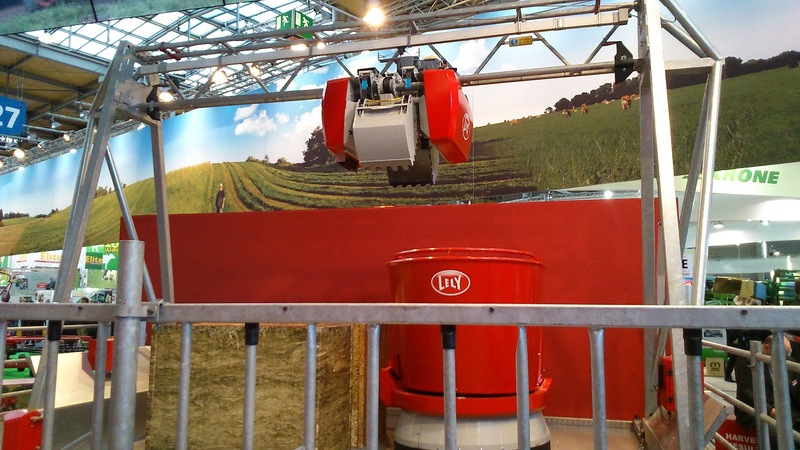 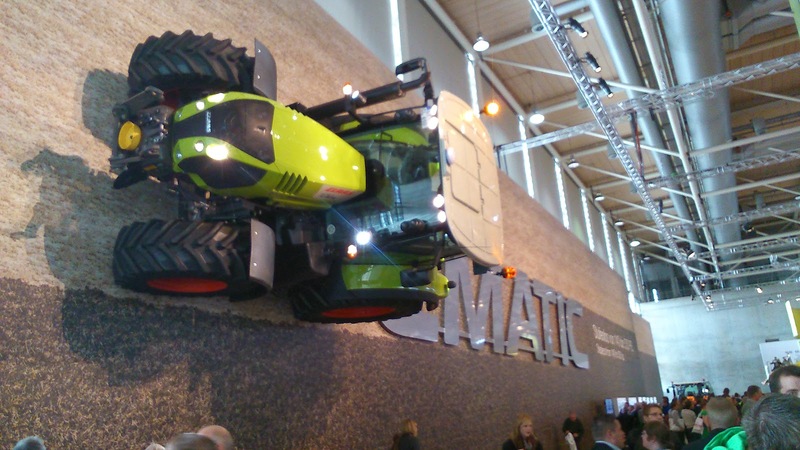 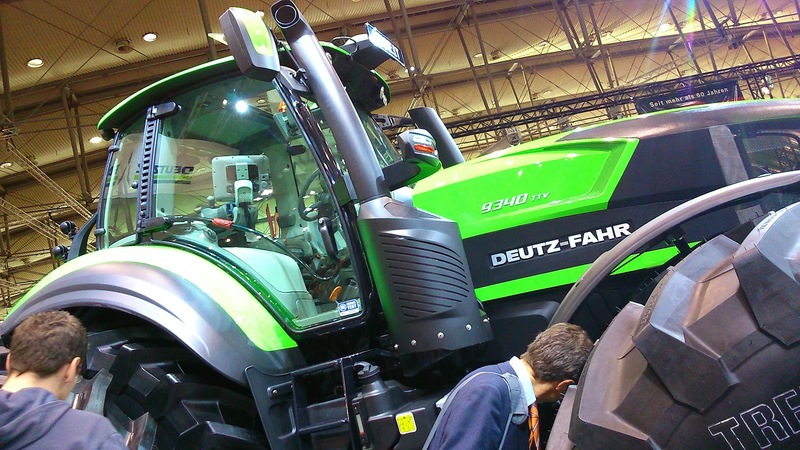 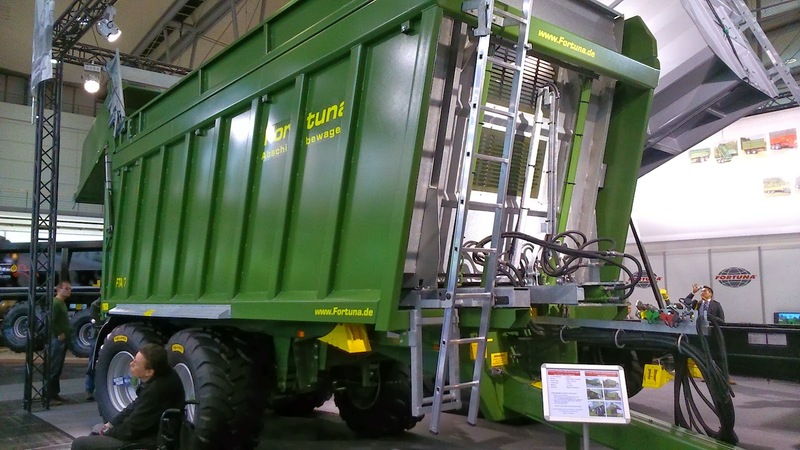 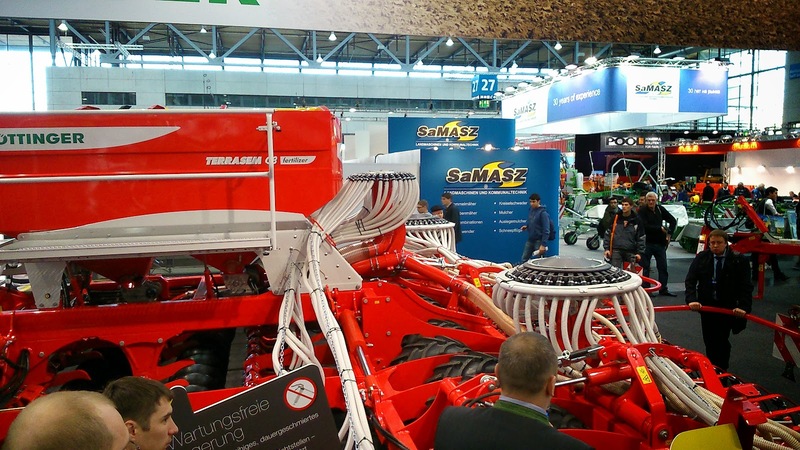 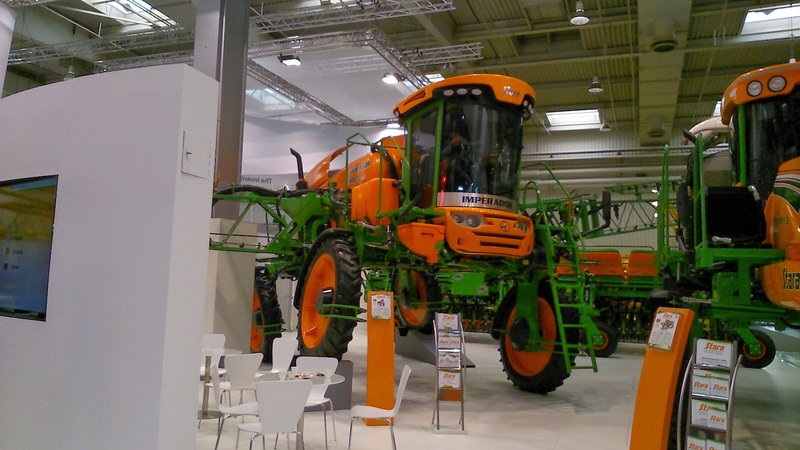 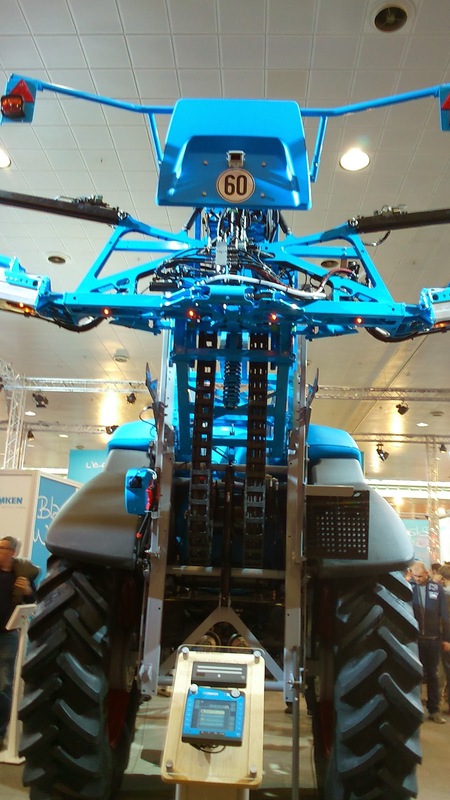 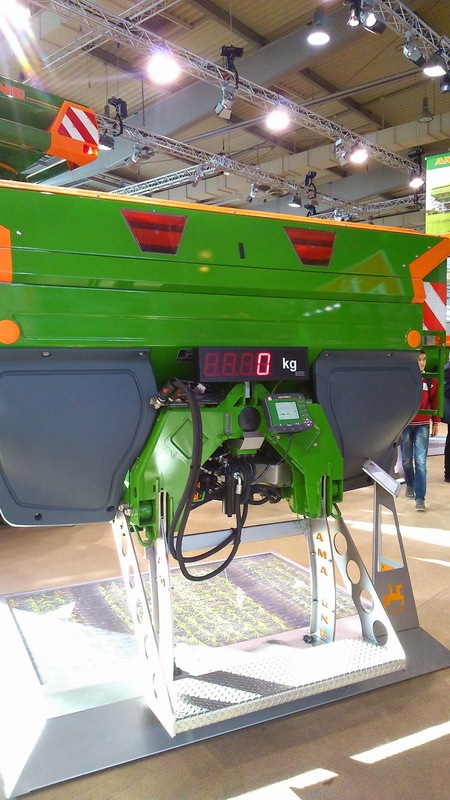 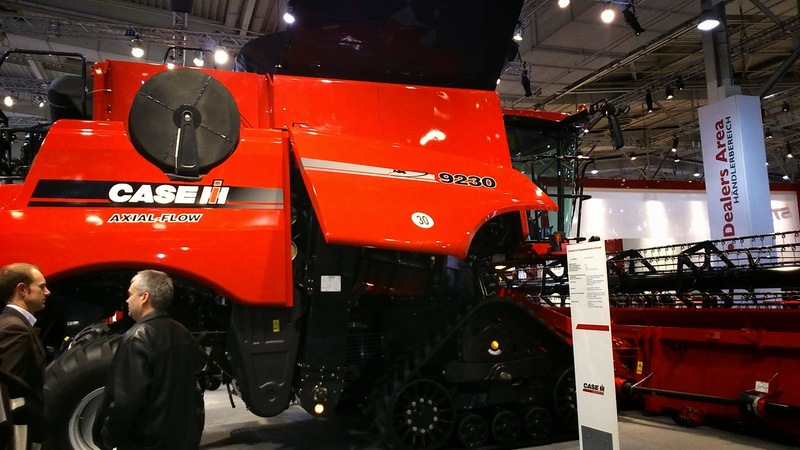 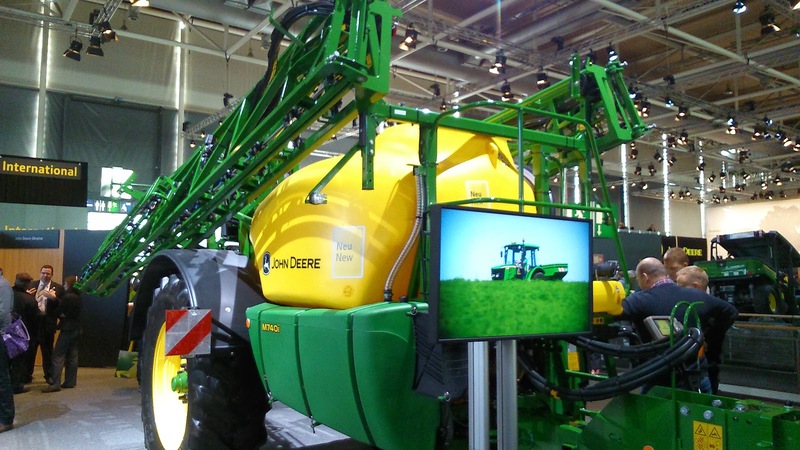 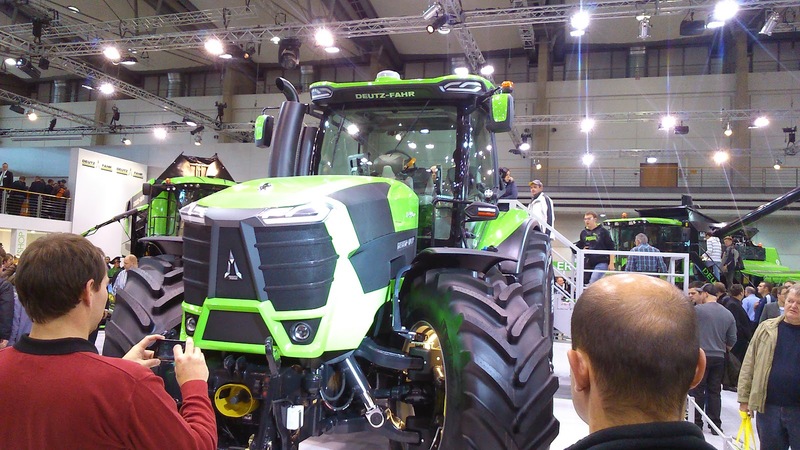 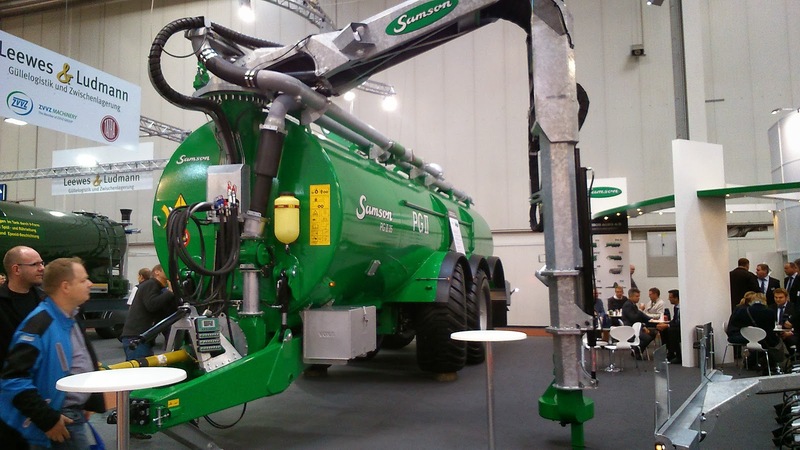 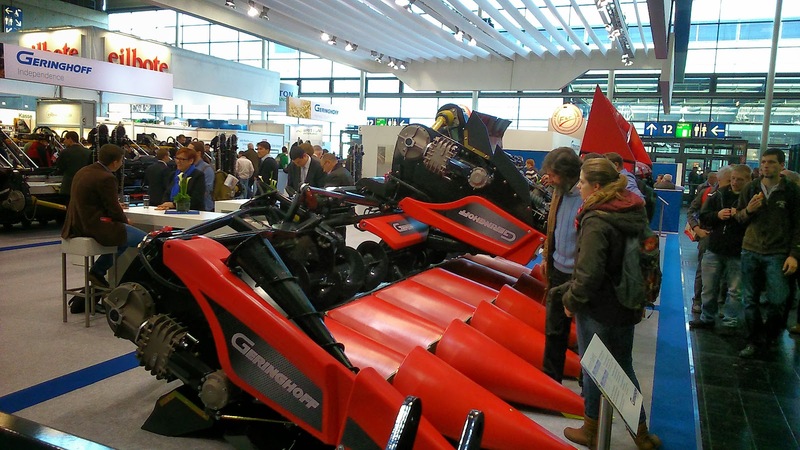 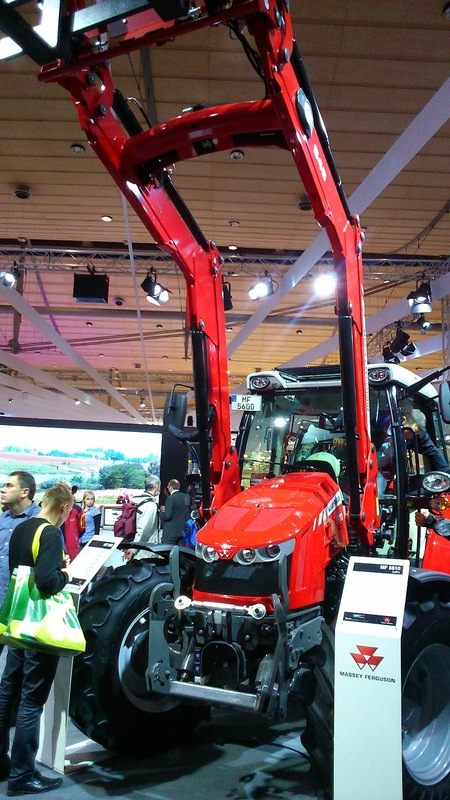 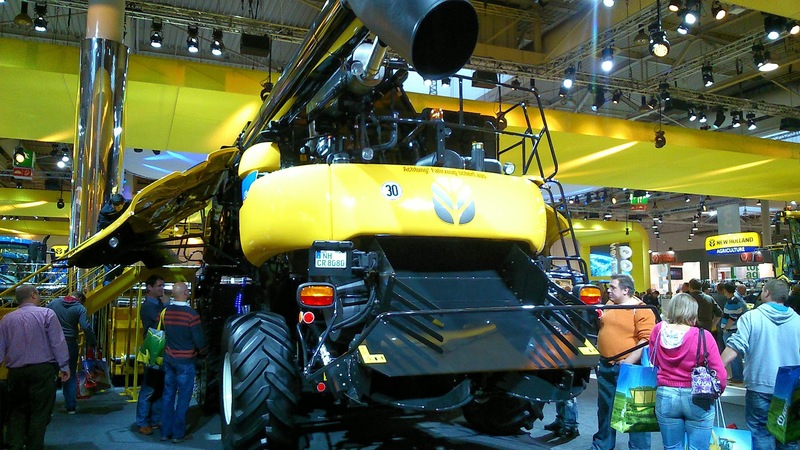 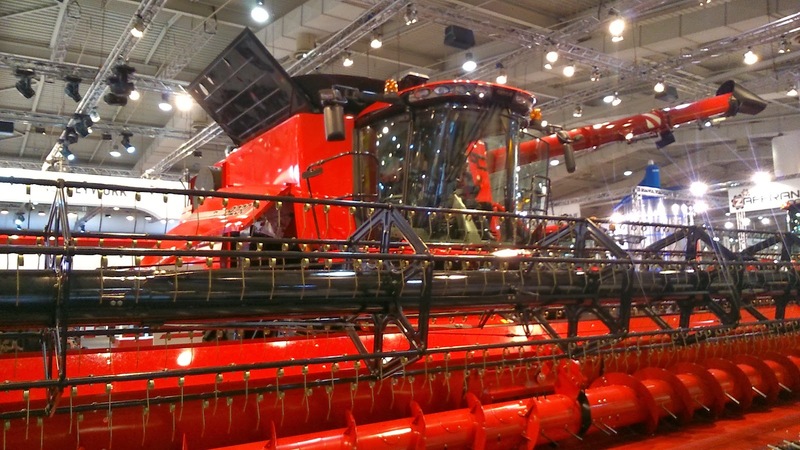 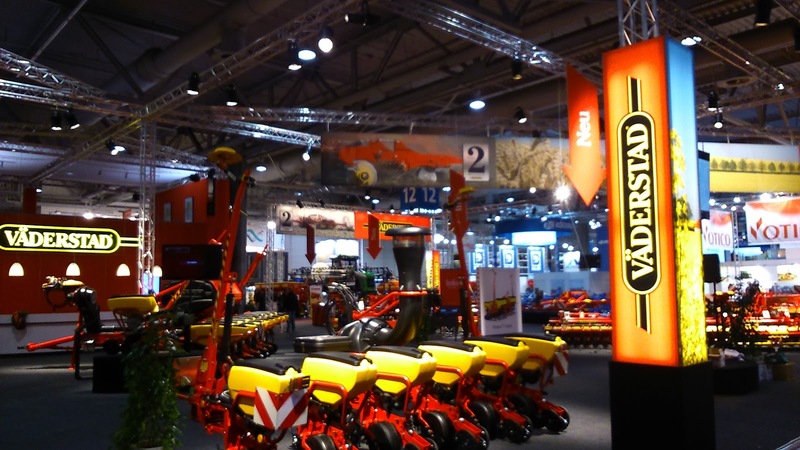 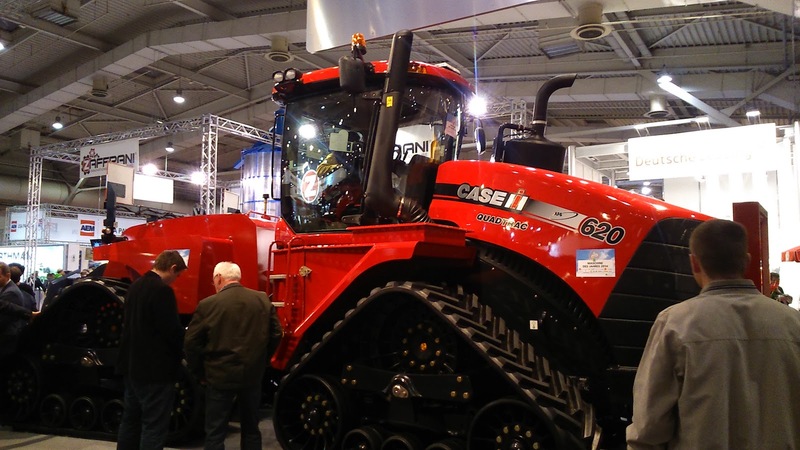 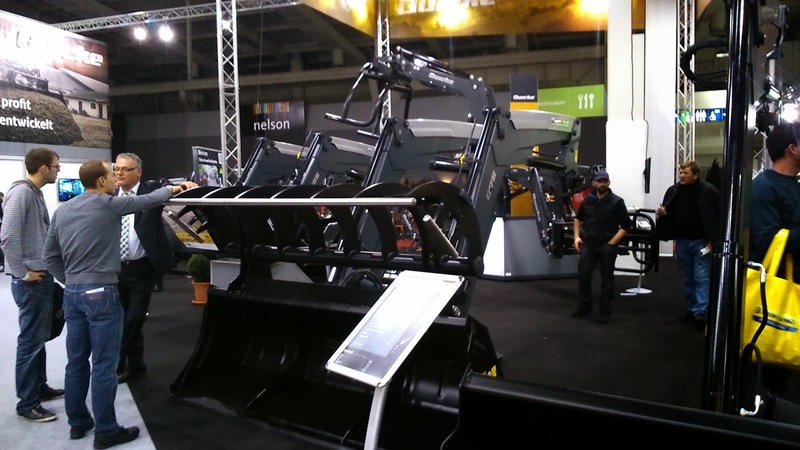 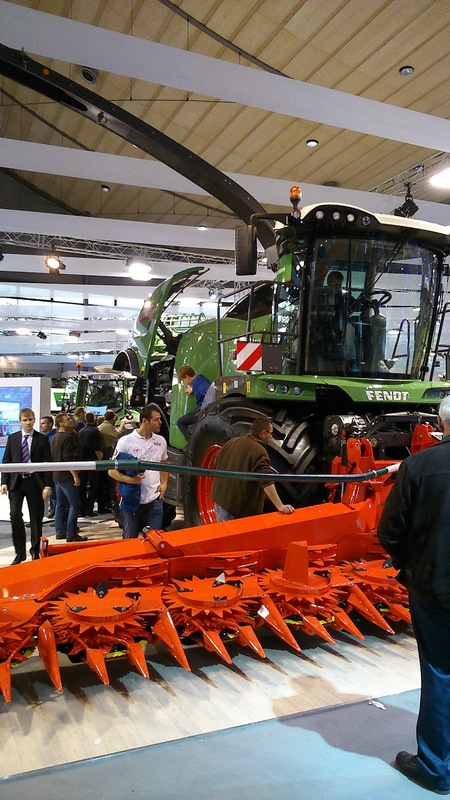 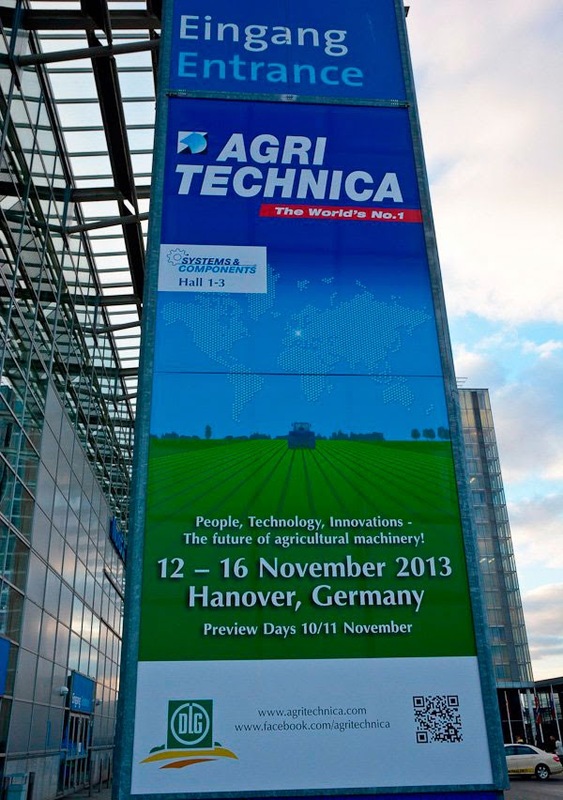 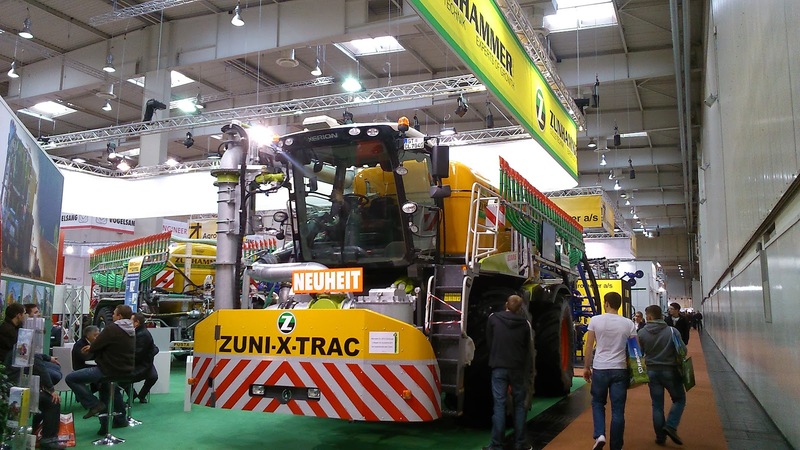 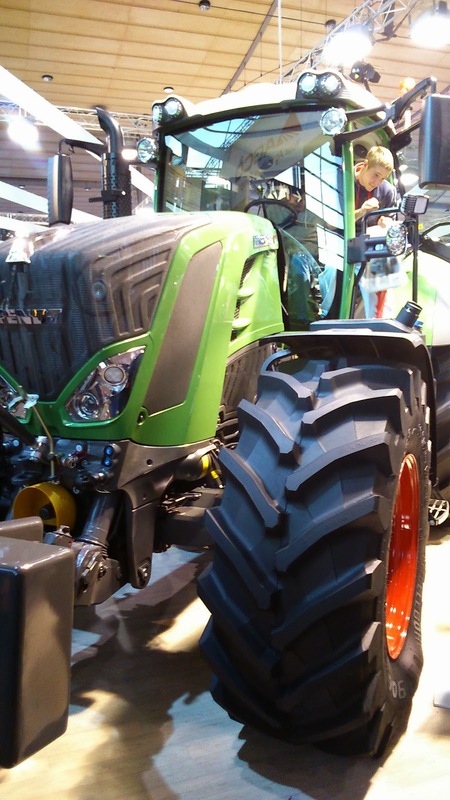 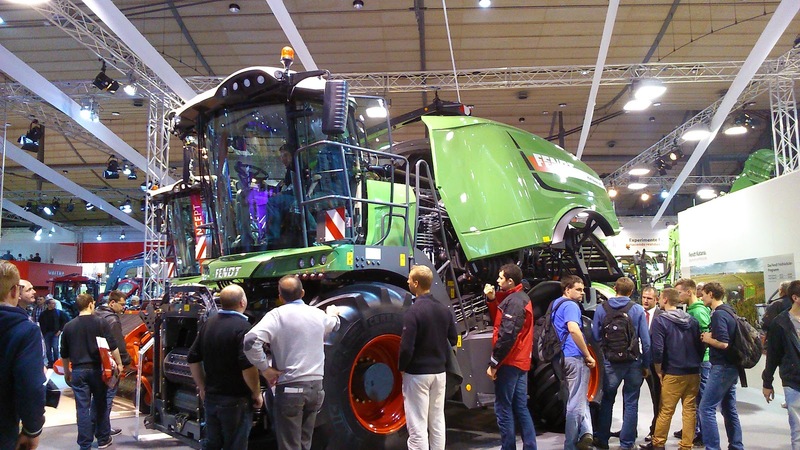 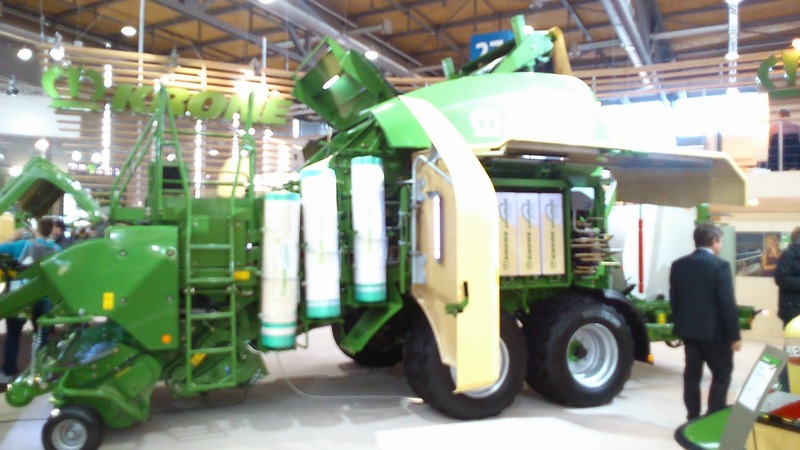 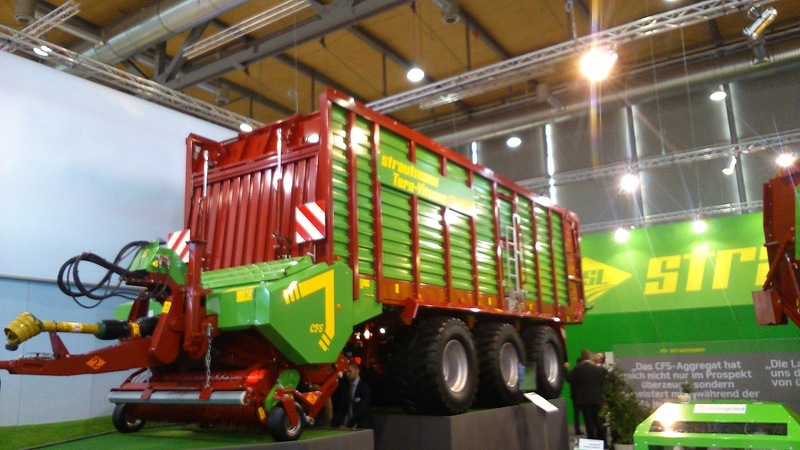 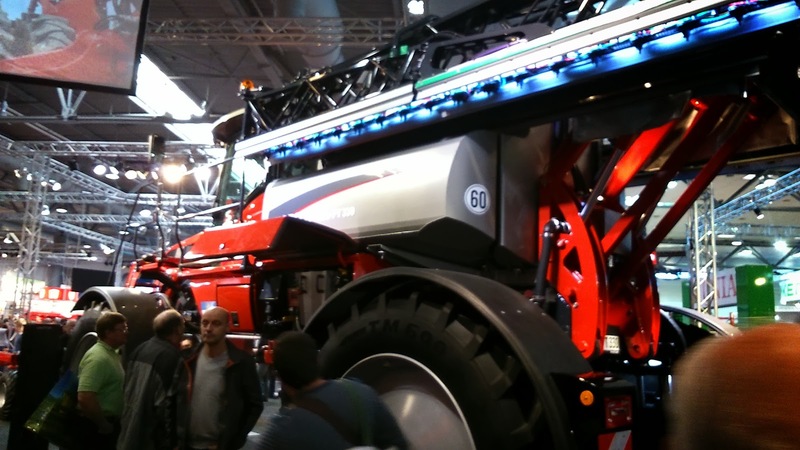 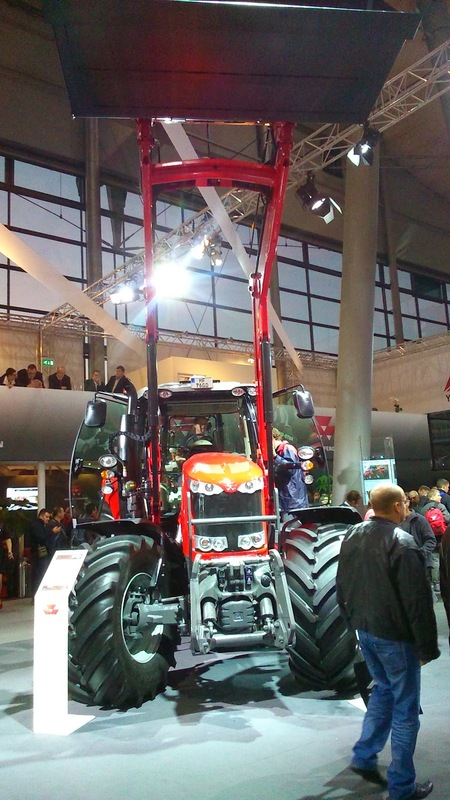 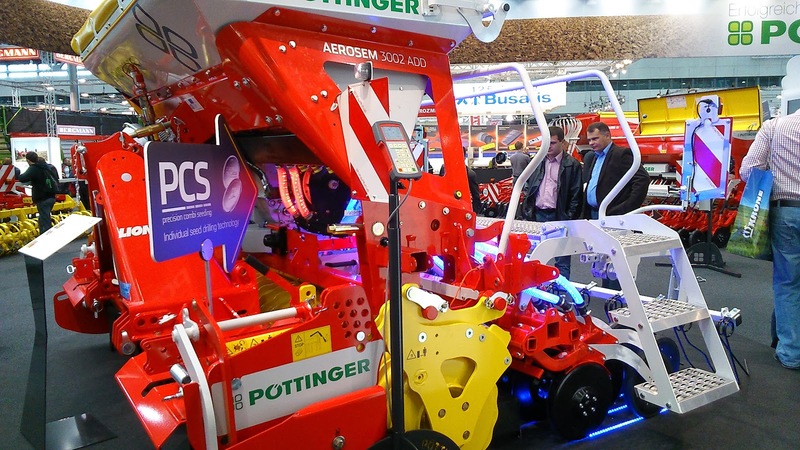 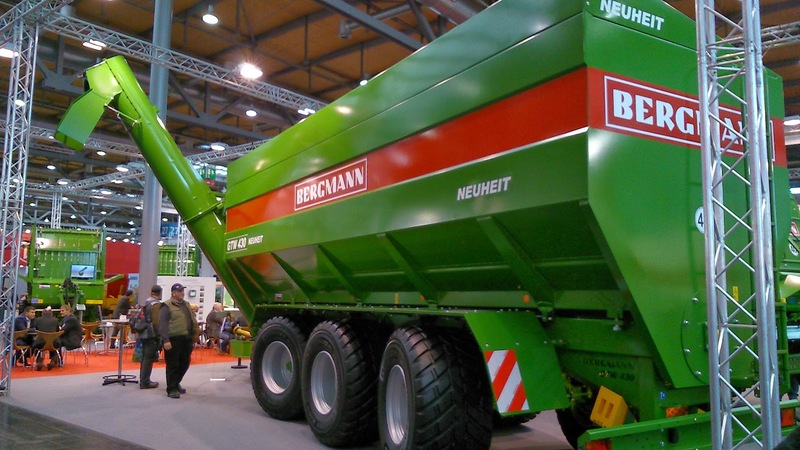 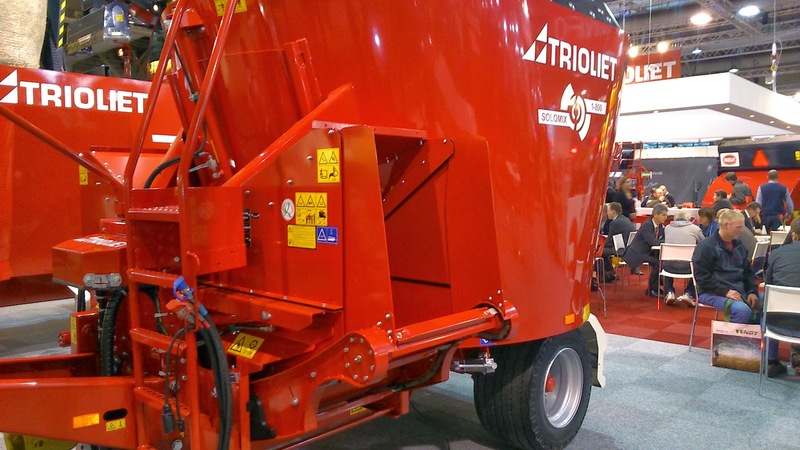 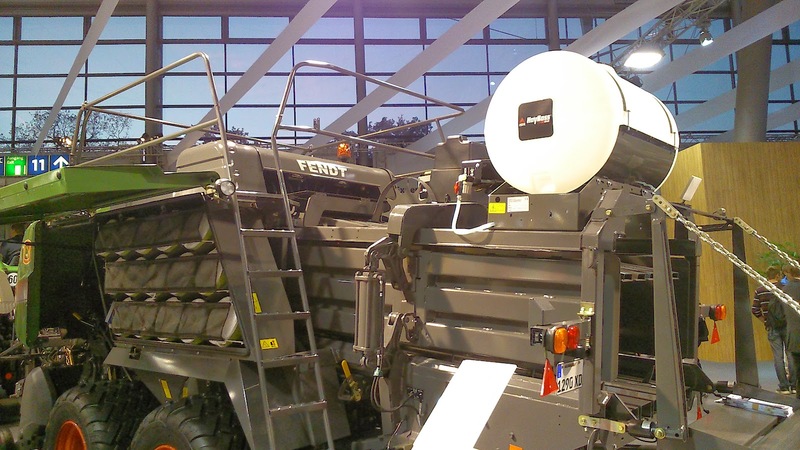 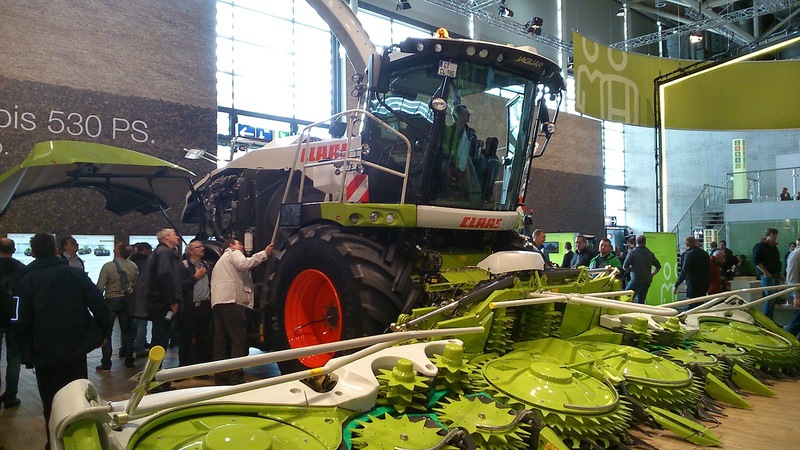 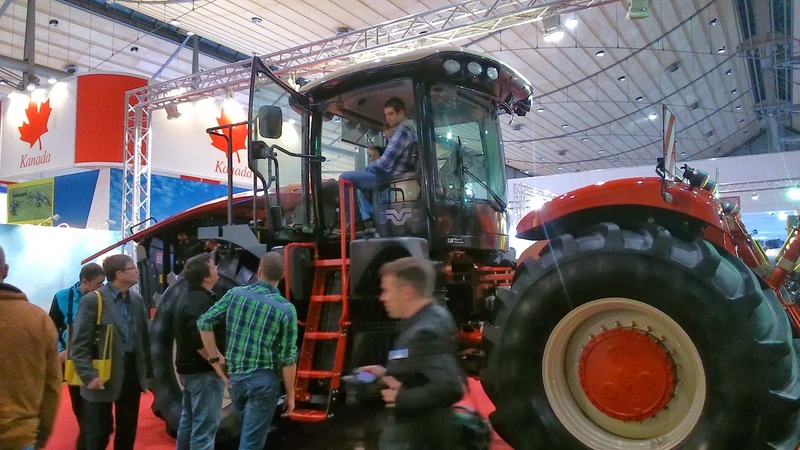 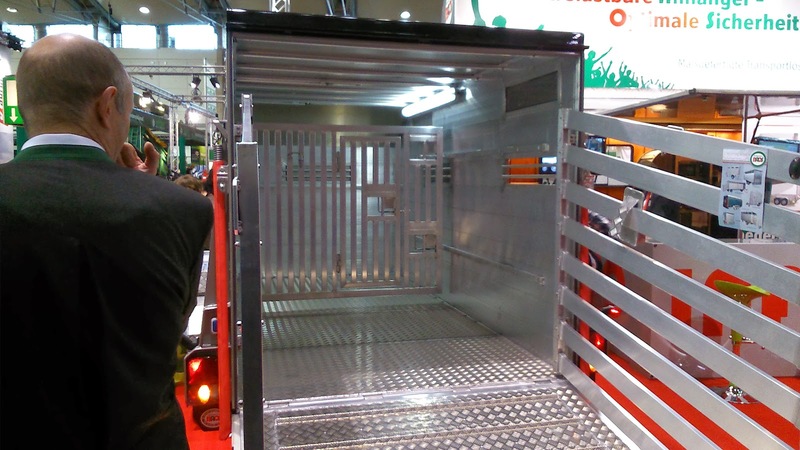 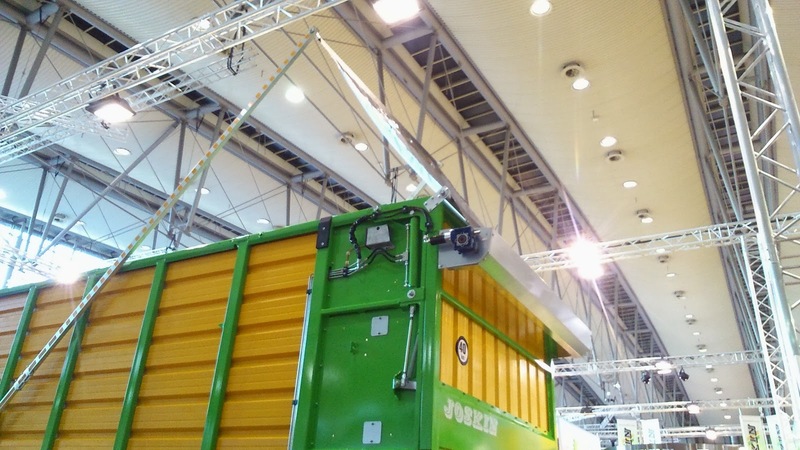 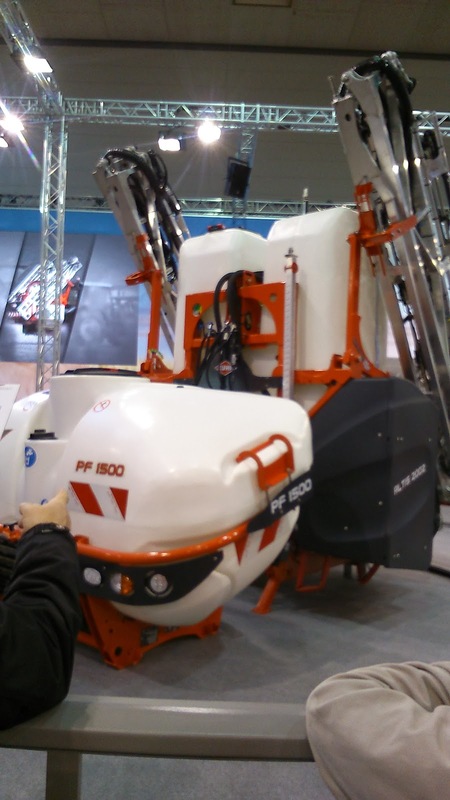 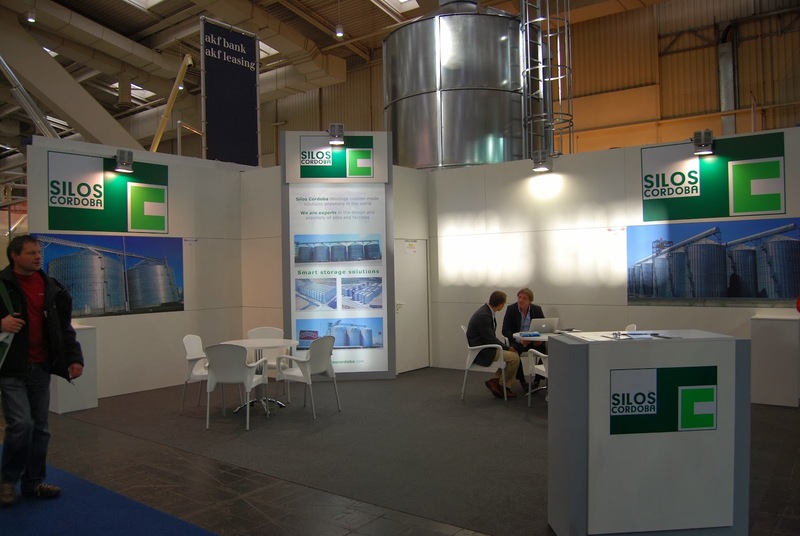 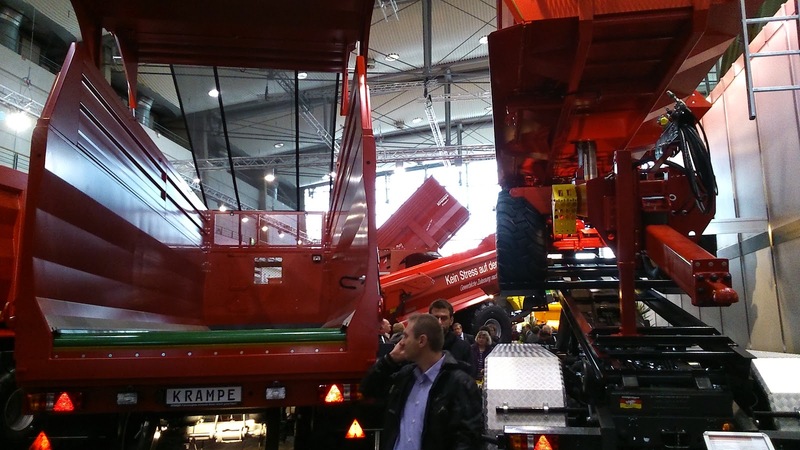 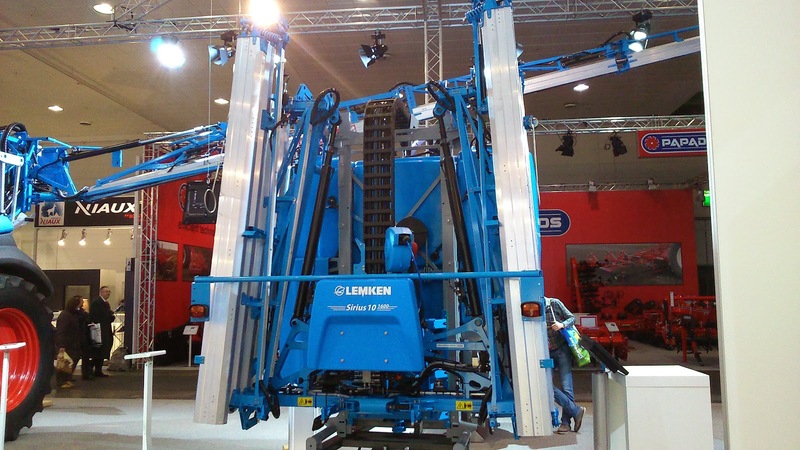 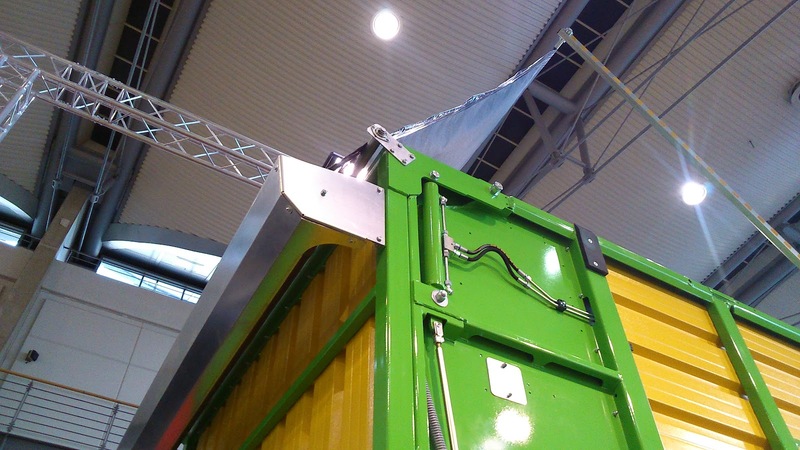 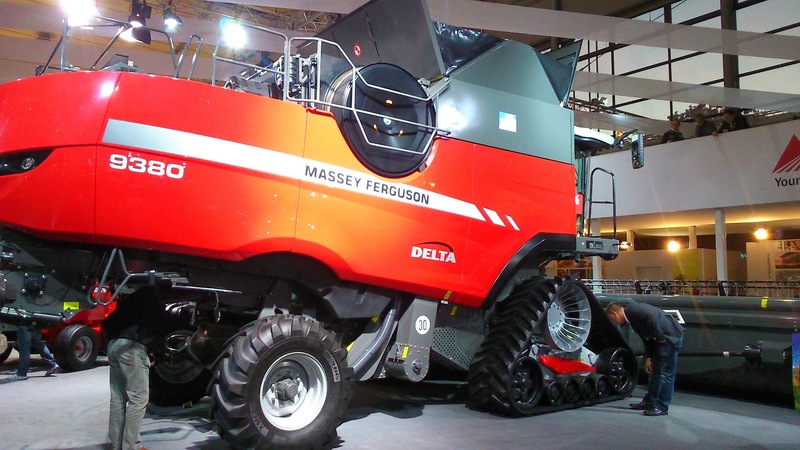 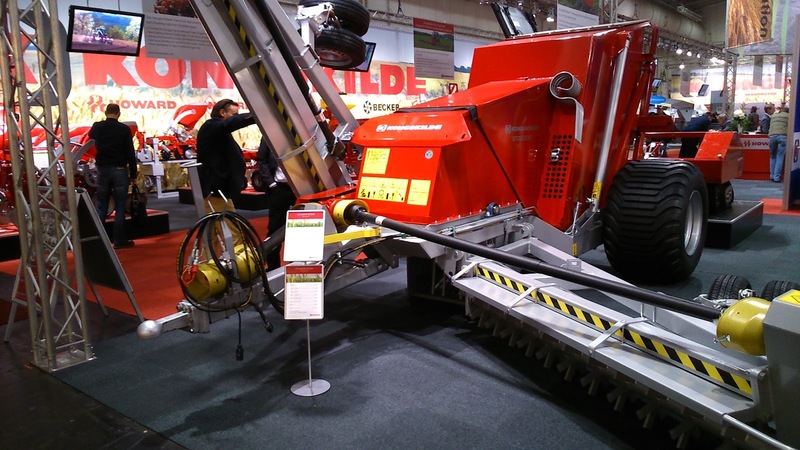 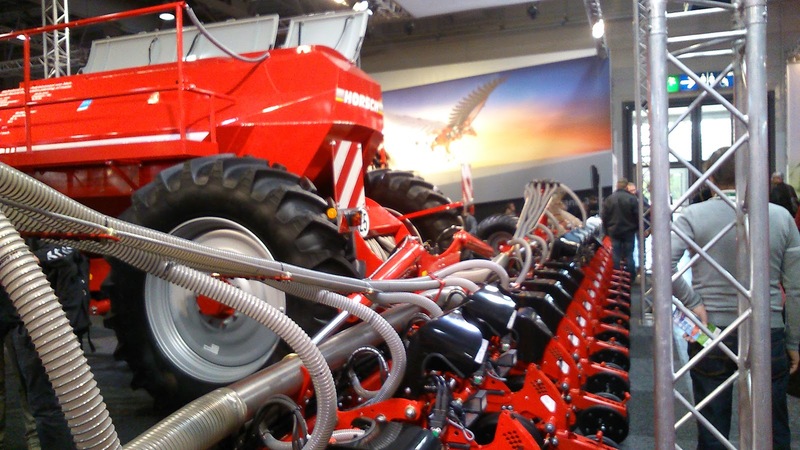 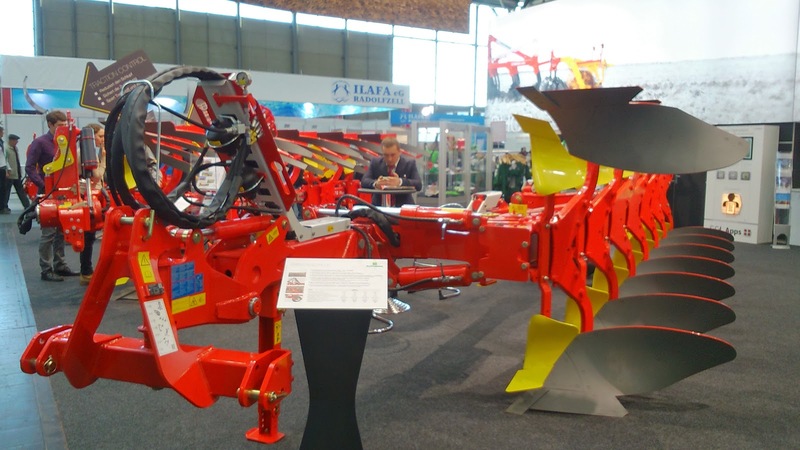 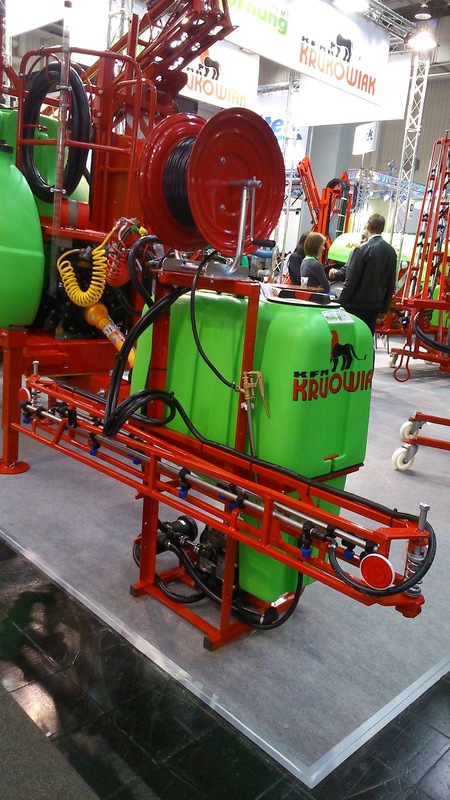 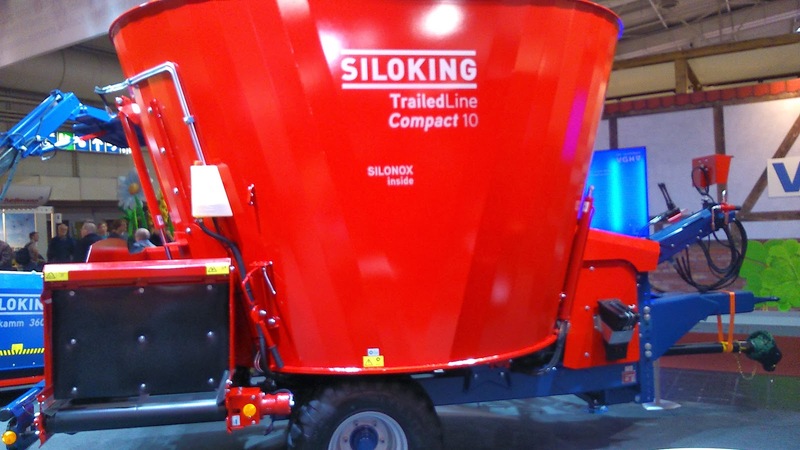 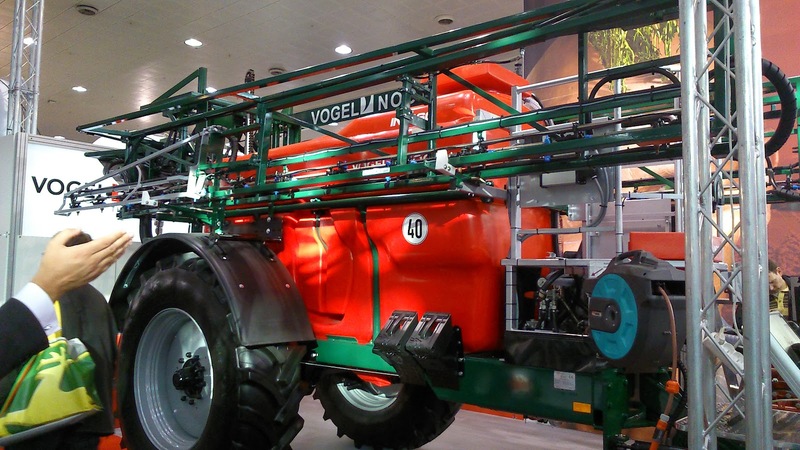 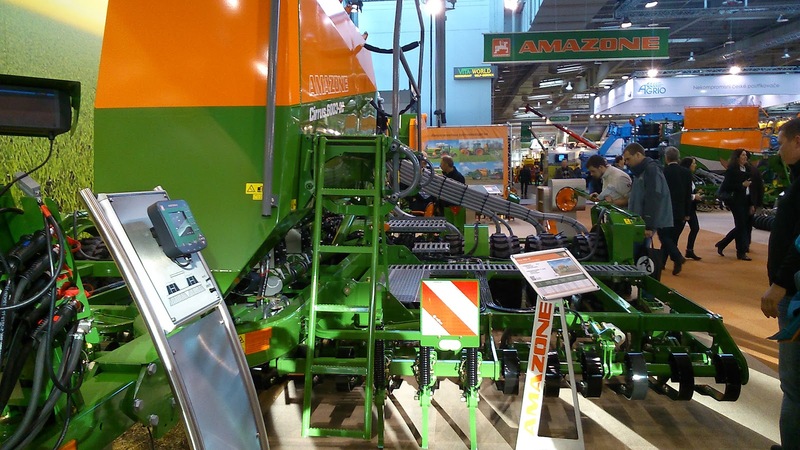 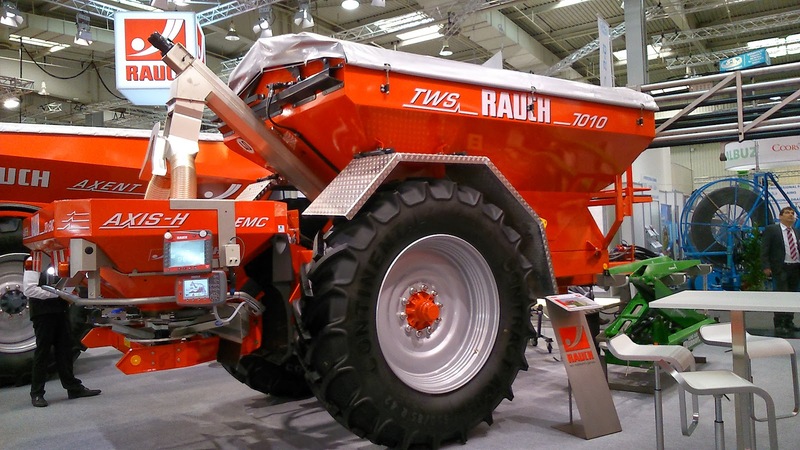 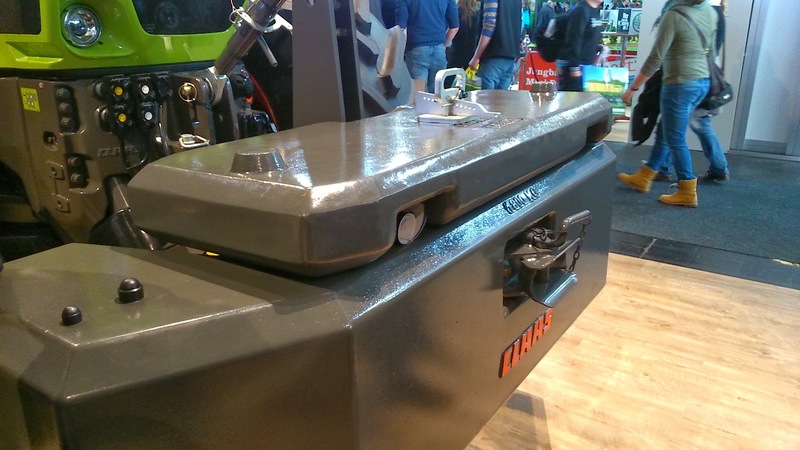 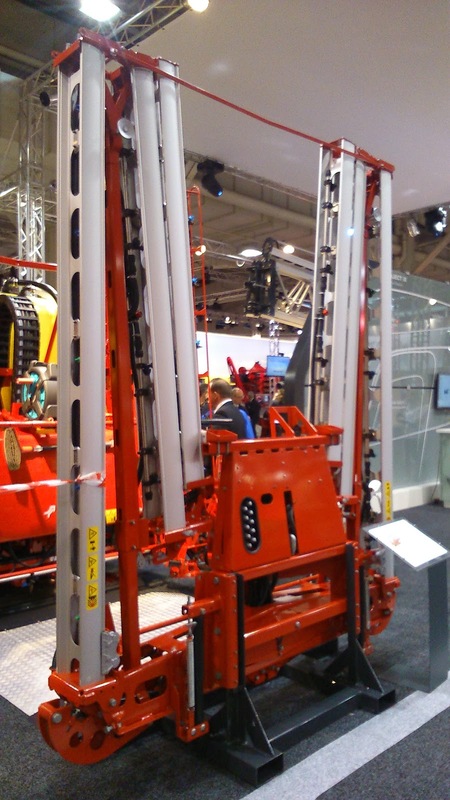 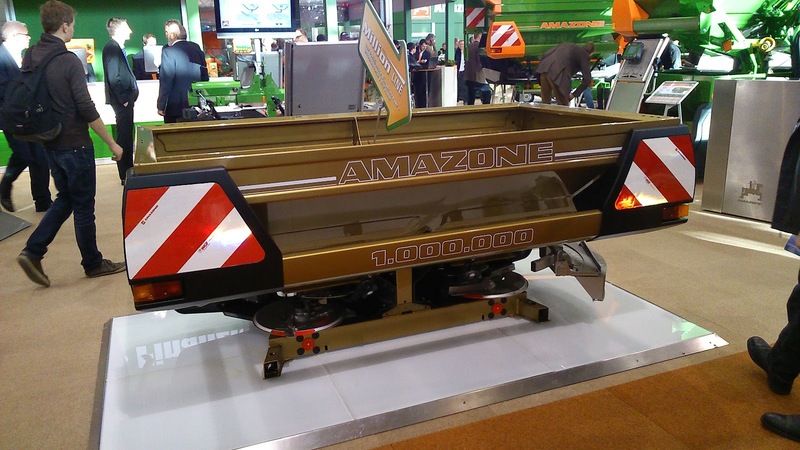 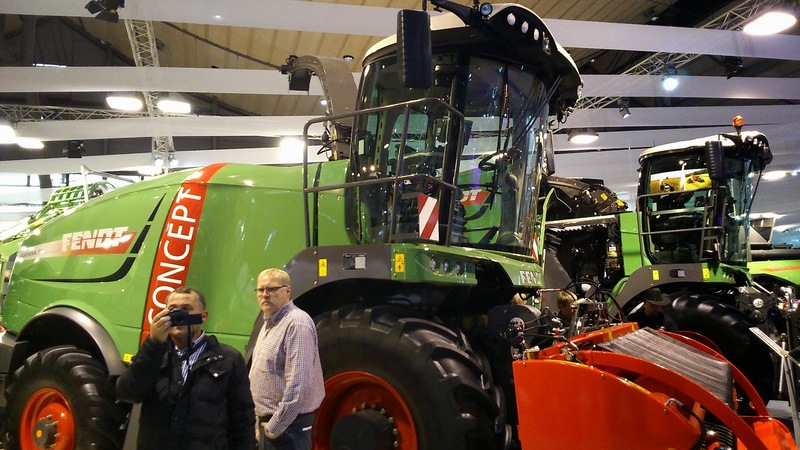 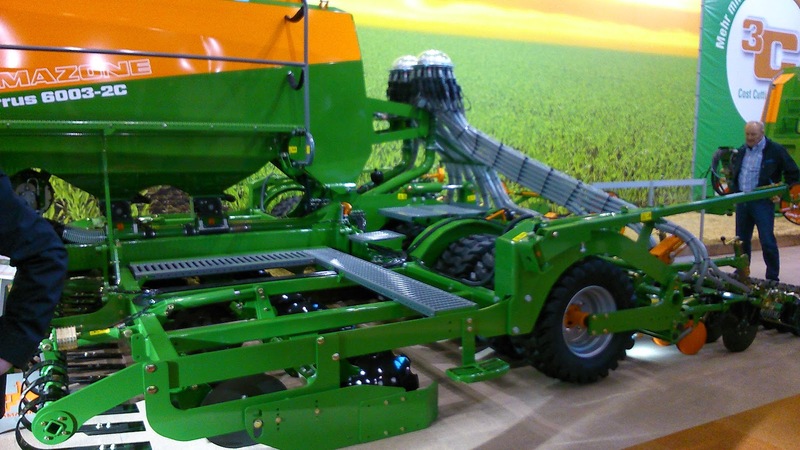 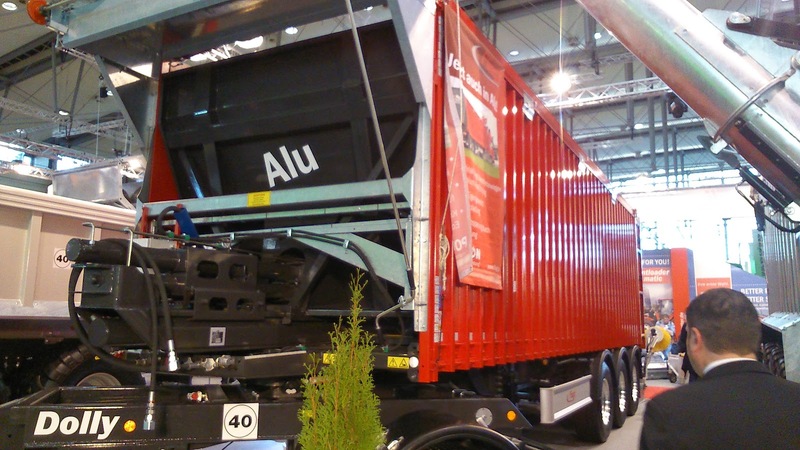 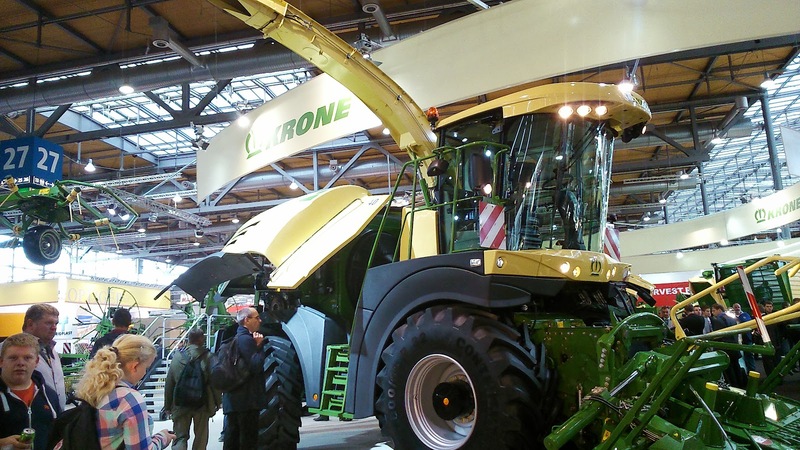 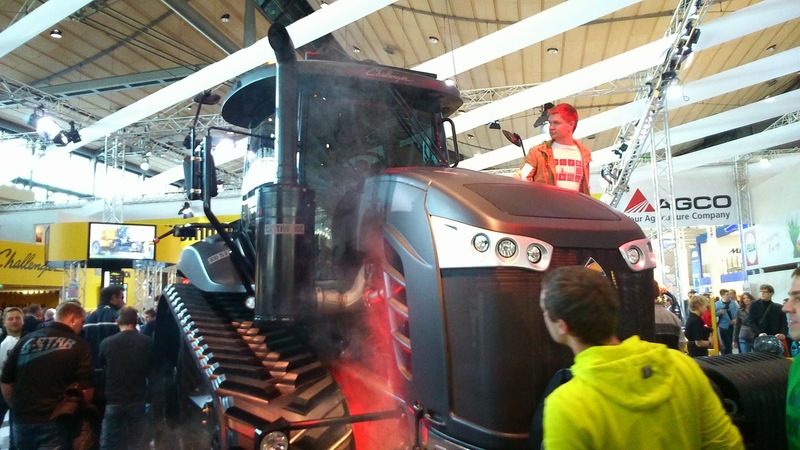 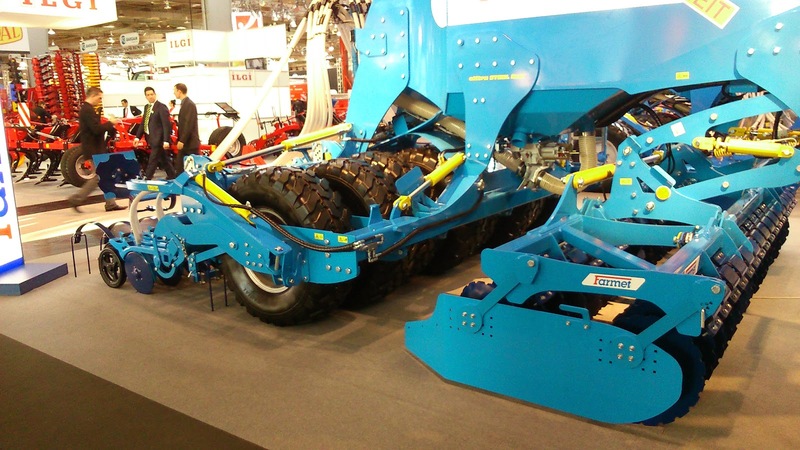 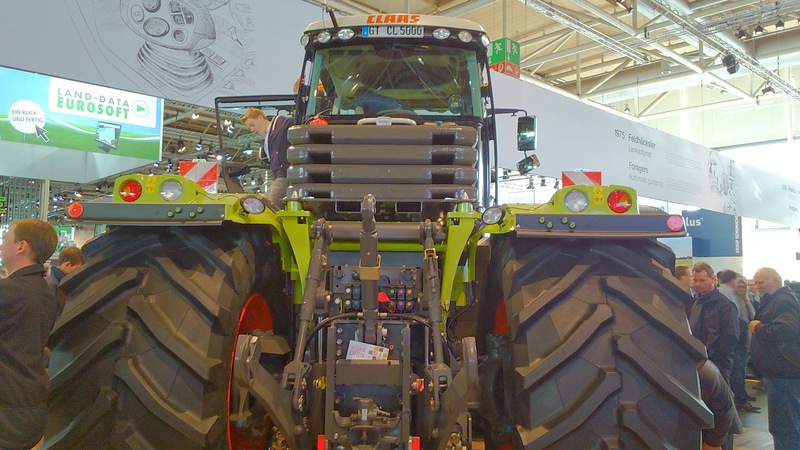 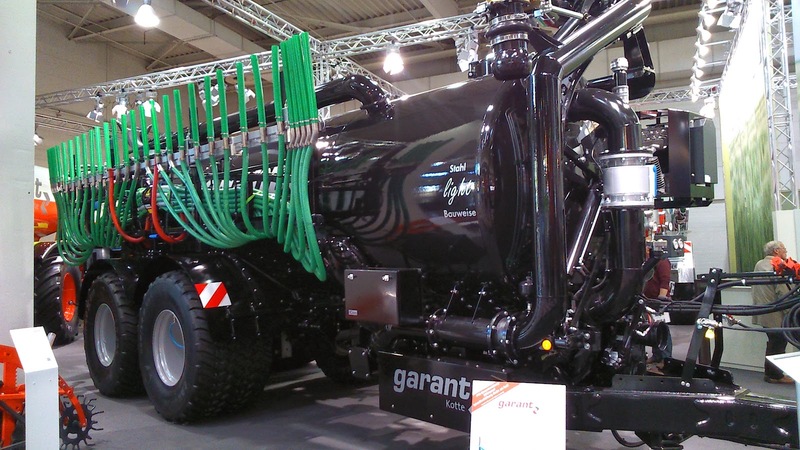 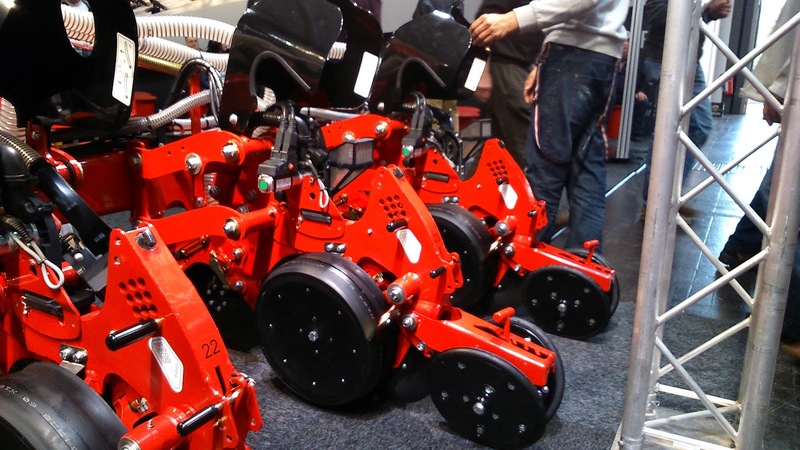 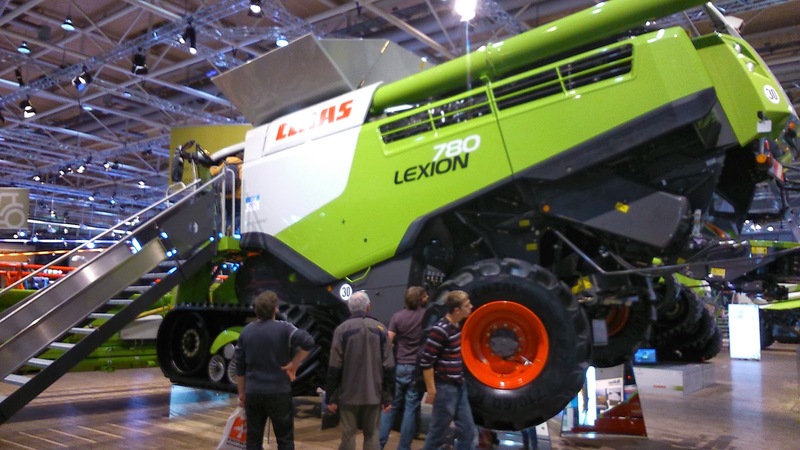 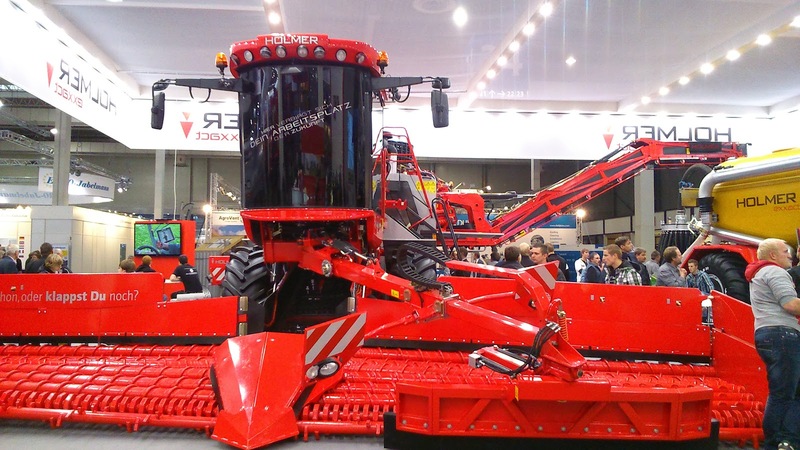 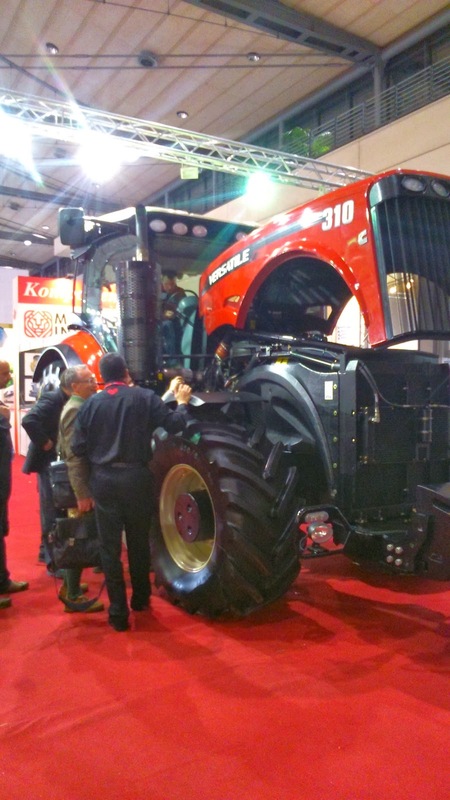 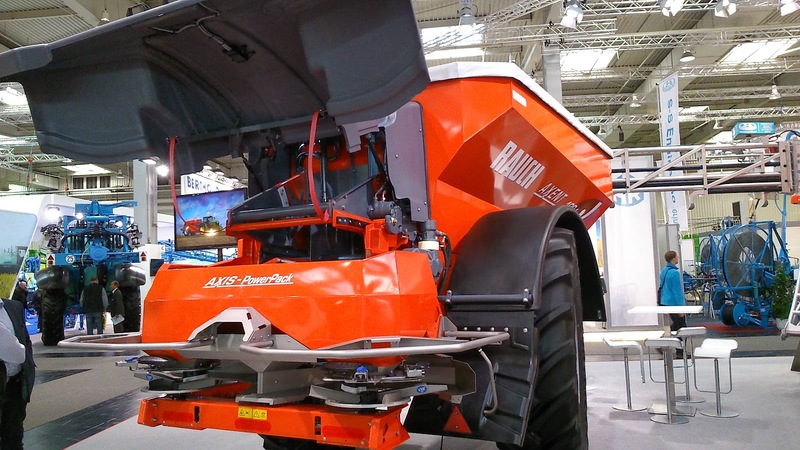 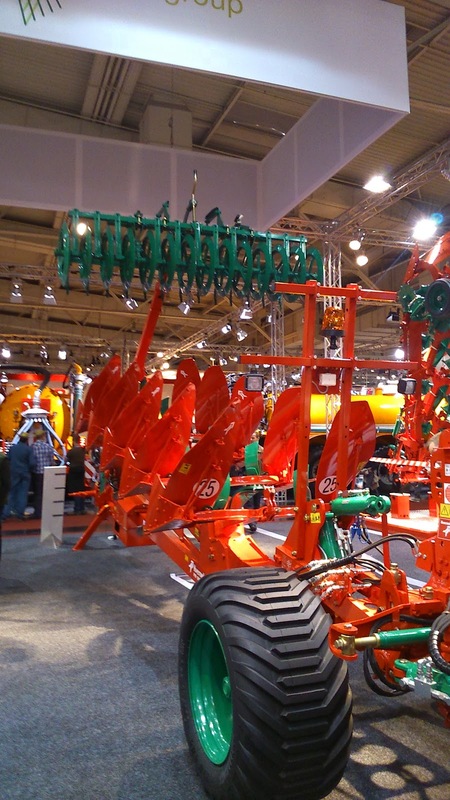 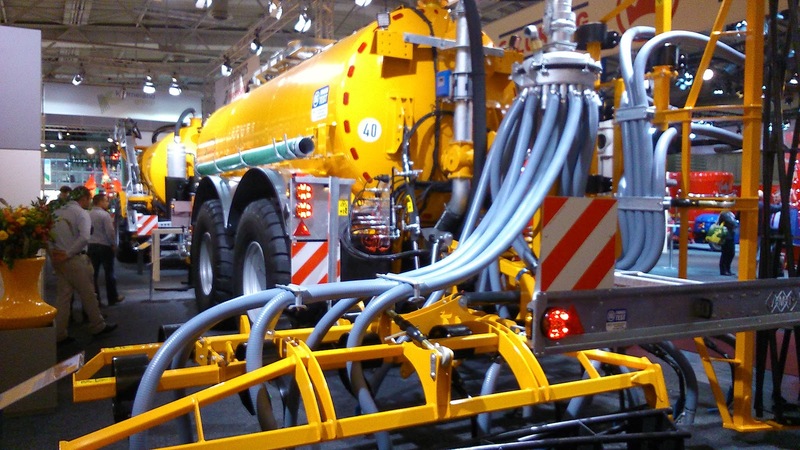 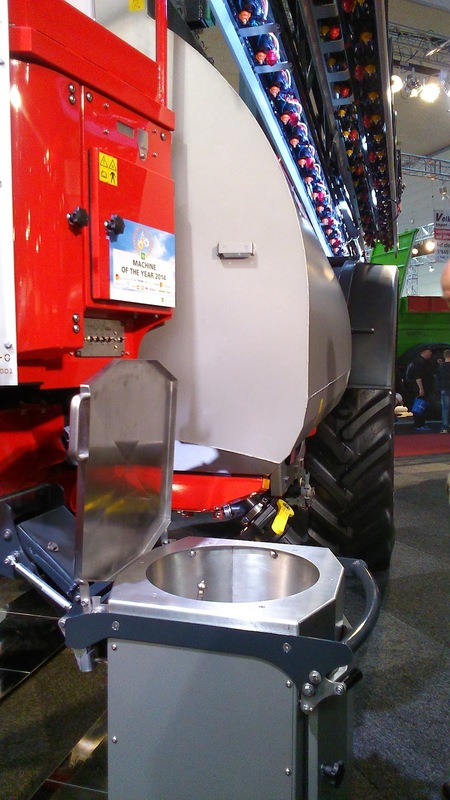 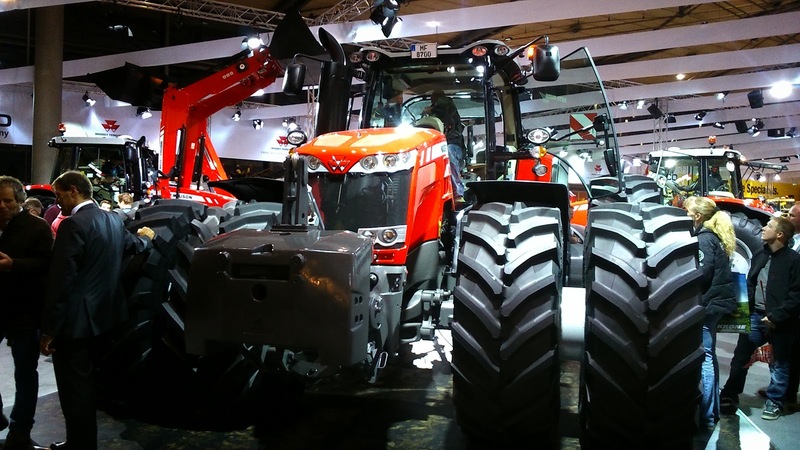 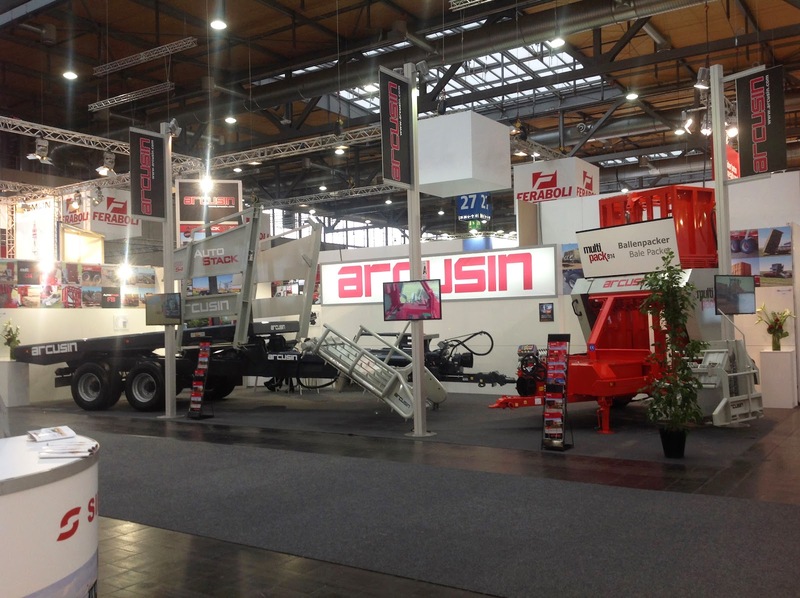 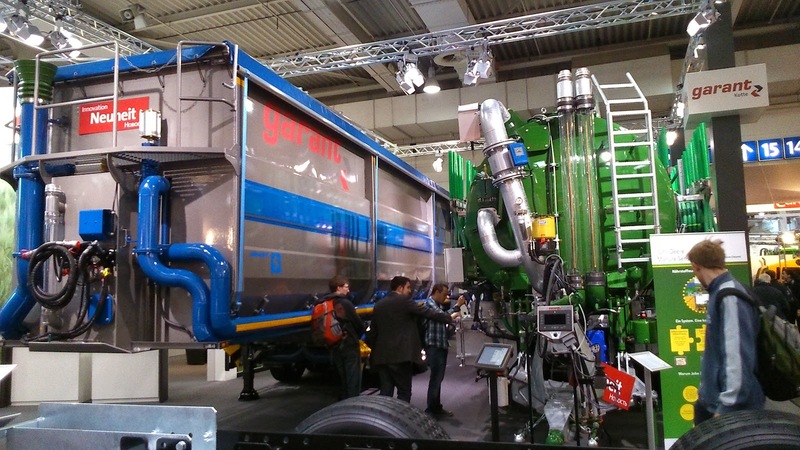 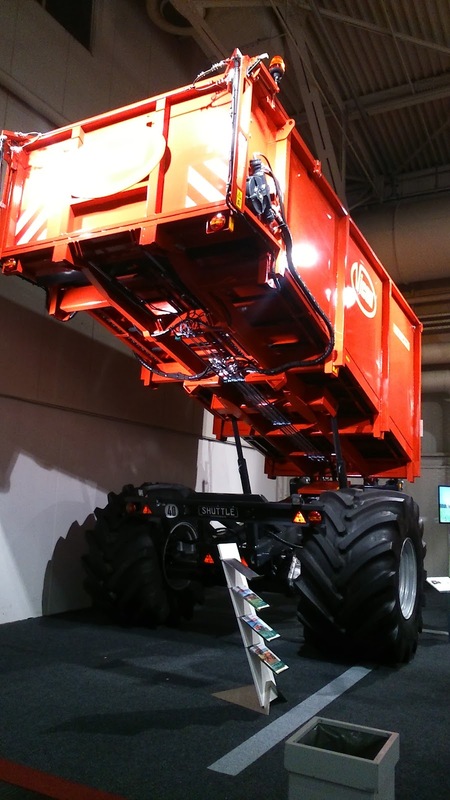 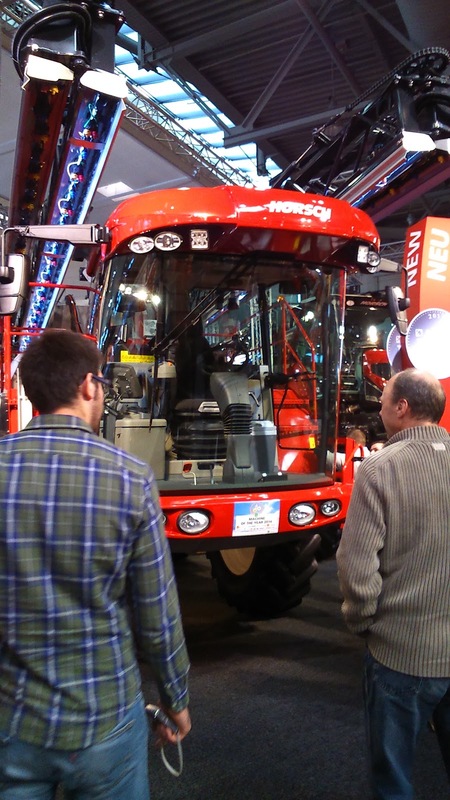 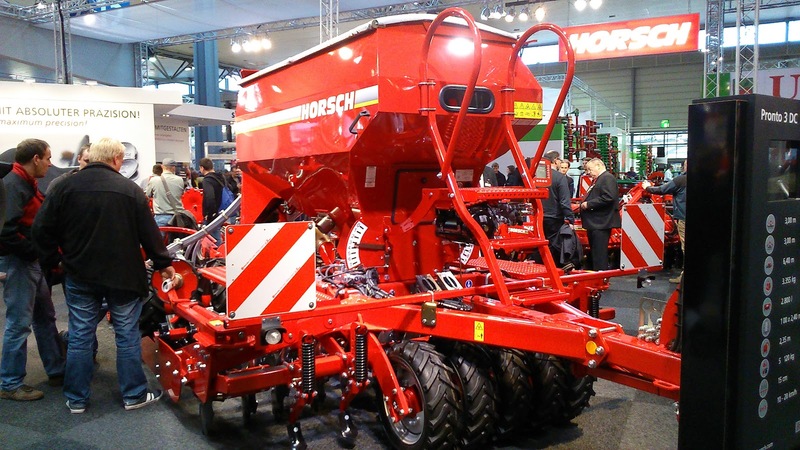 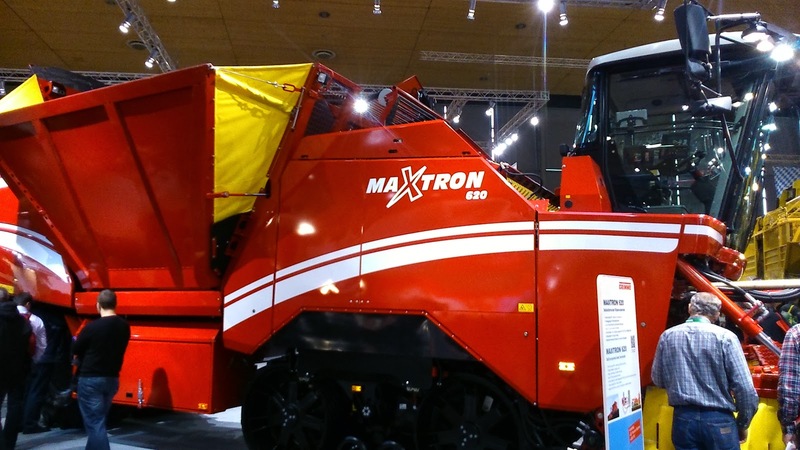 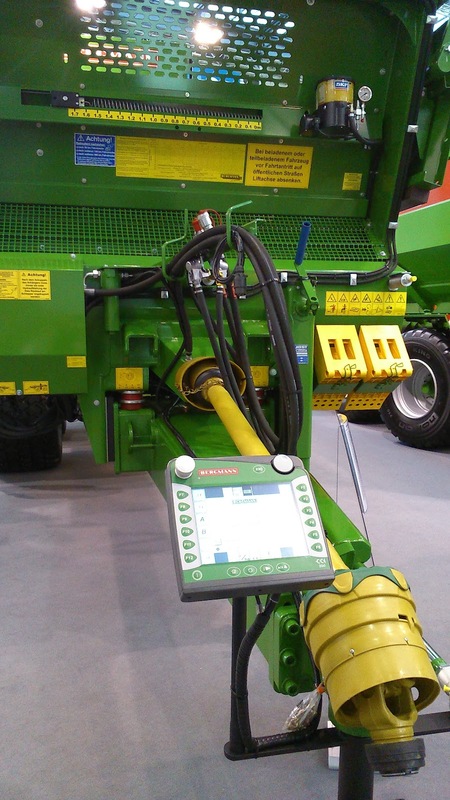 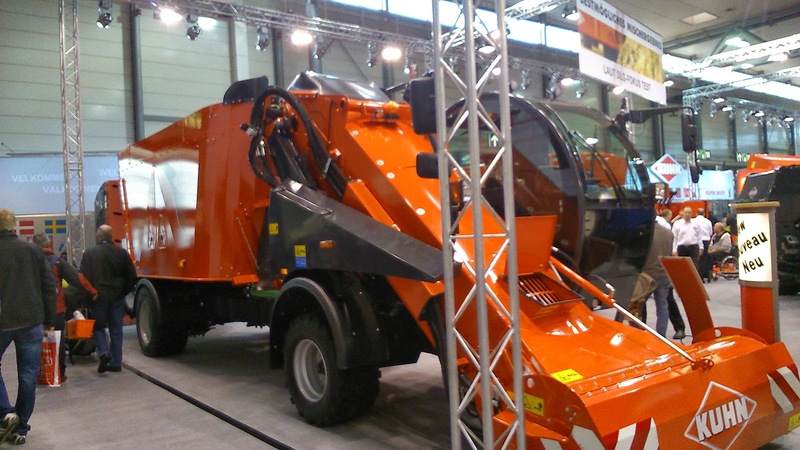 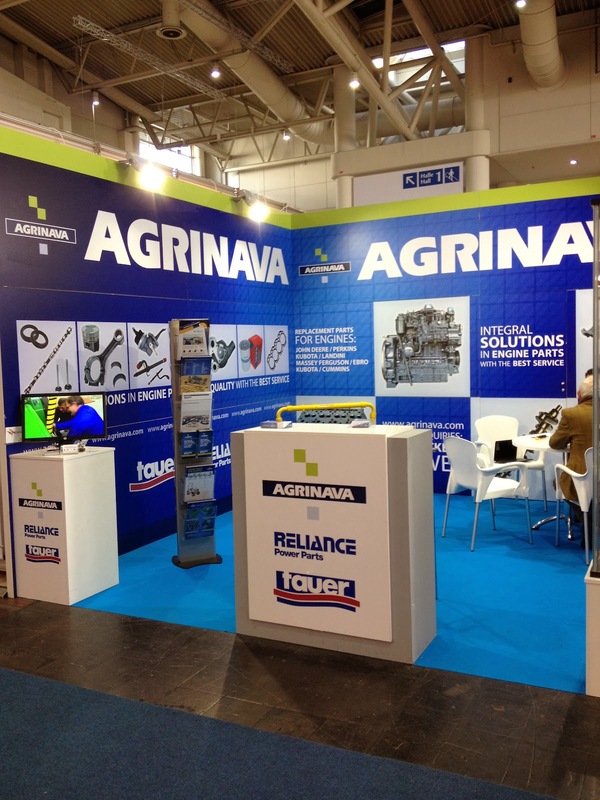 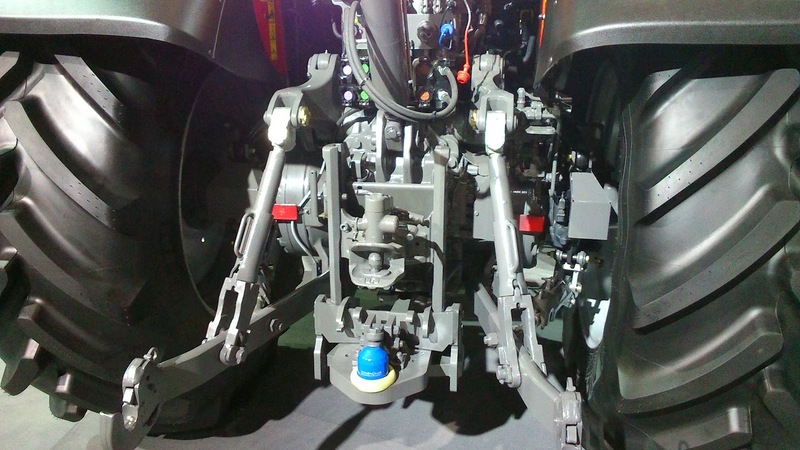 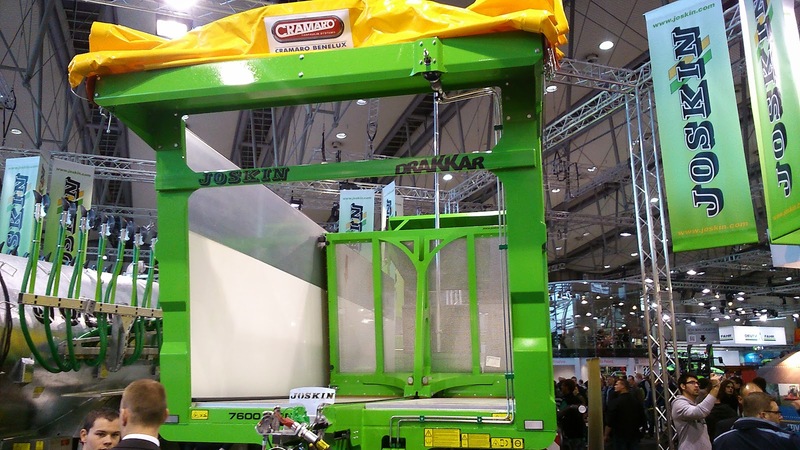 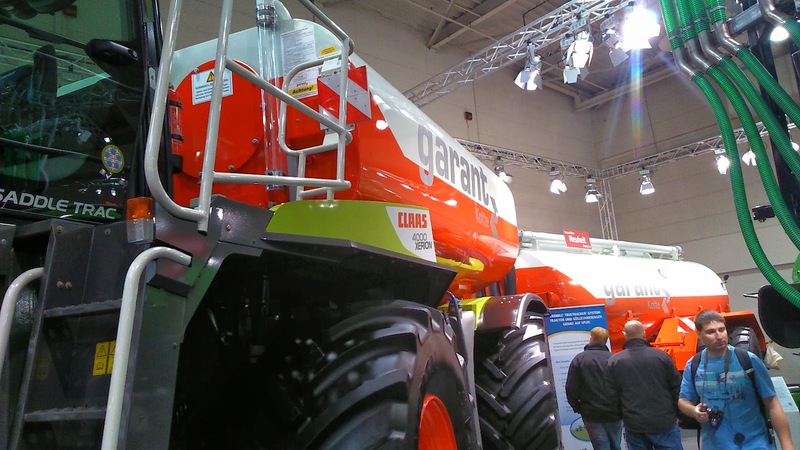 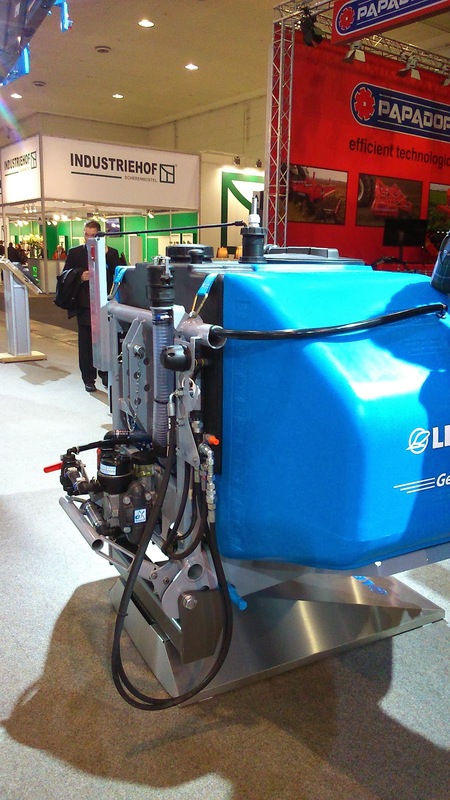 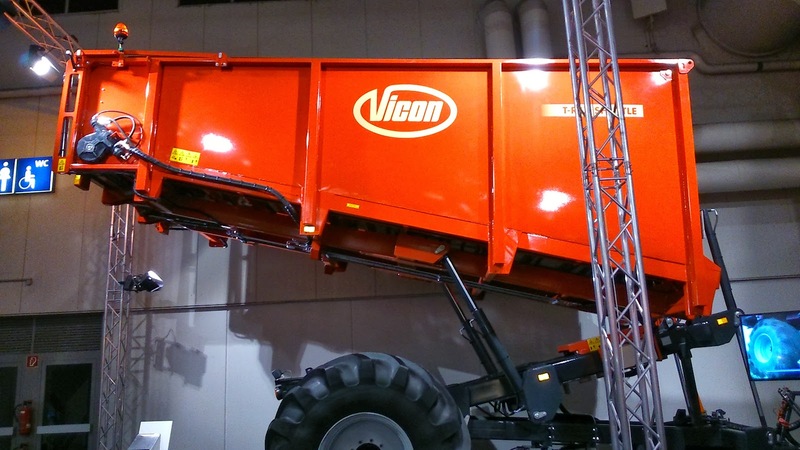 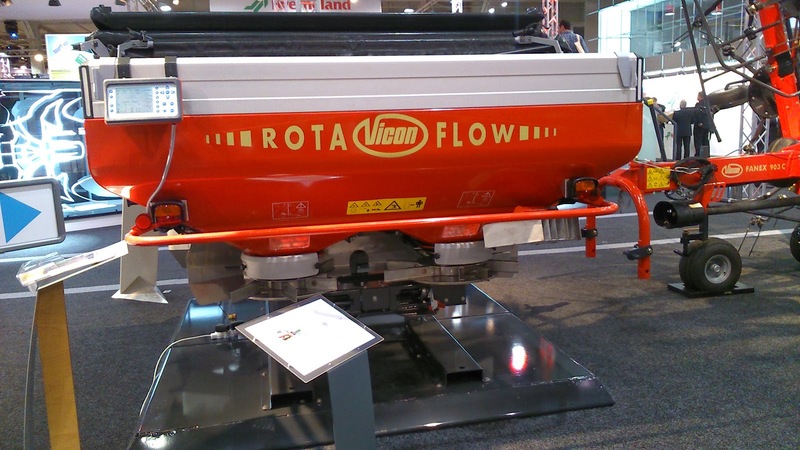 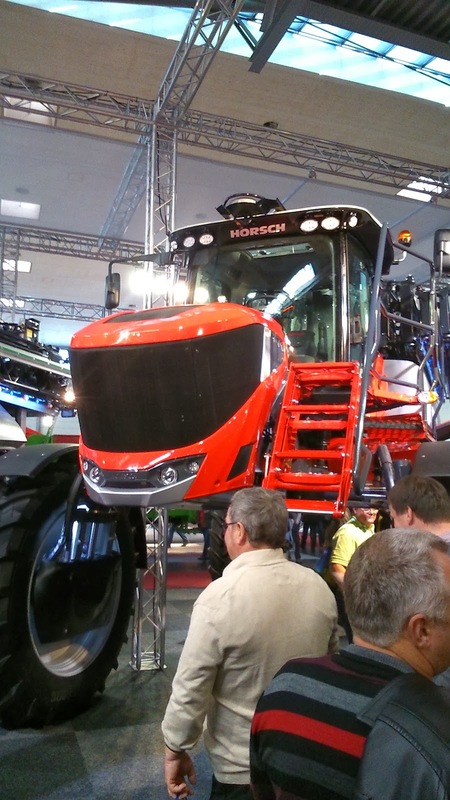 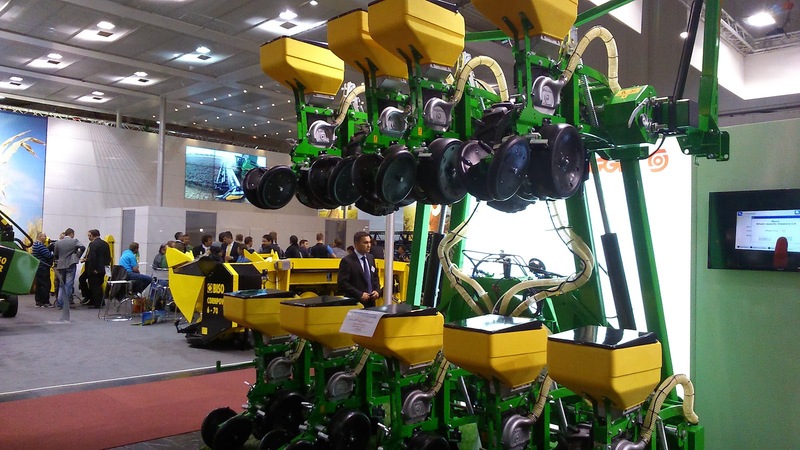 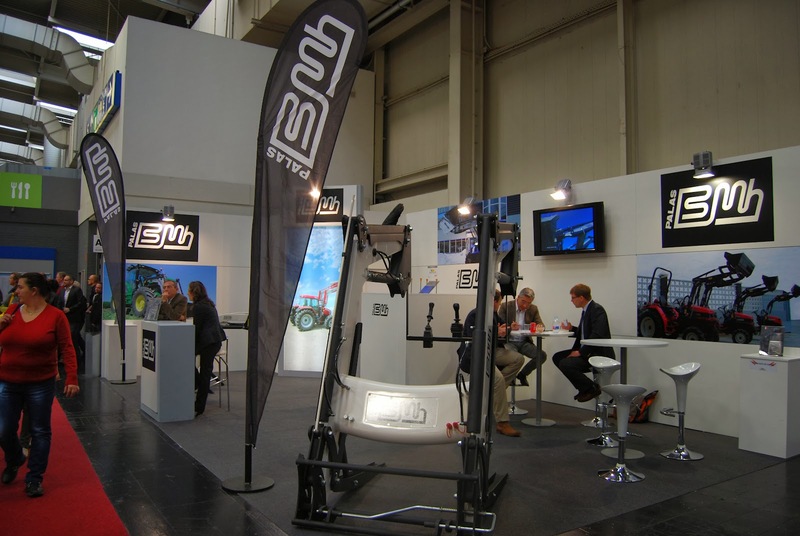 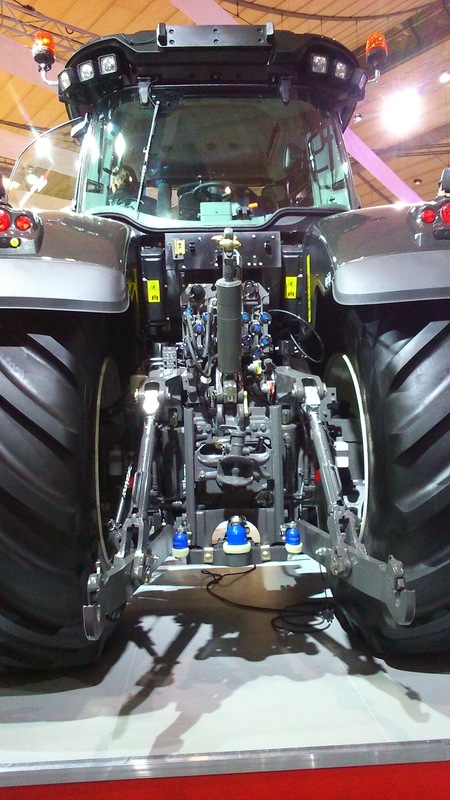 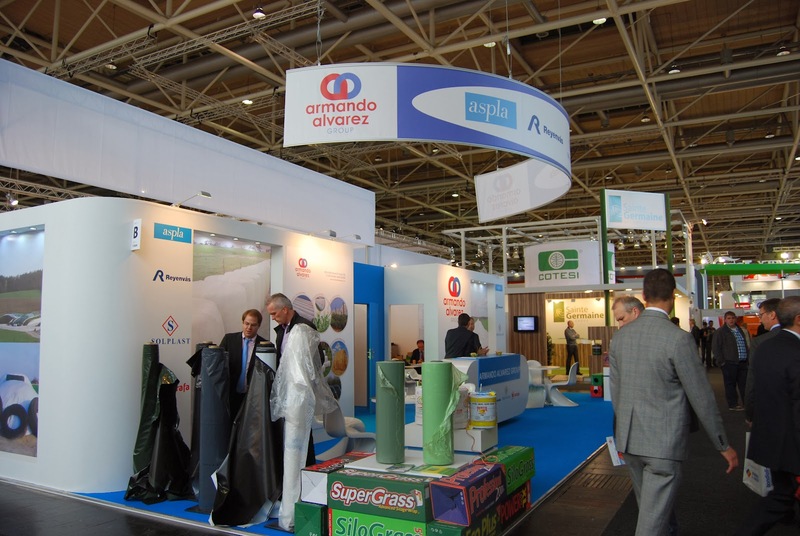 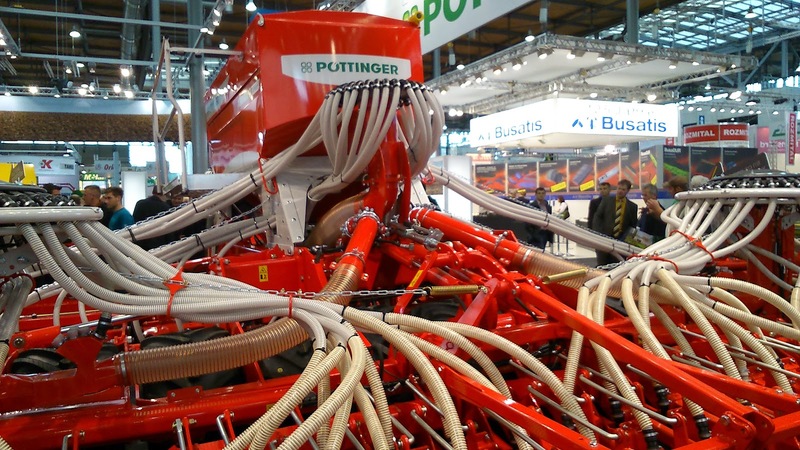 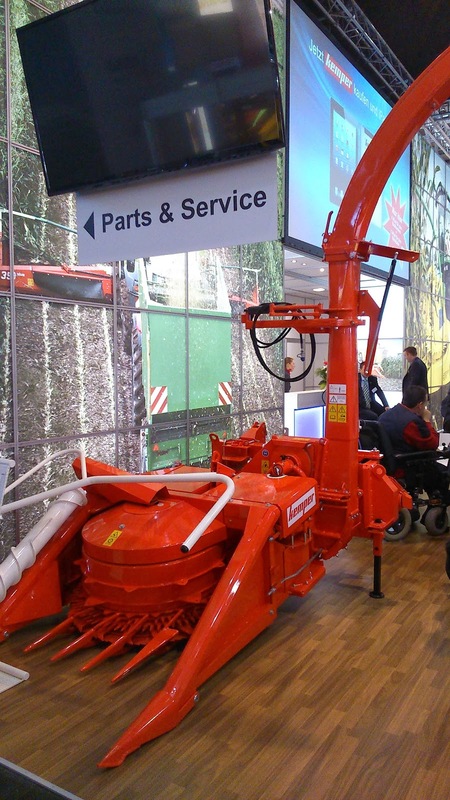 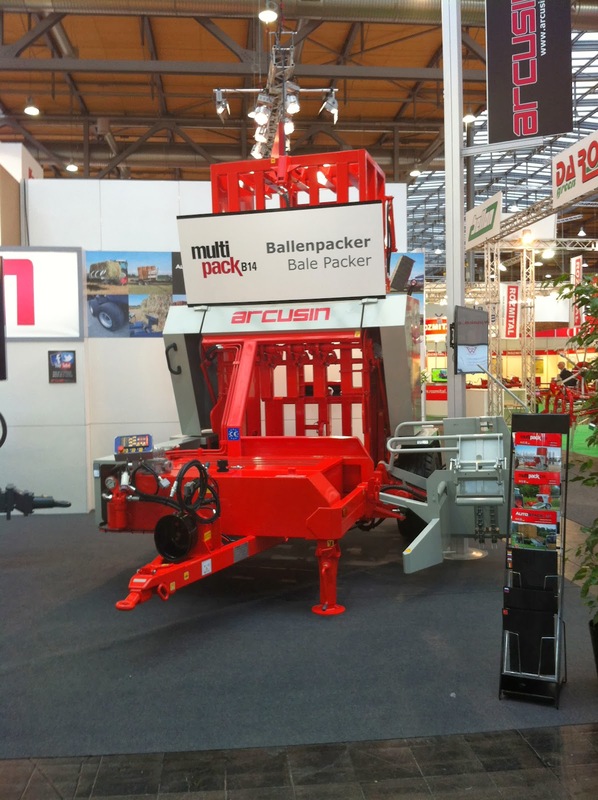 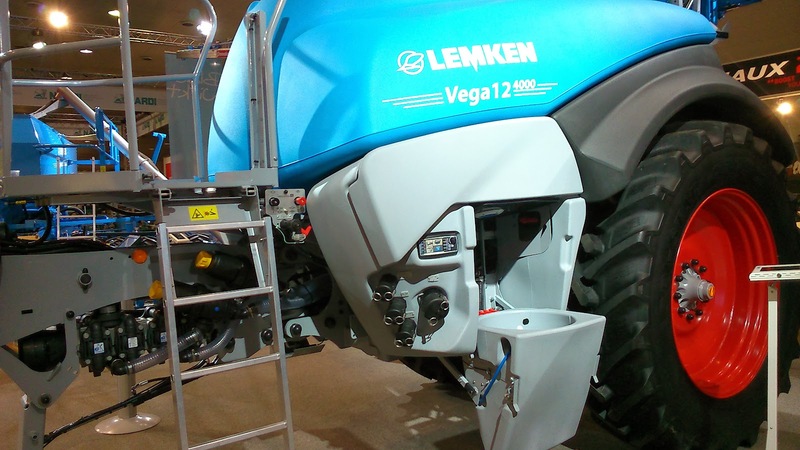 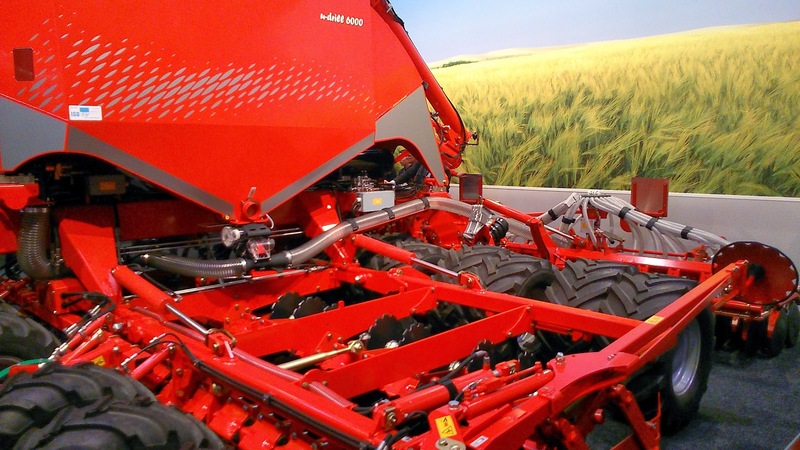 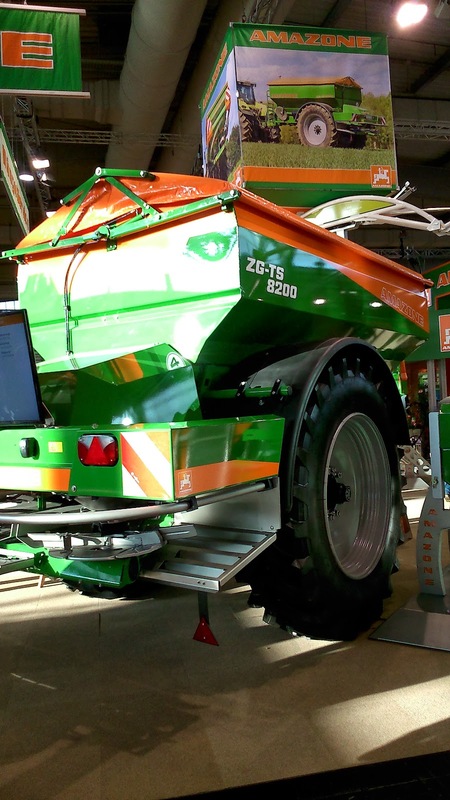 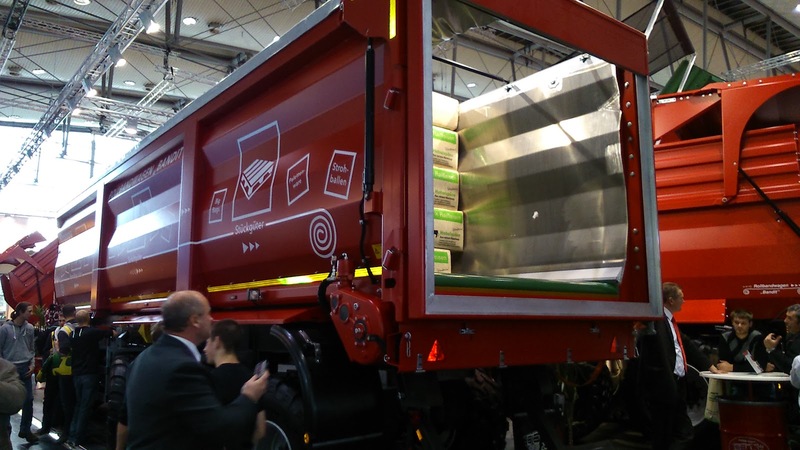 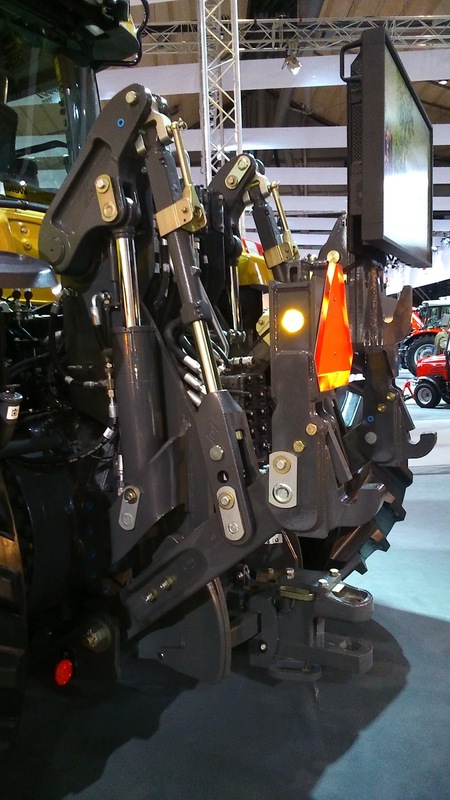 The most important farm fair in the world, Agritechnica (with 320,000 m2, over 2,700 exhibitors and over 400,000 visitors) took place last week in Hannover (Germany). 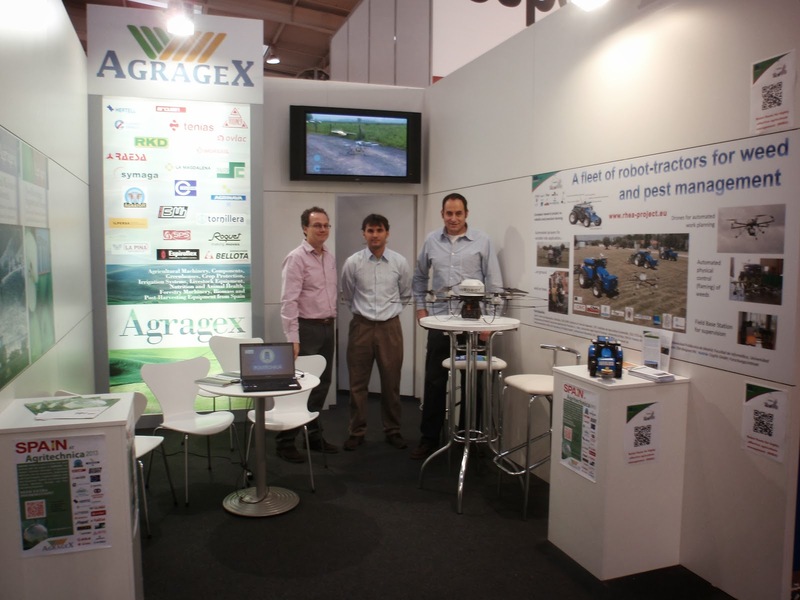 Our good friend Alberto Barrio (he's from Turégano-Segovia) was lucked and could visit the farm fair during three days together with a few of our sponsors (Bellota and MX) and other brands (Arcusin, AGRAGEX and Hew Holland), who sent us their pictures... we think we'll create a nice photo gallery, thank you. 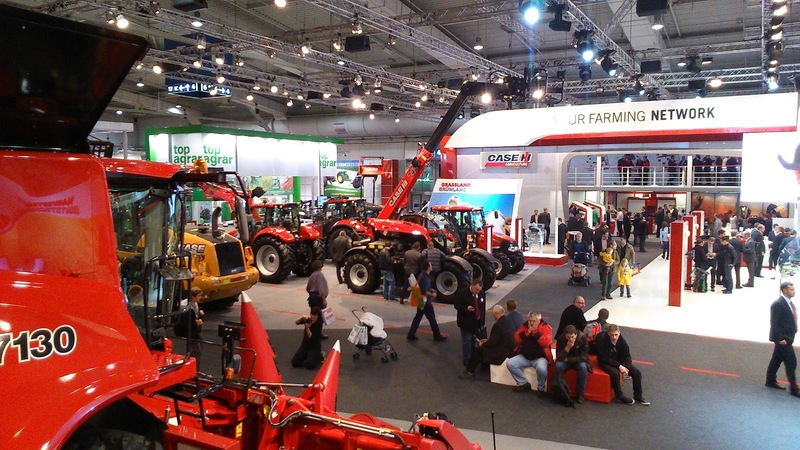 Alberto told us the farm fair was majestic and there were a large amount of products so you were not able to see everything... 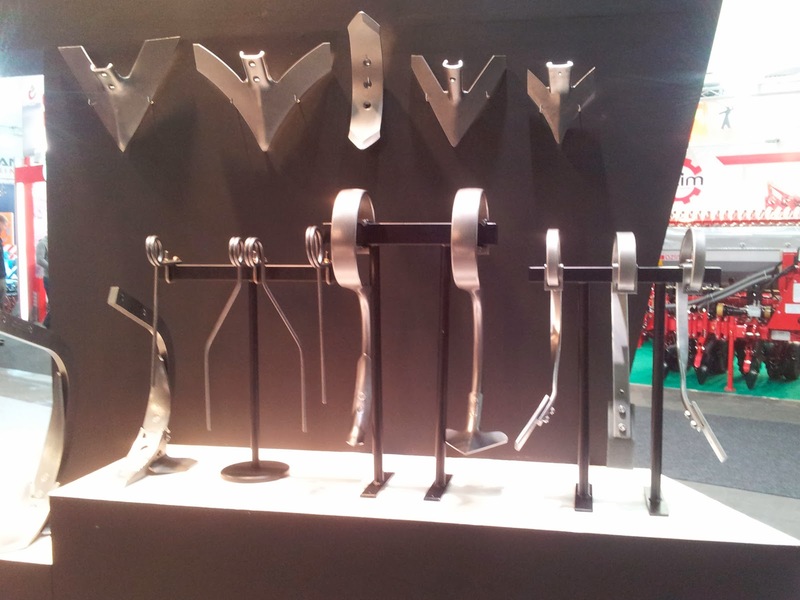 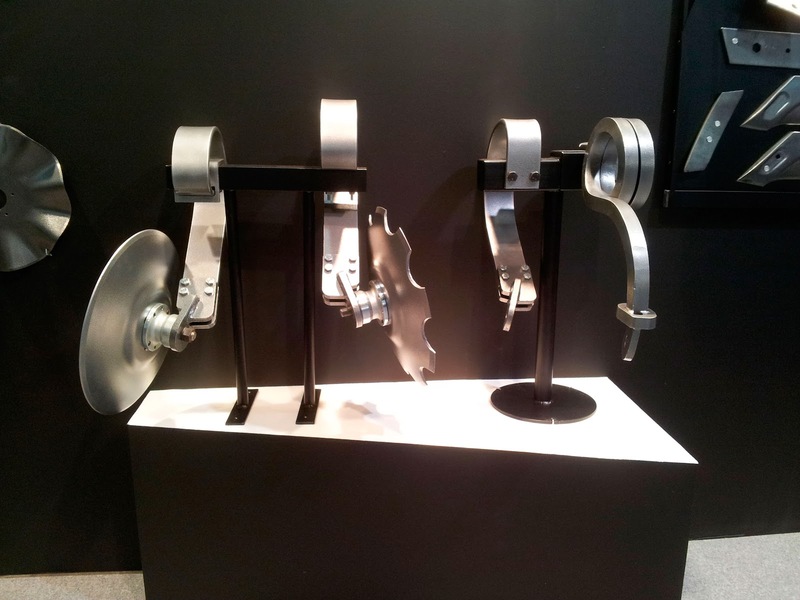 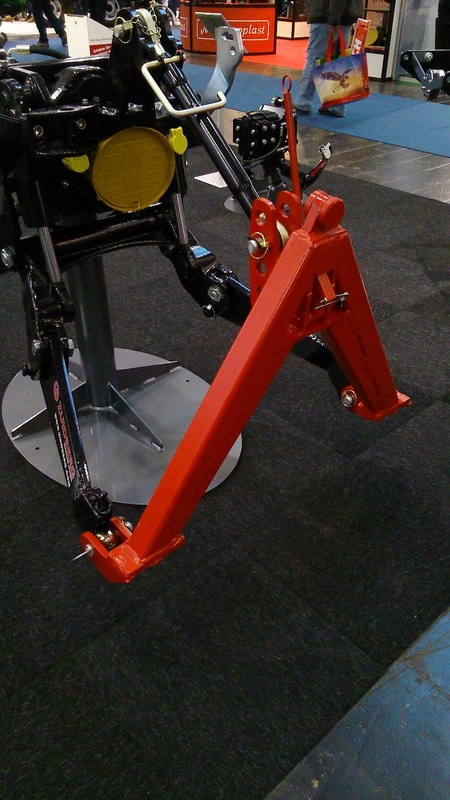 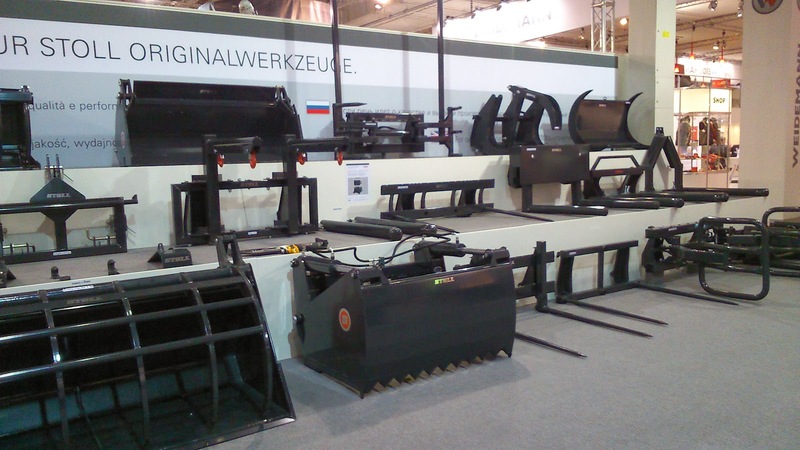 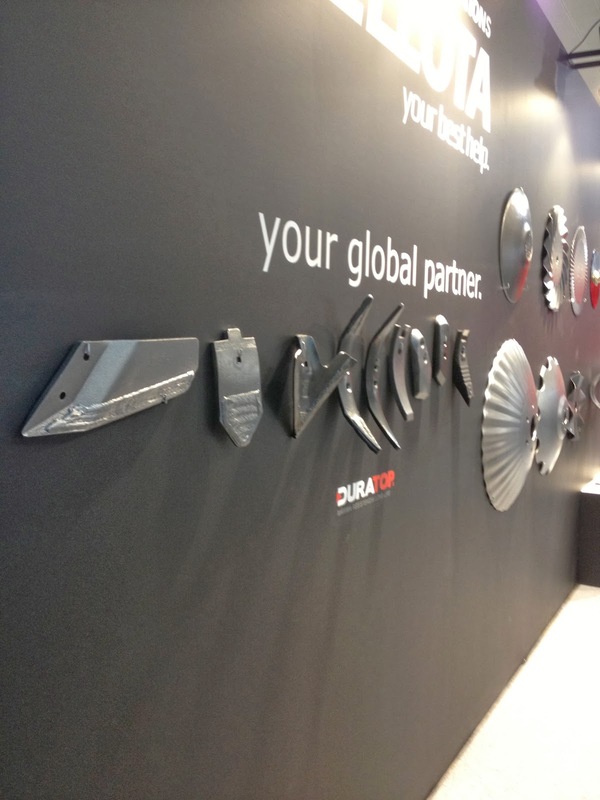 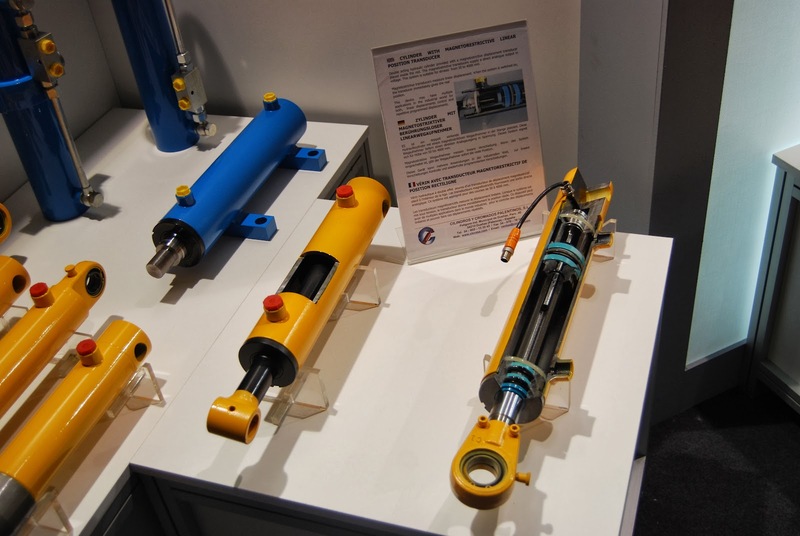 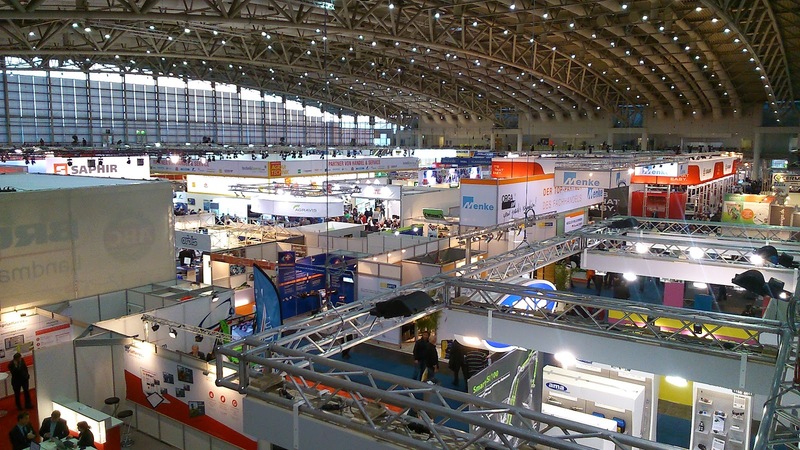 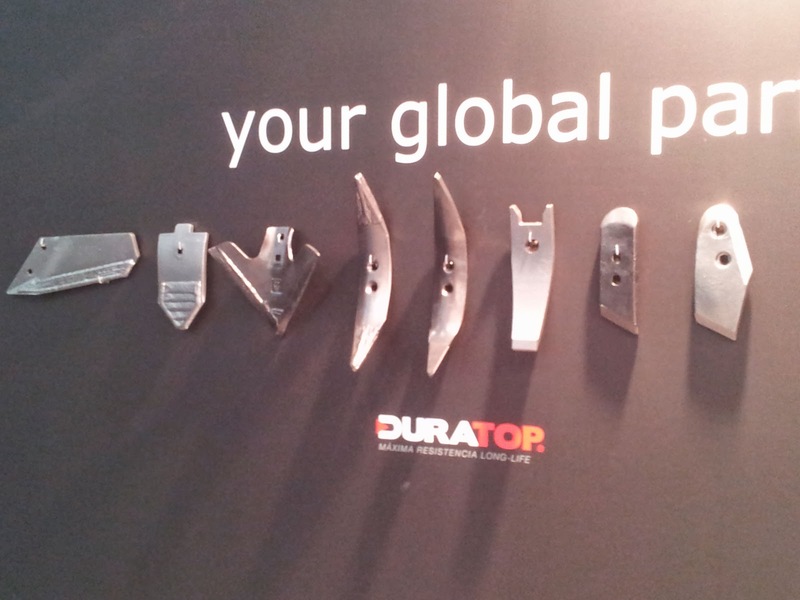 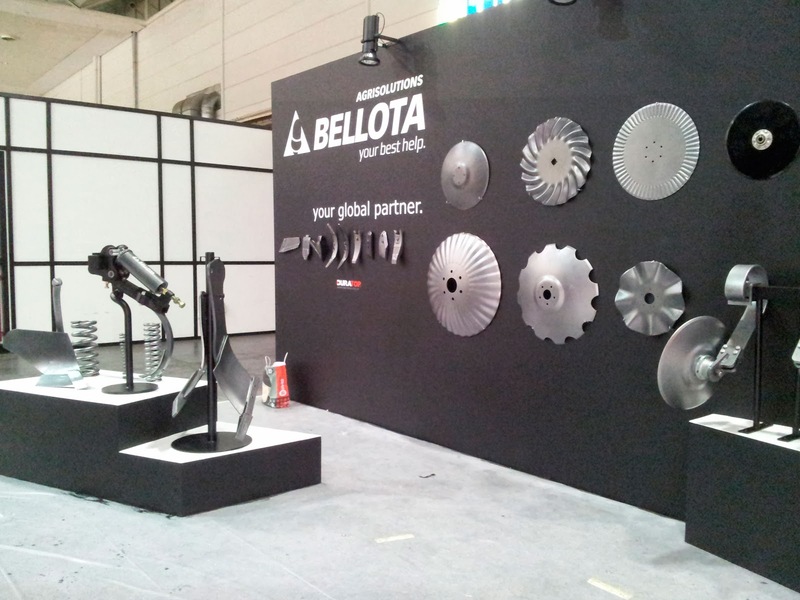 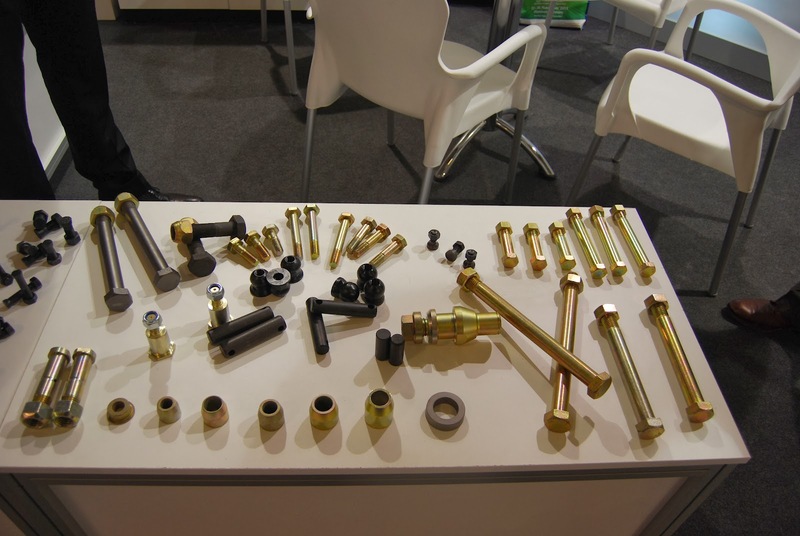 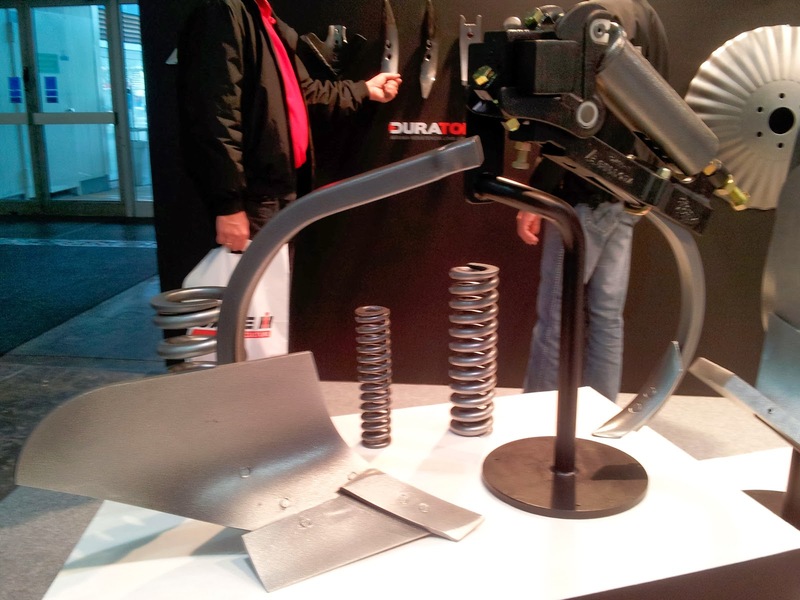 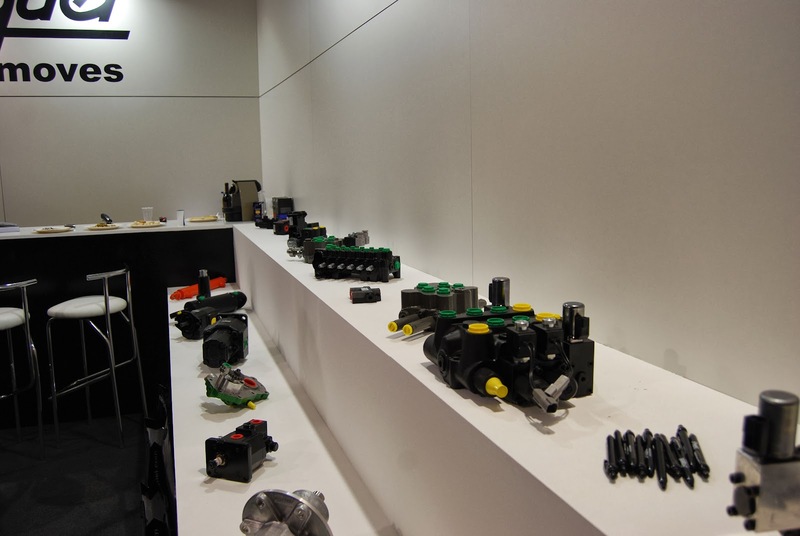 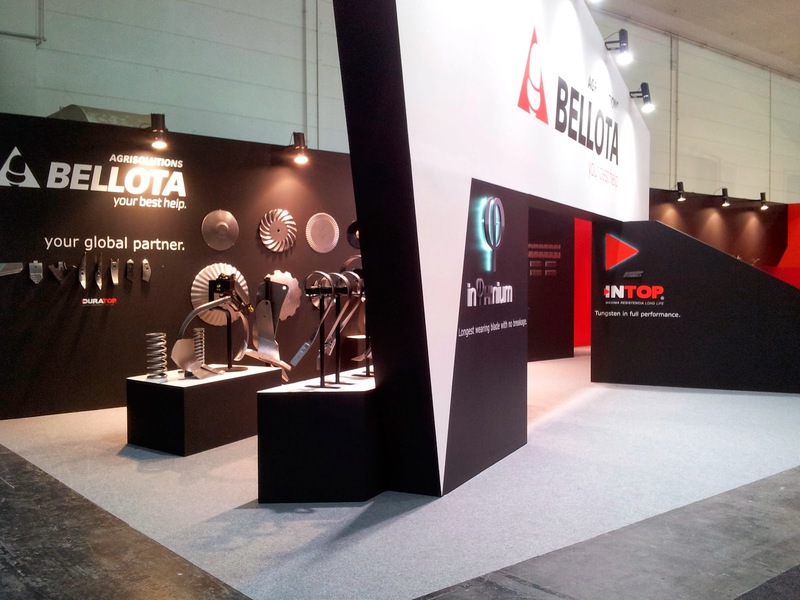 e.g., there were hundreds of stands about parts where you can find thousands kinds of them. 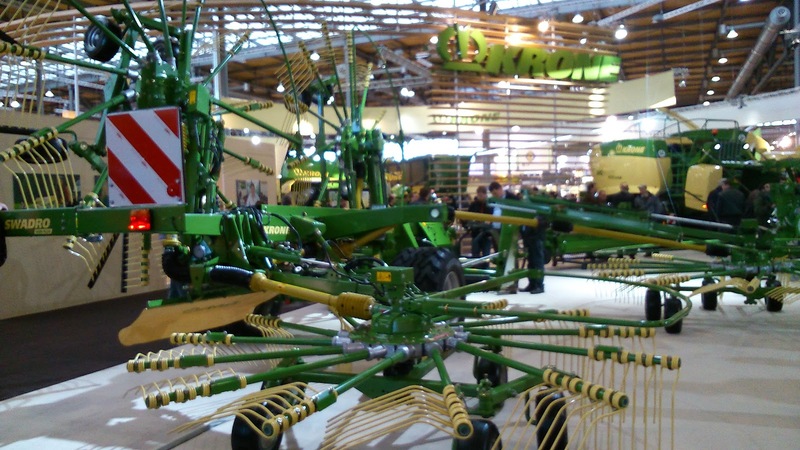 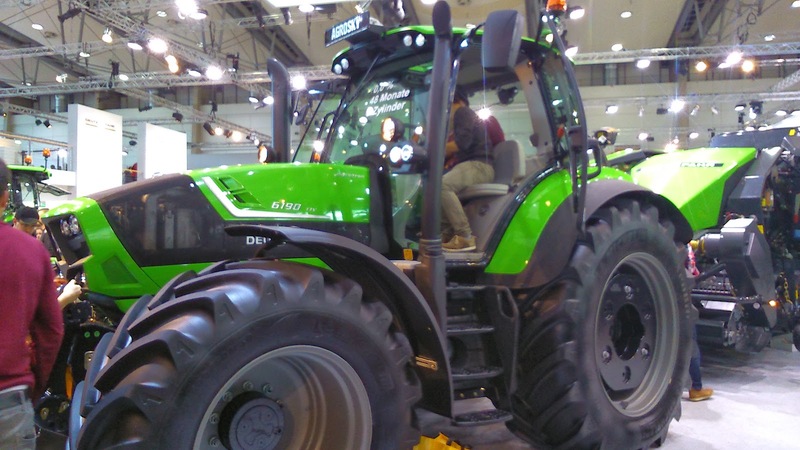 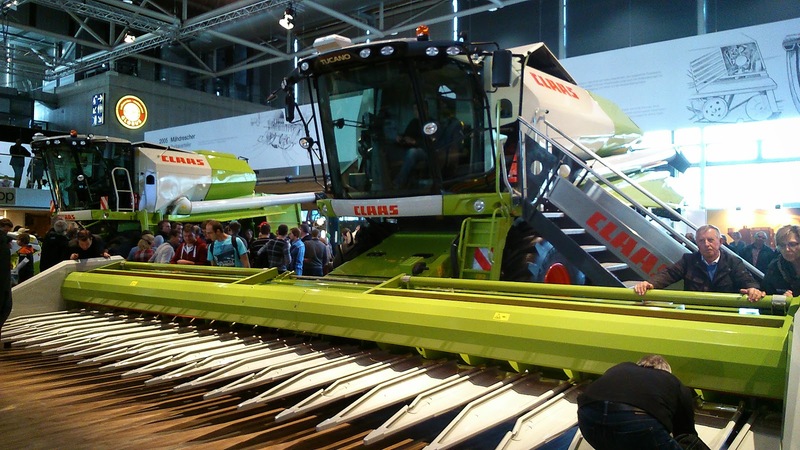 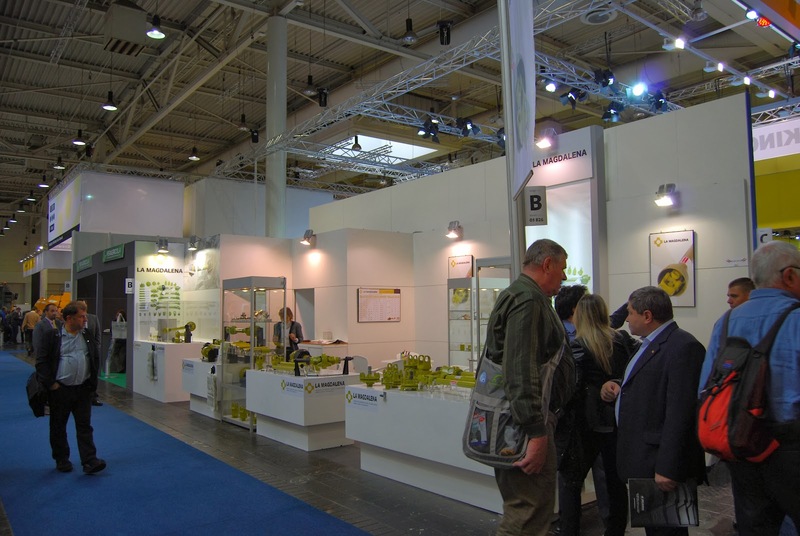 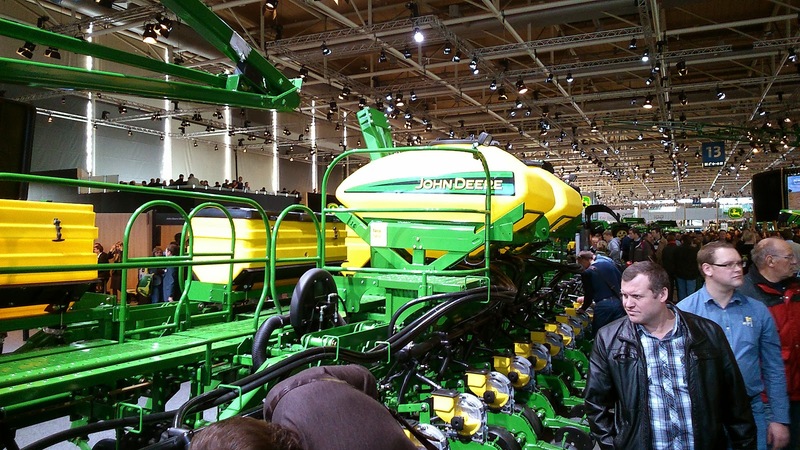 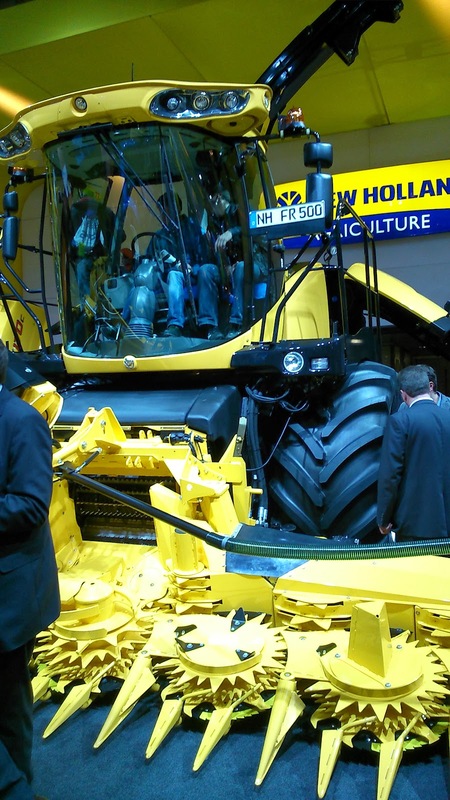 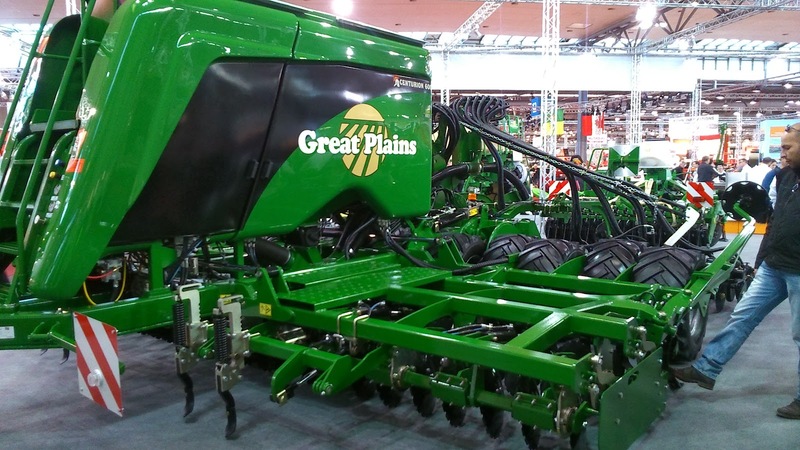 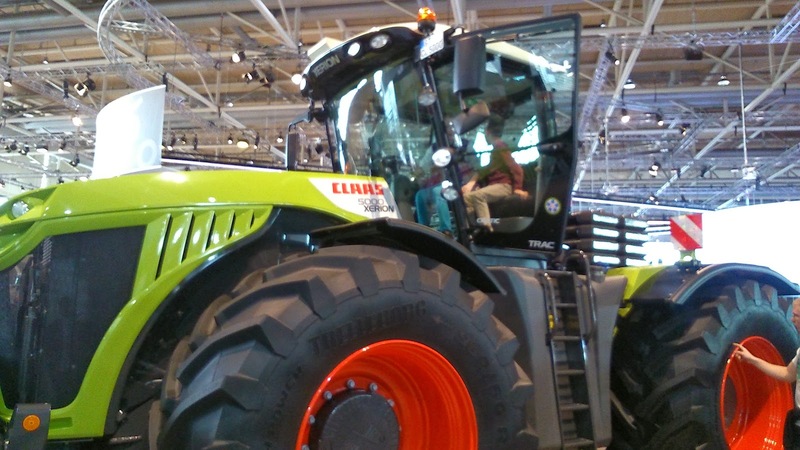 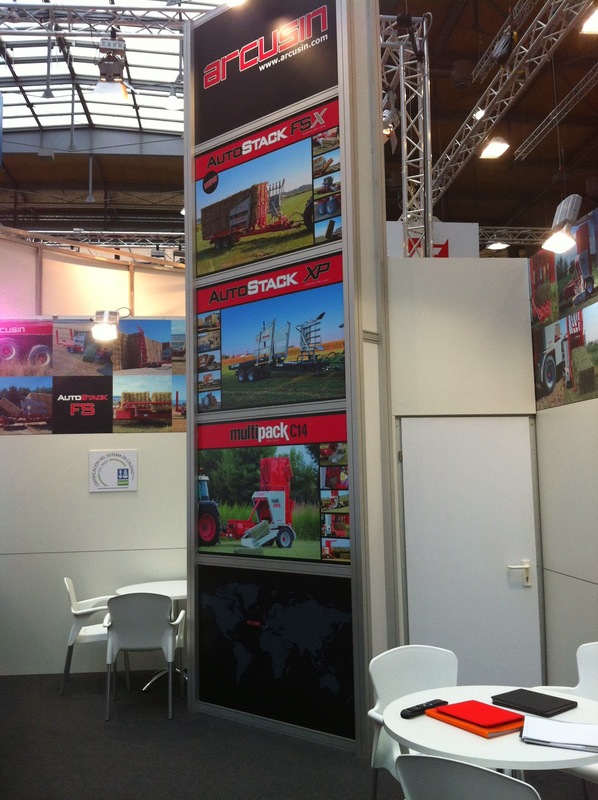 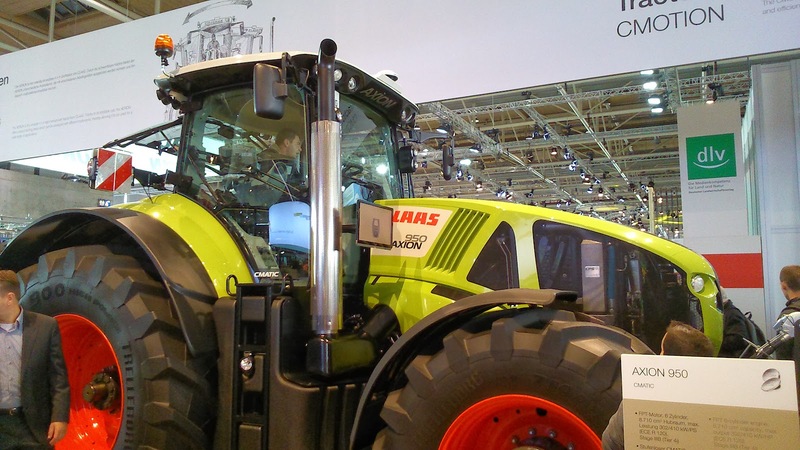 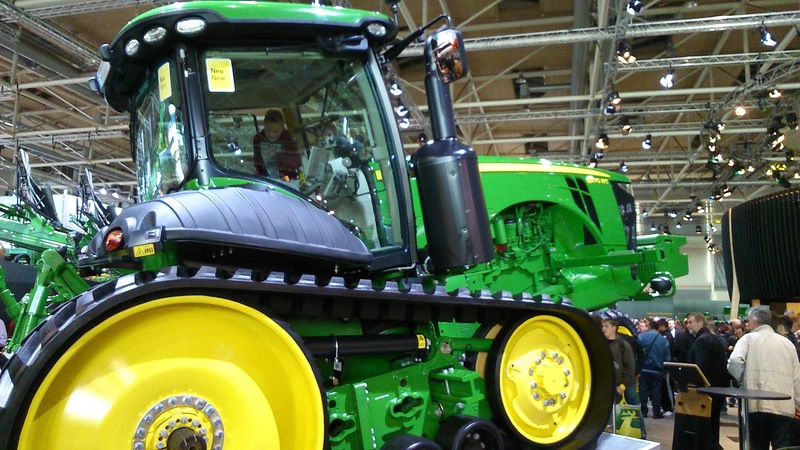 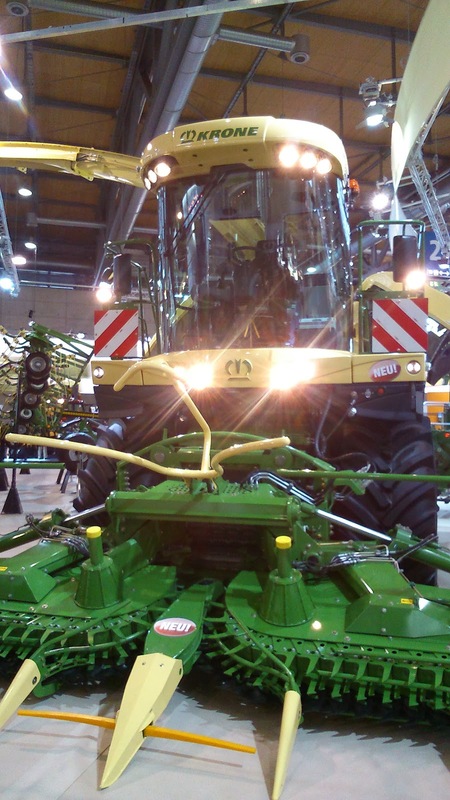 John Deere and Claas stands were the biggest ones... two leaders brands in the world trade. 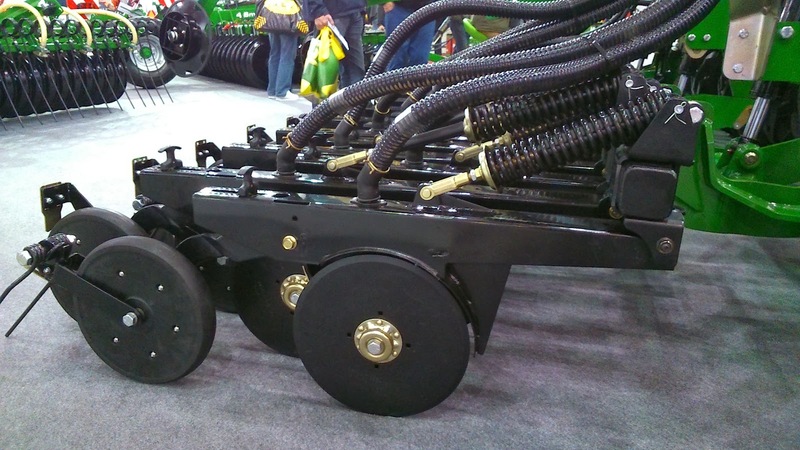 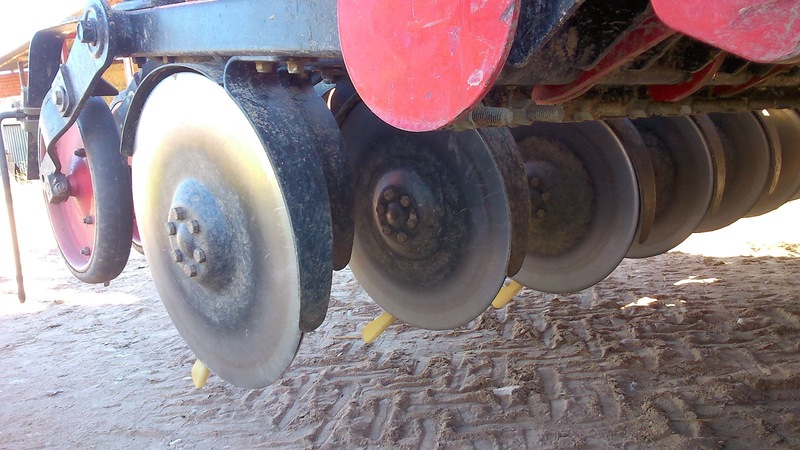 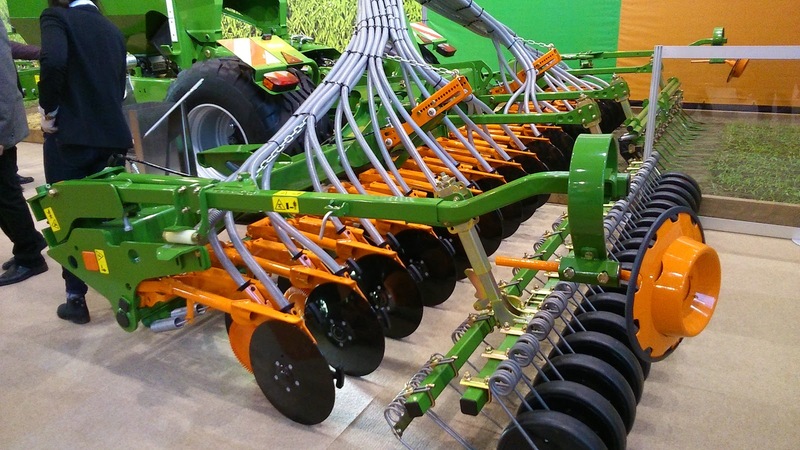 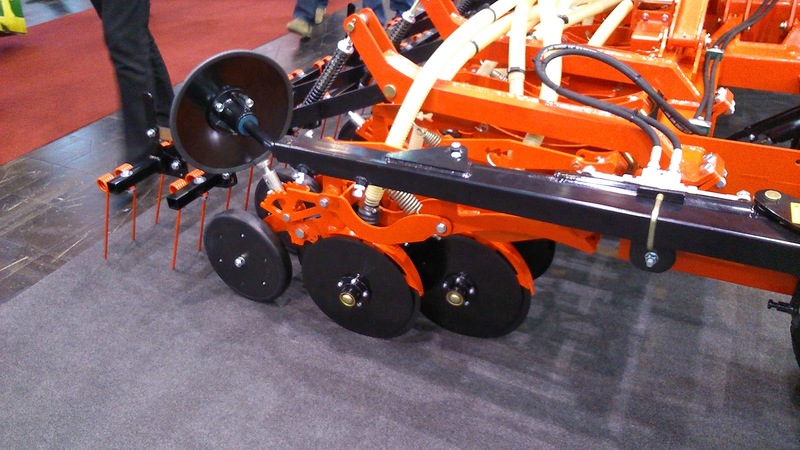 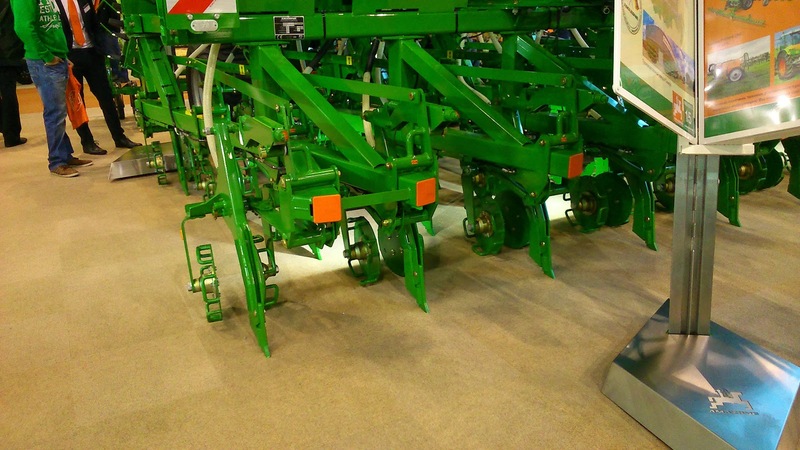 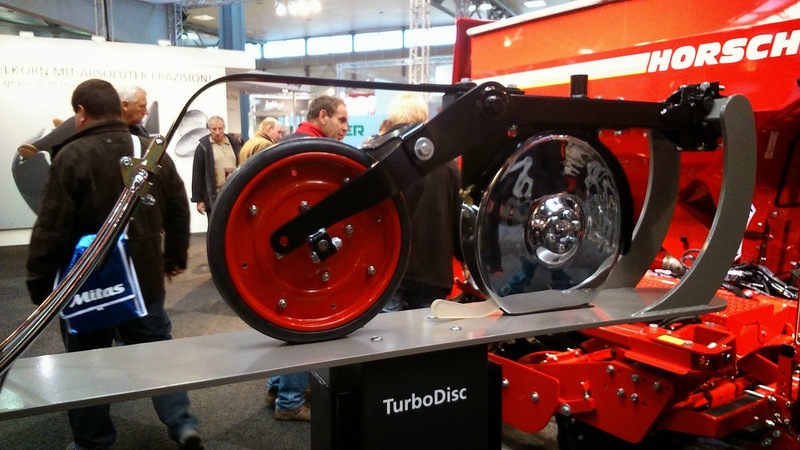 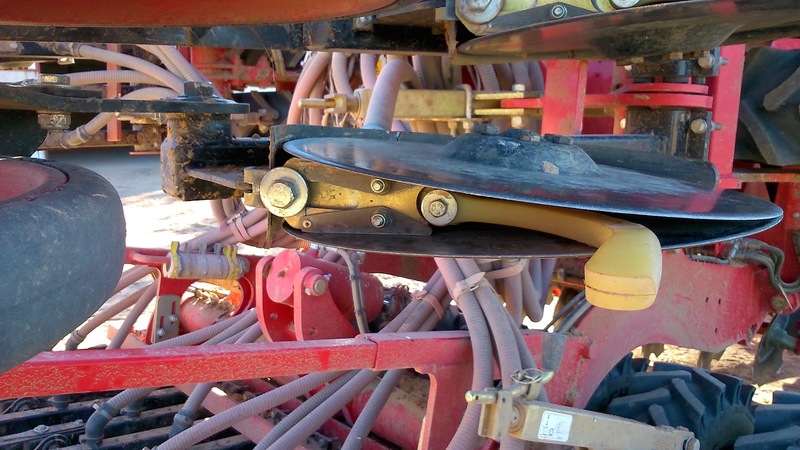 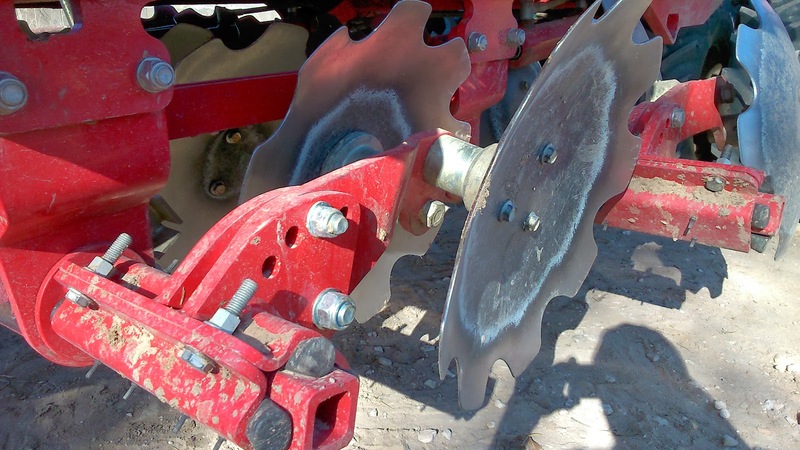 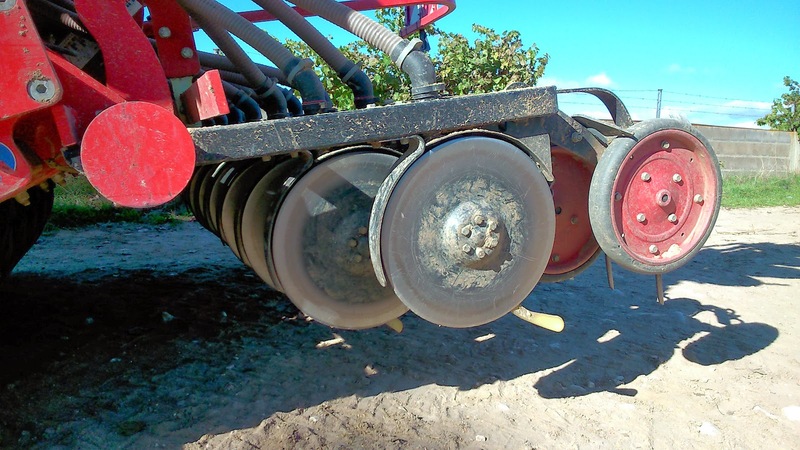 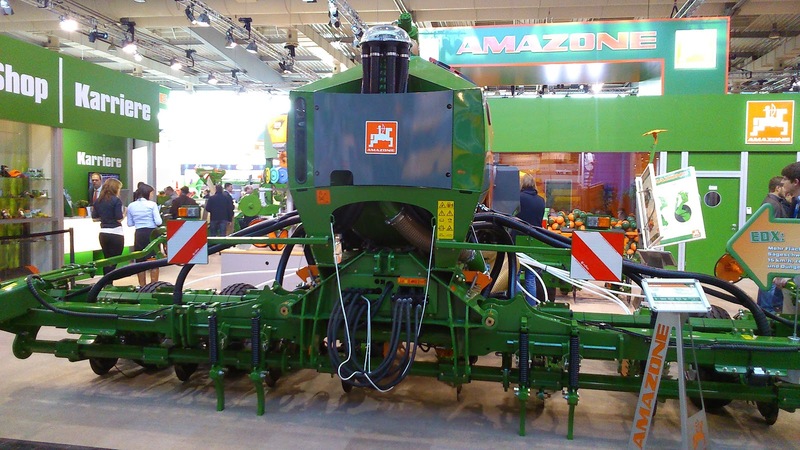 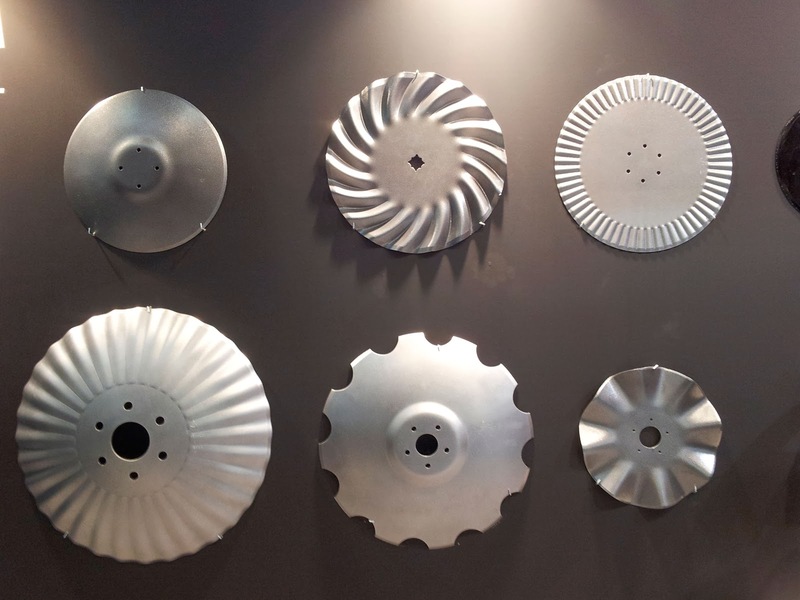 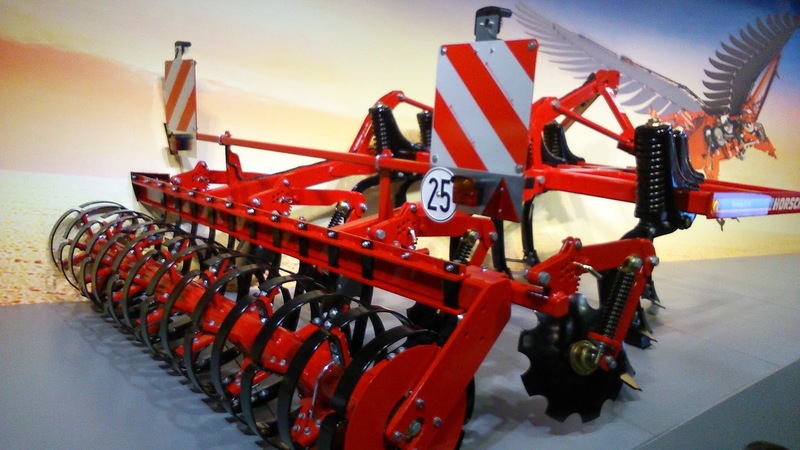 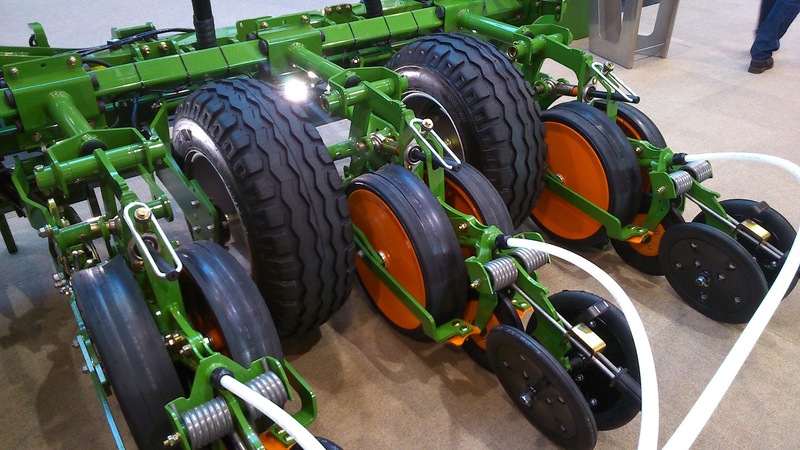 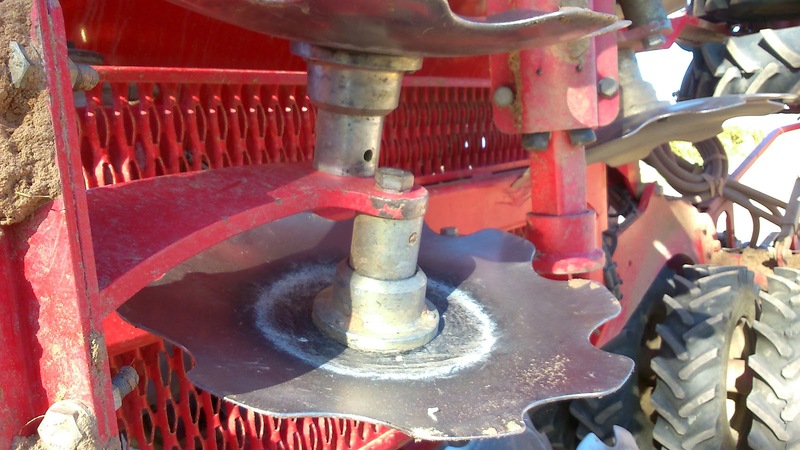 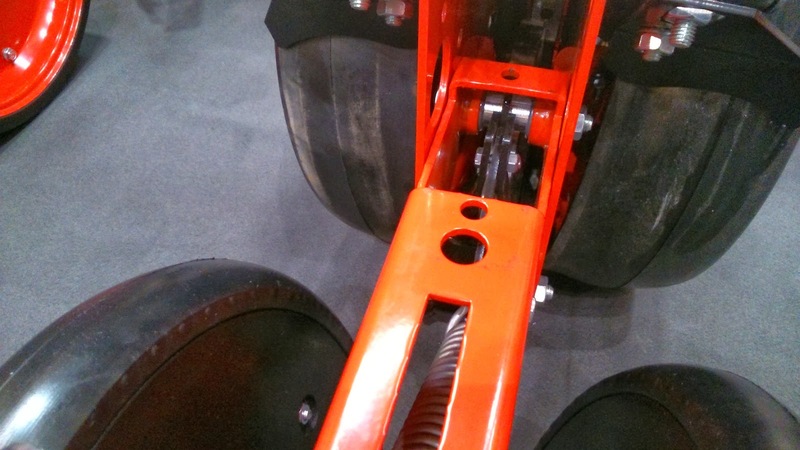 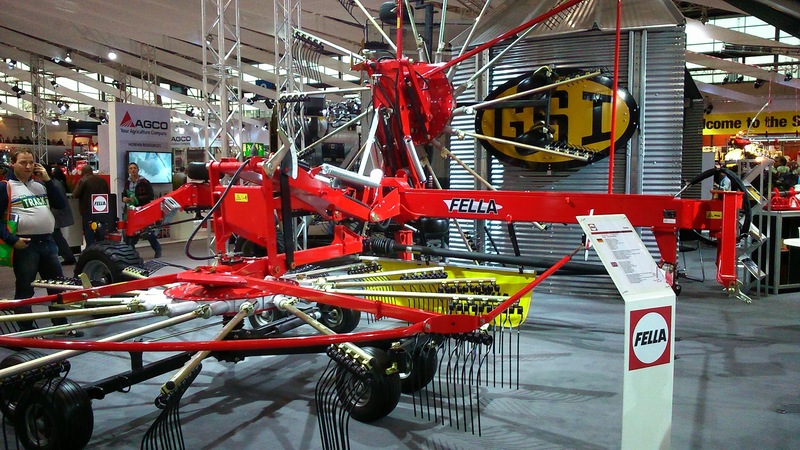 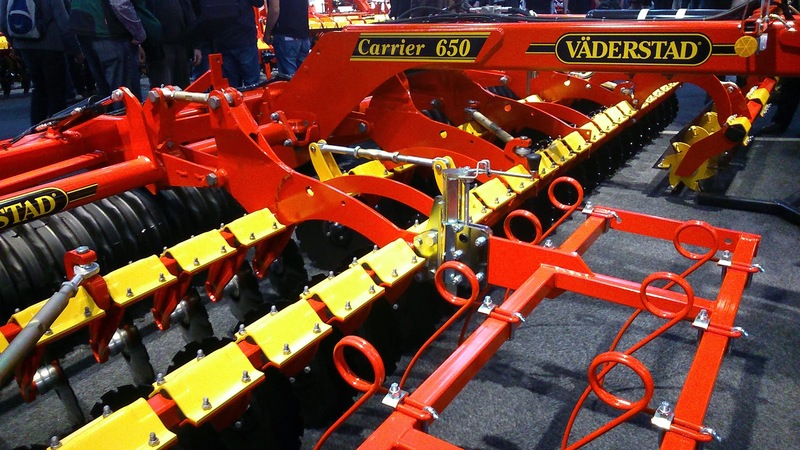 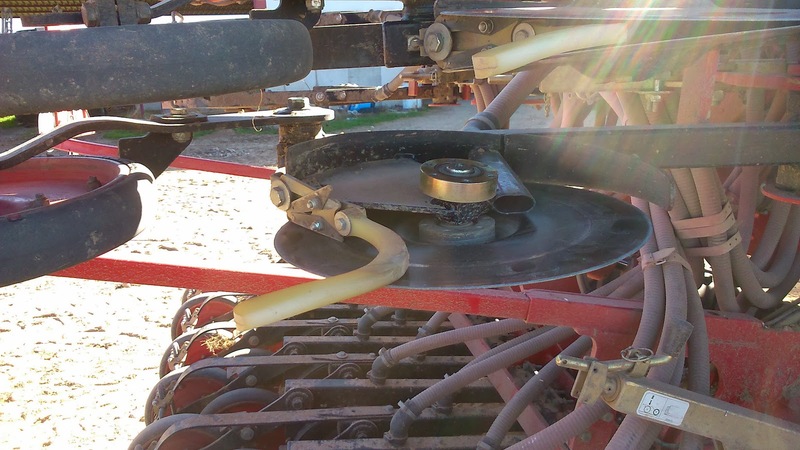 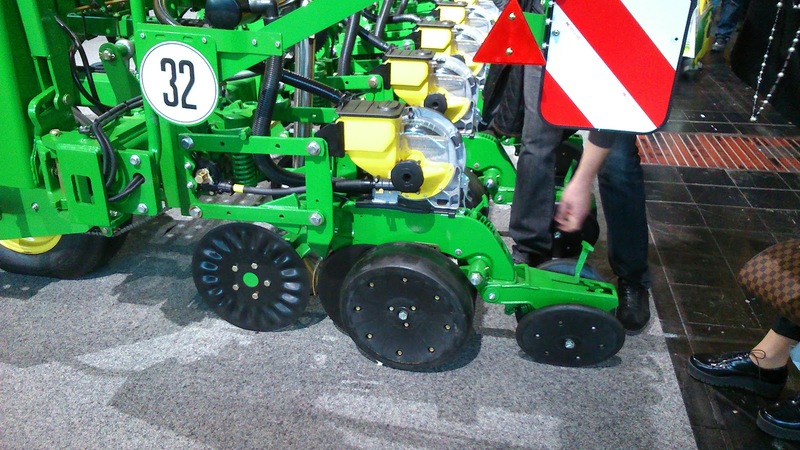 Another thing which should be highlighted, regarding Alberto's comments, is that all seed drills were of discs. 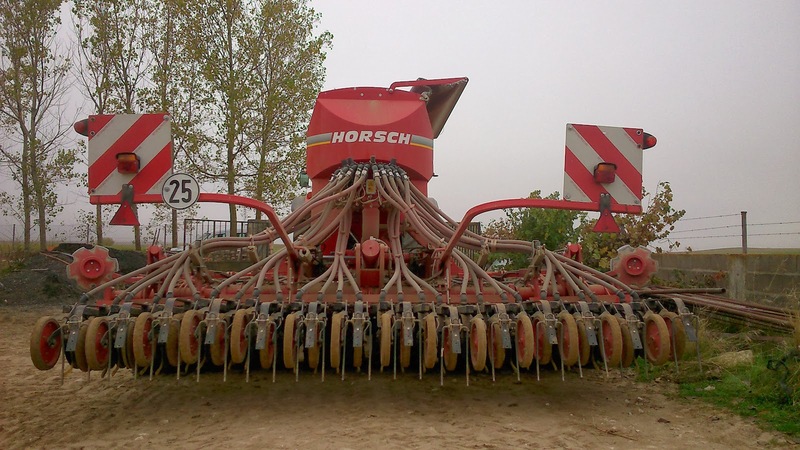 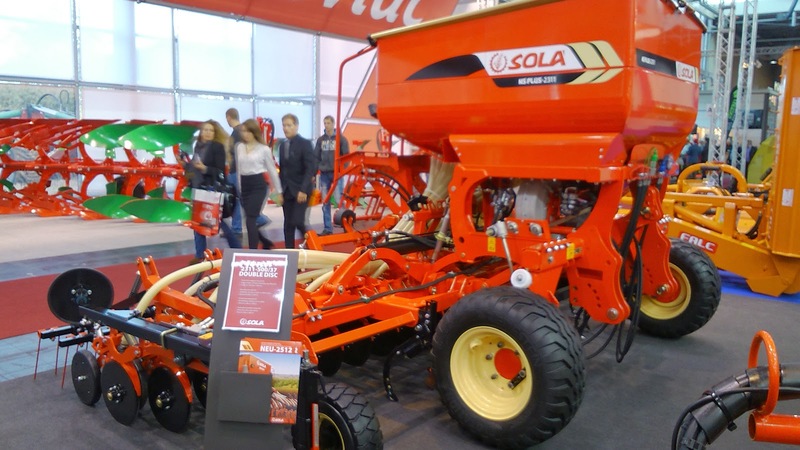 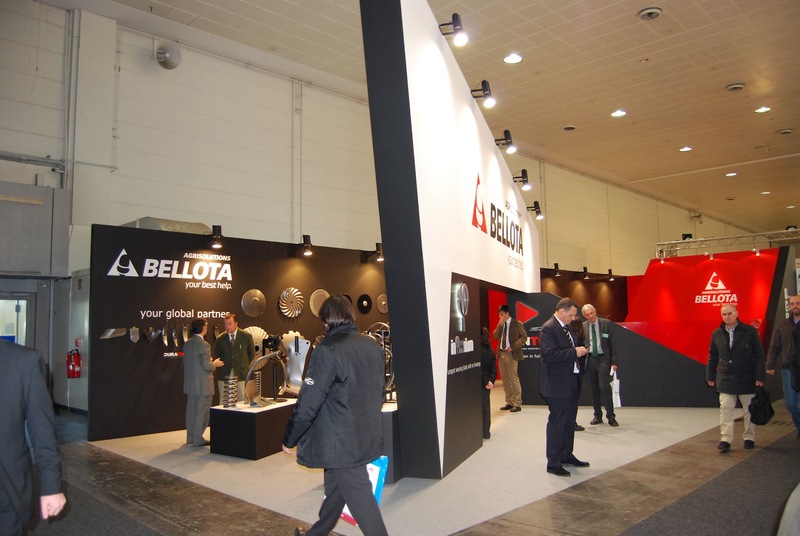 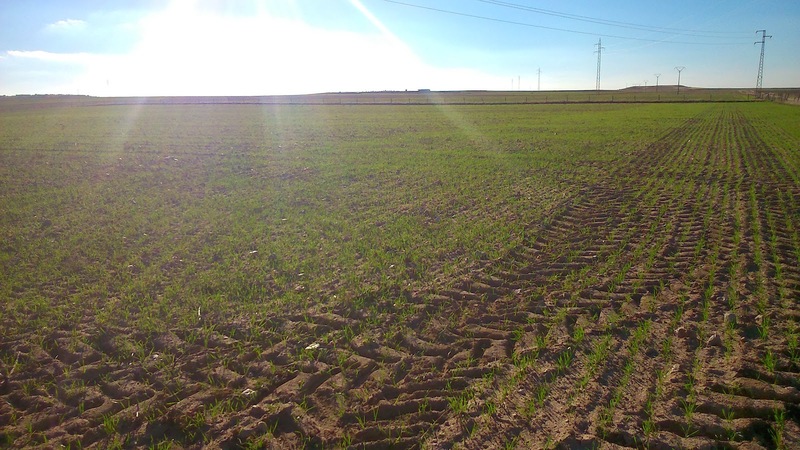 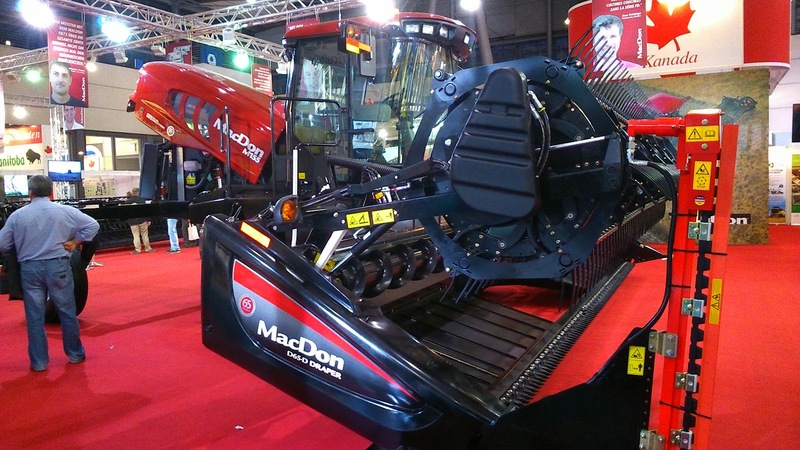 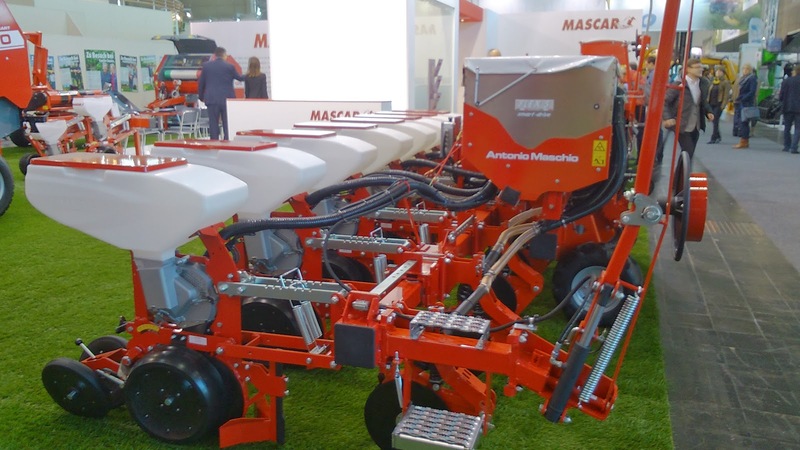 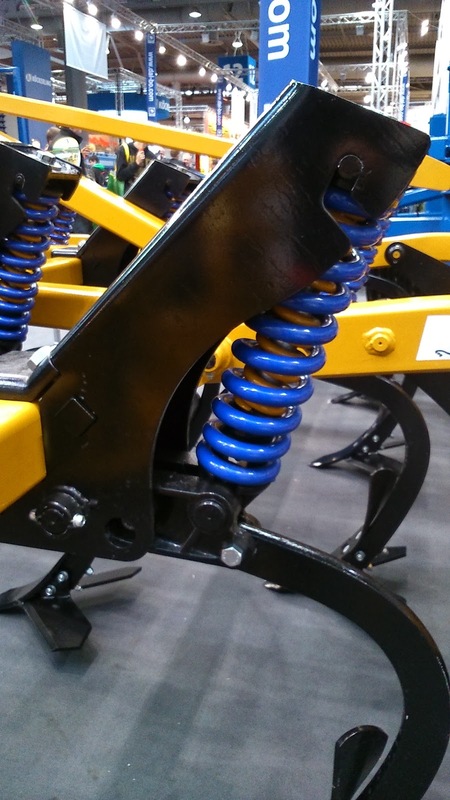 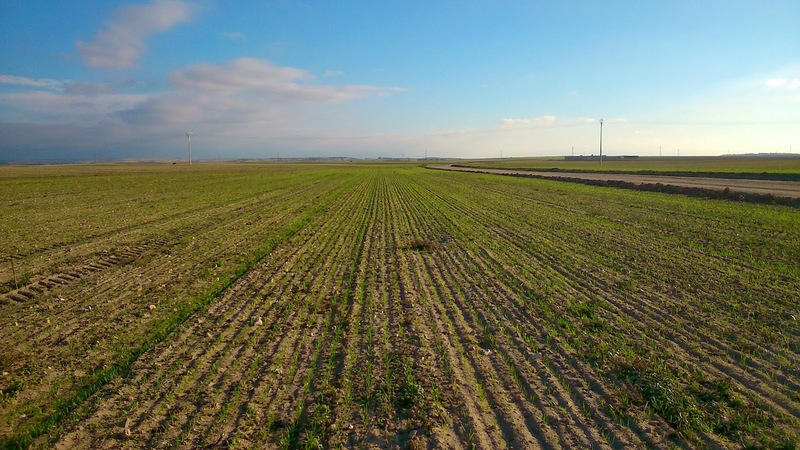 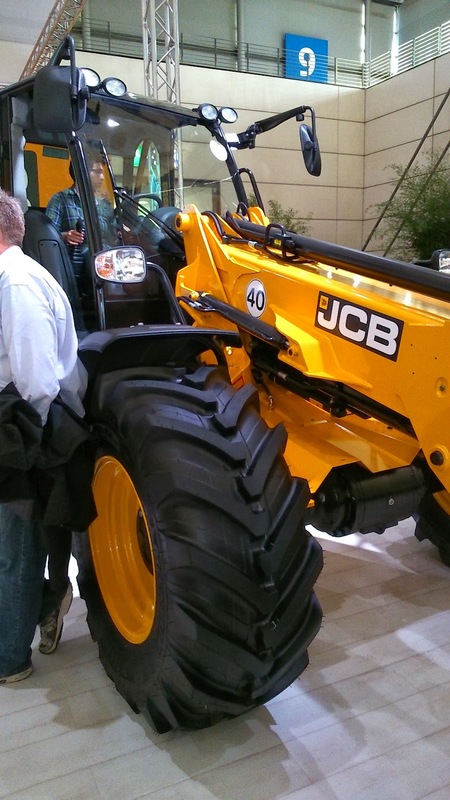 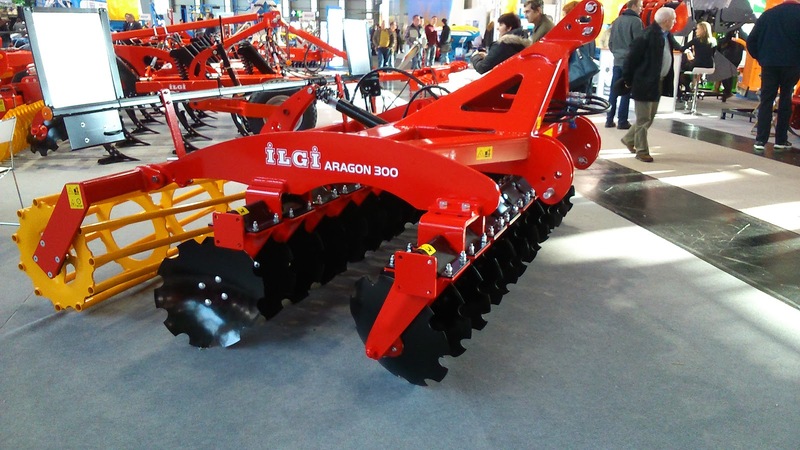 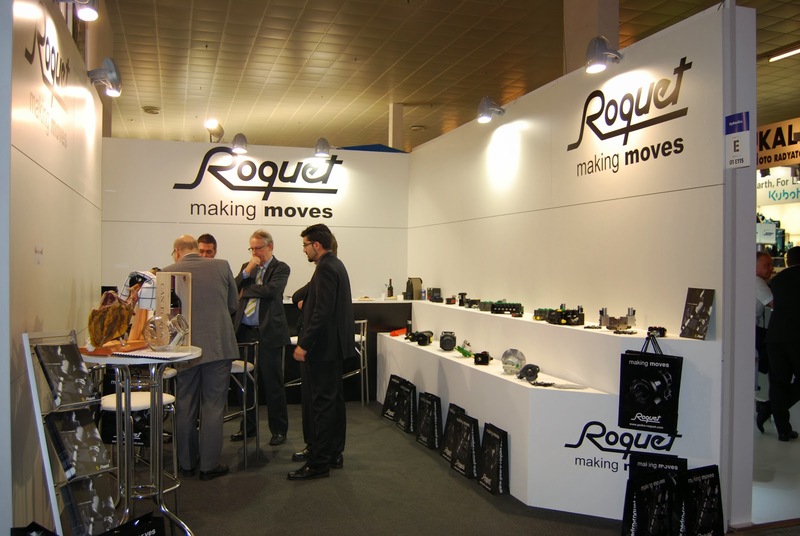 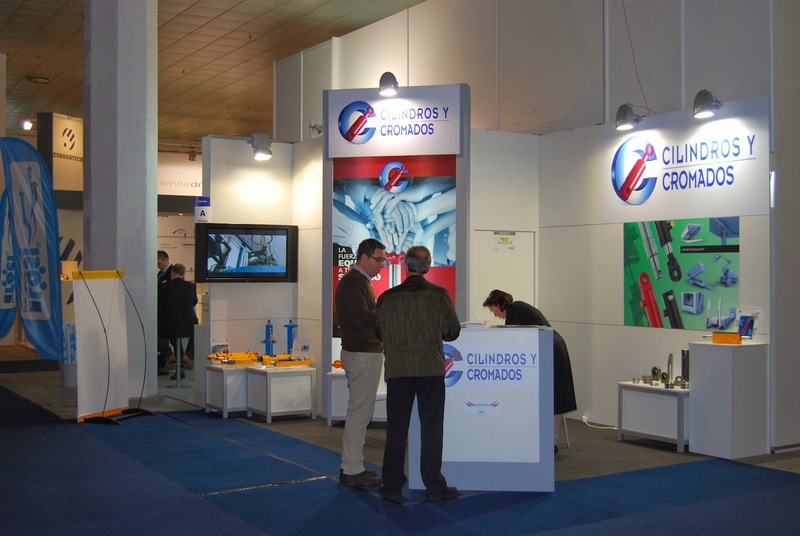 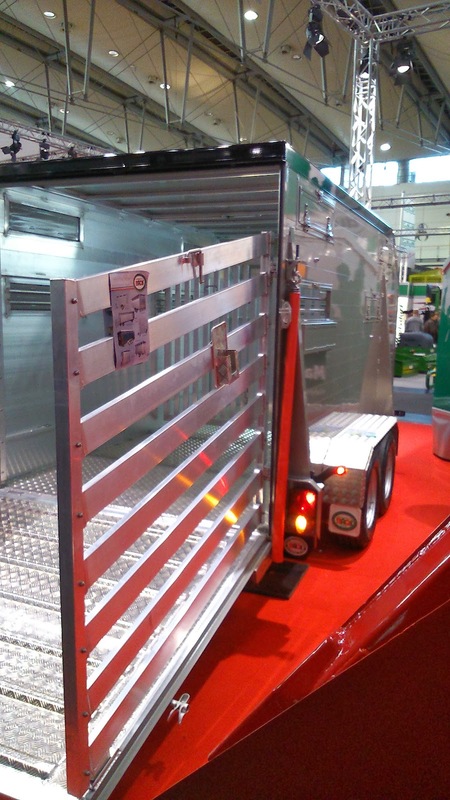 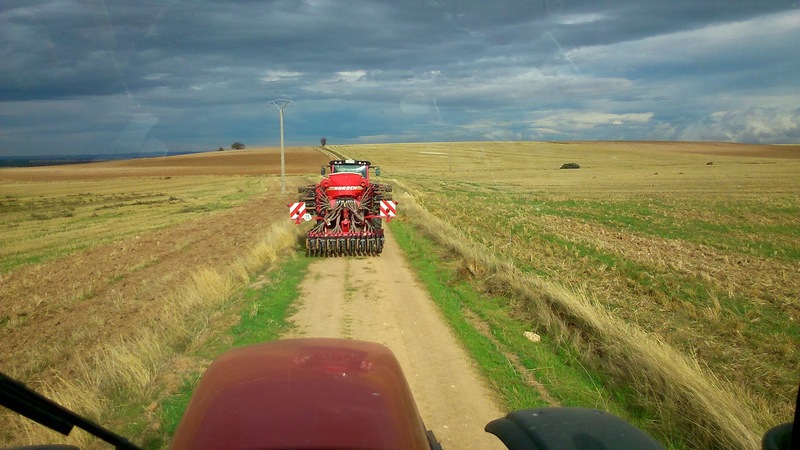 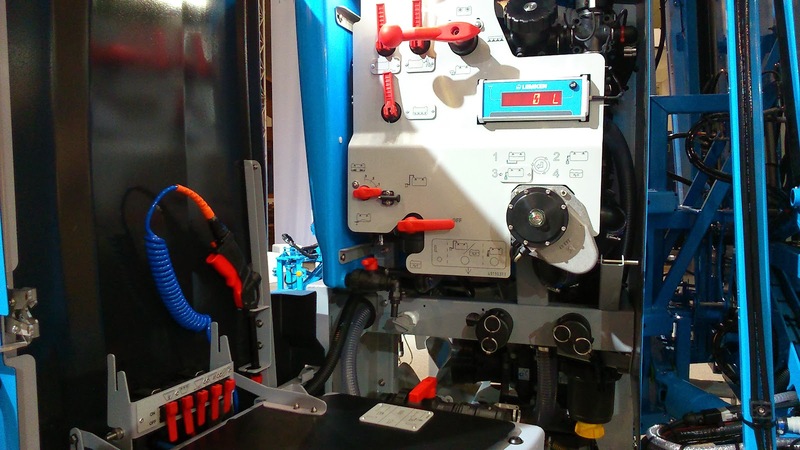 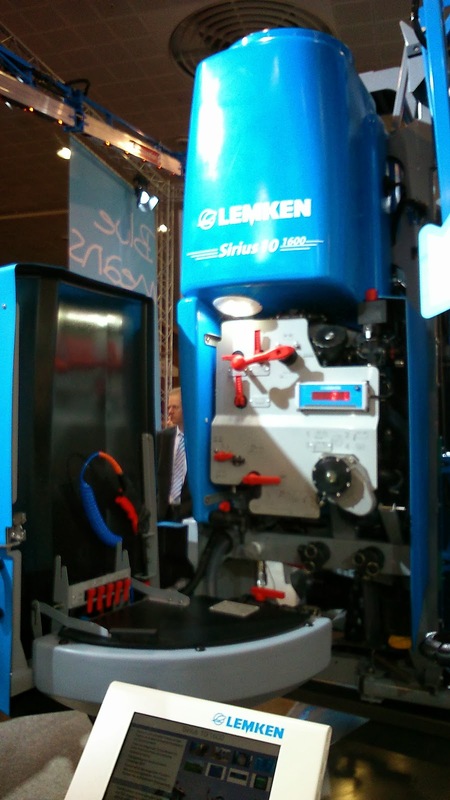 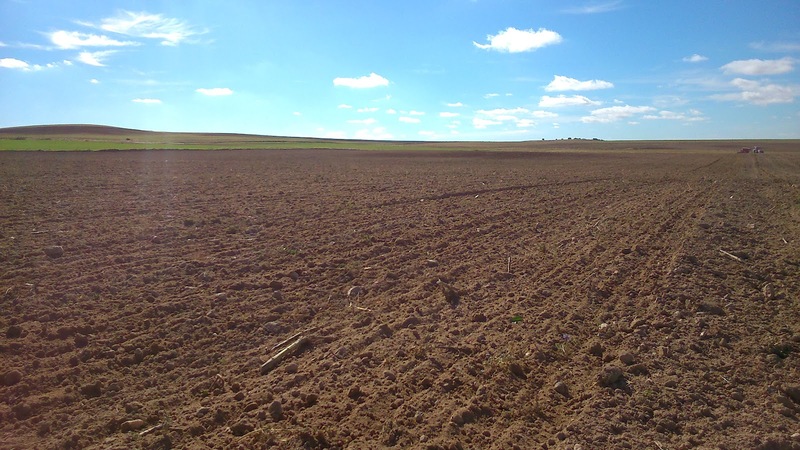 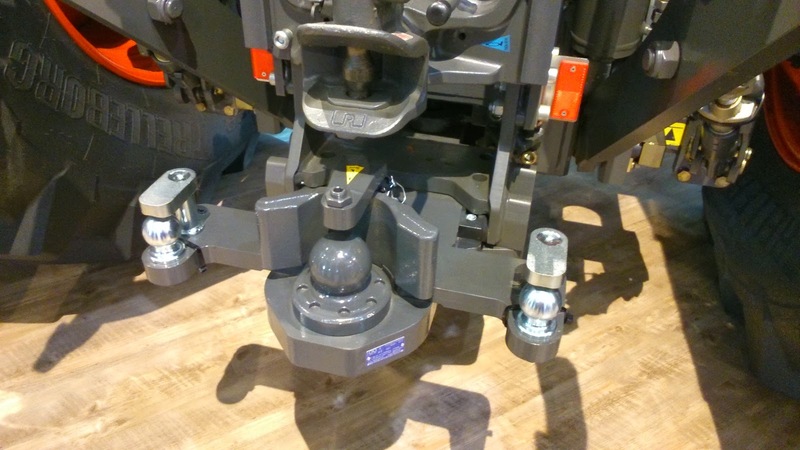 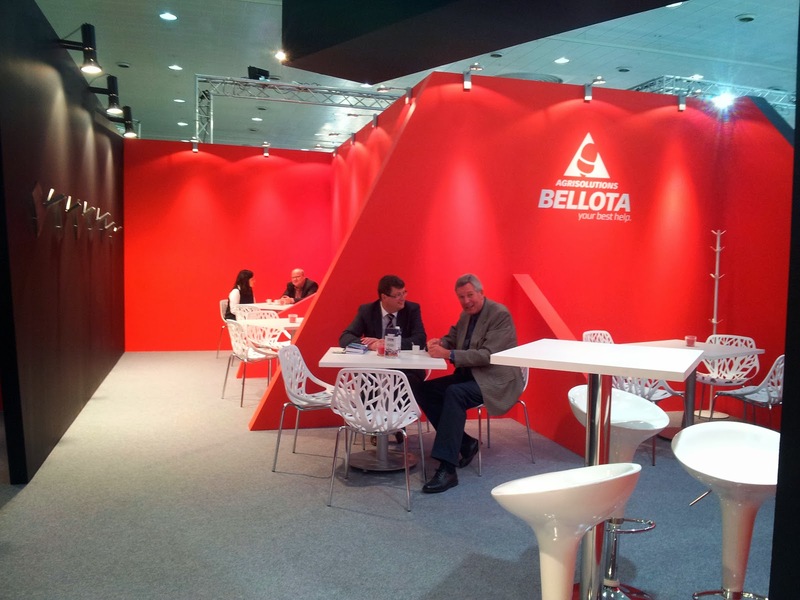 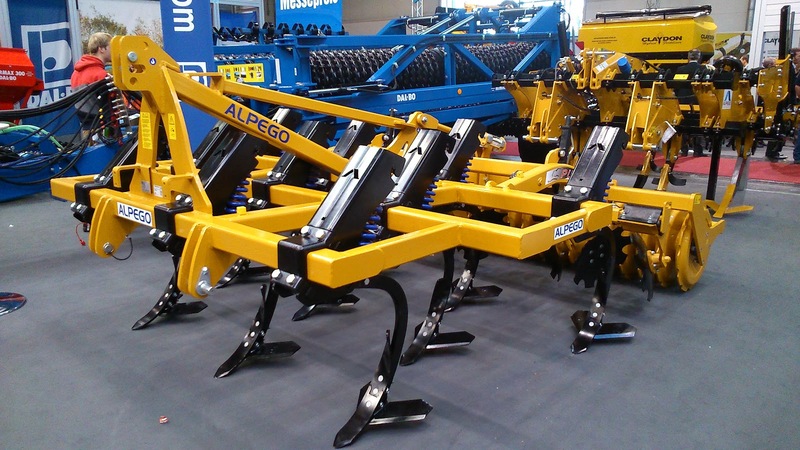 The reason is that you can find any machinery for any country, type of soil, type of agriculture,... Good news was seeing a big amount of Spanish brands: JJ Broch, Gascón Internacional, Plegamatic, Ovlac, Arcusin, Bellota, Casamayor, Tenías, Solá,... we think this fact is very important for Spain and our agriculture. 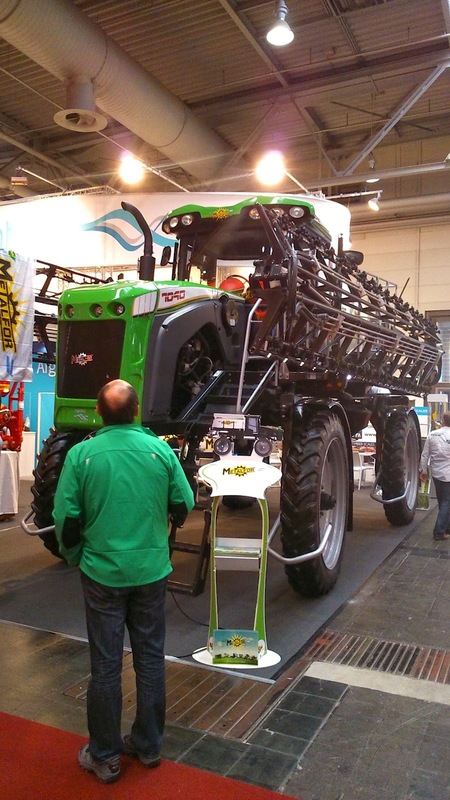 With respect to innovations, he thinks there were more than during the previous edition in 2011. 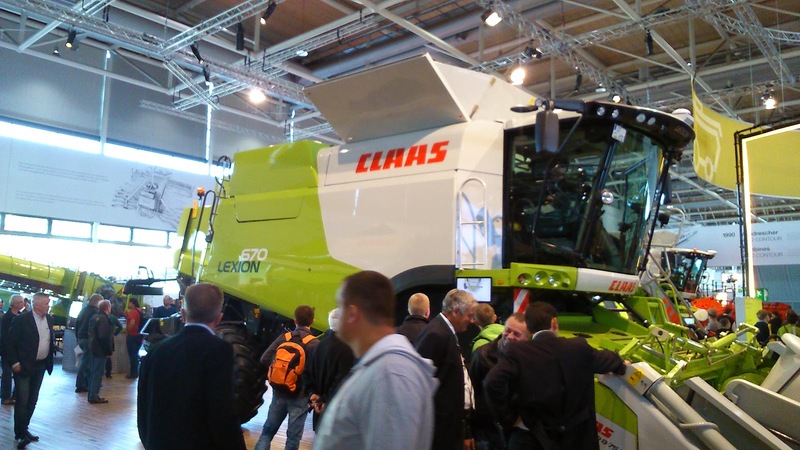 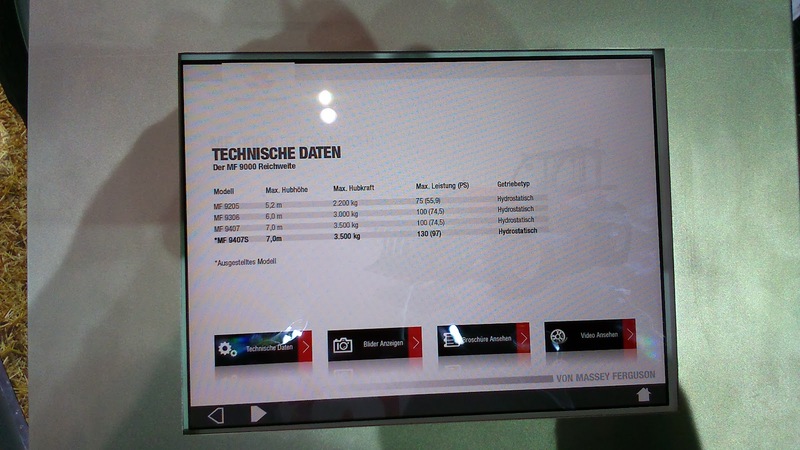 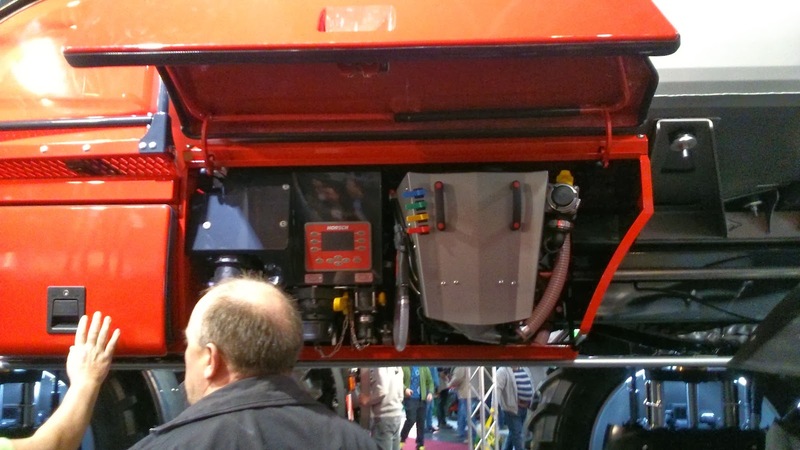 We can mention some of them: the new Deutz-Fahr 11440, the New Holland T6.140 with methane engine, Lintrac 90, wind and slope incline sensor​ (​automatic change of throw direction​)​ on the Claas Lexion combine, online-simulator for operating harvesting Claas machinery and tractors,... you can see all innovations from here.